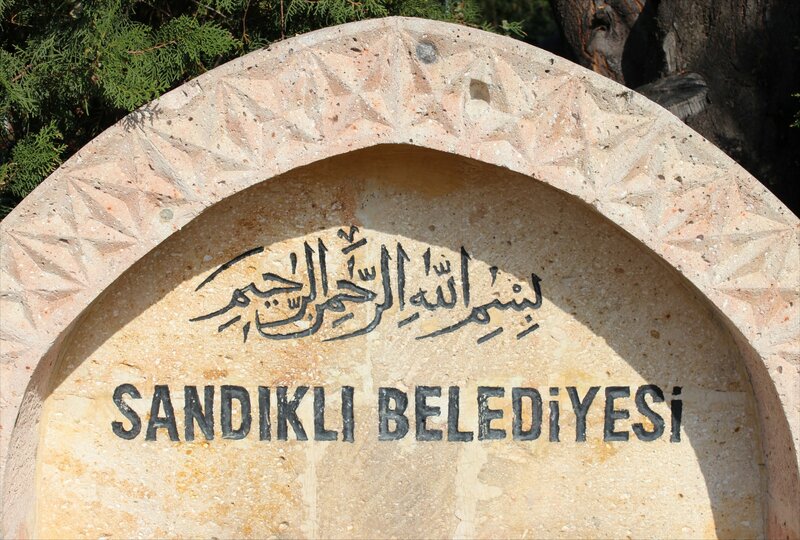 I awoke bright and early to sound of morning prayer from the mosque across the road (the loudest I’ve heard it from any hotel that I have stayed in), grabbed a quick breakfast and then headed to the airport. Security was reassuringly tight with a check on entering the terminal building and then again to go airside. I had plenty of time to reflect on the trip during a long day of sitting around in airports and on planes. There is no question that the tour has been frustrating at times but a delight when everything came together, which I hope comes across in the best pictures from the trip. In saying that, you have to remember that I am something of a glass half full chap, so I inevitably try and see the positives in everything. 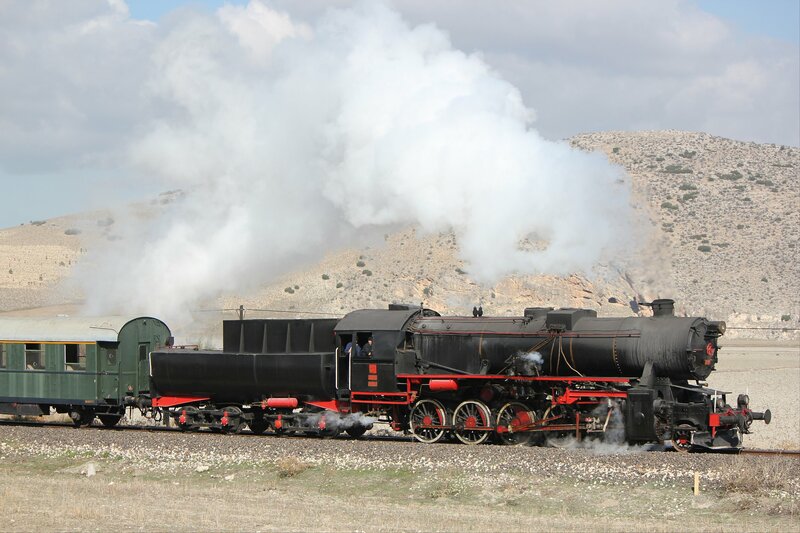 The future of steam tours in Turkey is open to question, although they have not reached a dead end yet. 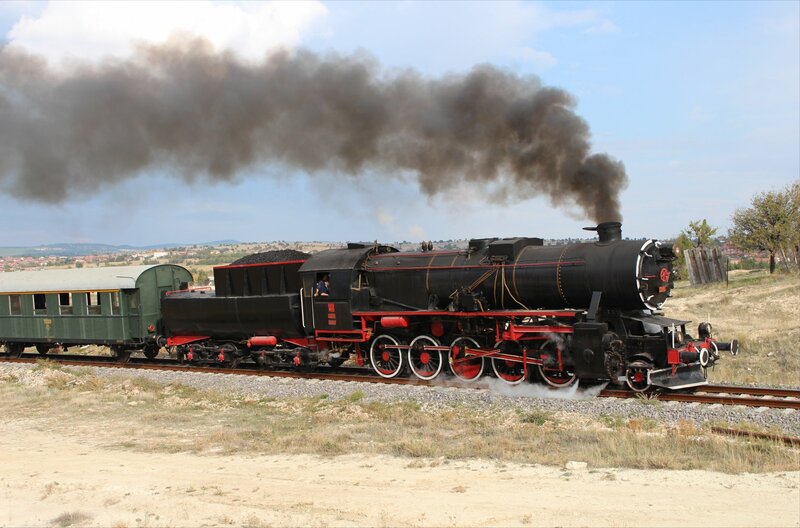 At the moment there is only one operational steam locomotive in the country and talk of restoring more locomotives has not materialised into anything more concrete so far. 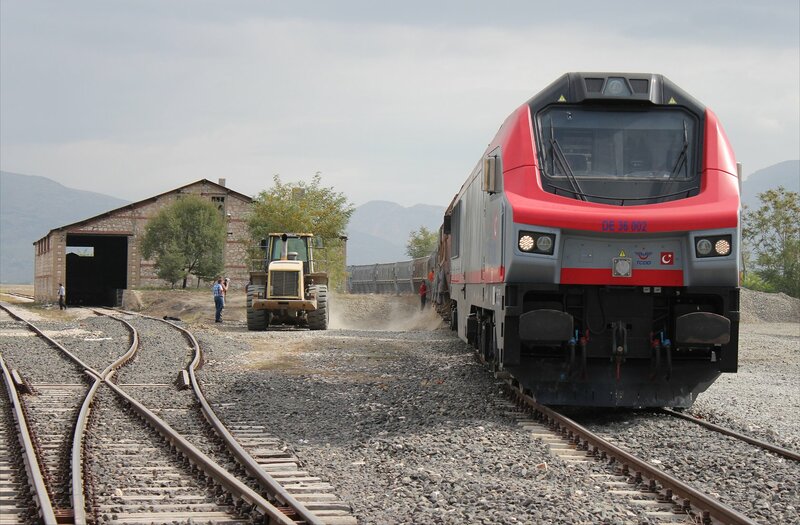 Meanwhile, Turkey’s heavy investment in the modernisation of the railways is making rapid progress and changing the network rather dramatically, whether upgrading existing lines or building new high speed lines. 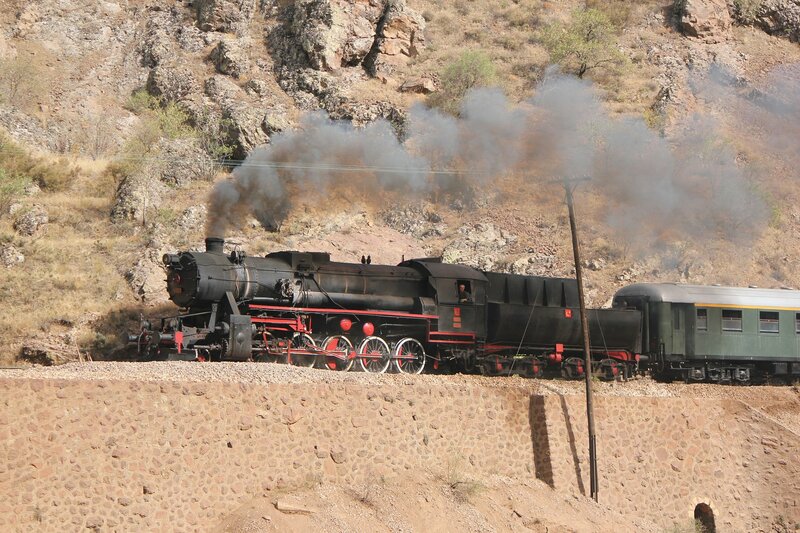 Inevitably, this revived and refreshed railway is quite unsuited to steam locomotives and not particularly photogenic. 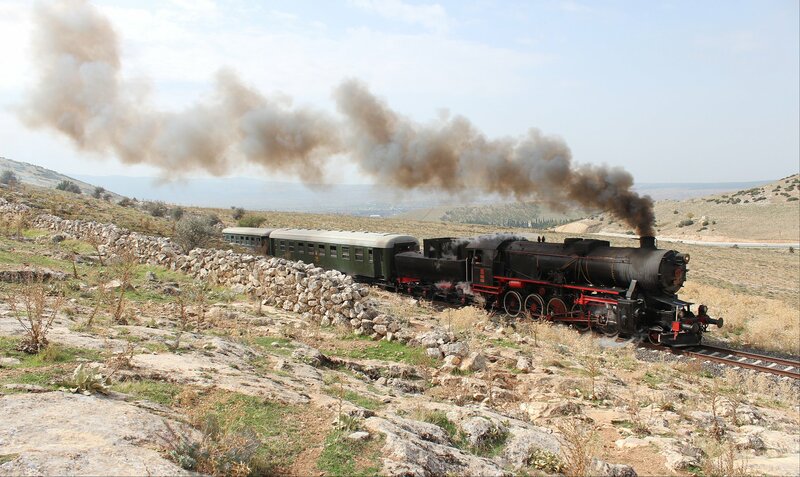 Finally, today’s steam locomotive drivers and firemen are not so very far away from retirement. 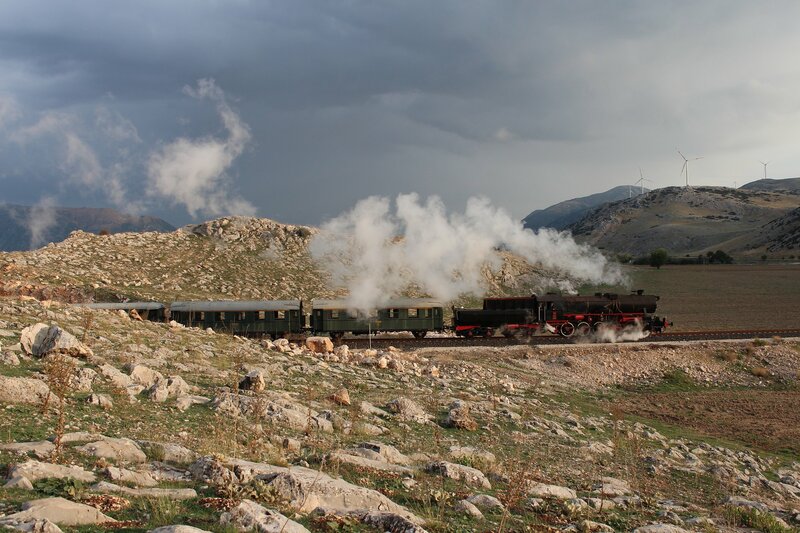 Our tour across the Taurus mountains will not be the last steam tour in Turkey but maybe that day is not so far away now? My journey home resumed in mid-afternoon as our A321 pushed back from the gate and joined a queue of rather unusual planes, including a Bundesrepublik Deutschland jet and a ‘United States of America’ liveried Boeing (not Air Force One) which were presumably connected with the NATO military conference that had been taking place in the city. After a relatively smooth flight back to London Gatwick I made it home by early evening. Time to relax after a week on the move! 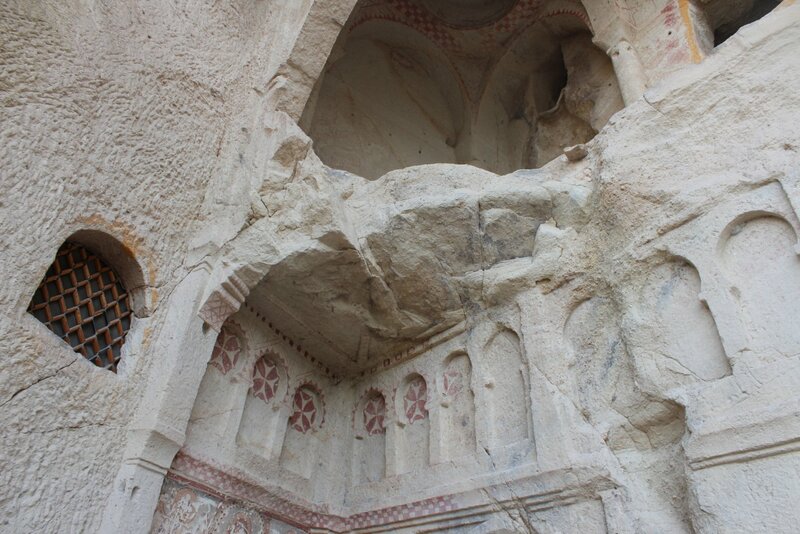 However, given our limited time it was great to be able to visit the early christian churches in the Goreme Open-Air Museum and see some of the many wonderful natural sights on offer in the area. I am sure that there is much much more to see and do, but if I never make it back then I have a little taster of a unique landscape. 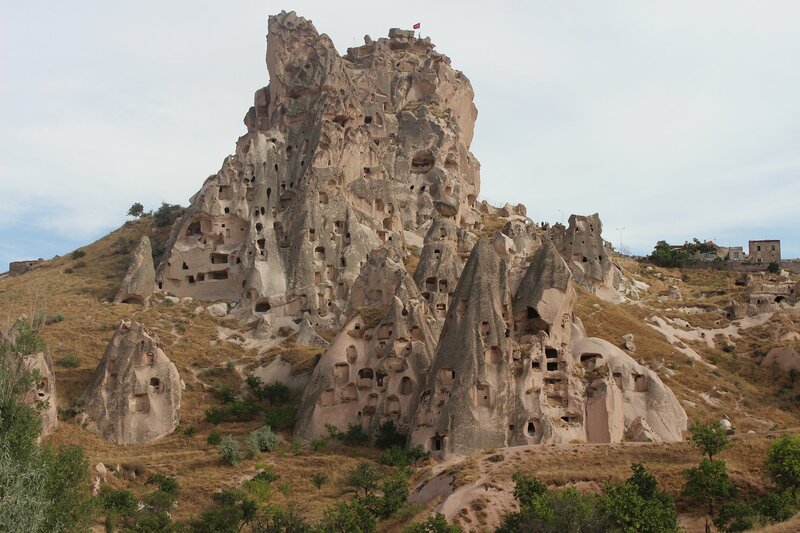 Our circuit took us from the rock citadel of Uçhisar to Göreme, Avanos and Çavuşin before bringing us back to our starting point. 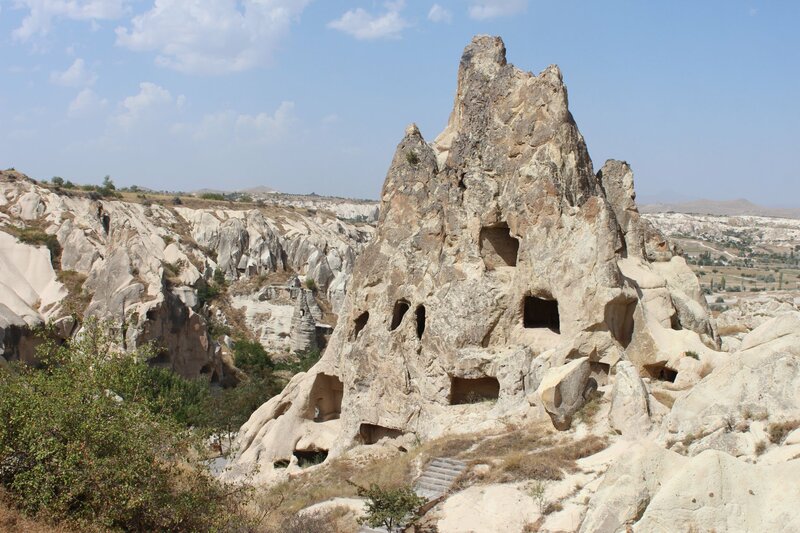 We were lucky enough to have good weather for most of the day and even the intense burst of rain that fell whilst we were wandering around the fairy chimney formations was quite refreshing. 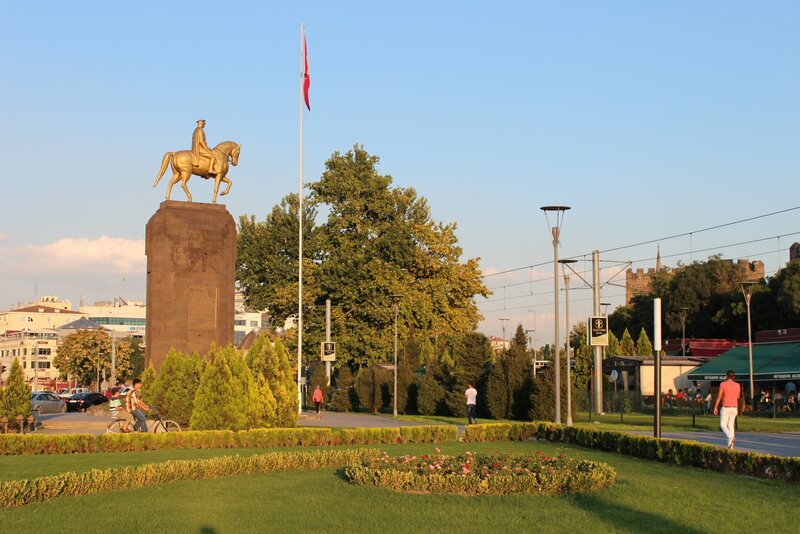 After completing our tour we continued on our journey to Kayseri, arriving in the city just after 6pm. 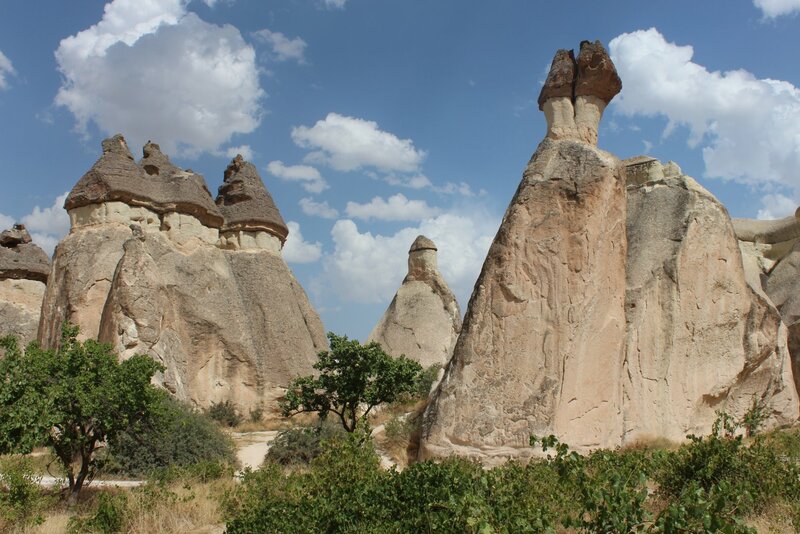 The last few hours of our tour brought us back to the impressively rocky landscape between Pozanti and Gümüş which continued to offer so many different perspectives that we were all kept very busy, with the odd spot of rock climbing to get to a more impressive shot. 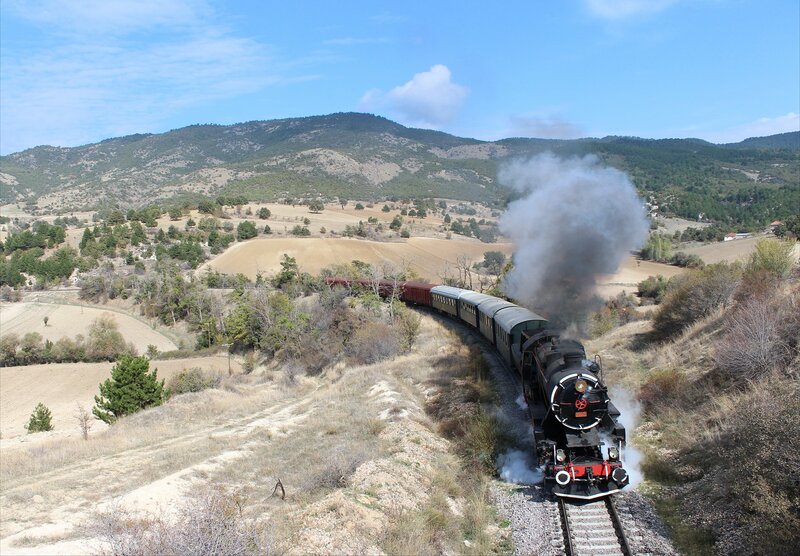 I was glad to see blue skies and sun make an appearance – a fitting end to what will most likely be the last steam hauled train in the Taurus mountains after around 100 years of steam action here. 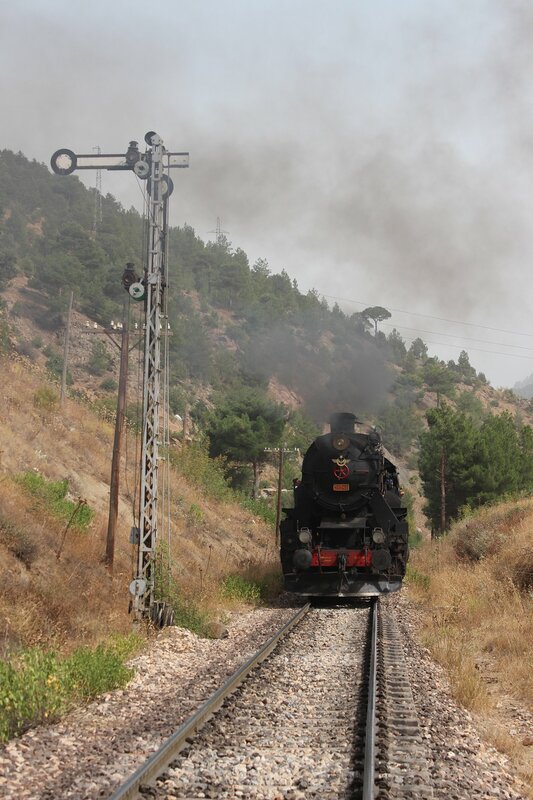 TCDD 56 548: Last steam locomotive in the Taurus mountains? 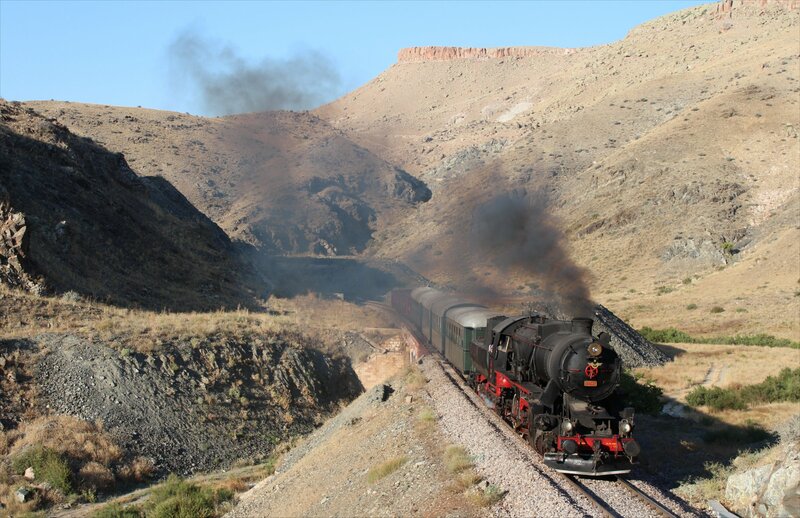 The crew of twelve railwaymen on our tour have to be applauded for all the hard work they have put in, with some pretty tough working conditions – even on a cold day the footplate can be a fearsomely hot place of work, but in temperatures of 40+ degrees it must be hellish. 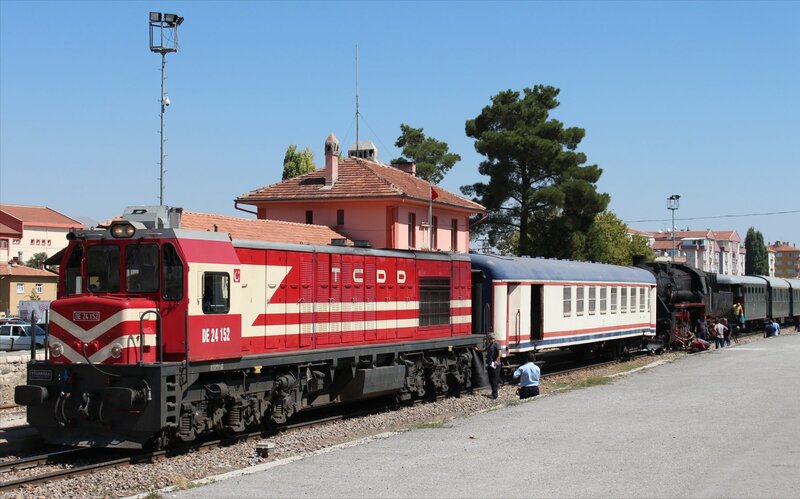 The crew have come from across the Turkish network and this is a real change from their day jobs (for example driving diesel multiple units on commuter services) and they enjoy this tremendously. 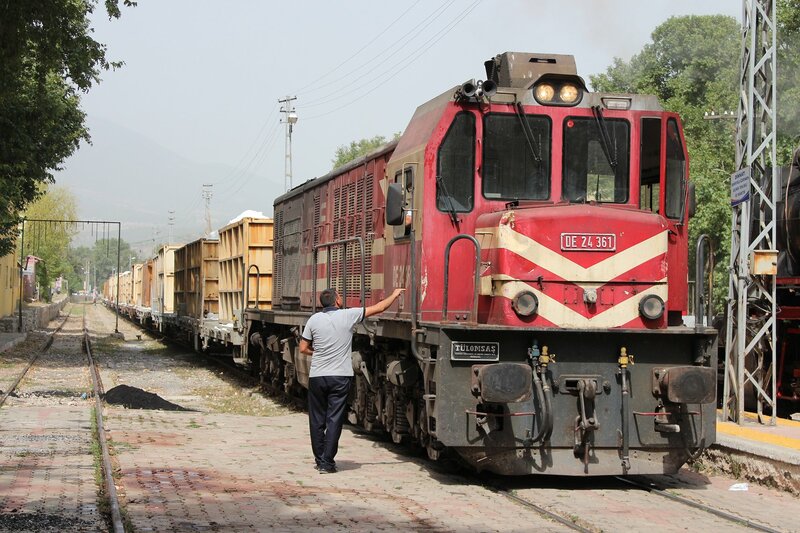 After we leave the crew have the job of getting the train back to Izmir and this will take three days, including one overnight shift (the stretch of track between Konya and Karaman is closed in the daytime for engineering works, but opens at 11pm each night to let freight services through). 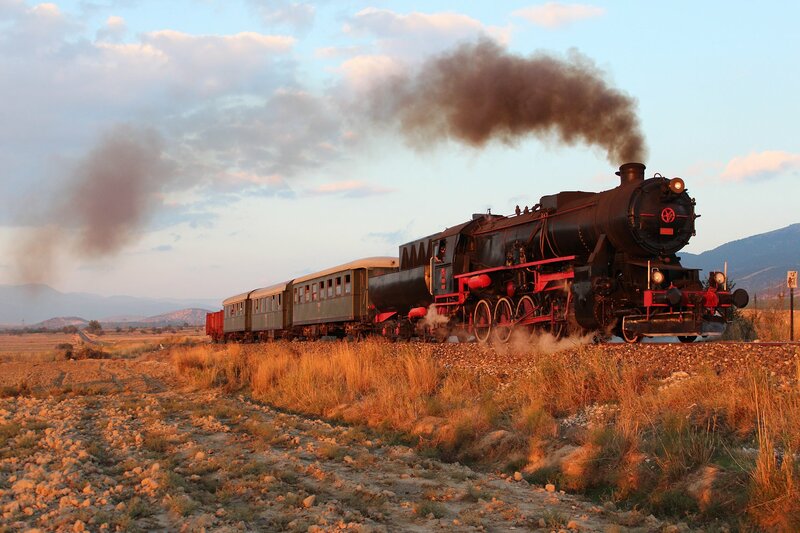 It certainly puts our more relaxed journeys home into perspective! 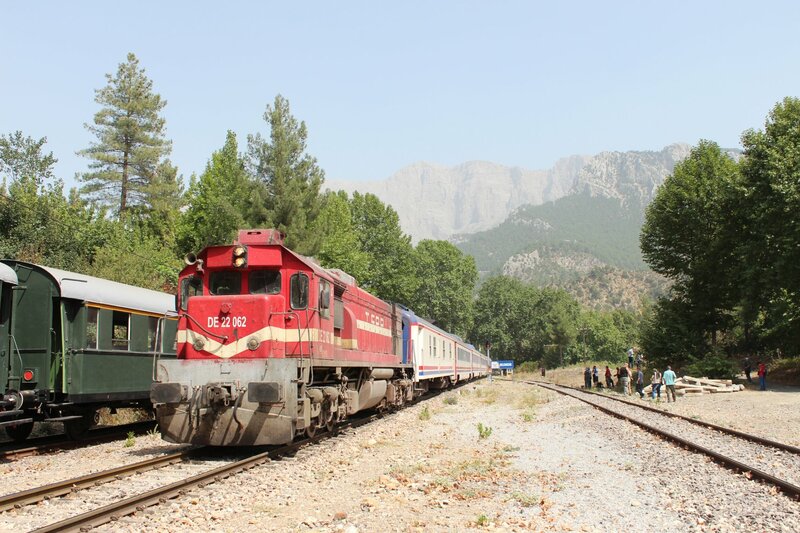 Most of the participants on the tour were catching trains from Çiftehan and heading home via Adana and Kayseri respectively. 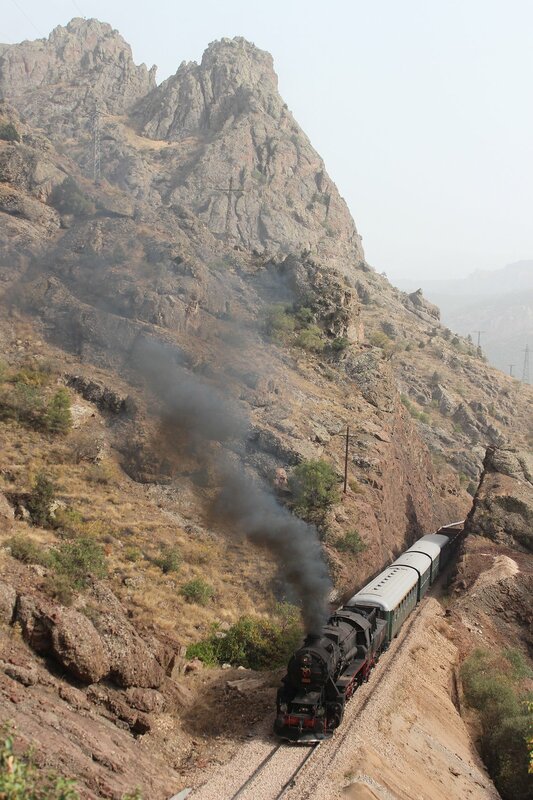 A few guys were sticking around to photograph diesels on the line (quite rightly pointing out that it was the last chance to photograph diesels in the mountains before electrification spoils the beauty of the line). 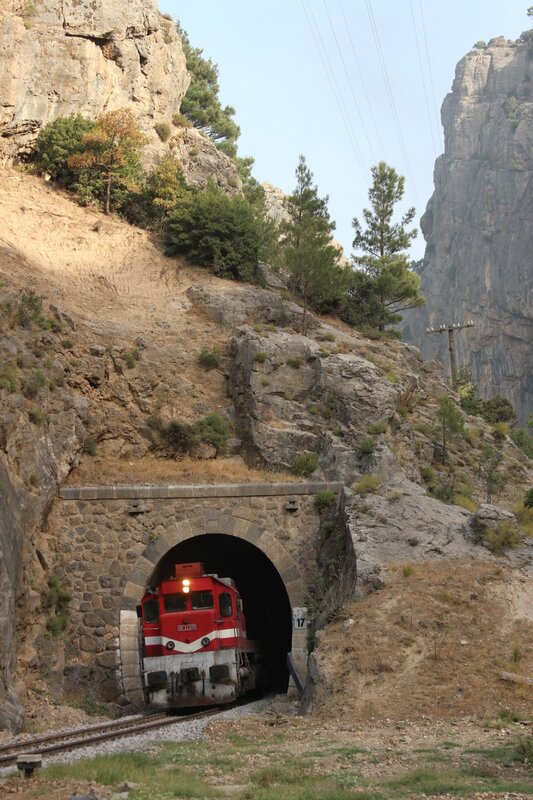 They were sure that no photographers had ever taken shots of diesels between some of these tunnels and were determined to capture this before electrification. It sounded like a brave endeavour and I hope they succeed. 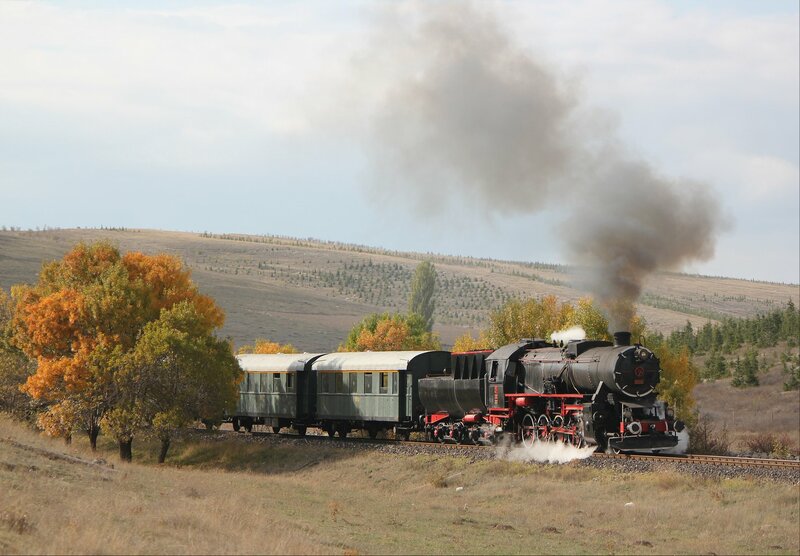 One of the locals, whose house sits at the lineside (with a front gate onto the track), picked some apples from the tree in his garden and handed them up to the passengers in our train through the open windows. A lovely gesture and a measure of the friendly welcome we have received everywhere. 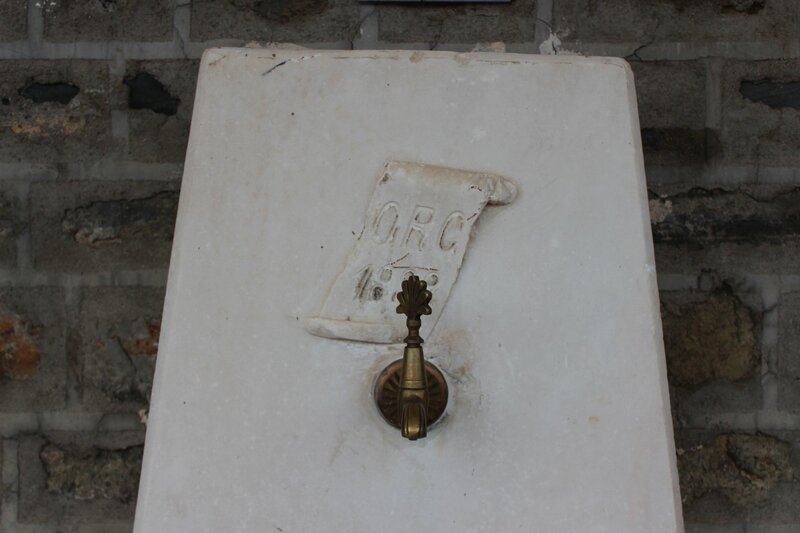 It was much appreciated by us all, particularly in the extreme heat (it is by far the hottest day of the trip so far). 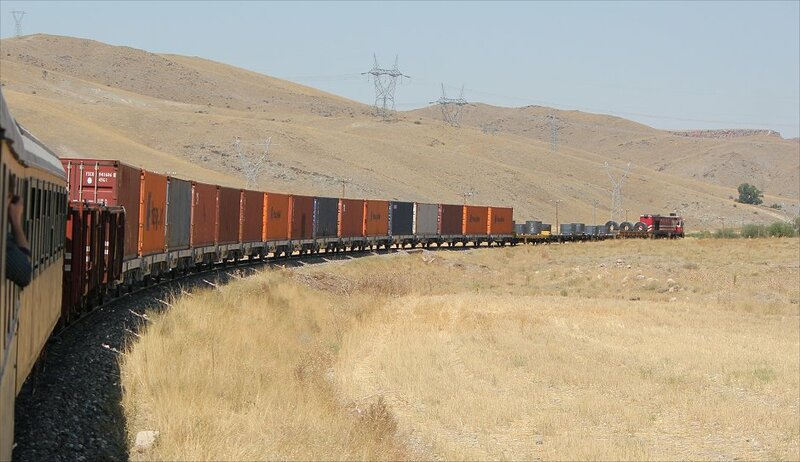 Alot of traffic had clearly been backed up by the closure of the line and we sat on our train watching freight after freight pass in both directions. One of my fellow Brits on the tour joked, “I think we’ve got all the DE24s now…”. It certainly felt that way! 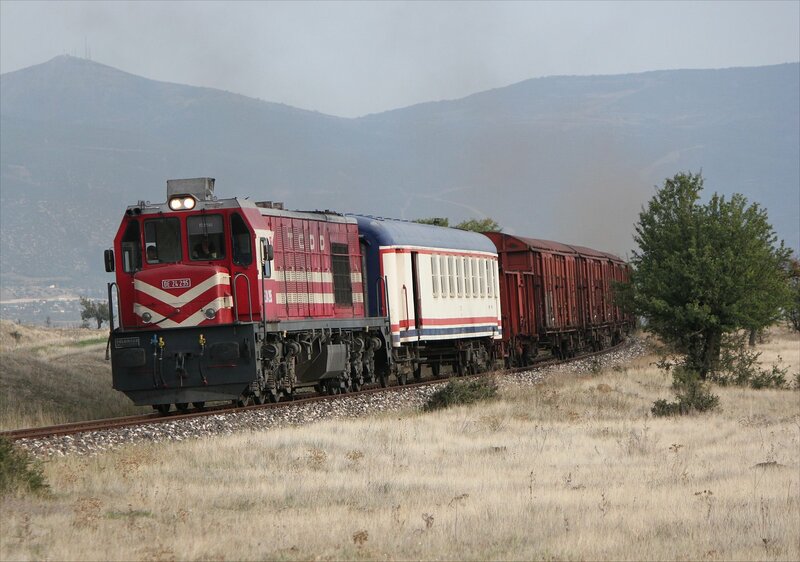 After a seemingly endless series of freights we set off at 11.53am, once the Kayseri-Adana express (Erciyes Ekspresi) had cleared the line, passing the scene of the fire on our way back to Pozanti. 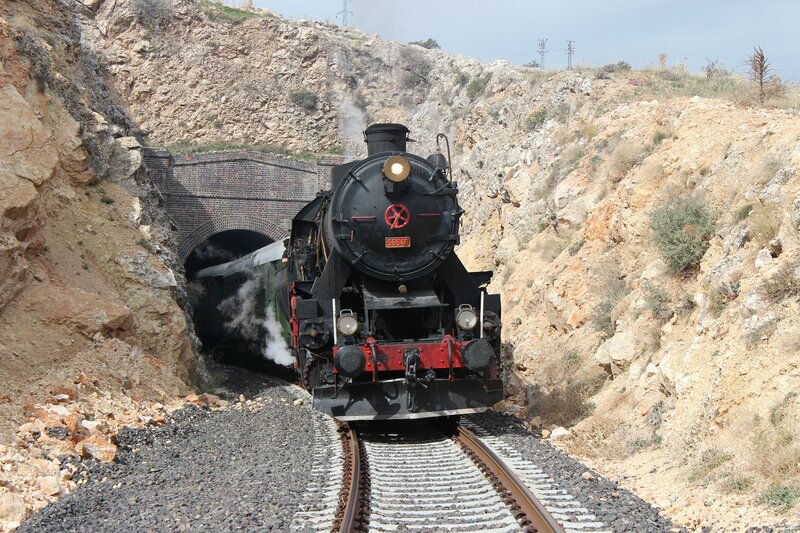 The fire was located between two tunnels which must have made it a little bit tricky. 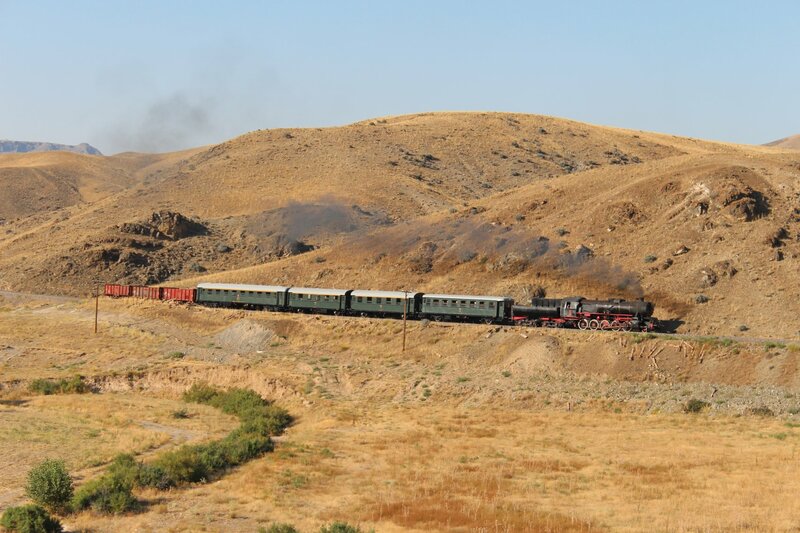 The fire brigade were still in attendance, waving cheerfully to us as we passed, despite the trouble we had caused them. 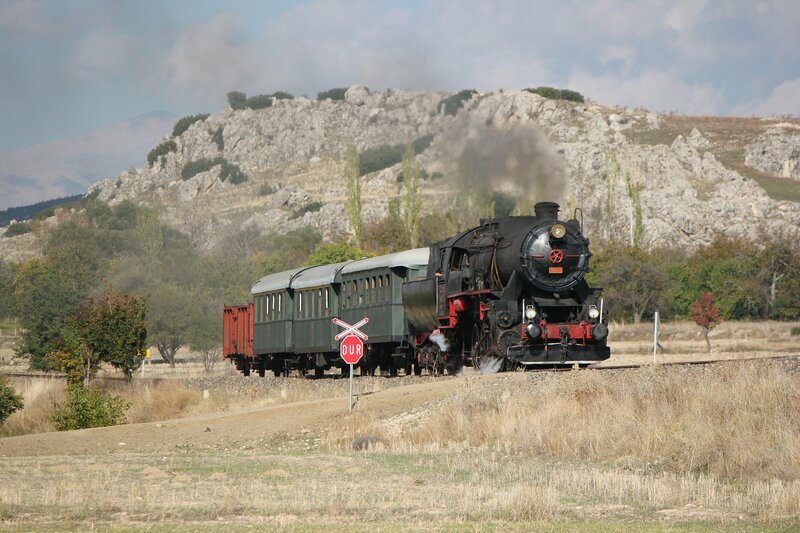 We arrived back at Pozanti at 12.15pm. 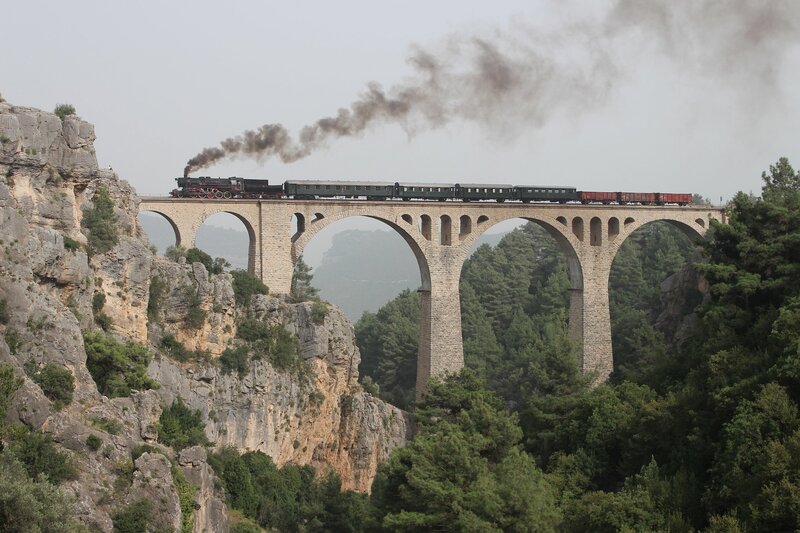 Having said that we never wanted to see the Varda Viaduct again after our eight runpasts the other day, we discovered that was precisely where we were headed this morning. I must remember never to say never again (like carelessly remarking how quiet it is at work, which can be guaranteed to herald an avalanche of requests!). 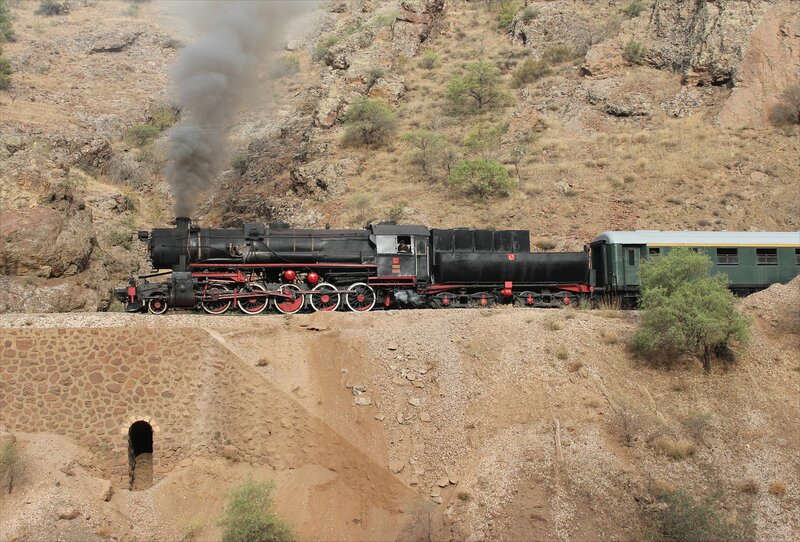 Our train headed out of Pozanti at 7.34am and soon took us back into the sequence of impressive tunnels on the way to Hacikiri (tunnel numbers 16-19 lie between Pozanti and Belemedik, followed by numbers 20-31 from Belemedik to Hacikiri). 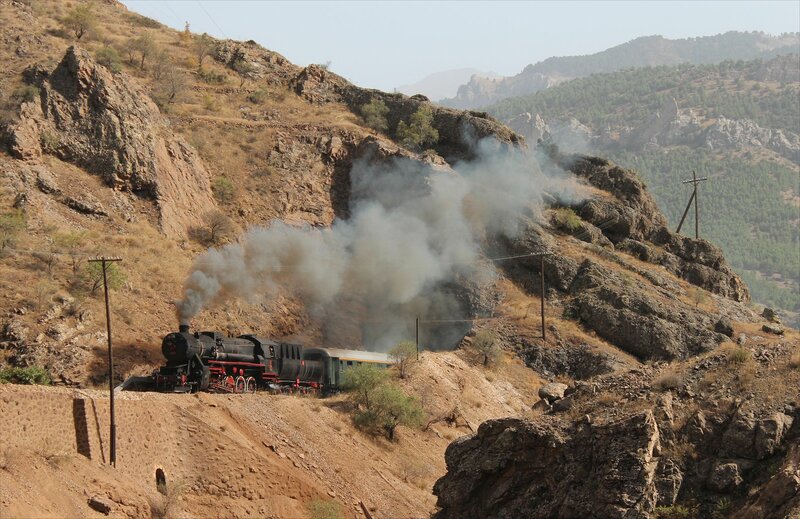 Along the way we were able to squeeze in a couple of runpasts, one on the approach to tunnel 18 and another on a curve in the track not too far from Belemedik. The skies have once again been very murky, presumably still a combination of heat haze and sand in the air. It was also ridiculously hot (in the 40s once again) so most of us took shelter where we could, drank litres of water and settled in for the wait. 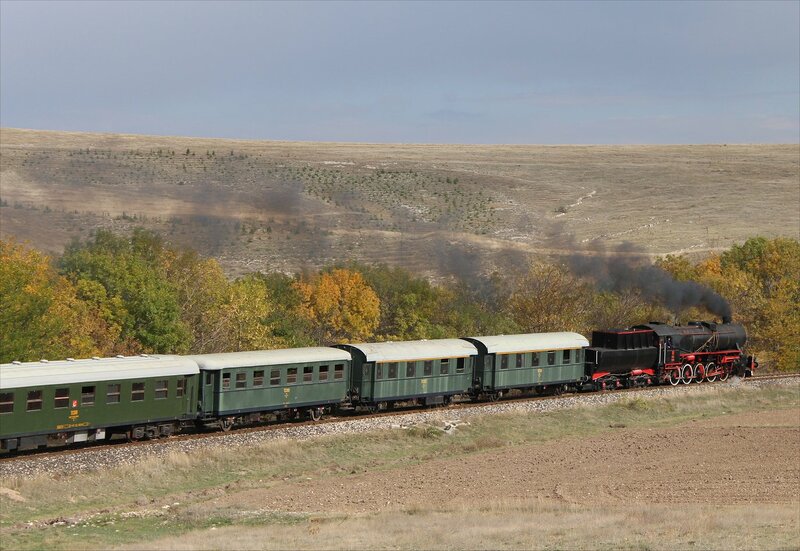 I was thankful to have a good novel with me and made myself comfortable in the quiet carriage, followed by lunch in a local restaurant and a long siesta! At 4pm the action resumed with another eight runpasts at the viaduct (an absurd total of sixteen from this side over our two days at this spot, plus two from the other side in the morning). 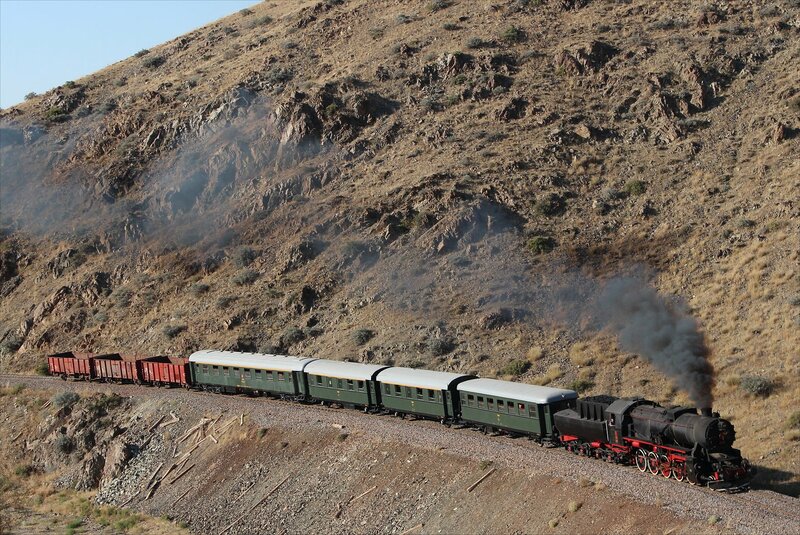 By the end I didn’t know whether to laugh or cry as I saw the wagons rolling back for another attempt! To be fair, it was always an impressive sight and the extra attempts did at least mean that I was able to savour it without photographing it on one run. 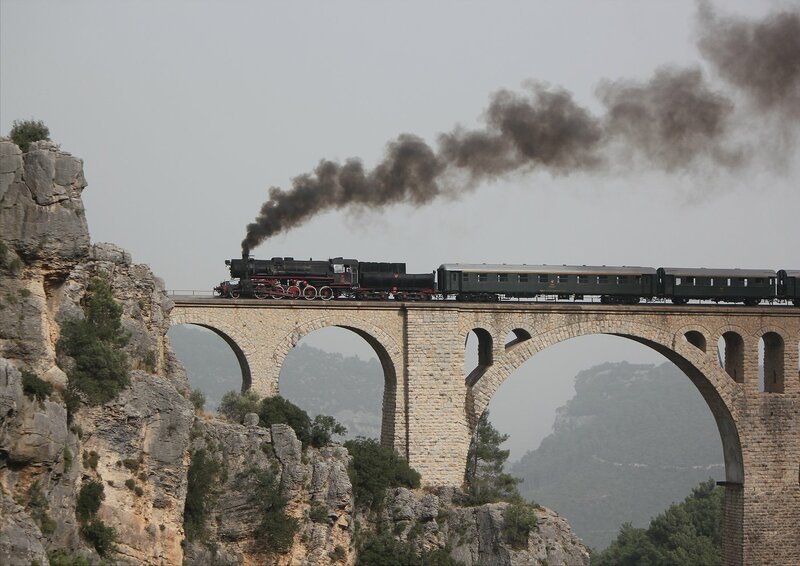 You would have to think that is the last time that a steam hauled charter will cross the Varda Viaduct as the line will hold much less appeal once it is modernised. 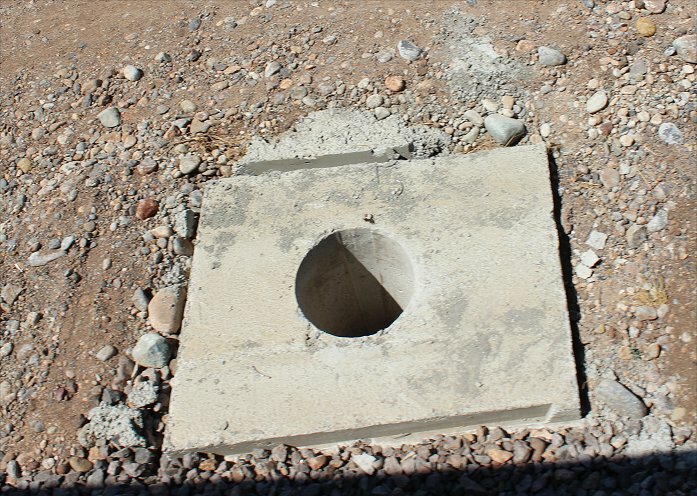 We certainly saw plenty of evident of the preparations for electrification (post holes in place, but no poles in sight yet). If it that really was the last such run, it was at least comprehensively captured by the army of photographers present! 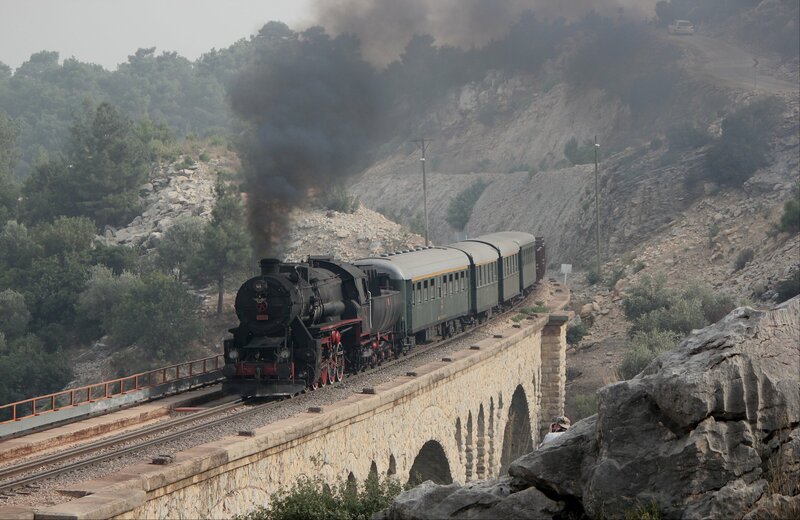 Nevertheless, I think everyone was pretty happy to leave the viaduct behind on our departure from Hacikiri at 5.15pm. 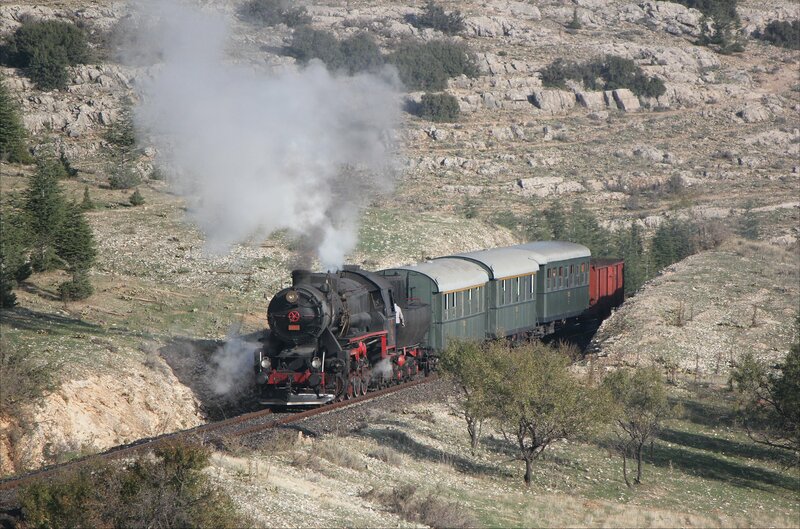 Thankfully, we had a good run through to Pozanti, arriving at 6.25pm, and were back in the hotel not too long afterwards. 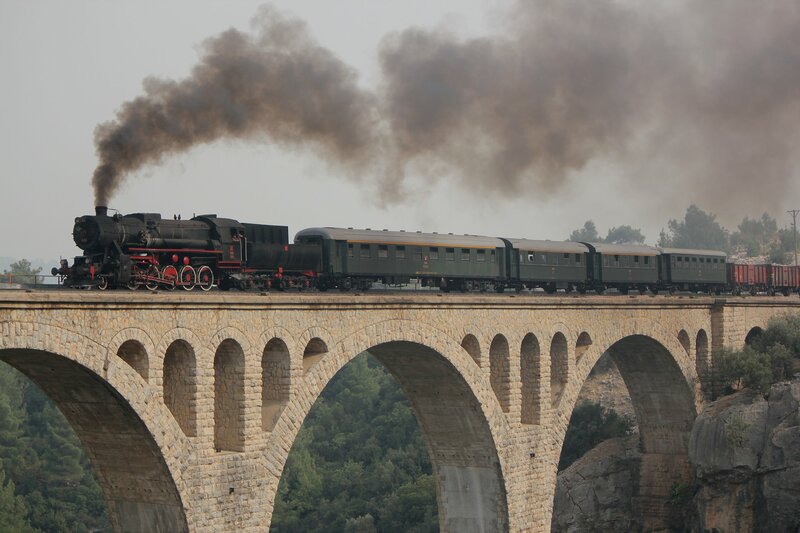 You could say that 18 runpasts at Varda Viaduct was excessive, but at least no-one was left with any desire to go back. 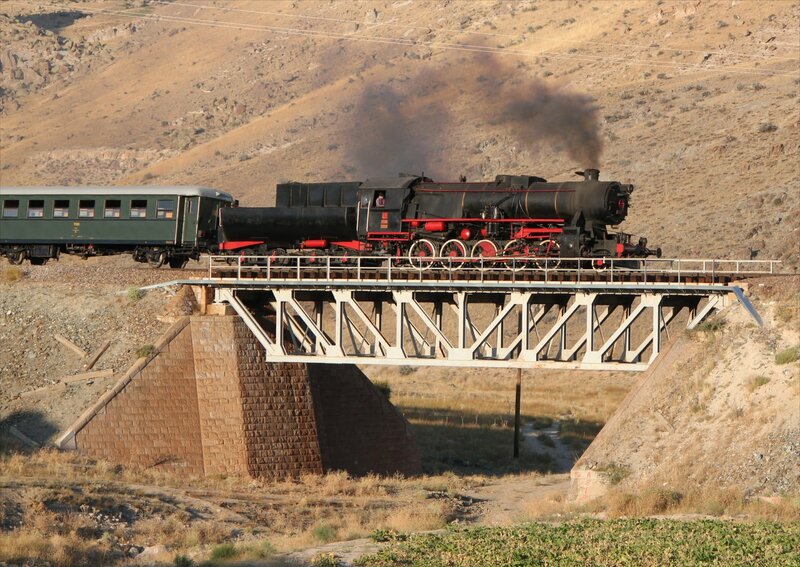 I think I will be dreaming of trains crossing the viaduct tonight instead of sheep jumping fences! 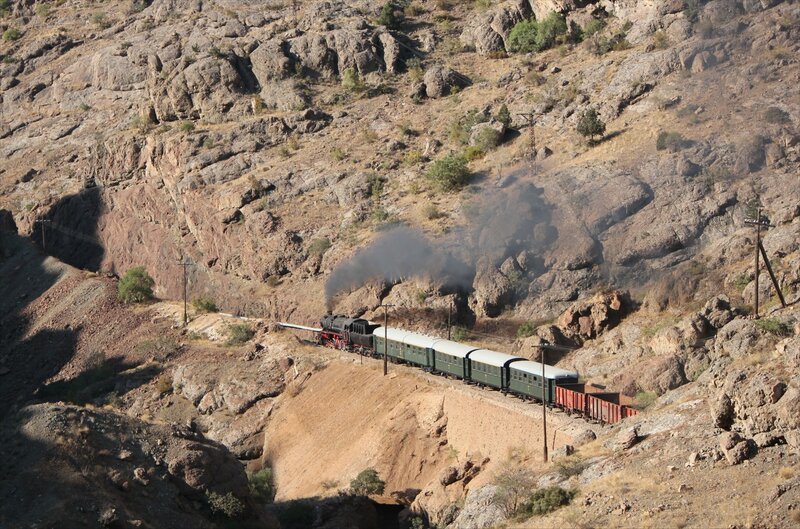 In the afternoon we returned to Pozanti for our expedition north, departing around 2pm with all the locals waving, honking their horns and taking photos. All very atmospheric and enough to warm the hearts of any photographers still grumbling about the action-free morning! 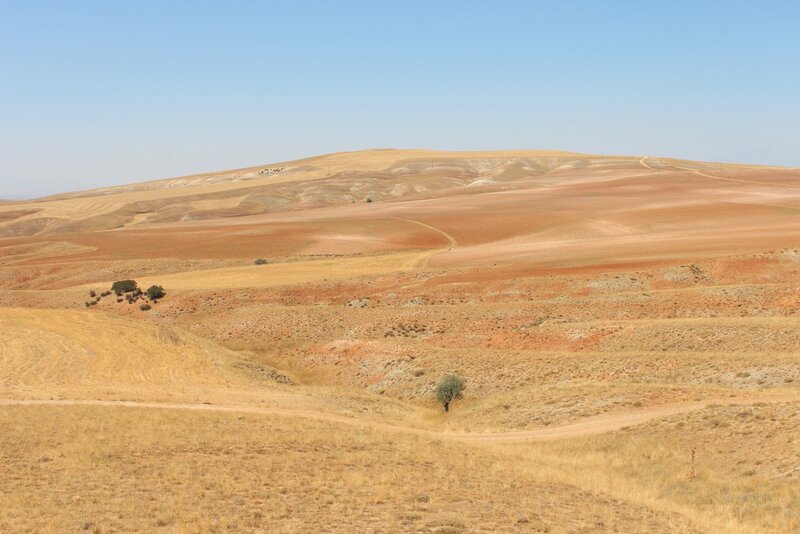 The weather was good in one sense, with plenty of sun and a temperature in the high thirties, but the sky was unclear (apparently the result of a distant sand storm in the middle east). Not the greatest conditions for photography, but most of us were just relieved to have something to photograph at all! 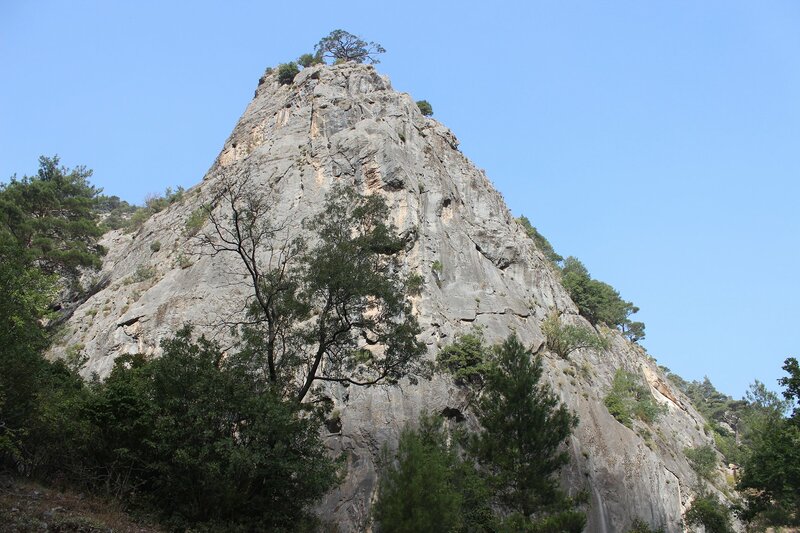 We spent the next few hours taking shots at a couple of locations – a traditional signal near Çiftehan and the gorge that we visited on our first day in the Taurus mountains. Confusion reigned over the number of runpasts (perhaps as many as eight) which resulted in the bus filling and emptying at dizzying speed (photographers clambering out in a hurry as they realised another runpast was in progress). It was finally all over just after 5pm. 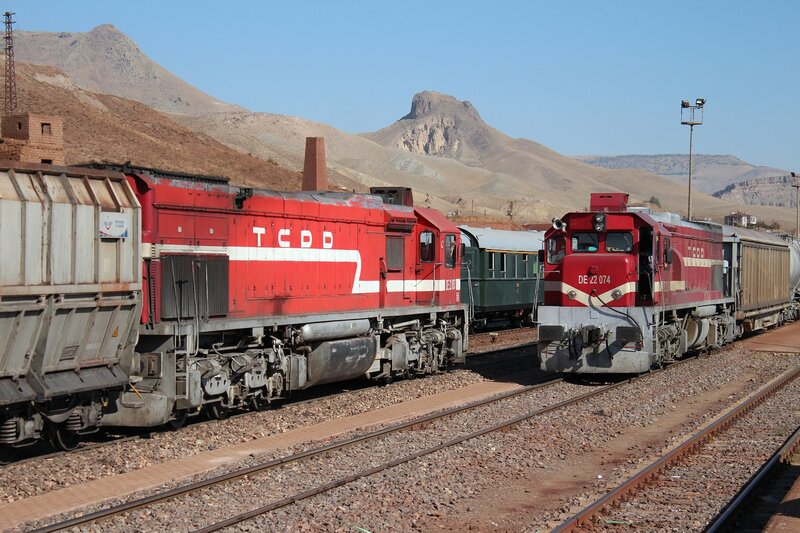 After seeing two more freight trains pass through before 8am we wondered if something had gotten lost in the translation, thinking that perhaps the line would close after the morning passenger service. 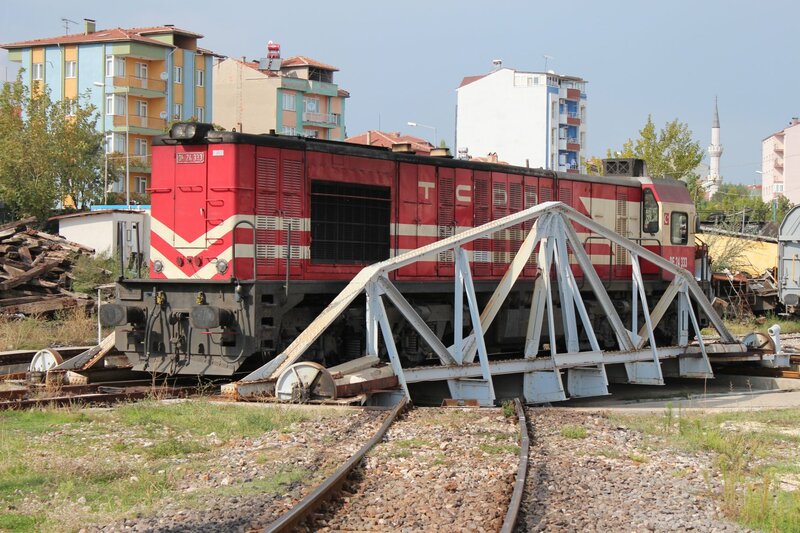 But no, there were still more freight trains after this. It is probably the busiest we have seen it! 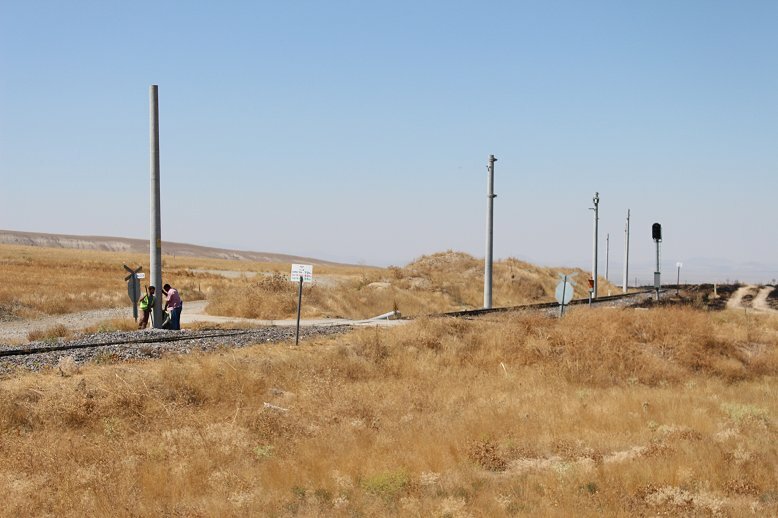 No doubt some electrification work was taking place, particularly as we had seen workers with machinery on the track between Çiftehan and Pozanti, but this line was clearly far from closed. 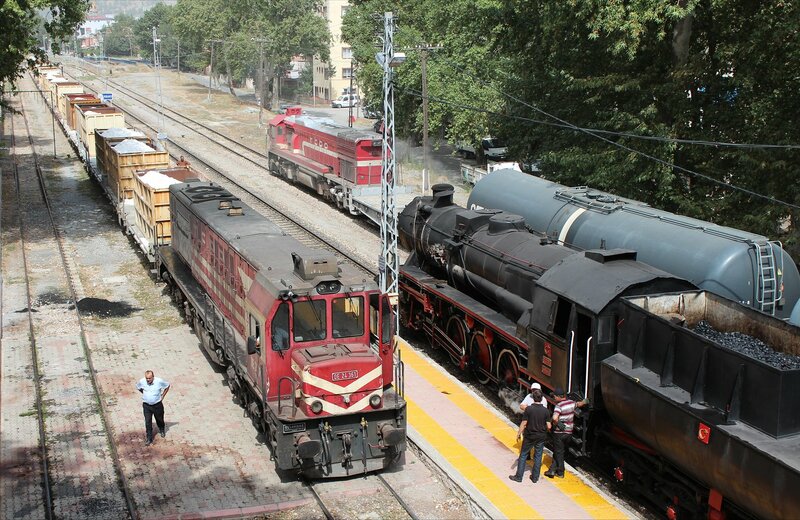 The side effect of this was that we could not even contemplate shunting our loco for some posed shots. In the end we gave up and drove back to the hotel by bus (with the minor excitement of a stop at a temporary army checkpoint) and headed to the pool. 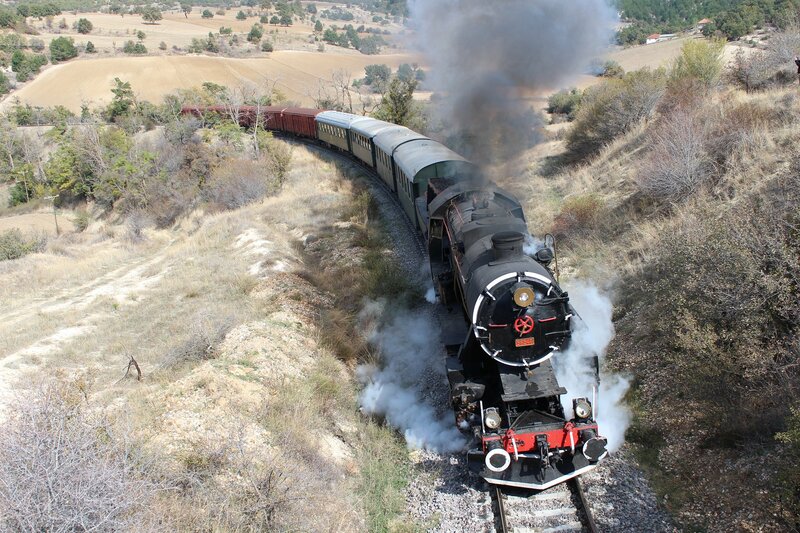 The upside of the interruption to proceedings was that it gave the crew a break from their heroic efforts on the footplate in incredible heat (it’s bad enough under normal circumstances so I have no idea how anyone copes in temperatures in the low 40s!). 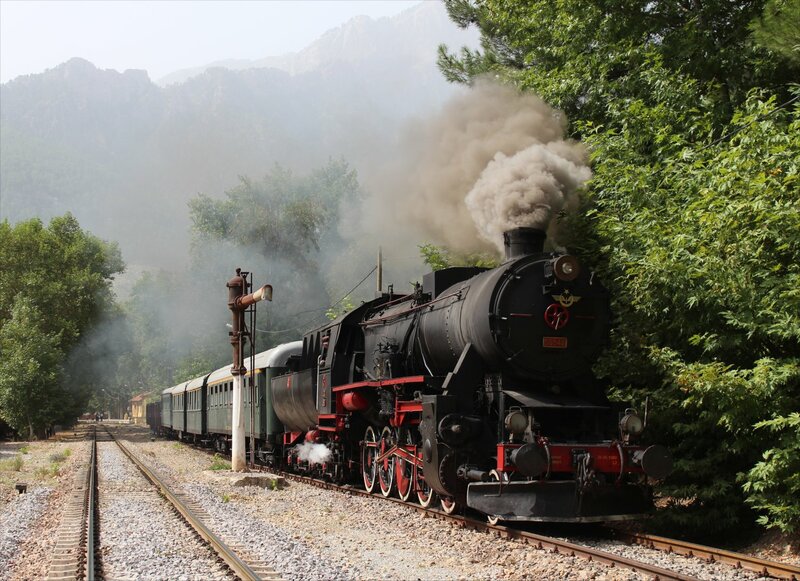 However, it was very strange to be in the pool and hear the roar of a diesel locomotive reverberating loudly throughout the valley. 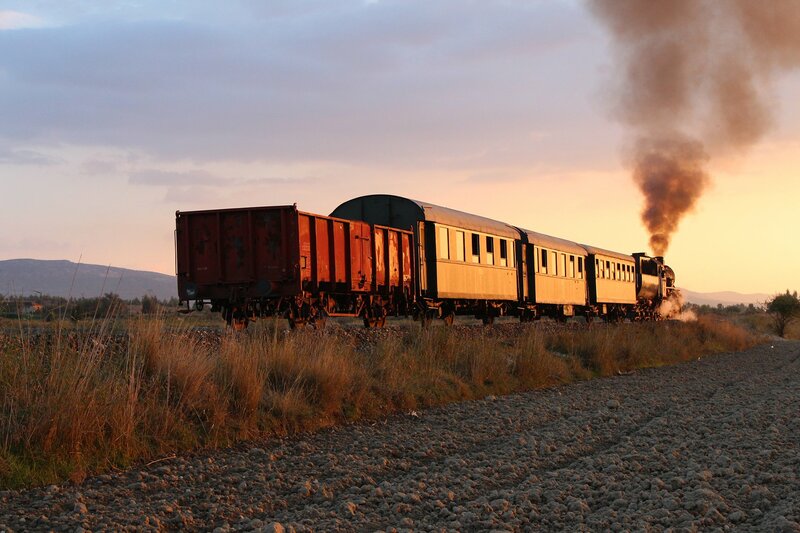 Meanwhile, the situation on the tracks was anything but clear. 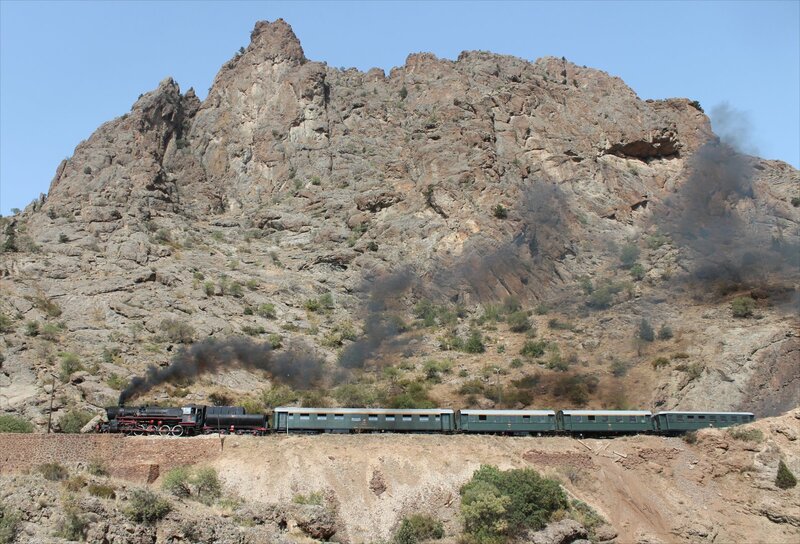 We were told that the regional control office had indicated that the line would now be closed in the afternoon. Just when it began to look as though the arrangements for our tour to run were falling apart an agreement was reached. 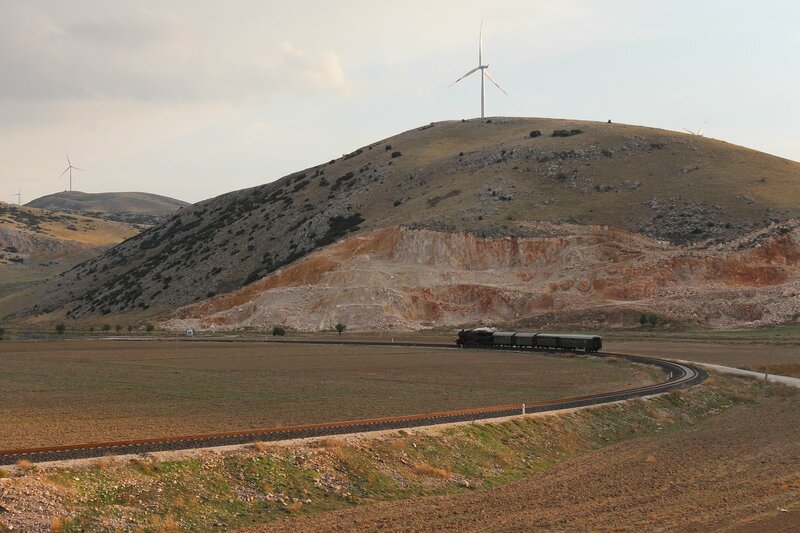 We would spend the afternoon on the stretch of line north of Pozanti, whilst work continued on the southern stretch (deepening the ground level in the tunnels to create the necessary headroom for electrification). 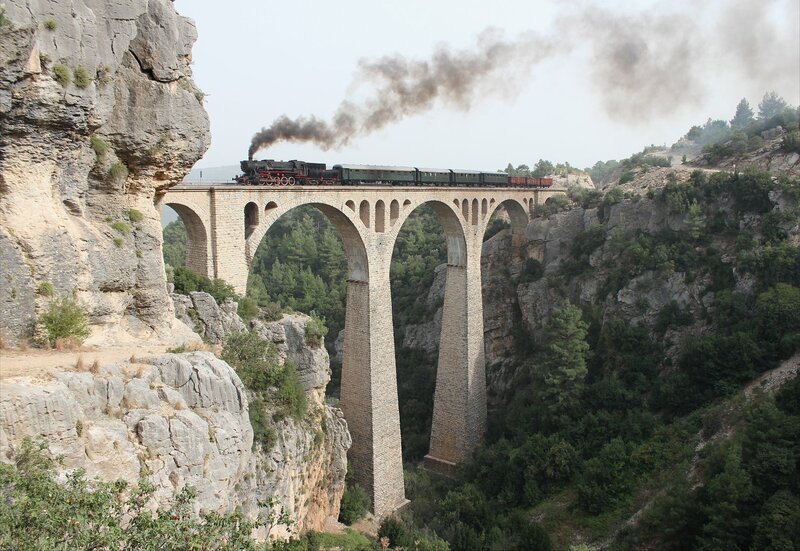 One of the strangest aspects of the day was the unexpected sight of bridal parties arriving to have their pictures taken at Hacikiri and the Varda Viaduct. I am aware that it is customary for couples to have their wedding photos taken before they are married in China, but had not encountered this anywhere else until now. 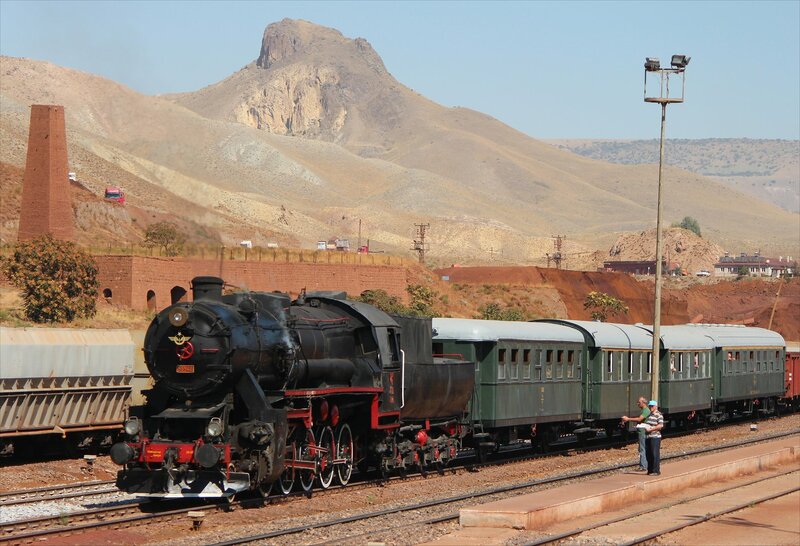 On our arrival at Hacikiri station we came across a bridal party having their pictures taken in the dirt track beside the railway, climbing onto a dusty diesel for some carefully posed shots. Before you get the wrong impression, this was no amateurish affair – the shoot was organised by a professional photographer with make up assistants and guys on hand to hold the umbrellas to help shape the light from the flash. 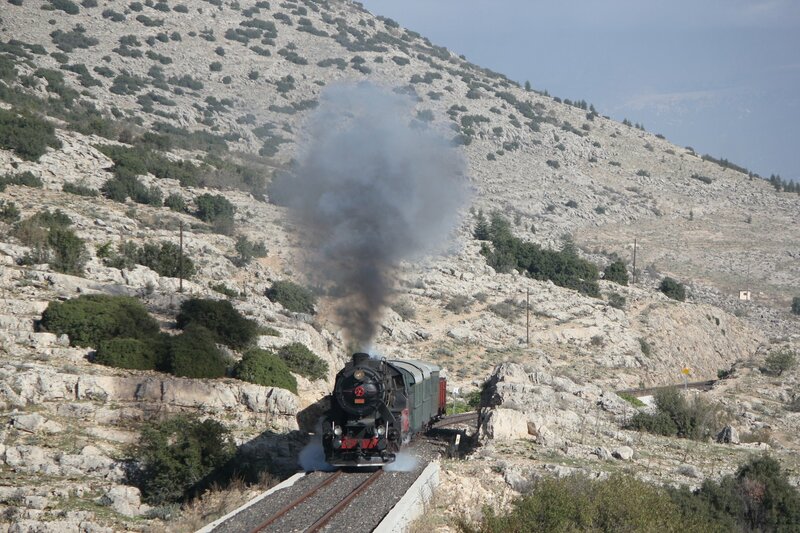 Needless to say, the steam locomotive was a much more promising backdrop and the action soon moved towards us. The photographer got the bride to lift up her bridal train (now fringed with dirty edges) and drop it as if to give the impression that it was floating in the air. 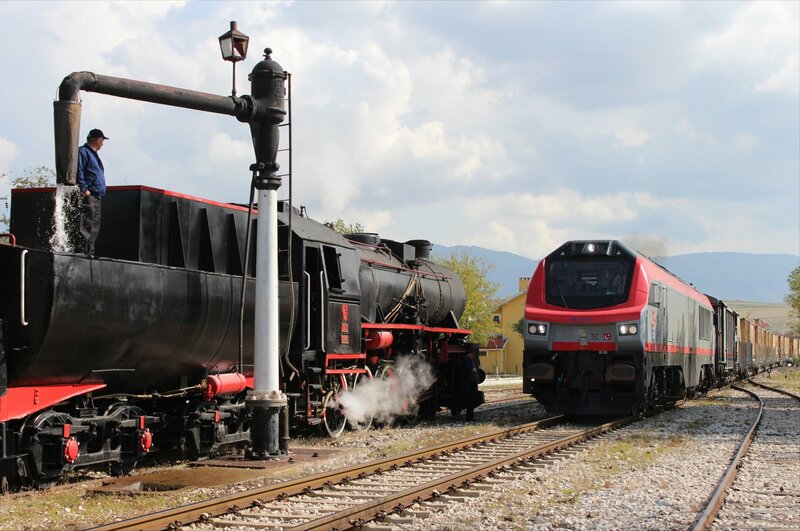 After taking a few shots like this against the locomotive the professional photographer had the rather surreal idea of taking a picture of the couple against a backdrop of forty paparazzi (i.e. us) pointing their cameras at the couple. So, that is how we ended up in a couple’s wedding photographs. You couldn’t make this stuff up! 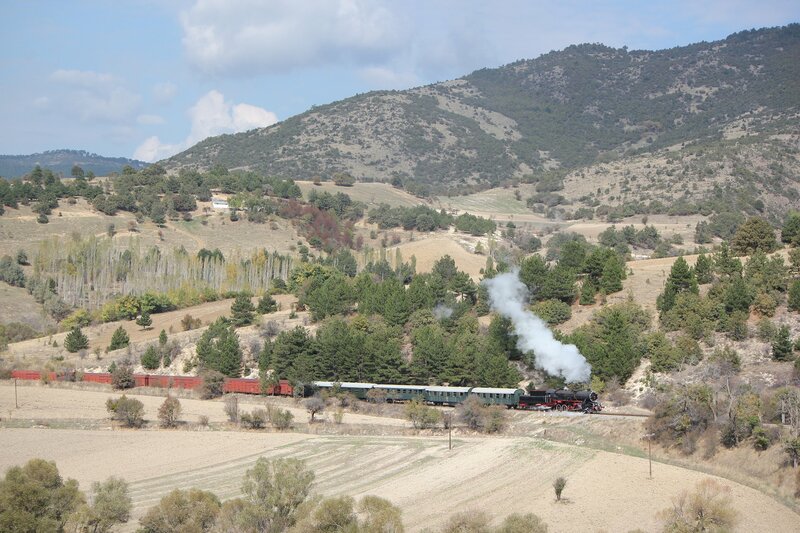 After a spot of lunch at Pozanti we had expected to head north to photograph the remaning spots on the line towards Gümüş, but a change of plans saw us head back towards Belemedik. 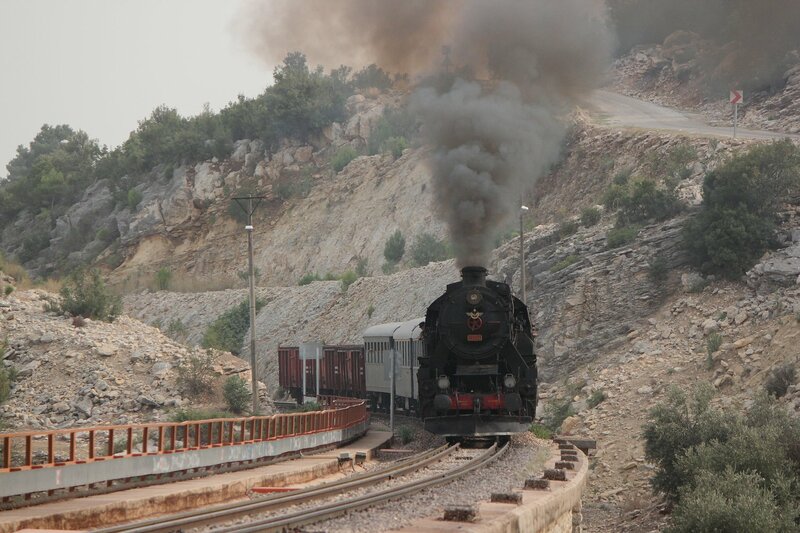 After the less successful trip there in the morning this filled me with some trepidation, but we had a fairly smooth run through here (passing through at 2.33pm) and then on to Hacıkırı (arriving at 3.08pm). 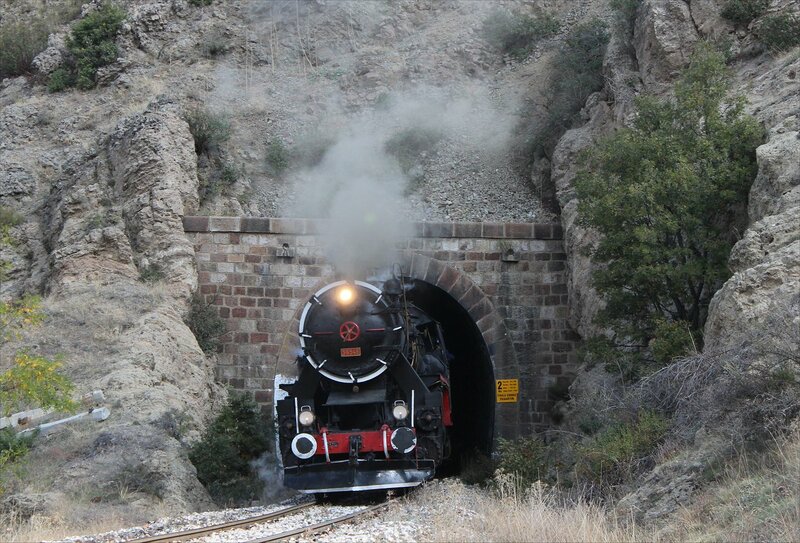 In that half hour we seemed to pass through an incredible number of tunnels, including some of considerable length, which struck me as quite a feat of engineering. 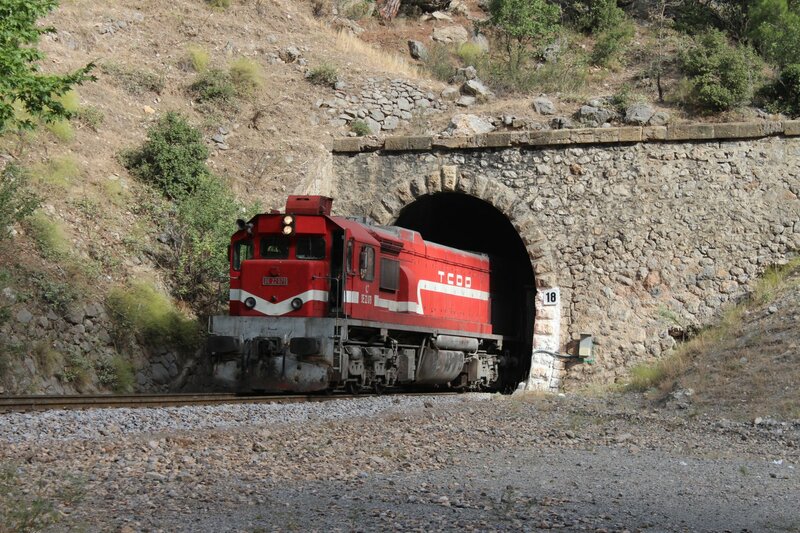 Indeed, over the full extent of the line from Yenice to Ulukişla there are a total of 37 tunnels which have a cumulative length of 14,4km. I am full of admiration for the enginners and construction workers who delivered this remarkable stretch of line. 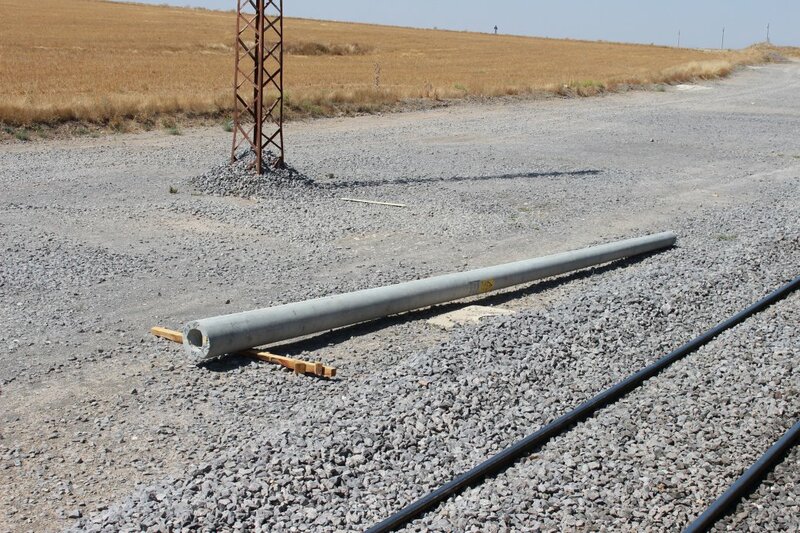 I should think the engineers of today will have quite a headache trying to electrify this section of the line and the cost of this enterprise cannot be cheap! 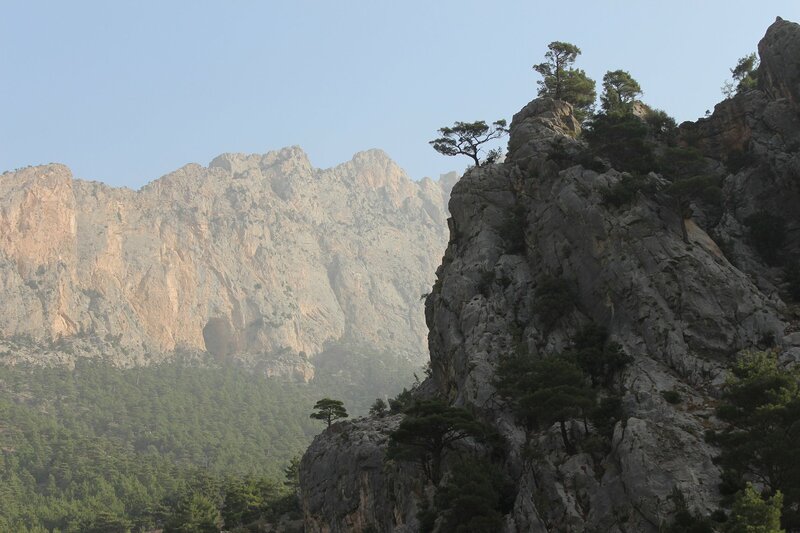 The route had taken us into the heart of the Taurus mountains and through the Cilician Gates, the famous pass used by many a soldier and traveller since antiquity. 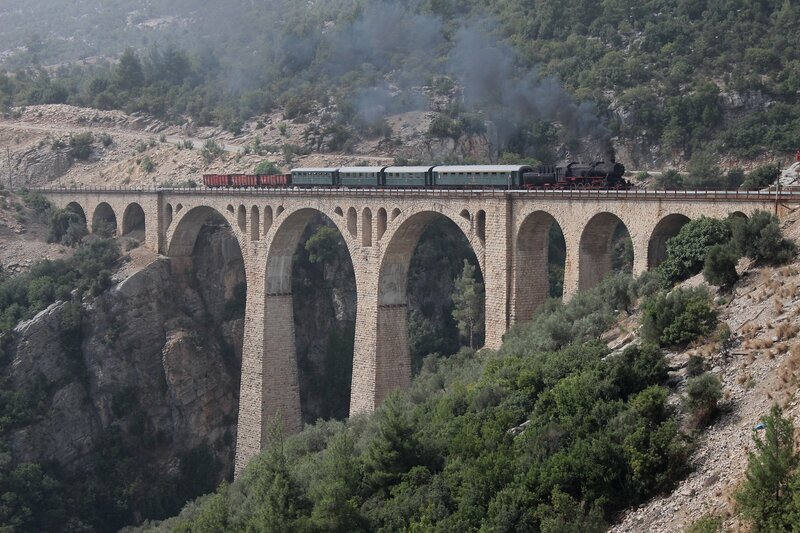 However, an even more impressive sight awaited us at the canyon of Çakıt Deresi – the Varda Viaduct. 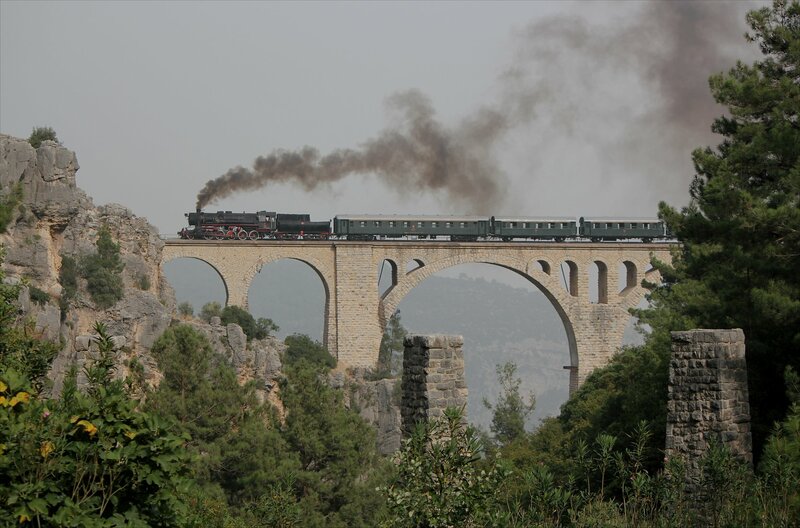 The arched masonry viaduct here was constructed between 1907 and 1912 to bridge the deep canyon of Çakıt Deresi, with a height of 99 metres at its centremost point and a length of 172 metres. 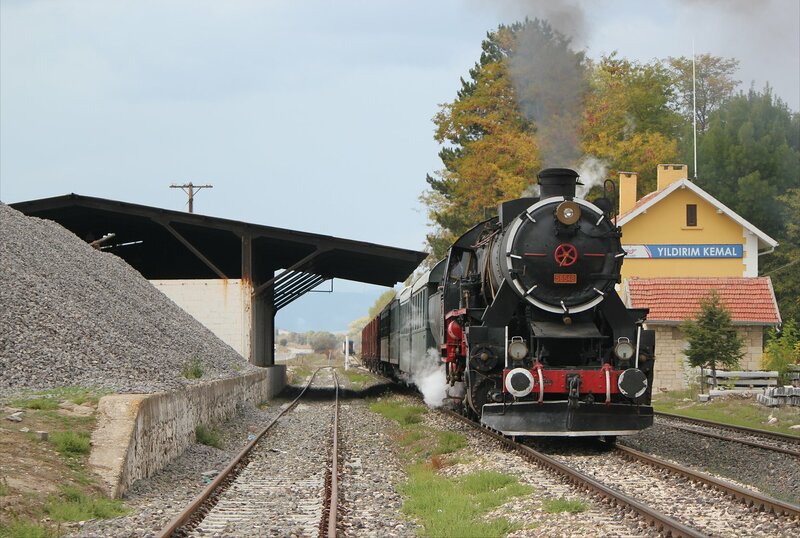 The line opened in October 1918 and has remained in use to the present day. 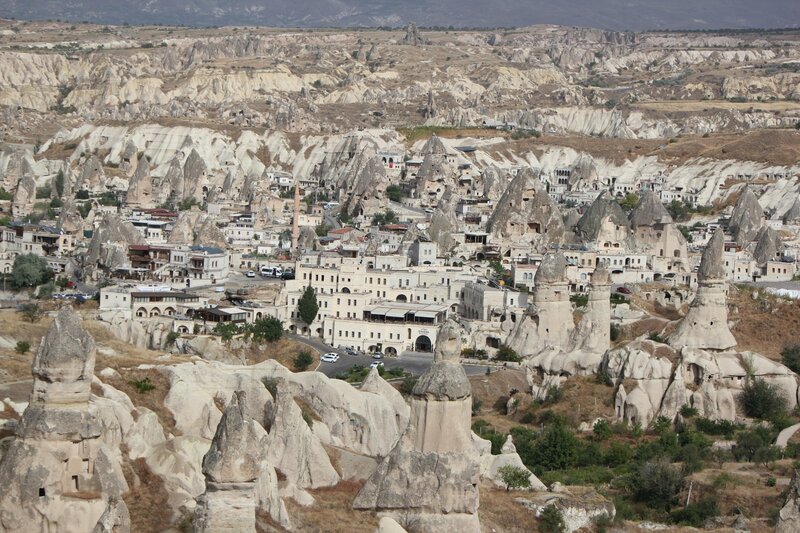 Today, it is quite a popular tourist attraction its own right after its appearance in the opening sequence of the James Bond film ‘Skyfall’ and a small encampment of charmingly ramshackle tourist shacks lines the approach. 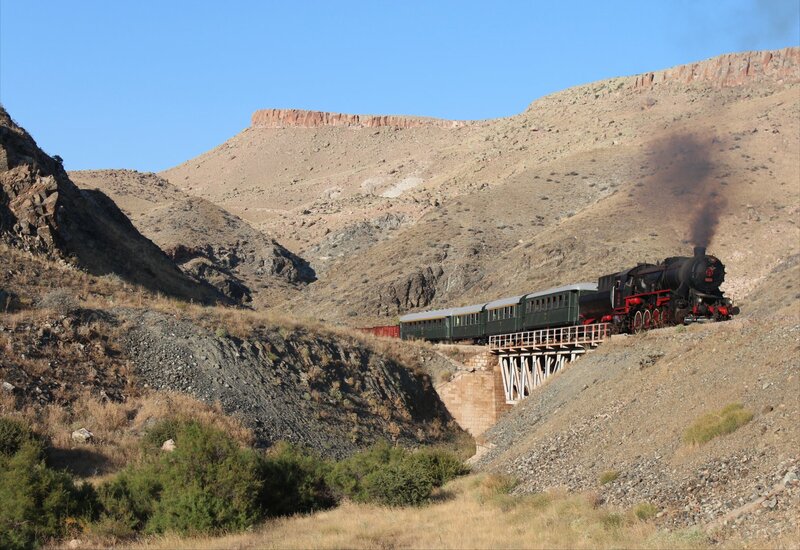 A short walk beyond today’s viaduct takes you to the surviving bridge piers from an earlier viaduct which was built for the 600mm narrow gauge line used to bring construction materials to the either side of the canyon. 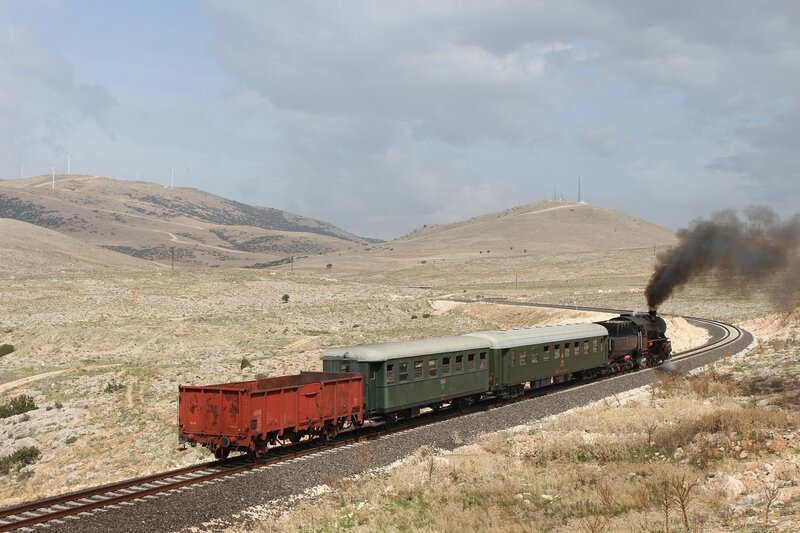 The narrow gauge line was also used to supply the Mesopotamian front during the latter years of the First World War. 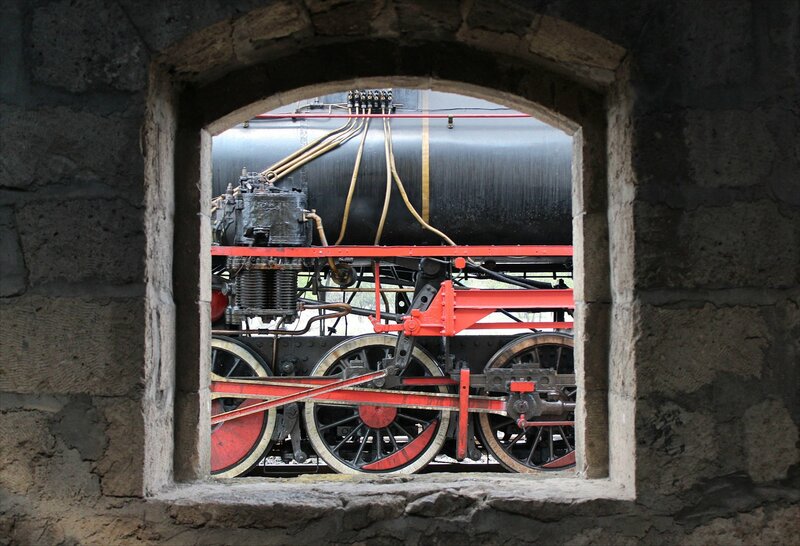 It’s a great spot to view passing trains. 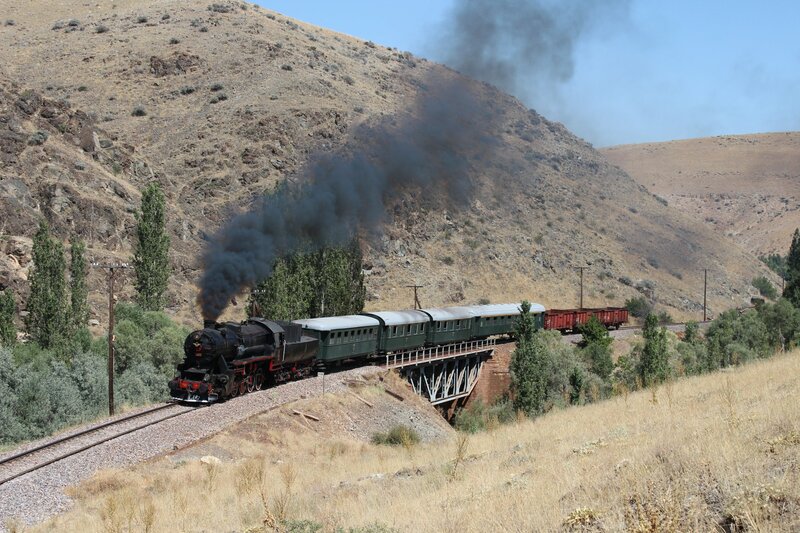 We must have spent an hour at the viaduct photographing our train with around eight runpasts (I lost count/the plot) before we had to clear the line to allow other freight/passenger trains through. By that point we were all saying, please no more viaduct! 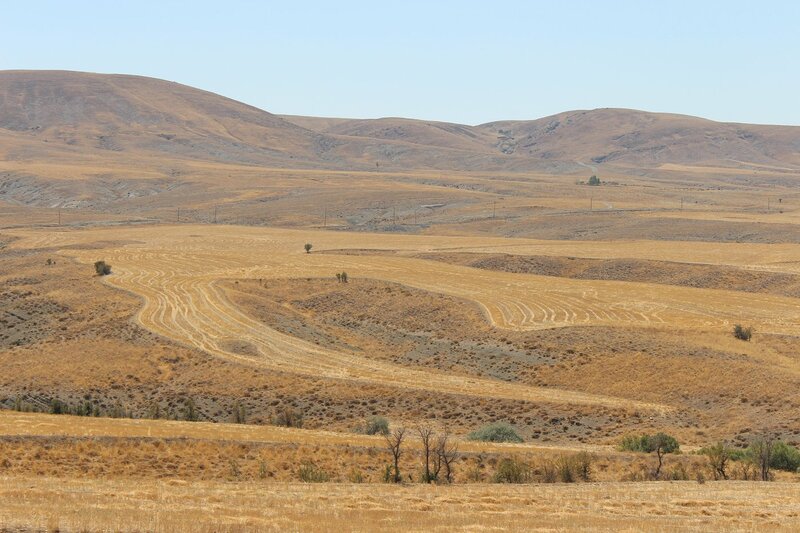 It’s a shame that we didn’t have blue skies – instead, we had a somewhat frustrating dusty heat haze. 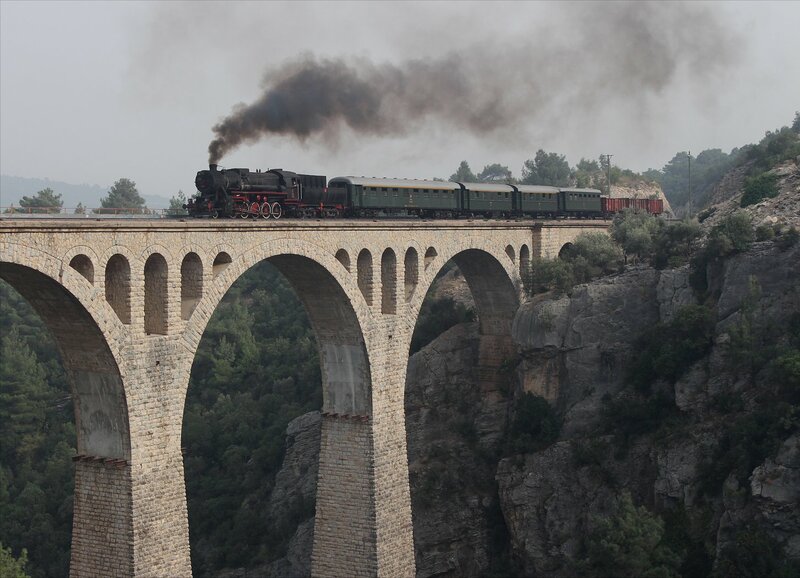 Nevertheless, it was great to be here and to have the opportunity to photograph a steam loco running over such an iconic structure. 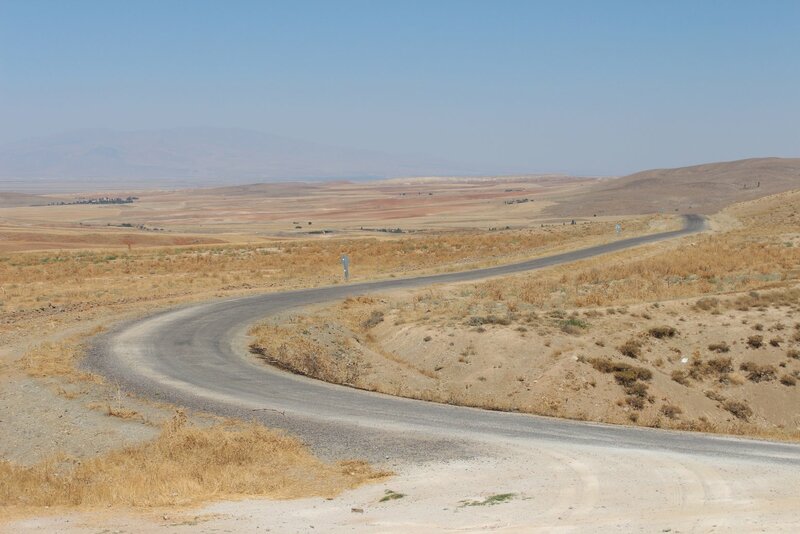 Back at Hacıkırı we waited out the passing traffic before we could head home. 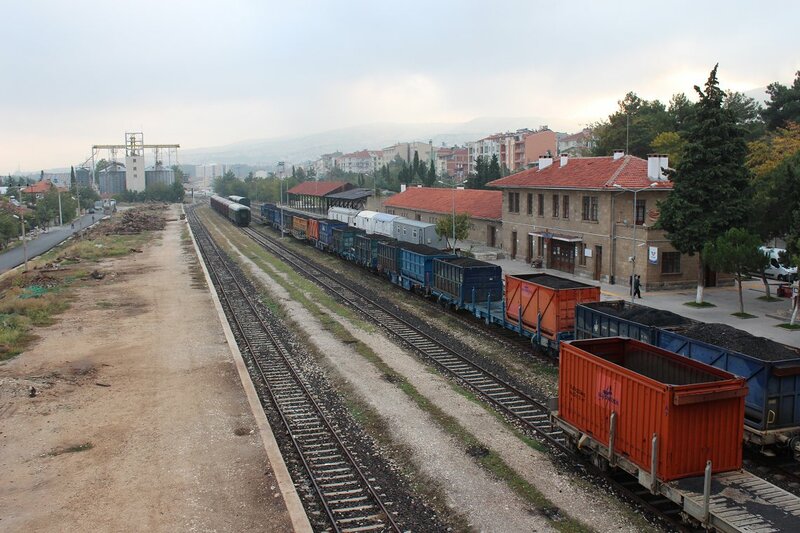 In the meantime an enterprising fellow had turned up at the station and was selling cold beer out of the back of his car for 8TL a can, quite an impressive mark up. When one chap grumbled about the cost it was pointed out that this could hardly be unexpected as this wasm after all, a beer shop in the desert! 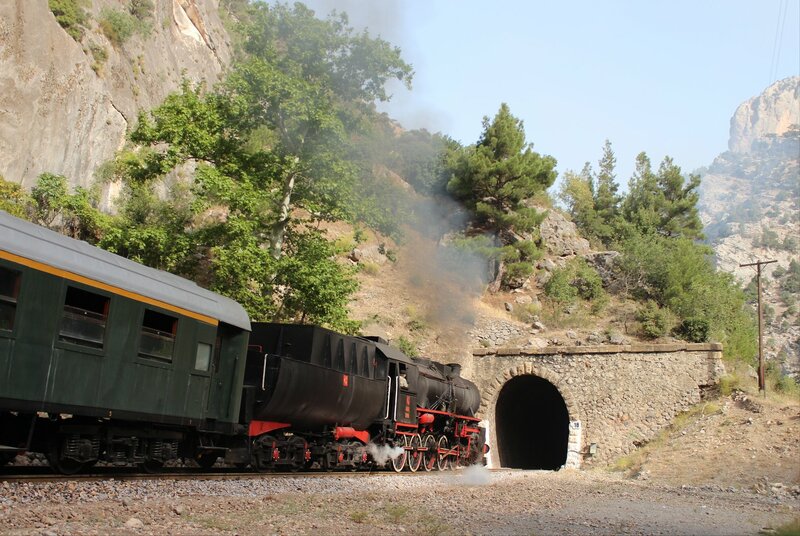 Our two hour long wait for service trains to clear the line ended just before 7pm when the southbound passenger express emerged from the tunnel into the yard at Hacıkırı. 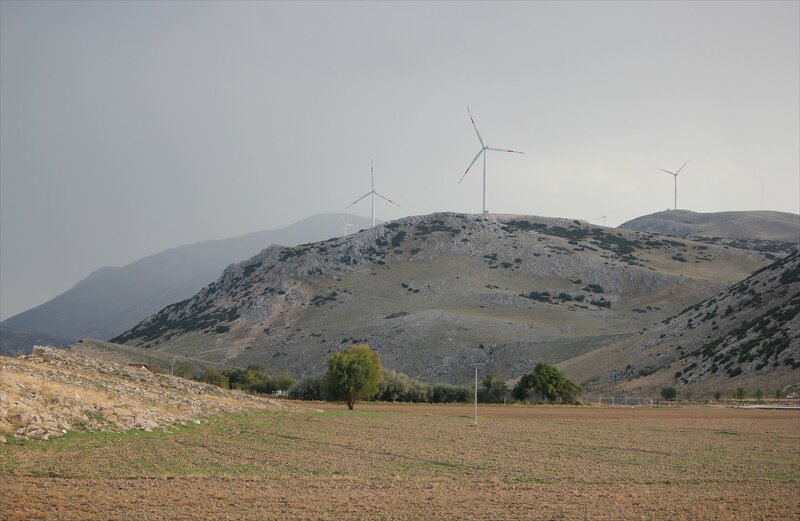 We set off soon after and made it back to Pozanti at 8pm and transferred to our bus here for the short journey back to our hotel. It had been a very mixed day, but I think we got lucky in the end. I don’t think the shots are anywhere near my best, but I hope they do the location some justice. An early breakfast for an early start that didn’t materialise! Instead, we ended up hanging around our starting point, Pozanti, waiting for our chance to get moving. 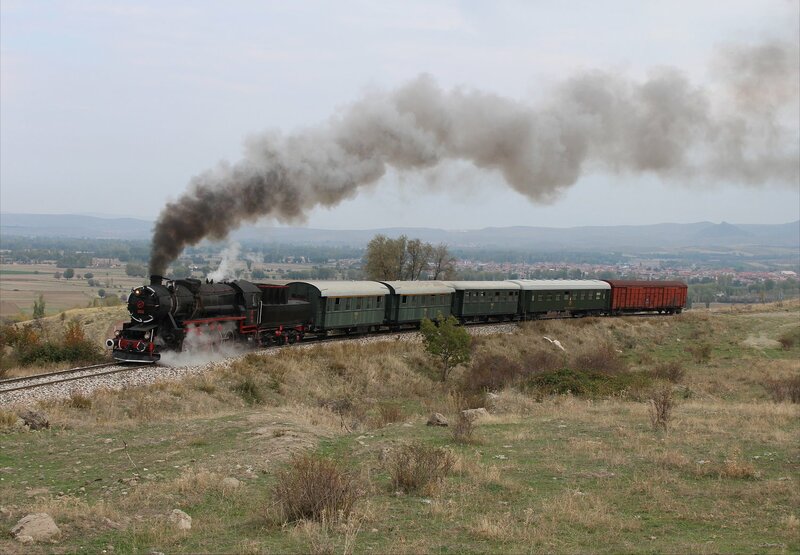 Eventually, two hours later than expected, we headed off to Belemedik and the end of the section of line constructed in 1912. 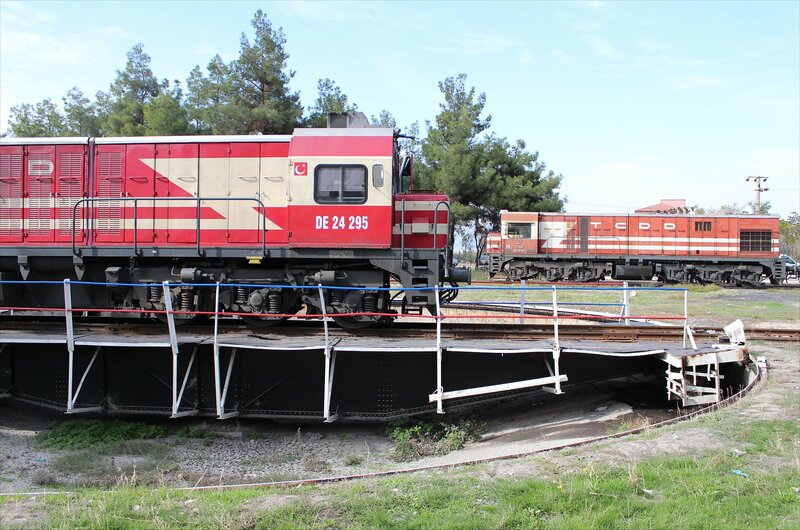 Whilst we were hanging around at Pozanti we were entertained by three diesel hauled freights and one passenger service (even briefly stopping a police car to stop it getting in shot!). 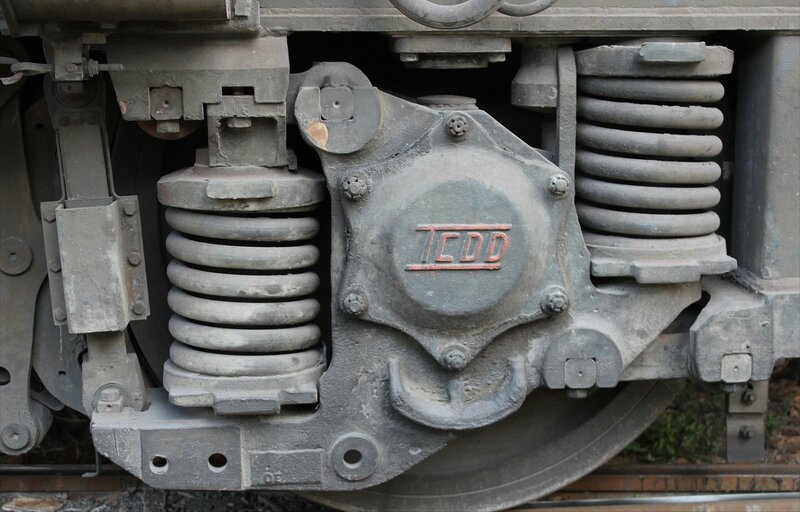 It is easy to forget that the electrification programme will have just as much impact on the opportunities to see and photograph diesels on this historic line so I was not at all disappointed to grab these shots. 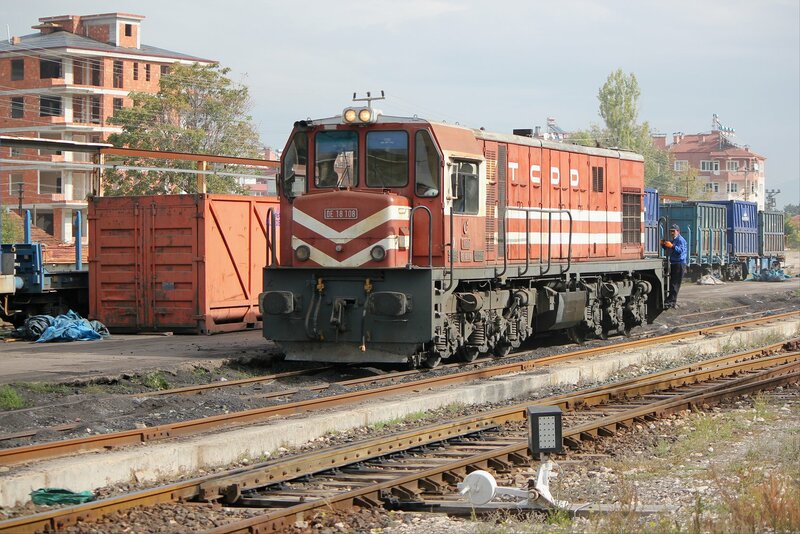 Our diesel extravaganza continued even when we headed south on our rather unsuccessful expedition to Belemedik with few shots possible and the sun already uncomfortably high for photography. Taking all of this into account I found a comfortable perch on some concrete sleepers and soaked up the sun instead! 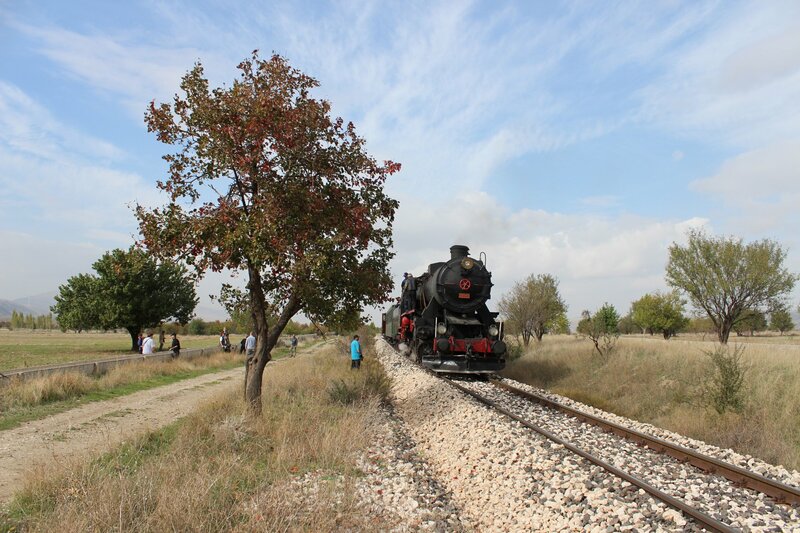 Our arrival in Ulukişla put us firmly onto the footprint of the old Berlin-Baghdad Railway and there were plenty of remnants still in situ to remind of this. 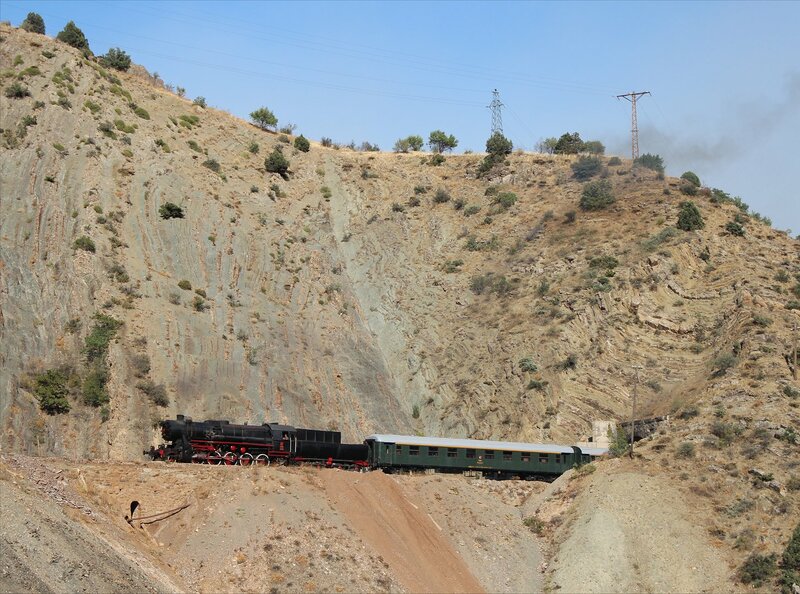 The section of the line between Ulukişla and our base at Çiftehan this afternoon opened on 21st December 1912 and brought the Baghdad railway tantalisingly close to completion. 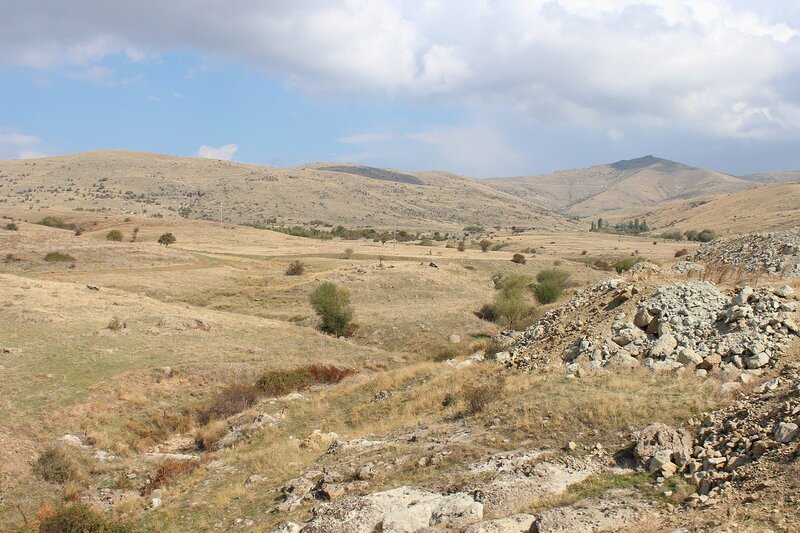 However, at the outbreak of war in 1914 the significant challenges of the Taurus and Amanus mountains remained. 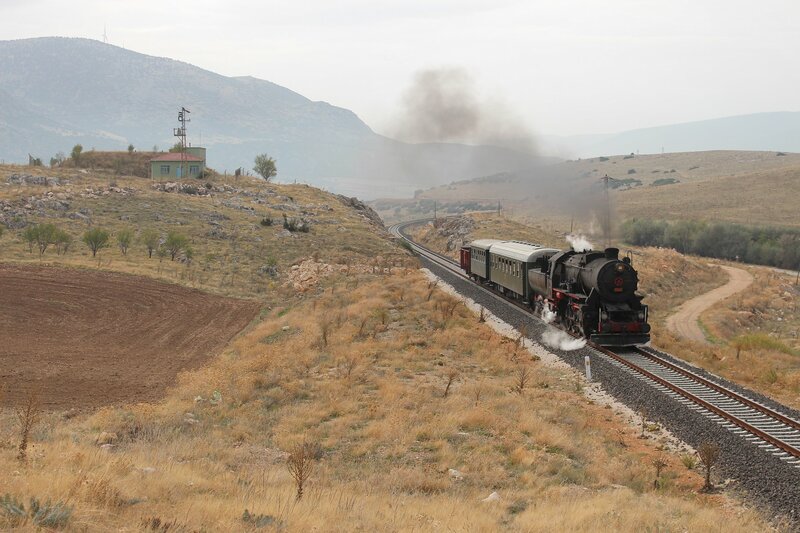 We travelled on the line as far as Gümüş then transferred to our coach for the final section as it is far easier to get to photospots from the road. One spot was quite literally on the roadside whilst another involved a tricky climb up a steep slope with a steady flow of moving rocks to contend with. However difficult the climb it was so worthwhile as the view from up top was terrific – it’s one of the classic shots of the line. Up to now we have seen blue skies everywhere so we were all slightly surprised to see mist hanging over Çiftehan when we finally arrived. I hope this doesn’t spell bad news for the days ahead! 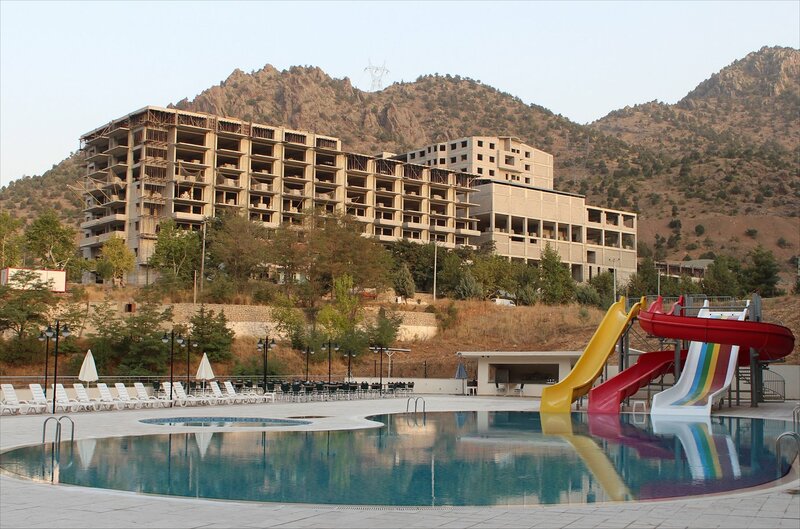 Our base for the remainder of our time in the mountains is the Çiftehan Termal Otel, specialising in thermal and spa treatments. 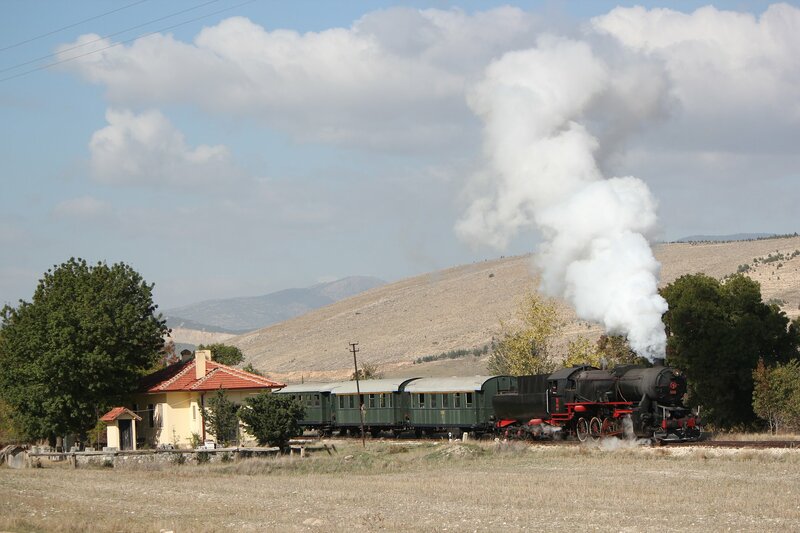 I suspect we make rather odd guests wandering in with our clothes coated in the dust of the lineside whilst the other guests wander around in flip-flops and towels! 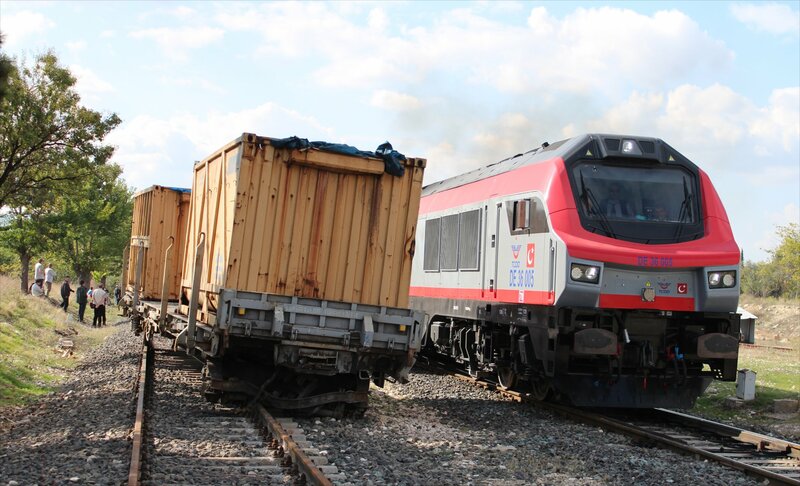 The electrification programme on the Turkish rail networks has been making rapid progress. 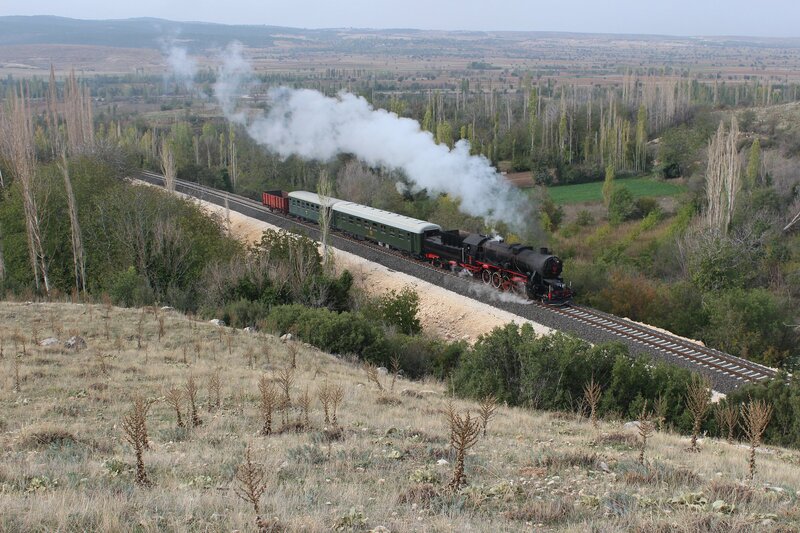 Too rapid in fact, with pylons already erected on many stretches of the line from Kayseri to Ulukişla making the line more or less impossible to photograph for a steam tour. 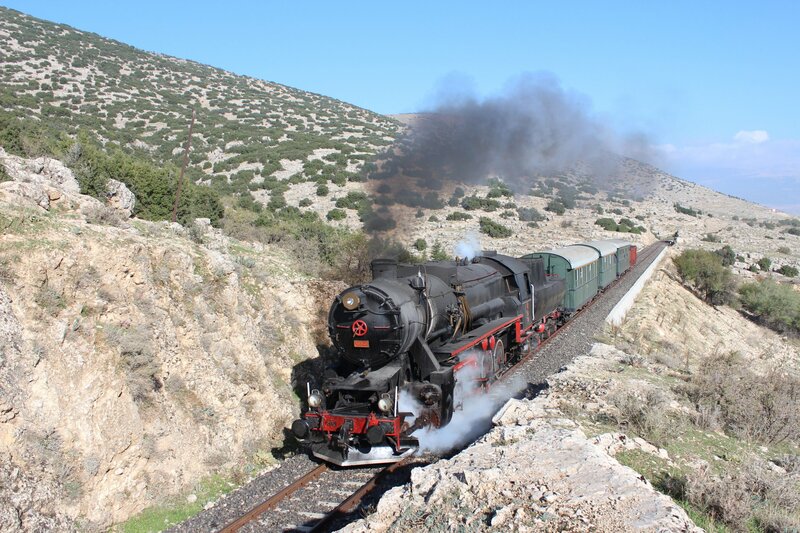 None of us were under any illusions when we booked – we knew this would be a last chance to photograph the line before modernisation disfigured it, but we had our hopes that we would get to the scenic stretches in time. We were lucky yesterday, but not so lucky today. 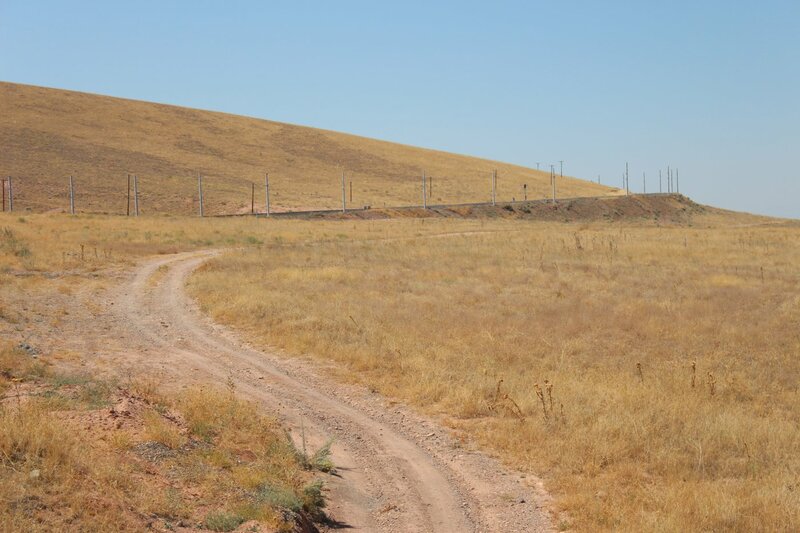 The section between Niğde and Ulukişla has already been smothered in poles so the opportunity to take shots on the scenic curves on this stretch has been lost. 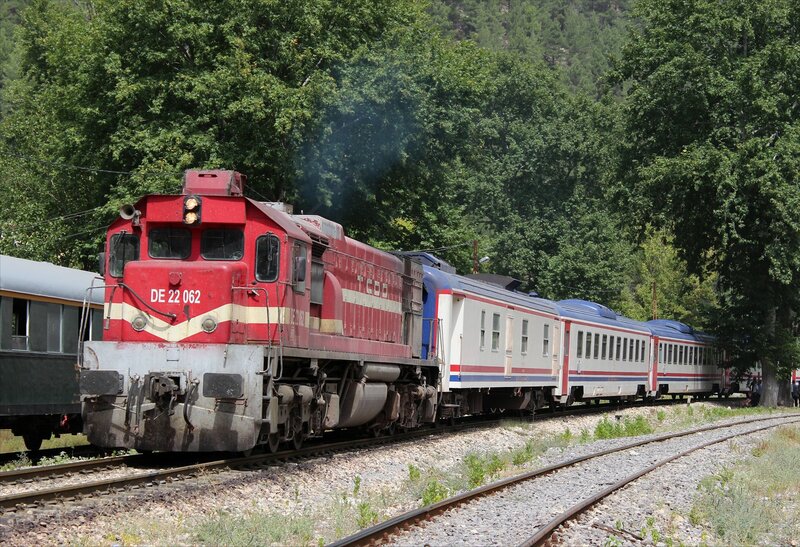 Instead, we will run non-stop to Ulukişla. 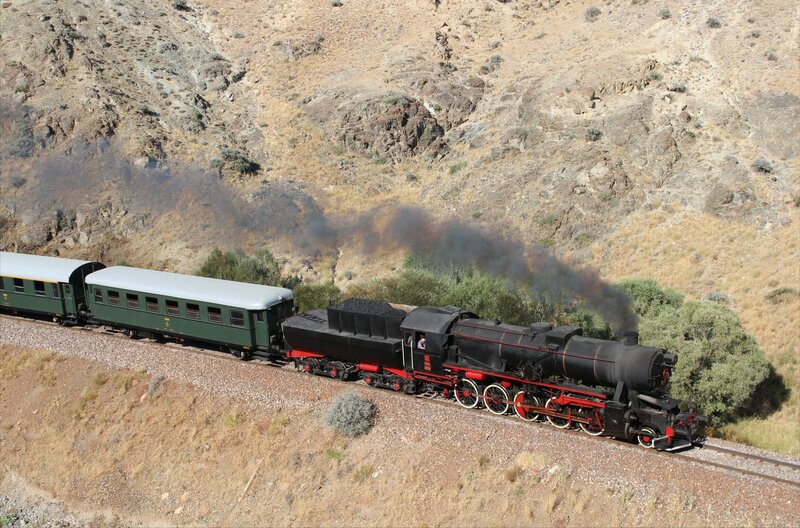 Nevertheless, I count myself very lucky to have been able to photograph steam in the canyon yesterday. 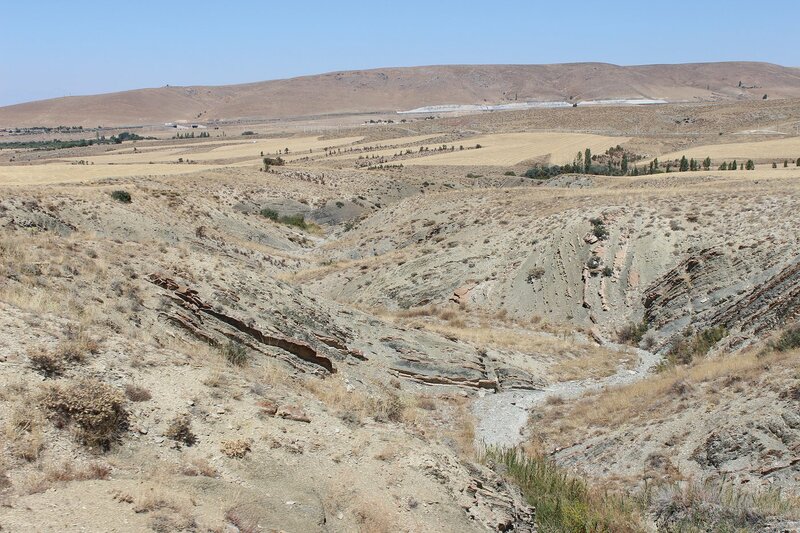 Dietmar told us that in this section progress has been slowed by the extreme August heat. 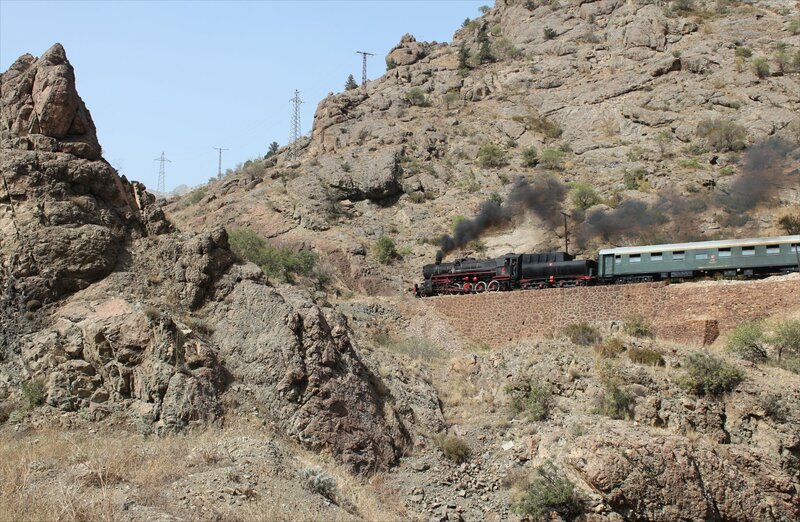 The workers are carrying the poles by truck and the only way for them to reach the lineside in the difficult terrain we saw yesterday is by making simple dirt roads first. Slow work indeed. Anyway, enough of that and back to the action. 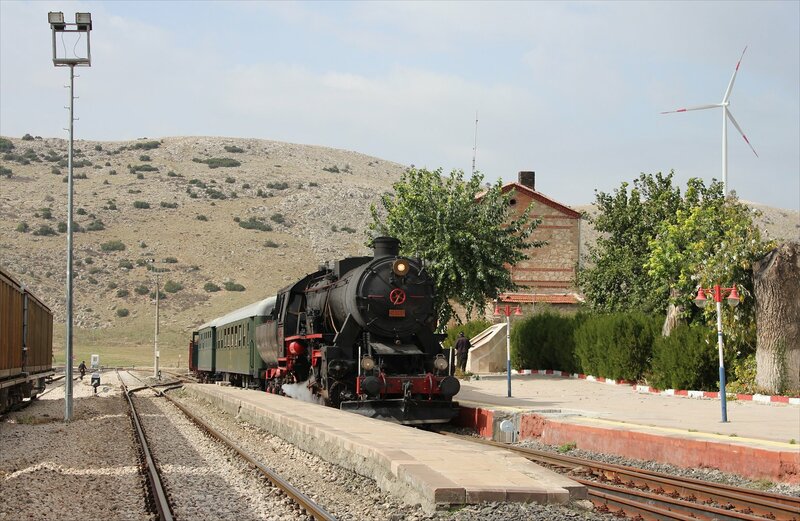 Our loco was awaiting us on our arrival at Niğde’s station, but with the rods off we clearly wouldn’t be setting off too quickly! 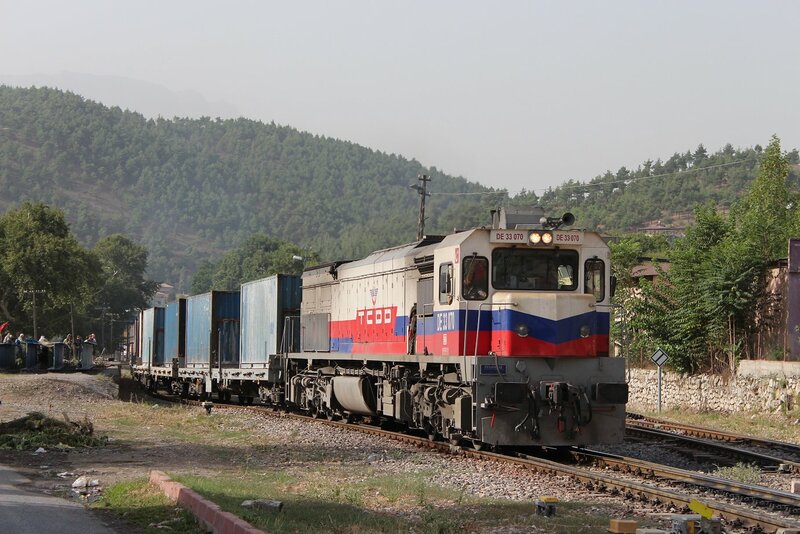 In any case, we had a slot on the track – two freights had to pass first and then a third would wait for us. 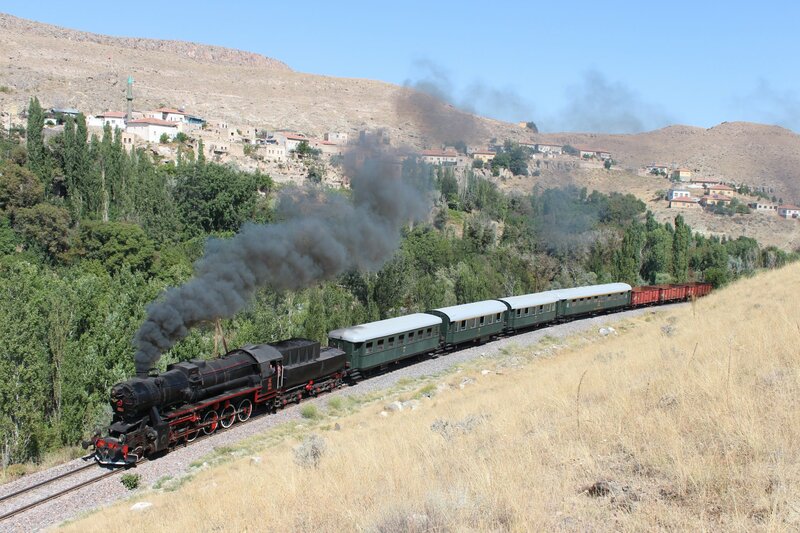 Today’s steam express from Niğde to Ulukışla finally got underway at 10.30am and soon attracted plenty of attention from the track workers, builders on construction sites and mechanics at lineside garages who soon had their mobiles out to take photographs. Infectious smiles and waves all round. 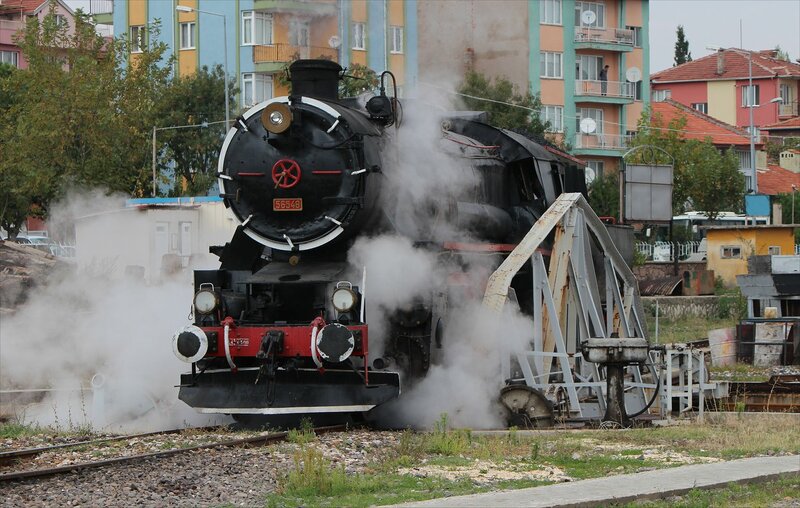 Half an hour later we reached Bor and the rods came off again. It turned out to be a problem with the bearings which had gotten too hot. Fixing this took twenty fix minutes and we couldn’t help but noticed the freight train we were holding up sitting a few hundred metres behind our train. Ho hum! 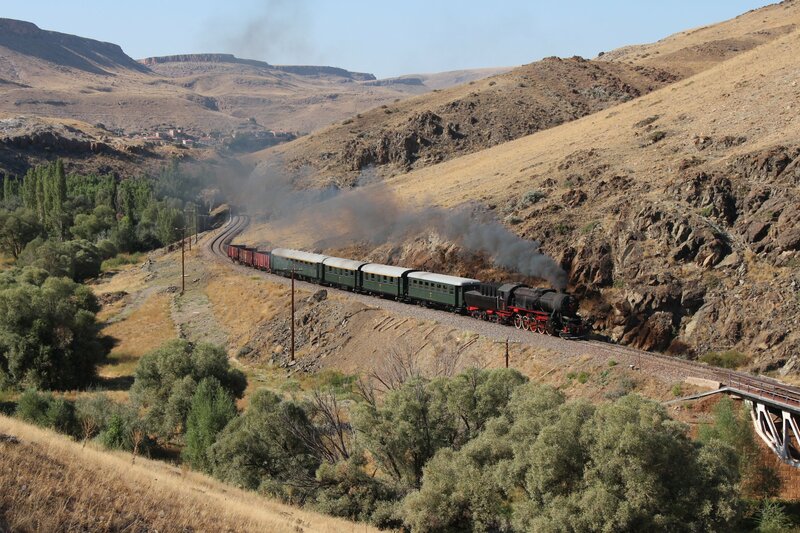 Our next, brief, stop came at Bereket around midday. 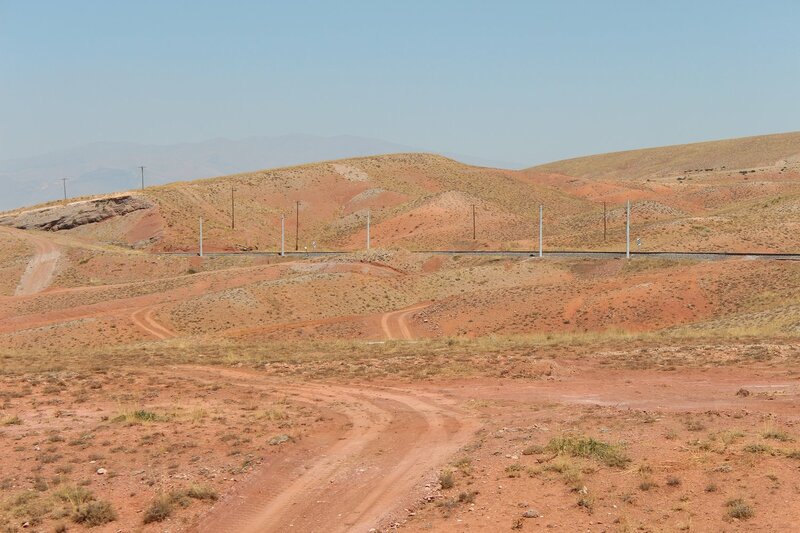 Beyond this point the concrete poles really stand out in the flat landscape and it’s not hard to see why photography is an impossibility. 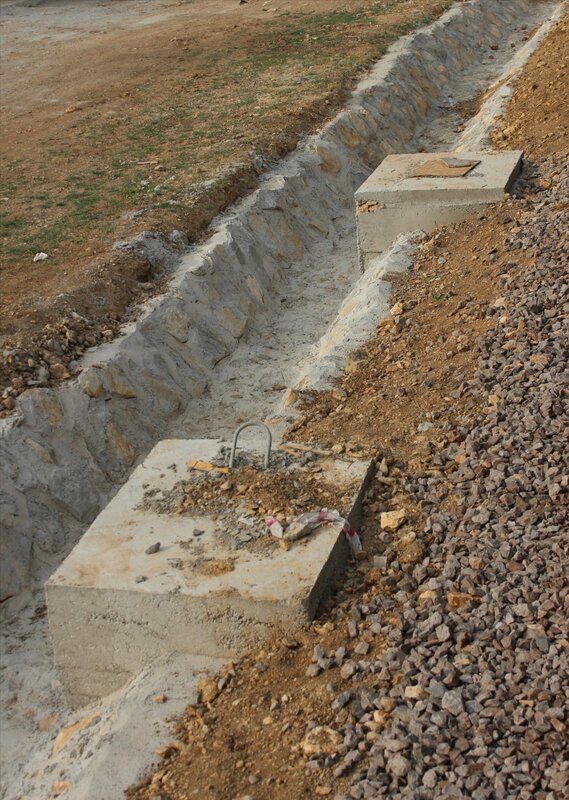 Occasionally, in the hiller stretches, you can see gaps – the concrete post holes are ready but no poles have been erected. However, it’s never too long before the poles re-appear. 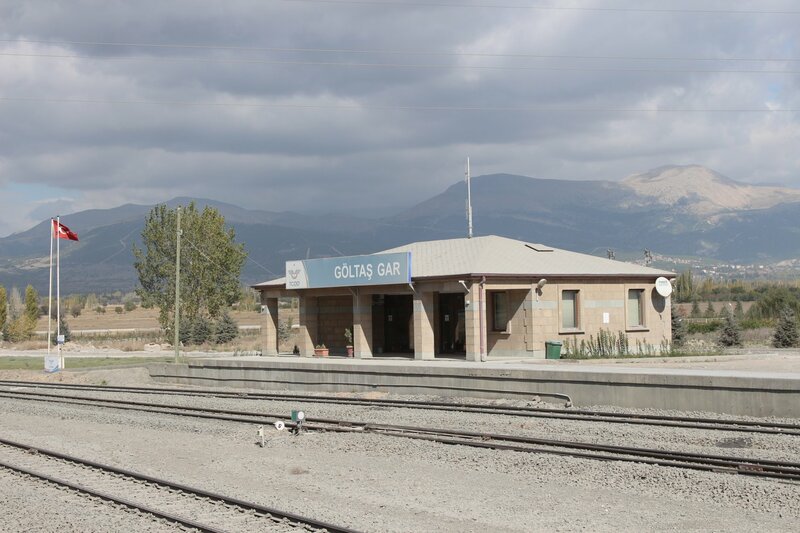 At 12.35pm we reached the minimalist station at Altay – a small signpost and a small battered blue shelter that looked more like a pretty poor excuse for a bus stop, let alone a station! A brief pause and then on again. 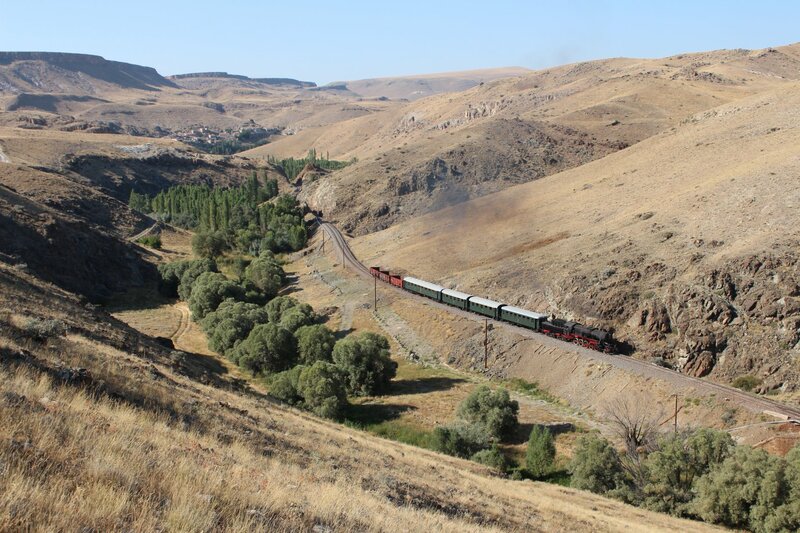 We were soon into the curves on the approach to Ulukışla and it was hard not to feel a little sad that we had not reached here in time. 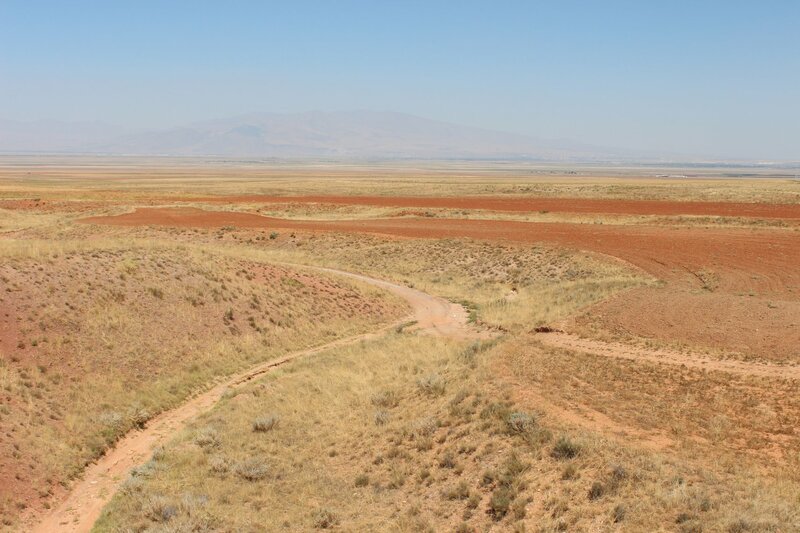 The scenery here looked strikingly different to where we have been and where we are headed – wonderful patterns in the harvested fields and red coloured hills that looked like they belonged to a martian landscape. 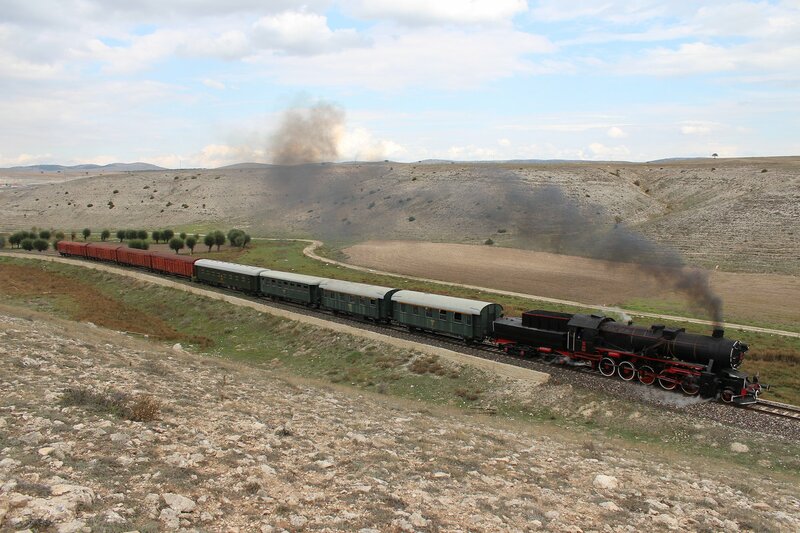 At 3.23pm we set off from Yeşilhisar for the second time. 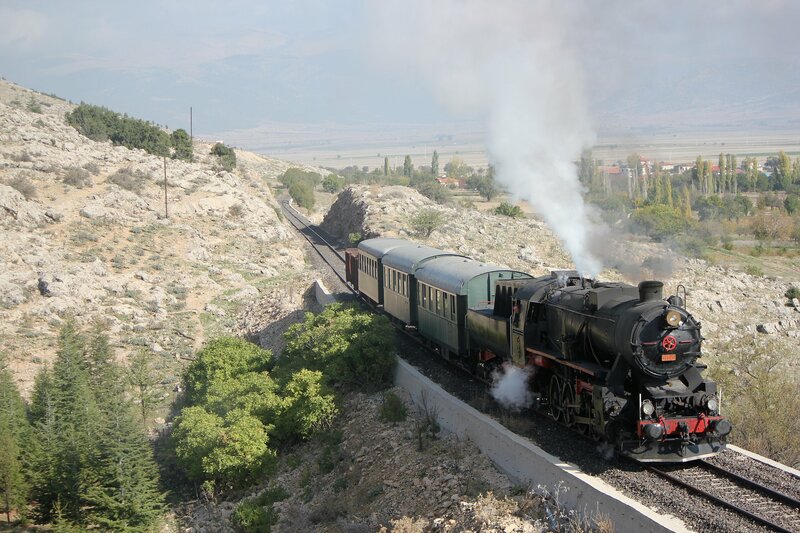 The change in the position of the sun now allowed us to try shots that would have been impossible in the morning, beginning with a few stops at a curve in the track which gave us the mountain village of Akköy as a rather superb backdrop. 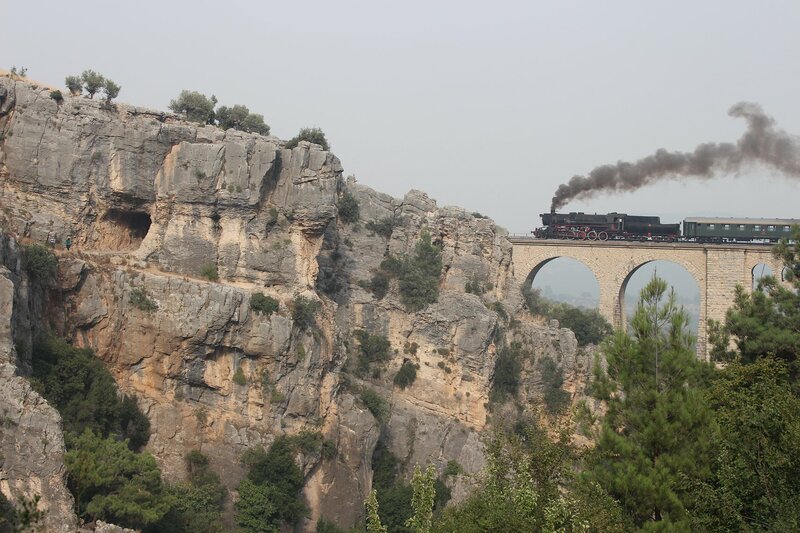 After this the scenery just continued to improve with a series of impressive bridges, viaducts and rocky hilltops. The canyon certainly delivered an impressive punch and we continued to make the most of it until the sun dropped below the hills. All the while, the prospect of ever improving photographic opportunities tempted me to go higher and higher, usually regretting my ambitious climbing on the slippery scramble down. I really must remember that I am not a mountain goat! 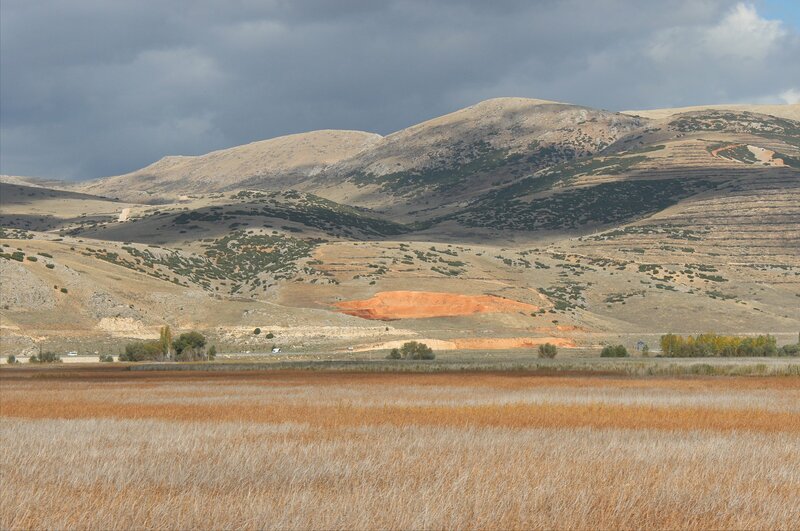 Our last shot in the canyon (around 6pm) was perhaps the most delightful with a view of a bridge near Arapli, seen from across a pumpkin field, with the rocky hilltops as a rather stunning backdrop. 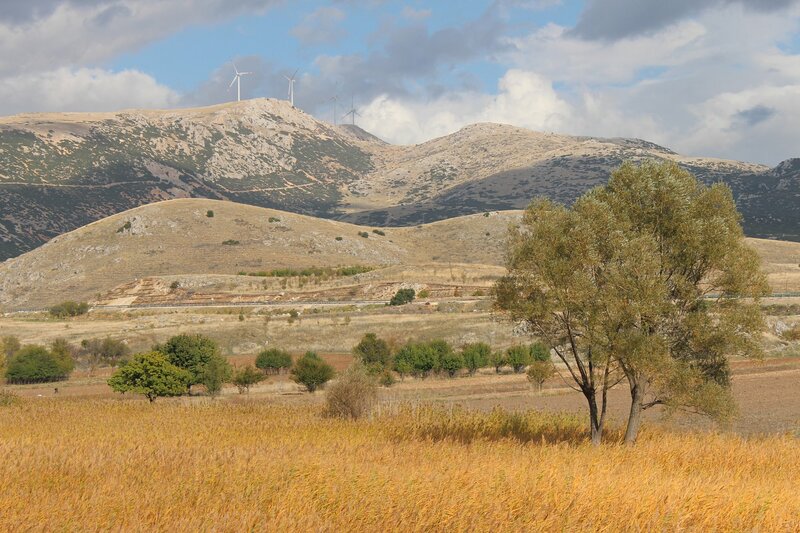 After this, we carried on to the golden fields outside Arapli to try and catch a glint from the setting sun. 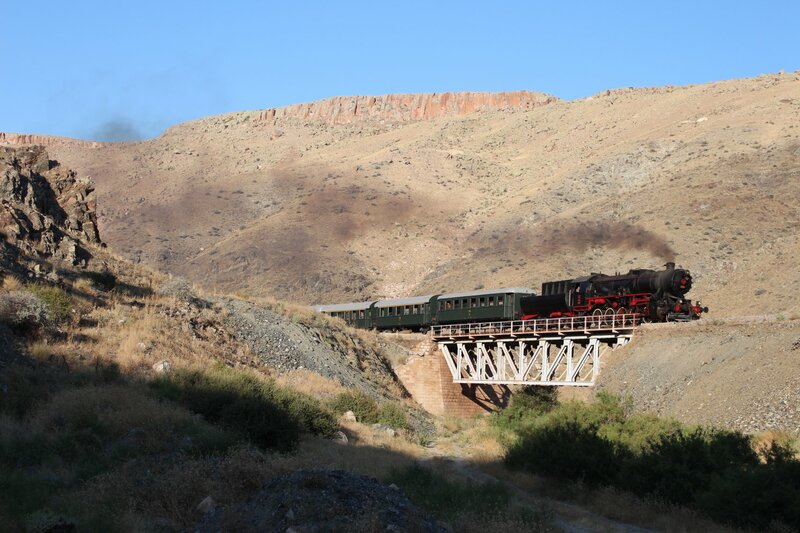 Once the light was extinguished we headed on to Arapli and boarded our bus for the drive to Niğde, our stop for the night. 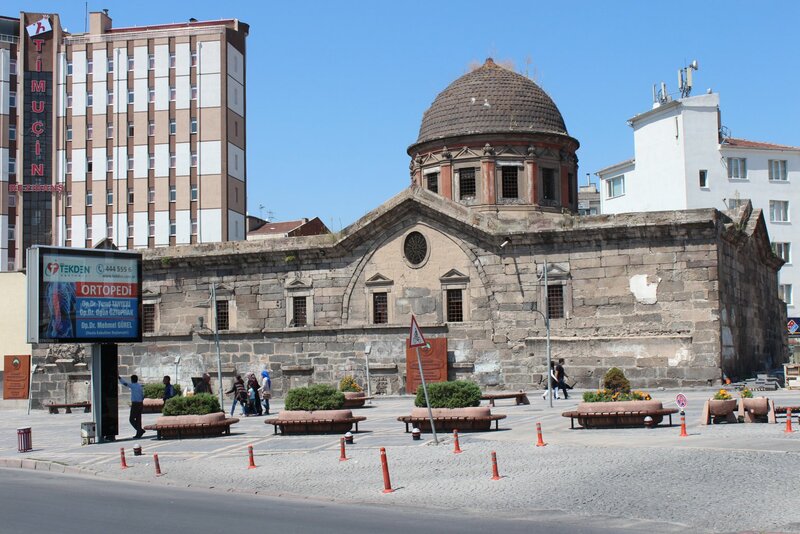 A wander around the centre of Niğde didn’t throw up many options for eating but one place was able to entice us in with the prospect of ‘meat on rice’ after some translation difficulties! Still, after such a superb day who could complain!? 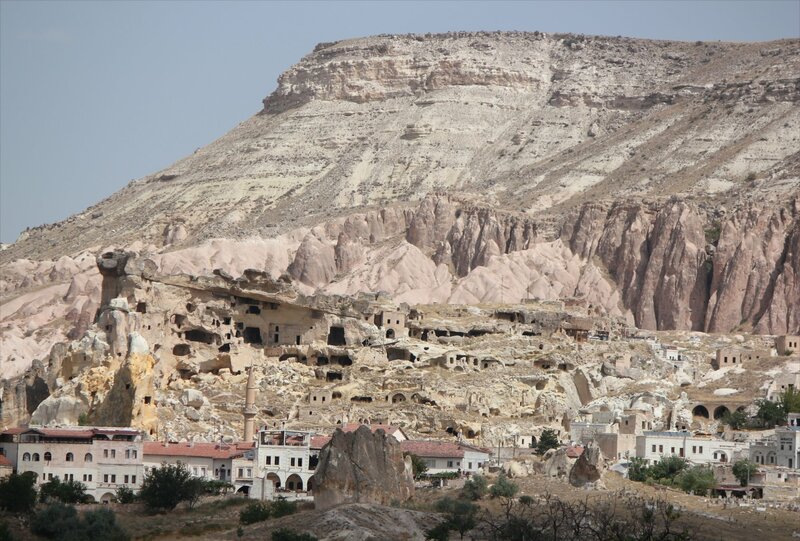 Our tour started with a bus ride from Kayseri to Yeşilhisar, the station at the beginning of the scenic rock canyon. 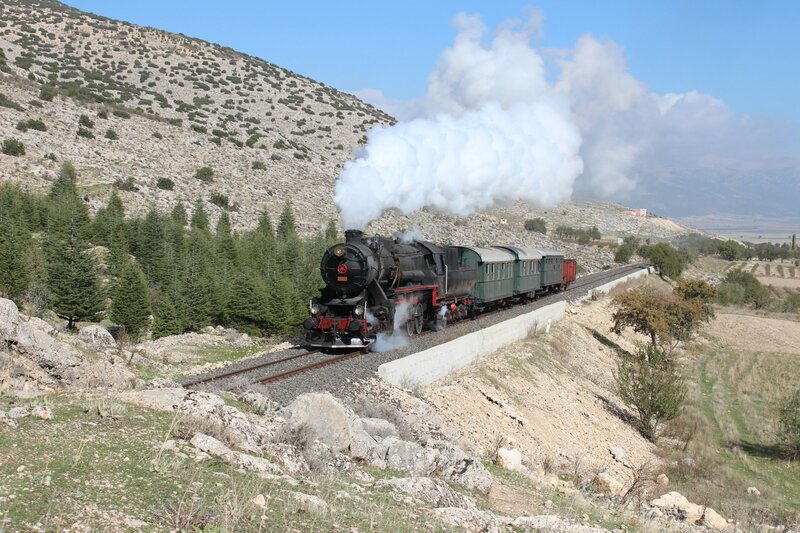 It was here that we expected to find TCDD 56 548, the last operational steam loco in Turkey, at the head of our four carriage train in readiness for the run to Arapli. 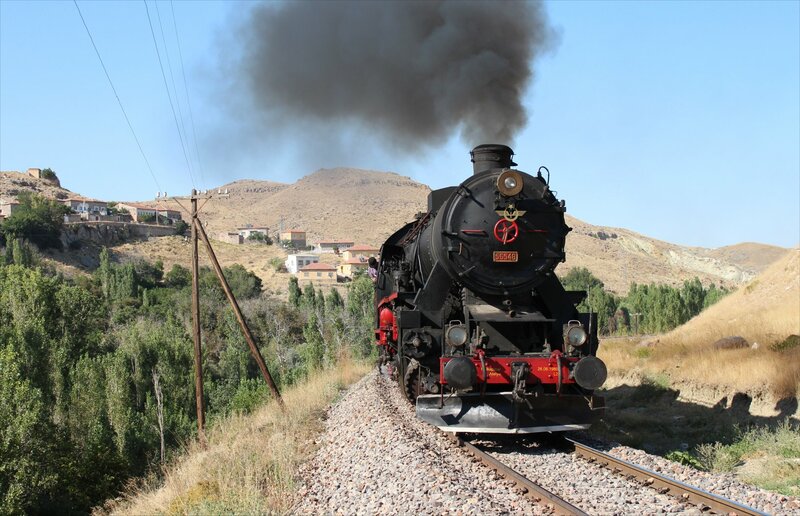 It was to be a relatively leisurely start as we could not get going until the morning passenger express (the Erciyes Ekspresi from Kayseri to Adana) had passed through. The sight of the crew banging away at the air pump with their spanners told its own story and was depressingly familiar to anyone who had been on the tour last year. 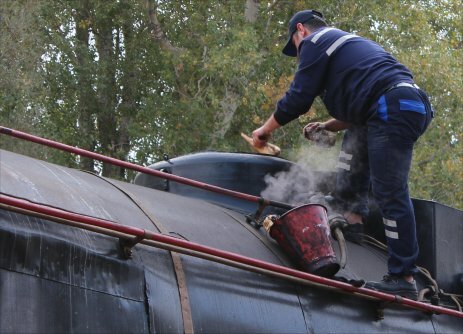 Apparently the loco had been working wonderfully until a small part dropped off during service earlier this morning. 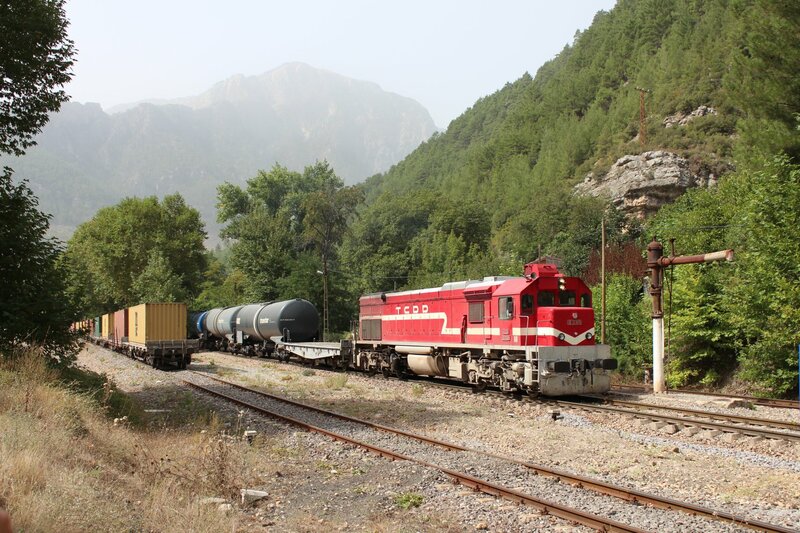 Thankfully there were a few diesel hauled freights around to distract and entertain us until the air pump was fixed. 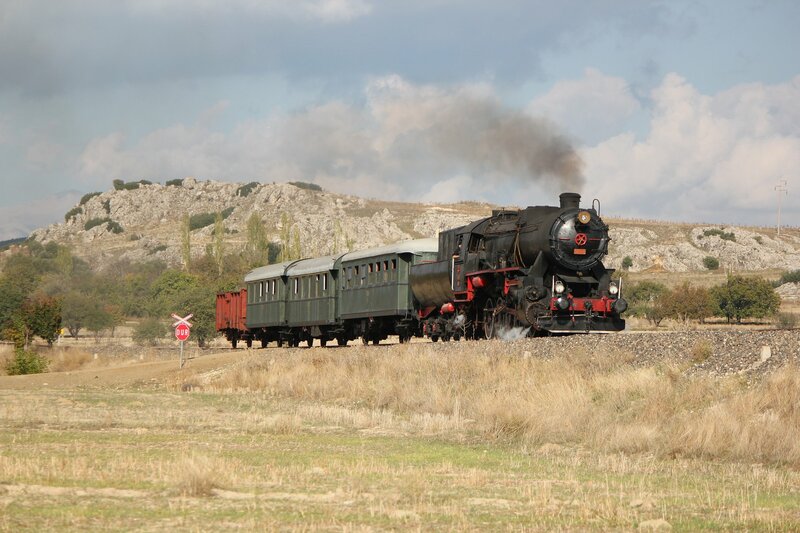 We finally set off at 10.28am and all thoughts of our difficulties faded as we set to work photographing the train at four locations en route to Arapli. 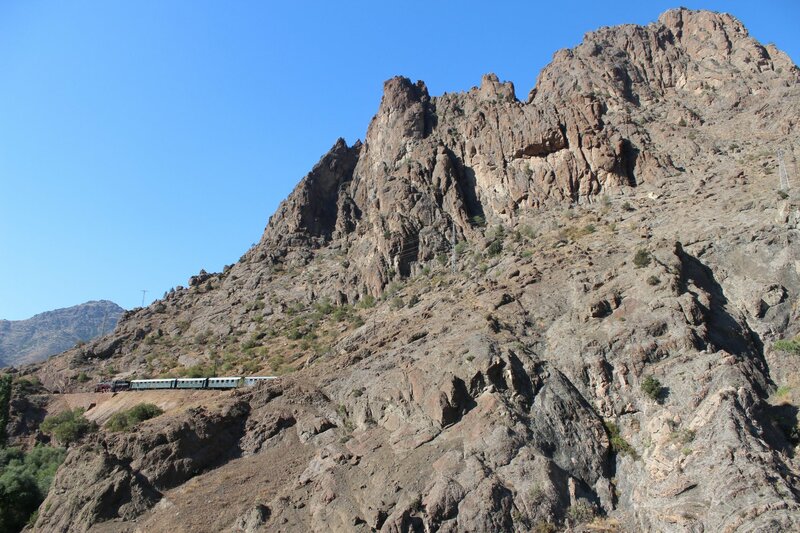 The scenery all around was simply stunning, regardless of whether our train was in shot. 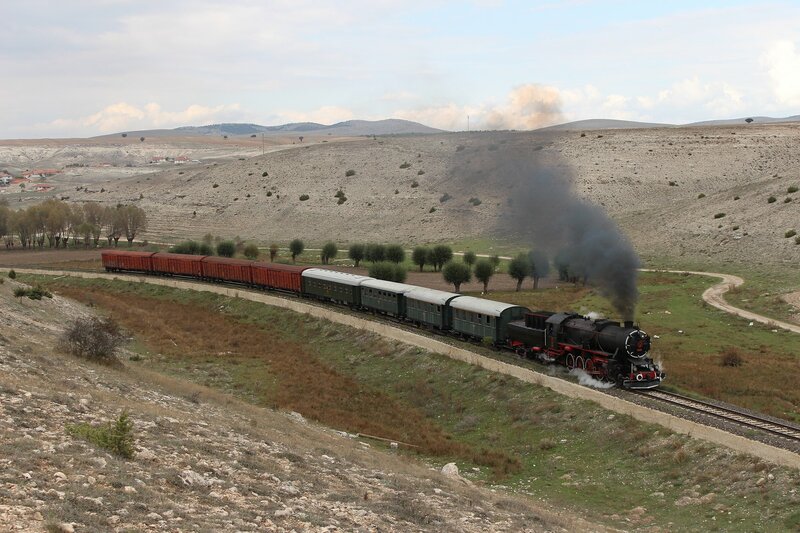 Our arrival at Arapli just after midday should have heralded a lengthy wait for our diesel to reach us and haul us back to Yeşilhisar. 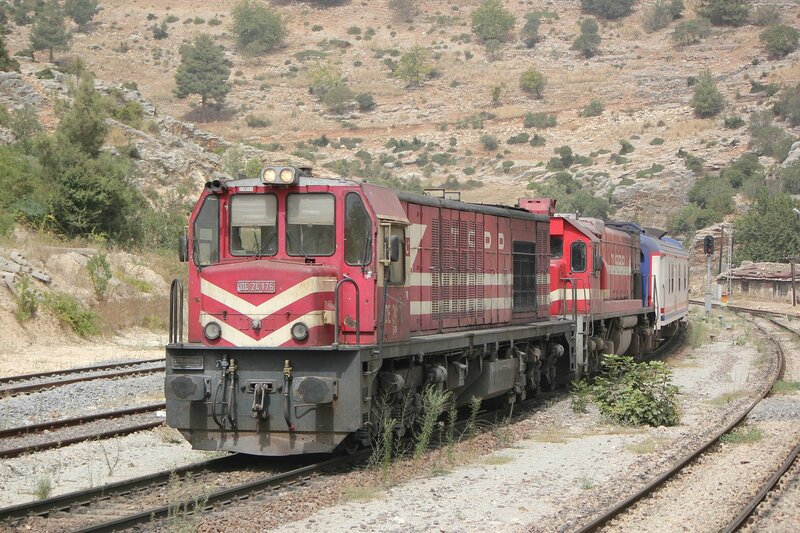 However, our luck was in – we were able to hitch a lift from a northbound freight hauled by a class 24 diesel. 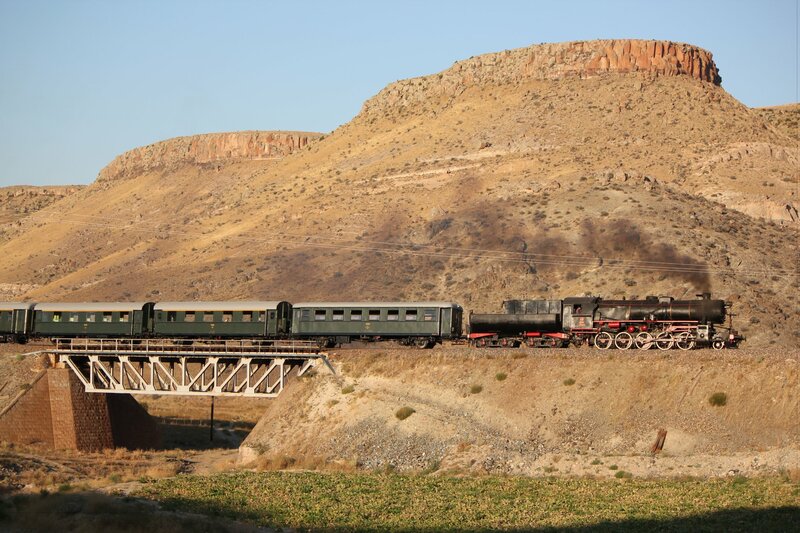 It must have made a strange sight for anyone at the lineside given that the diesel was now effectively hauling (in order) 4 flat wagons, 16 container wagons, our 3 wagons, 4 carriages and a steam locomotive! 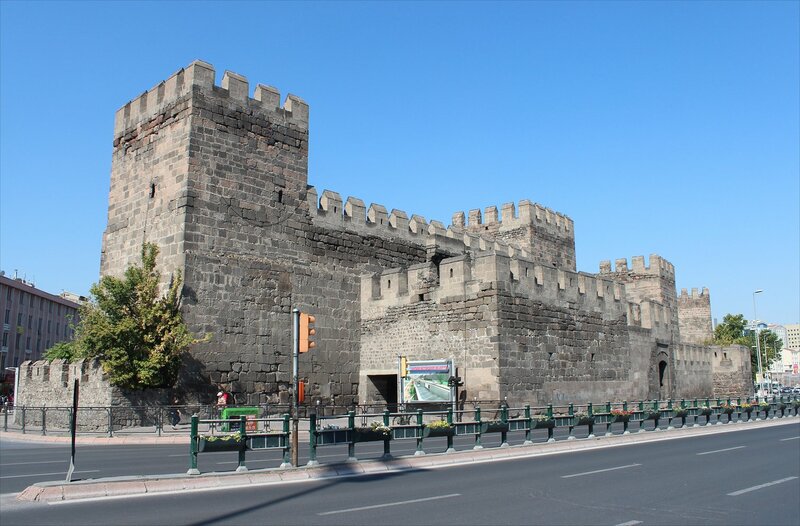 I had high hopes for my visit to Kayseri with many interesting historic buildings packed into the city centre, but after wandering the sights I soon discovered that the overriding theme was restoration! 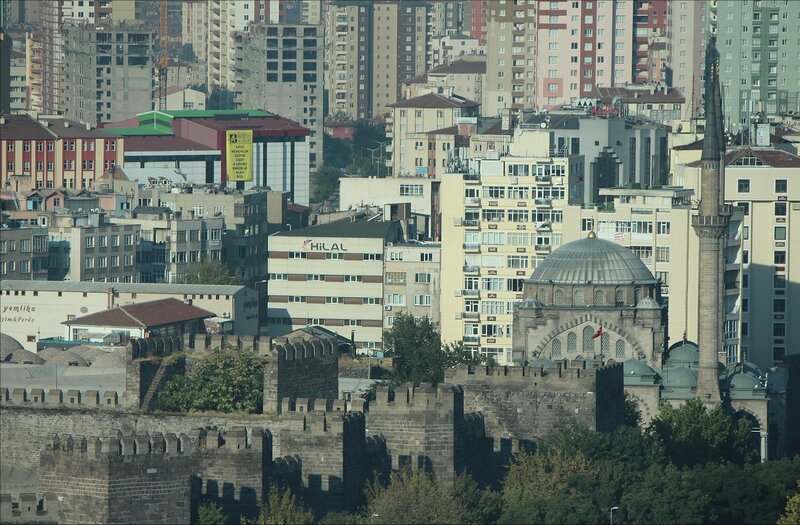 The sight that stood out from my hotel window was the citadel (Kayseri İç Kalesi) which is a 13th century fortress undergoing extensive restoration works to turn it into an open air museum. The work has been underway for some time, but a local told me that completion is still three years away. The vision of the architects certainly offers some hope that the end result will be rather special. Right now, it’s completely closed. 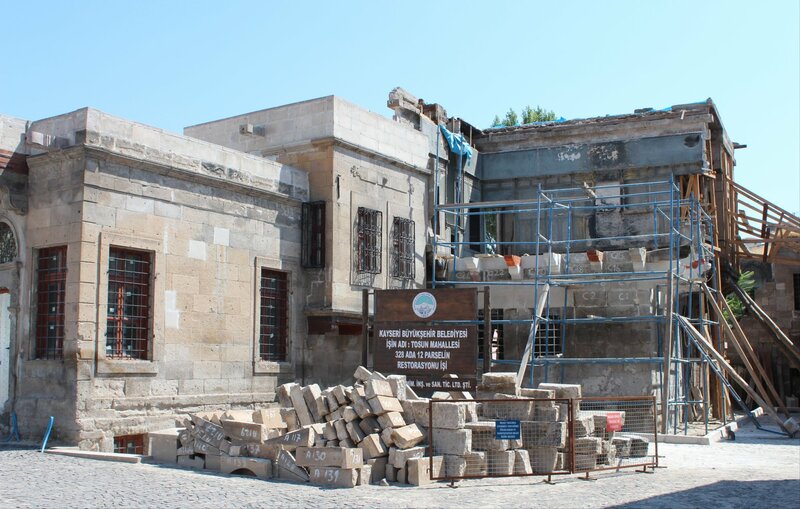 Other sights that turned out to be closed for renovation included the Gürgüpoğlu House (an Ottoman mansion that is usually home to the ethnographic museum), the Ataturk Museum (surrounded by barriers and scaffolding during my stay), the Meryem Ana Kilisesi (an Armenian church that had been converted into a sports centre, now in the process of being converted back into a church) and a few of the historic mosques in the city (such as the Kalaycioğlu Camii). All of this was very encouraging for the future, if a little frustrating for a visitor today. 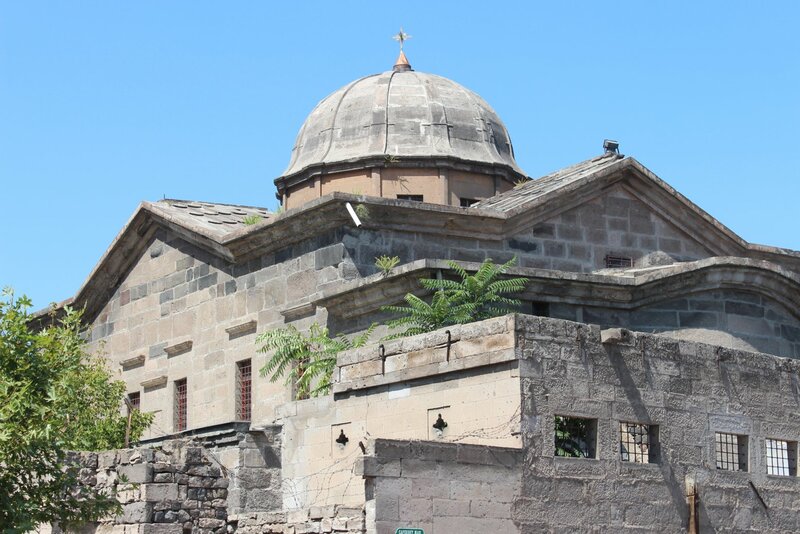 I also sought out the Kayseri Surp Krikor Lusavoriç, an Armenian church a little way out from the centre, which looked like it could do with some locing restoration if the exterior was anything to go by. Sadly, the place was locked up and no-one seemed to be around to let visitors in. In the course of my wanders I also stumbled across a rather lovely district full of older buildings undergoing restoration (including the property below) but as they didn’t appear in any of the print or online tourist guides I read before I visited I was at a loss to work out what I was looking at! 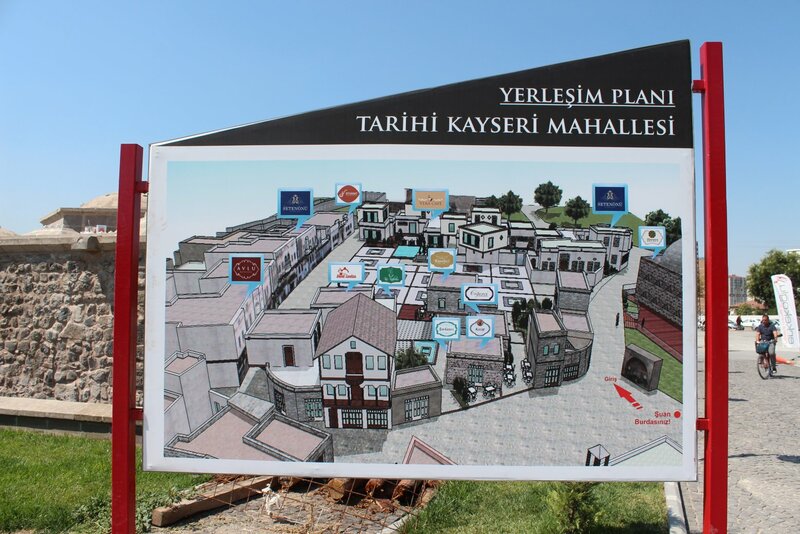 Subsequently I learnt that this was the ‘Kayseri Town Project’ (Kayseri Mahallesi Projesi) which has restored/is restoring a complex of 200-250 year old town houses as boutique hotels and stores, along with a historic mansion and baths. 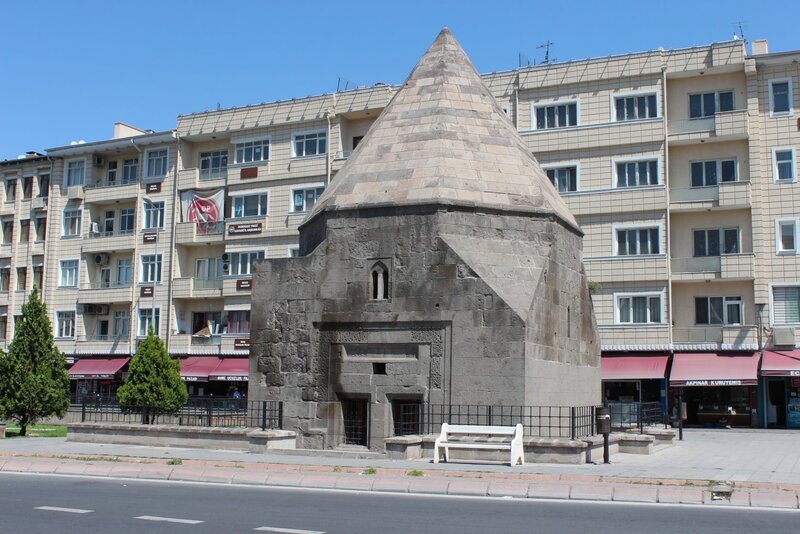 In many cases it was enough to admire the exterior, such as the many tombs in the city centre – of which the Döner Kümbet (revolving tomb) was the highlight. 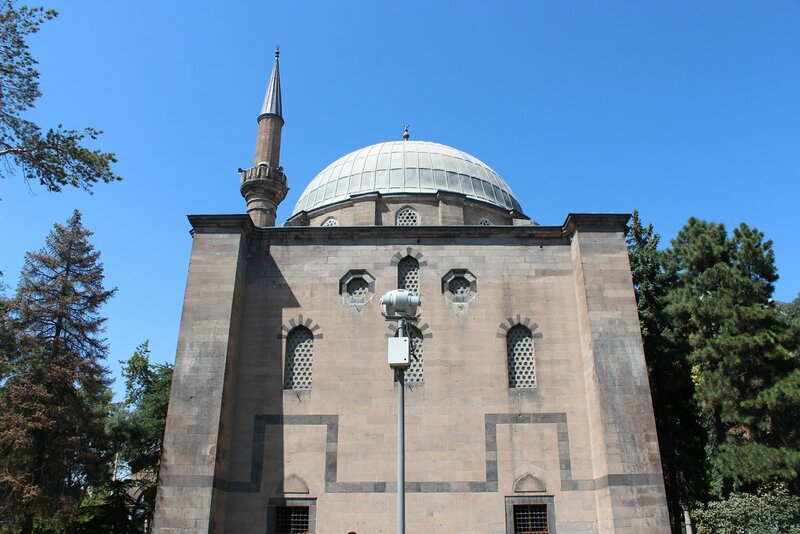 Sights that were open included the rather dull old-fashioned archaeological museum, the Museum of Seljuk Civilisation (in the Çifte Medresse), the Ulu Cami and the Hunad Hatun Külliyesi. 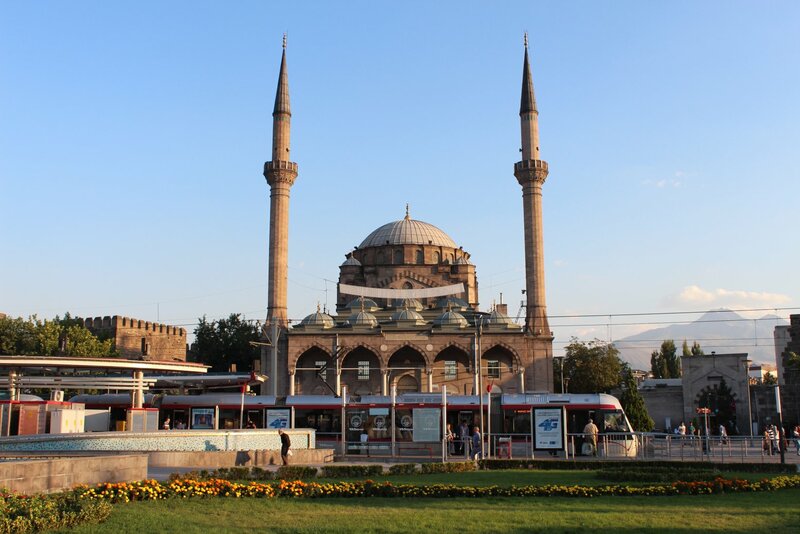 In the evening I took a little stroll and admired some of the monuments and mosques in the centre of the city before retiring for the night, ready for the start of the tour proper tomorrow. 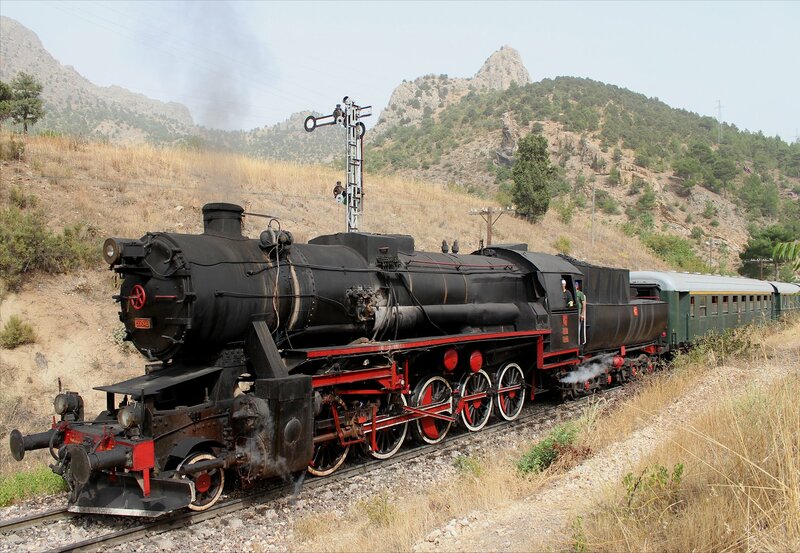 It’s time to make good my escape from the UK for a short while and head back to Turkey for another week chasing steam. 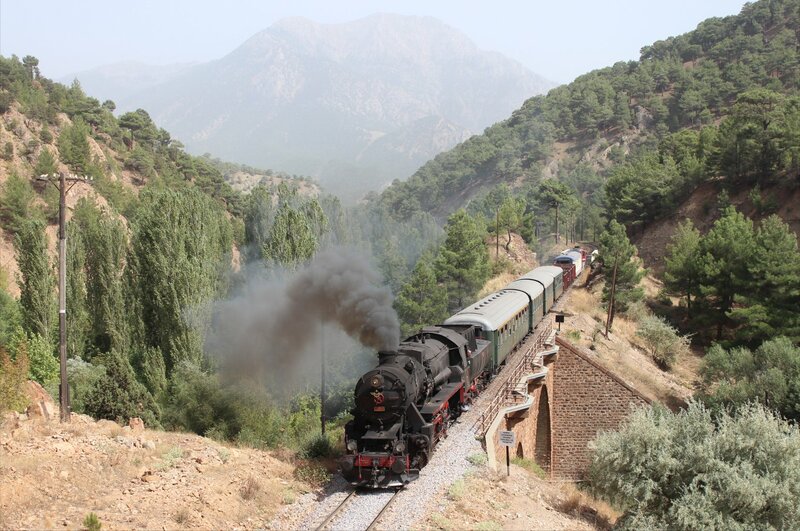 On this occasion I will be pursuing kriegslok 56548 (ex DR 52 7429) across the Taurus mountains on a section of the old Baghdad Railway. 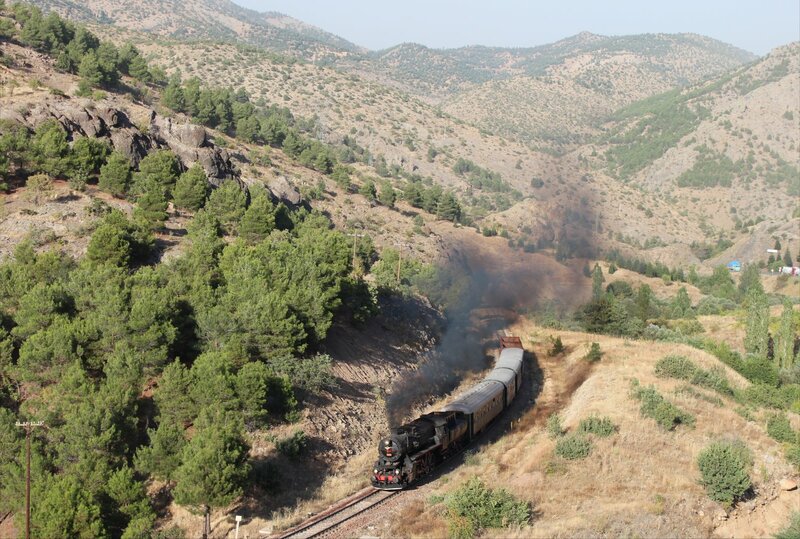 The Taurus mountains, with their three and a half thousand metre peaks, were a formidable obstacle for the railway engineers at the start of the twentieth century. 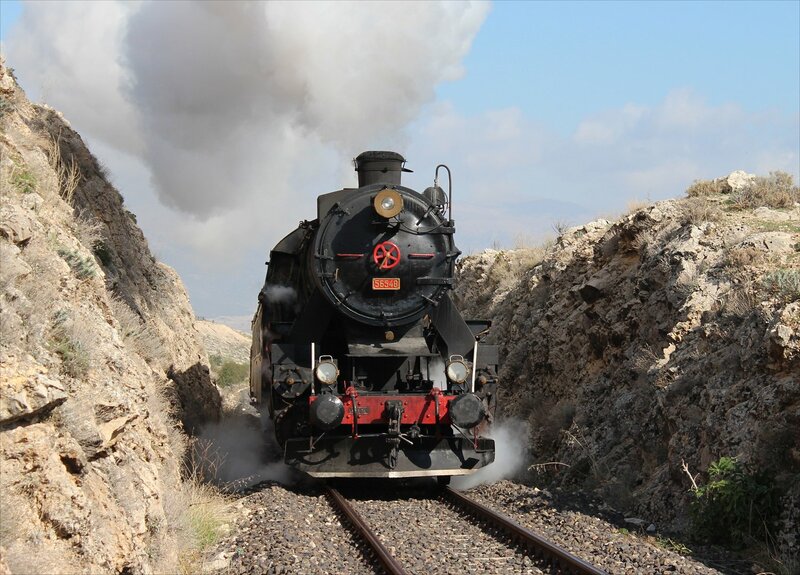 However, the urgent demands of war made the completion of the line a necessity. 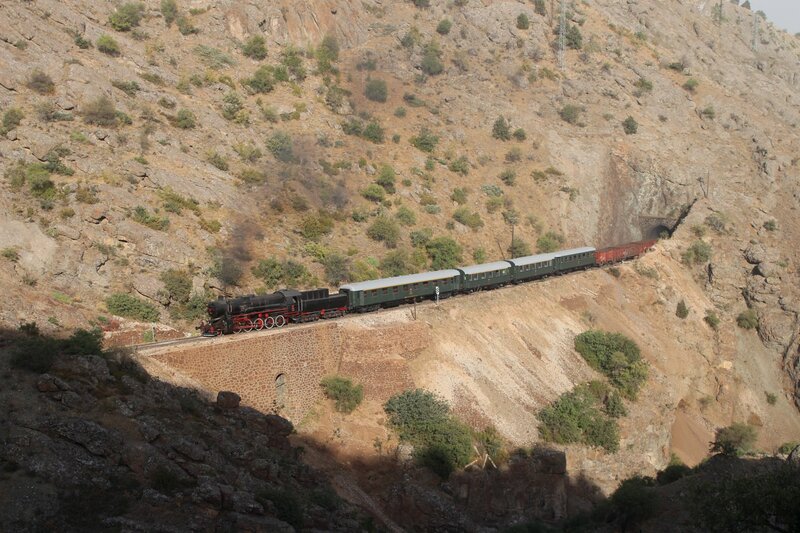 Work on the tunnels was only fully completed in 1918, a few days before the Armistice of Mudros. 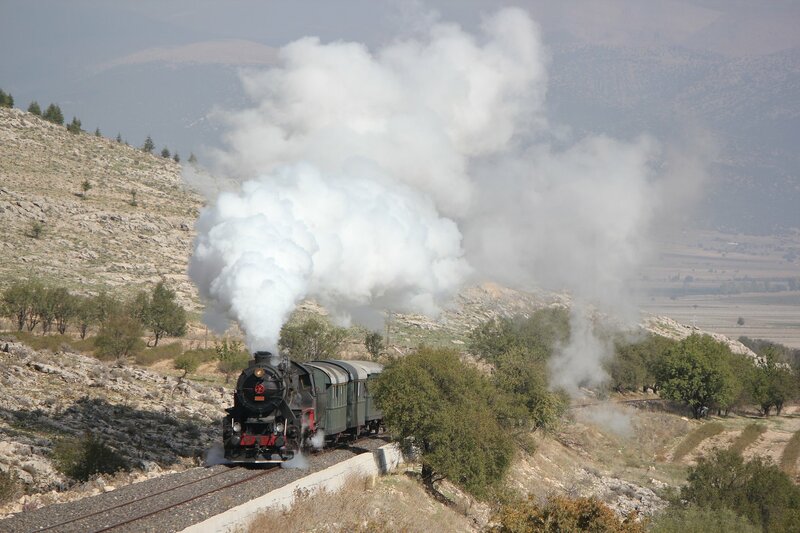 Our tour represents the last opportunity to see steam in the mountains before the electrification of the line is completed in 2016. 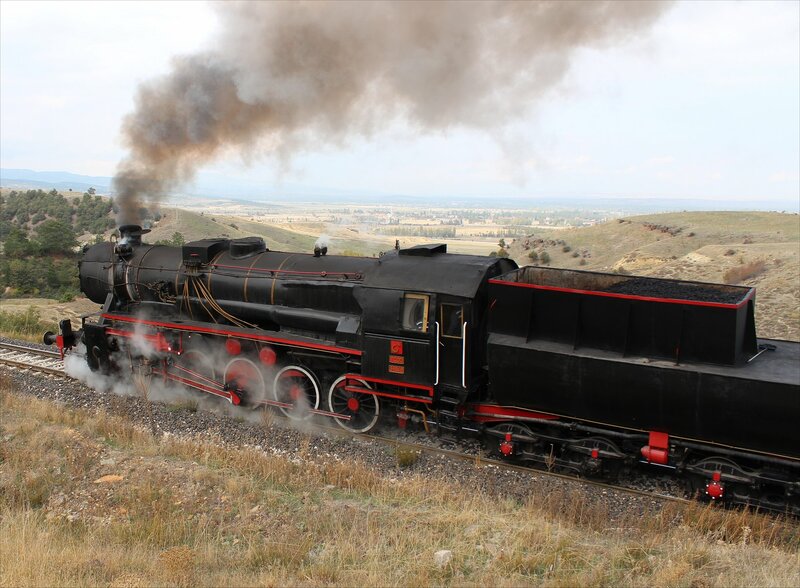 The meeting point for our group is in Kayseri, though the tour proper does not commence until we join our steam photo-charter at Yeşilhisar on Sunday. 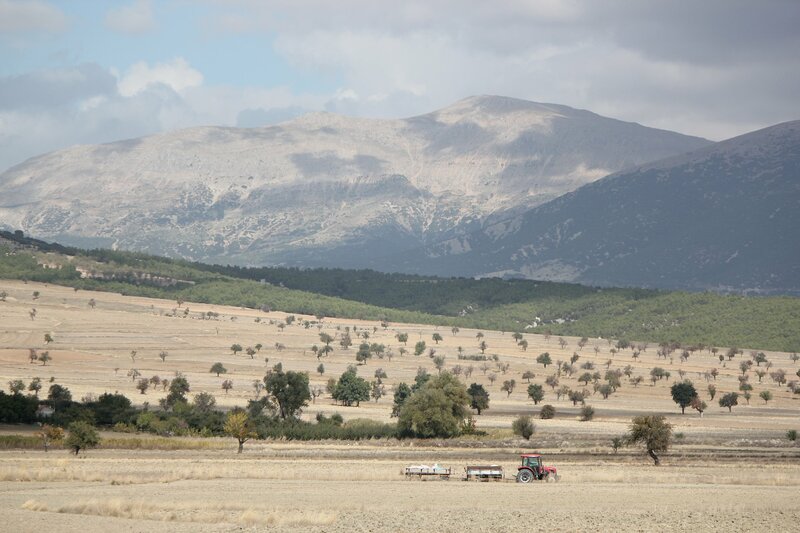 From there we head south to our base at Çiftehan where we will spend a few days in the mountains before making our own way home. 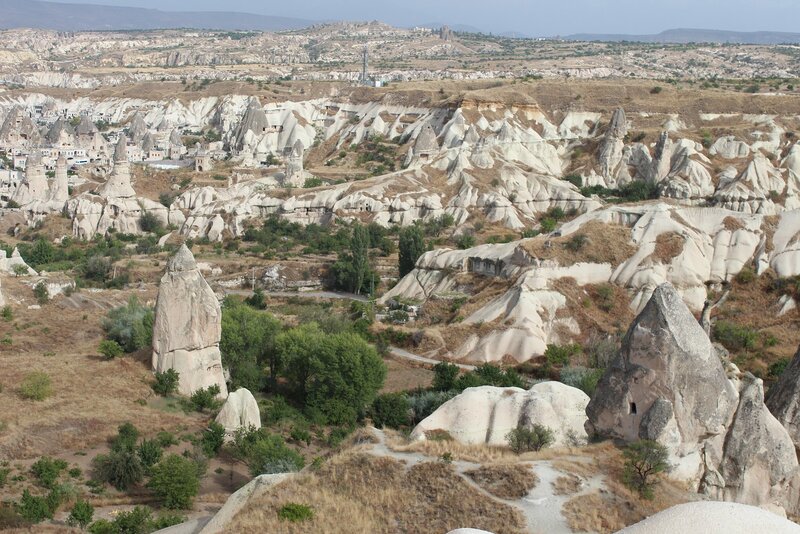 In my case, I will be returning to Kayseri via Cappadocia. 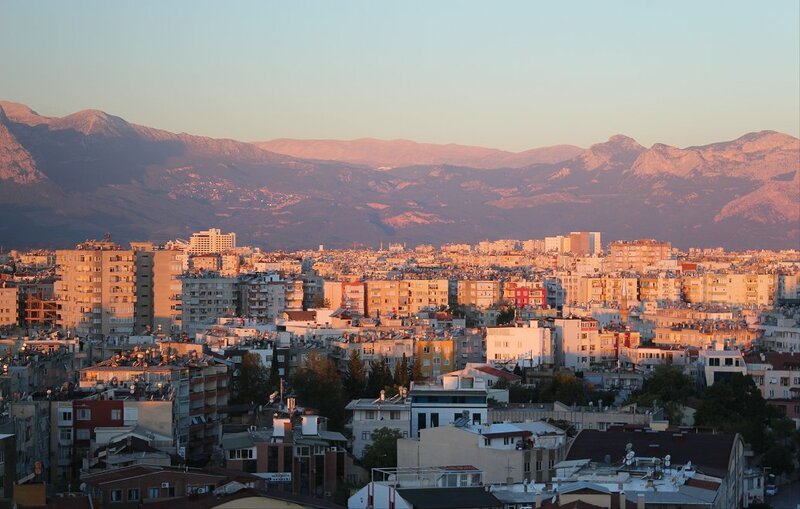 An impressive sunrise over Antalya greeted me on waking, providing a stunning final vista ahead of my homeward journey. The taxi rank outside the hotel was deserted so I wandered around the neighbourhood hoping to find a taxi, luckily finding one parked up in a side street. The driver started bargaining me down in price before I had barely uttered a word, which made a pleasant but somewhat odd change! 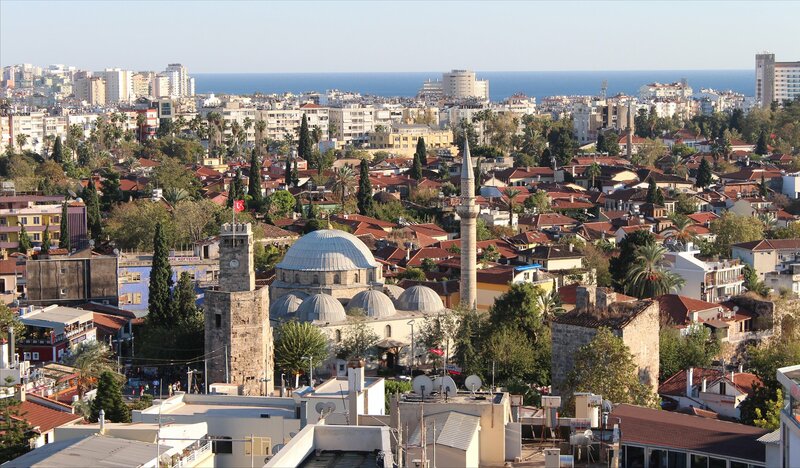 The domestic flight from Antalya to Istanbul was perfectly smooth and Turkish Airlines once again served up surprisingly good fare for such a short flight. After landing in Istanbul I had half an hour to clear Passport control and security, making it to the gate bang on the scheduled boarding time. Time to take my seat on the Turkish Airlines 737-900ER that would get me home. 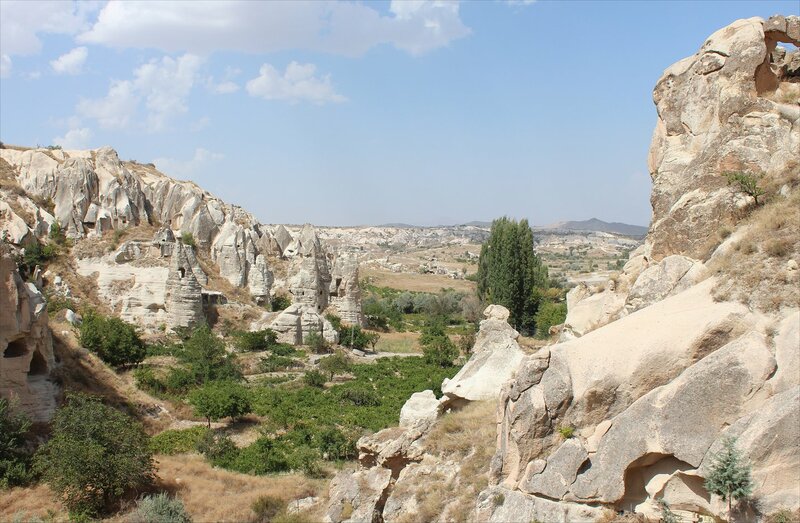 I have to admit that my trip to Turkey has challenged many of the preconceptions I held, in much the same way that my first trip to China helped me to see how limited my understanding of the country really was. As ever, nothing is quite as simple as you imagine it to be! 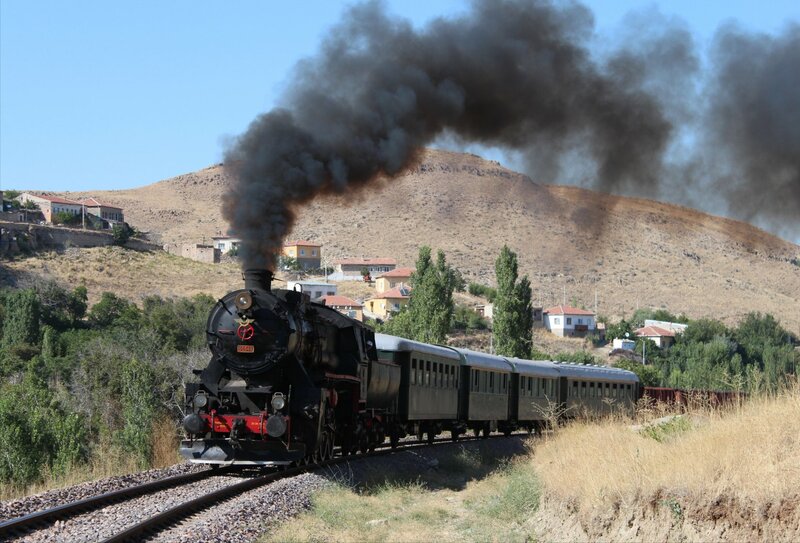 I have been really impressed by the transport system in Turkey, the friendliness of the people, the stunning historic sights and the beauty of the countryside. 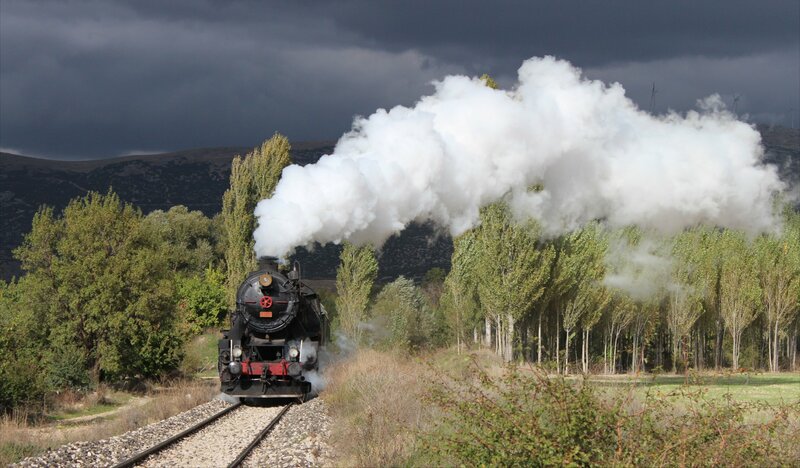 I hadn’t really ever expected to visit Turkey and probably would never have the trip had it not been for the lure of a steam photo-charter, but I am mightily glad that I did. At the start of the trip I was sure that it would be my only trip to the country, but now I am thinking that it won’t be long at all before I am back. Roll on the next adventure! 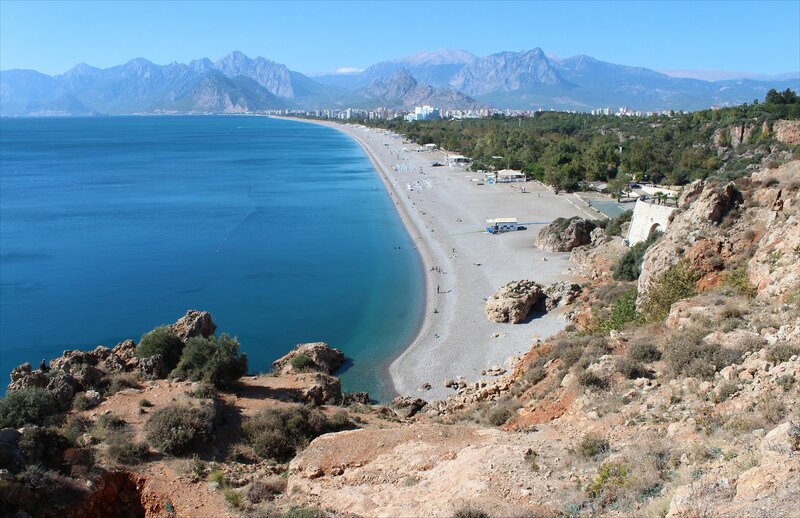 It was a pleasure to wind down today after the tour, heading out into Antalya for a leisurely wander around the main tourist sights. The blue skies, sun and steadily climbing temperature all combined to give sufficient discouragement from any thought of tackling the city at anything more than a relaxed, chilled pace! 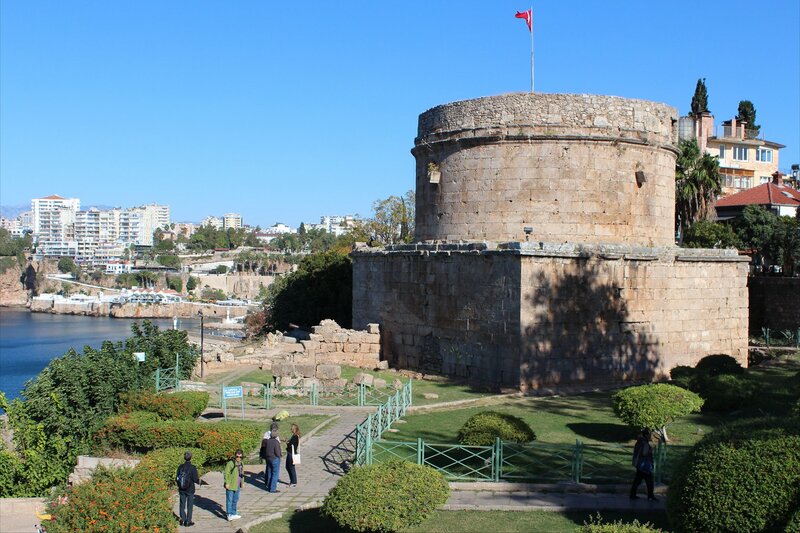 My walk began at the Clock Tower and took in Hadrian’s Gate, the Hirdirlik Tower (a Roman mausoleum), the marina, Yivli minaret and Cumhuriyet Square. I ended the walk with a wander through the bazaars, trying to avoid falling into the clutches of the enthusiastic shop owners! 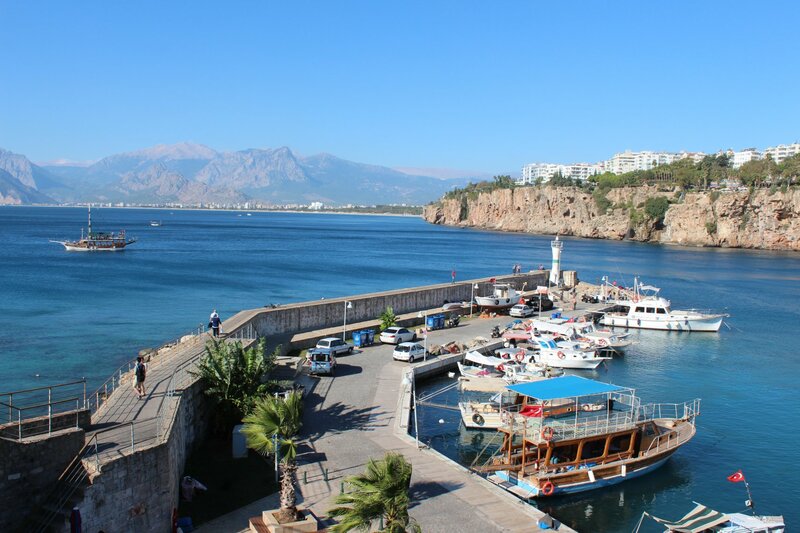 Antalya struck me as a fascinating place – a city steeped in culture, history and religion but providing an equally strong draw to a beach-going and partying crowd. 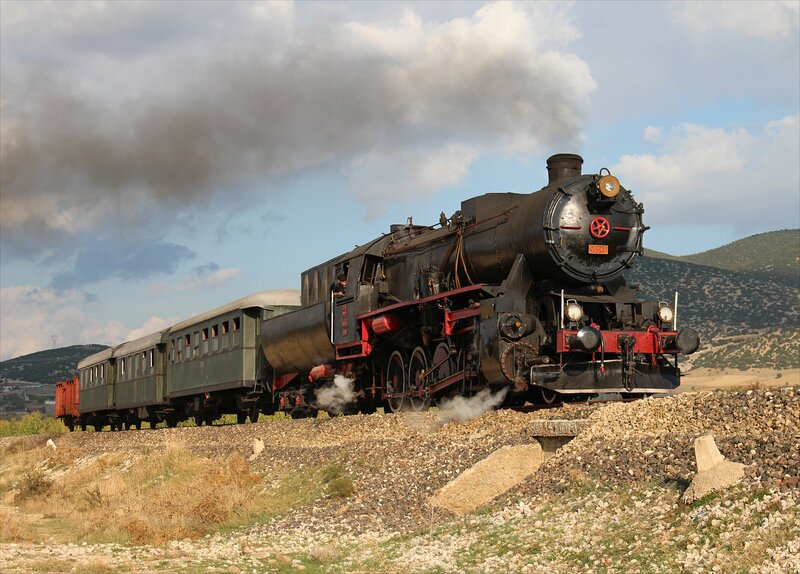 In all probability I would never have visited the city if it had not been for the steam tour and that would have been a pity. 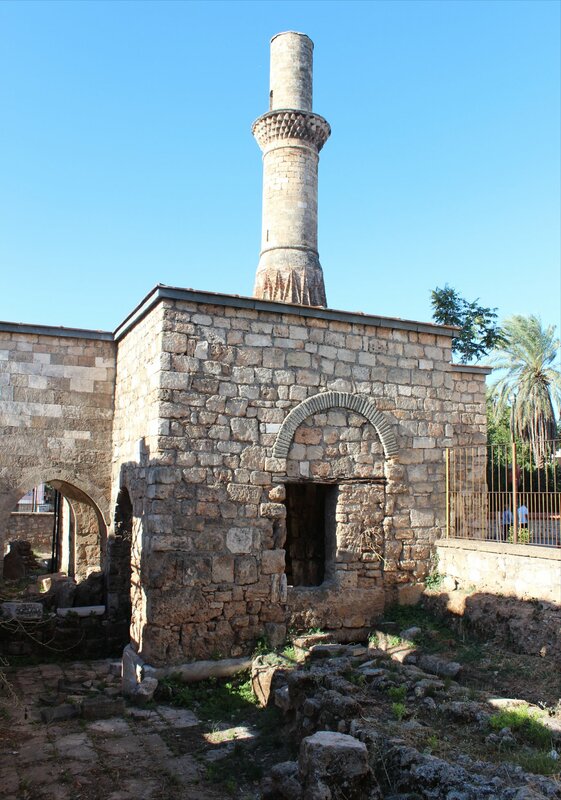 Along the way I came across the fascinating remains of the Korkut (Kesik Minare) Cami which makes a striking sight with its truncated minaret. 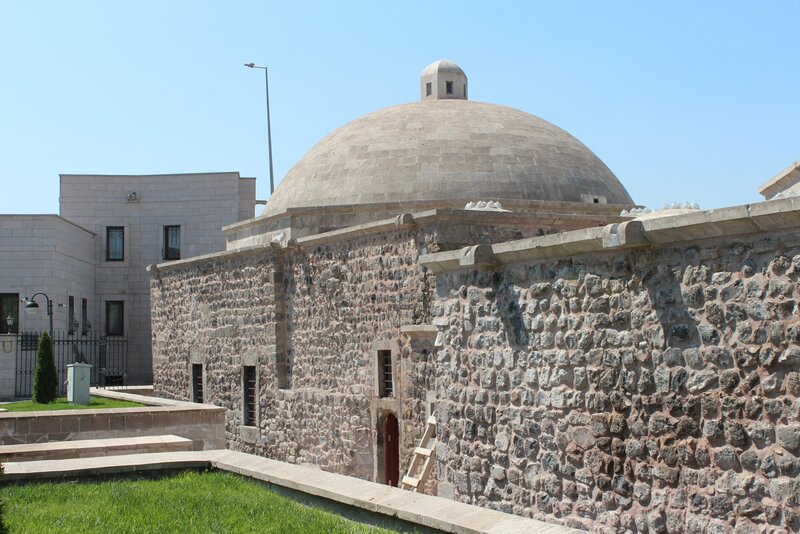 The building was originally constructed as a Byzantine church in the 5th-6th century, standing on the foundations of a 2nd century Roman temple. 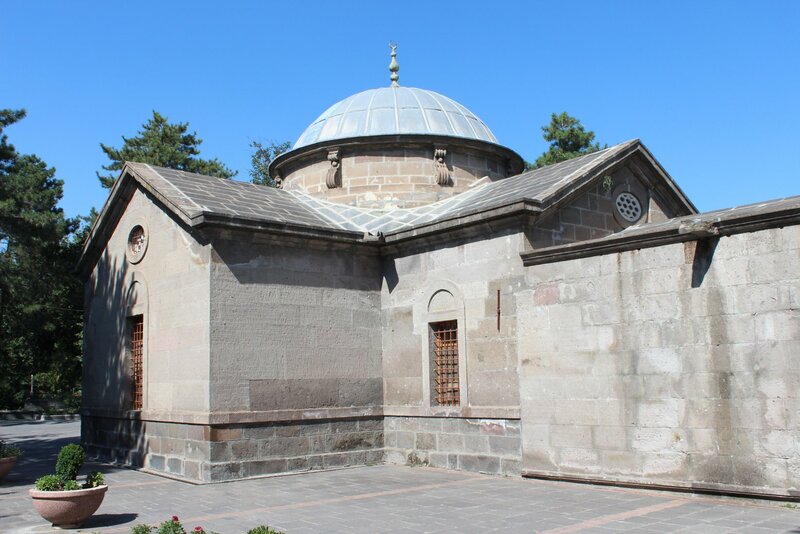 However, it was subsequently converted to a mosque, back into a church, then into a mosque again. 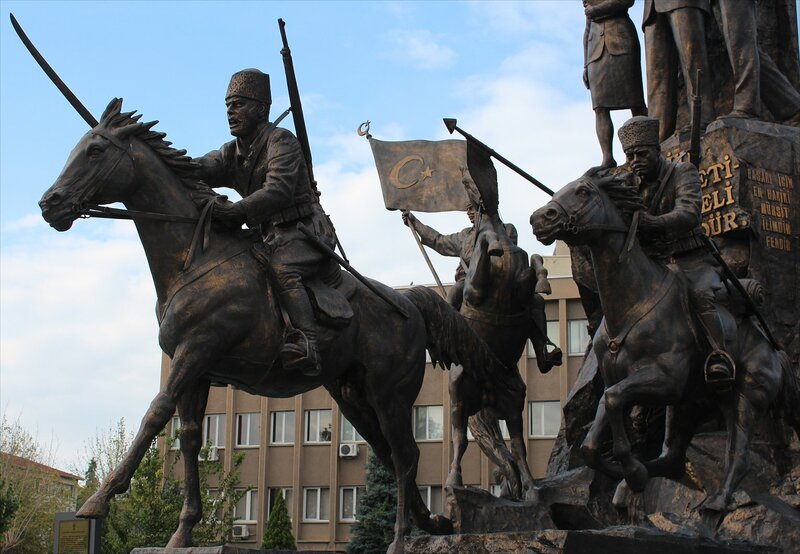 Quite an astonishing history that gives some idea of the shifting powers in the region. 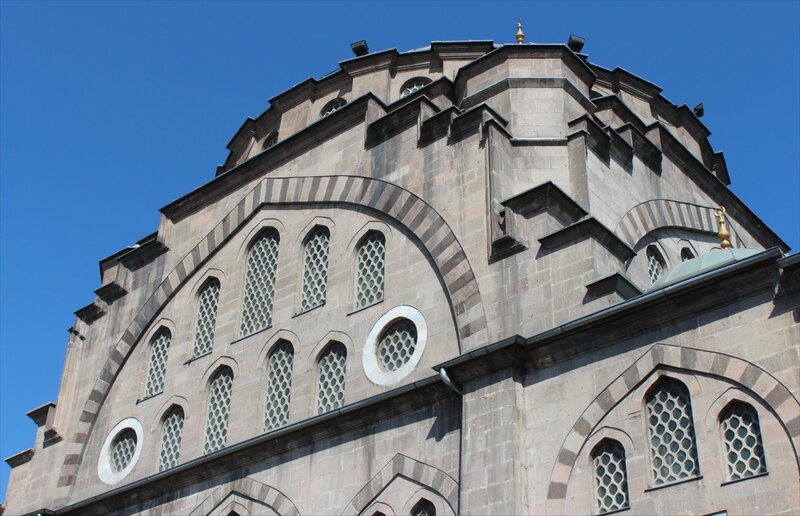 It continued to be used as a place of worship until 1896, when it was badly damaged by fire. 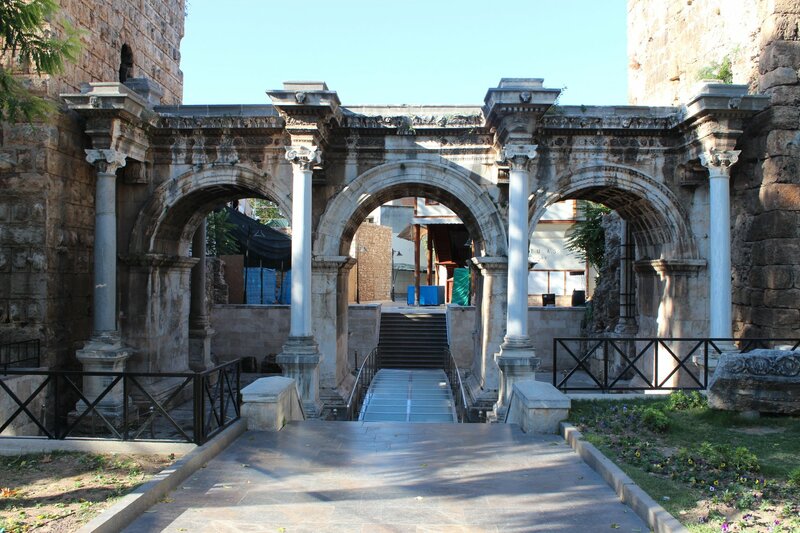 After completing my walk I decided to walk out to Antalya Archaeological Museum. I am ashamed to say that I had my doubts about making the trip, but the array of exhibits was quite astonishing and all superbly displayed. 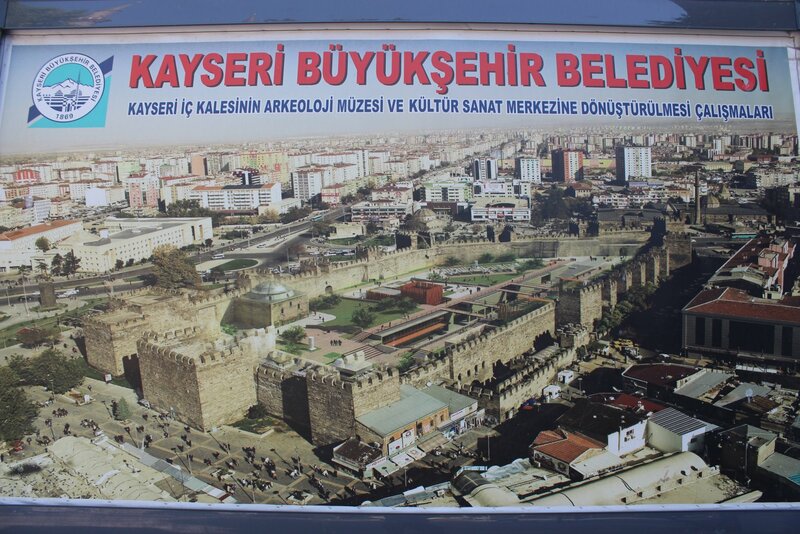 It made quite a contrast to the dusty archaeological museum in Istanbul which had proven to be such a disappointment. 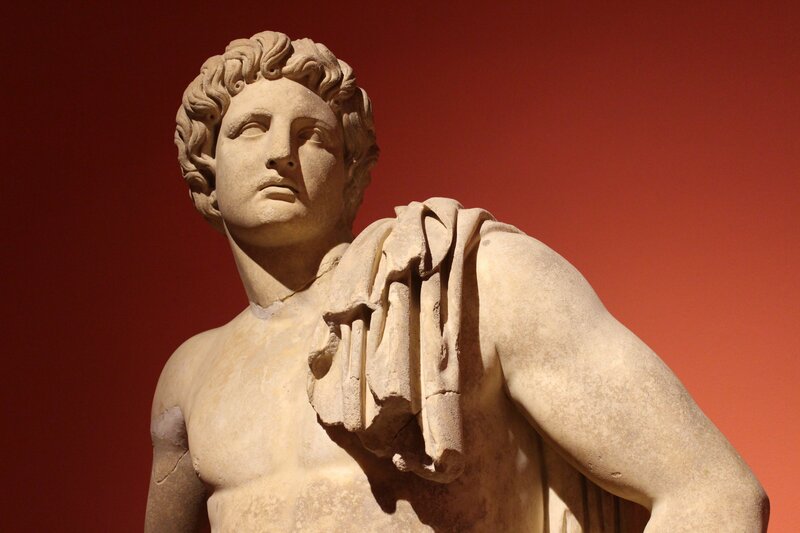 The panels in the museum made fascinating reading – from the tales of the recovery of illegally exported treasures to the remarkable sites discovered in the region. 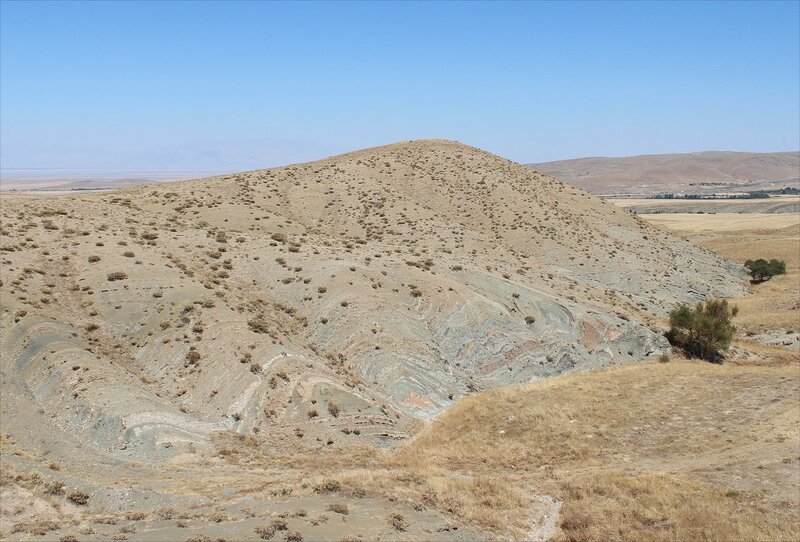 If the finds looked stunning in this setting, how much more incredible they must have looked in situ to their discoverers. On my return to sunlight, after a few hours inside, I headed down to Konyalti beach and chilled out properly for a little while before heading back into the city centre. It felt like the perfect way to end the trip, though I still couldn’t resist taking one or two photographs looking out to the beautifully blue waters and the mountains beyond. 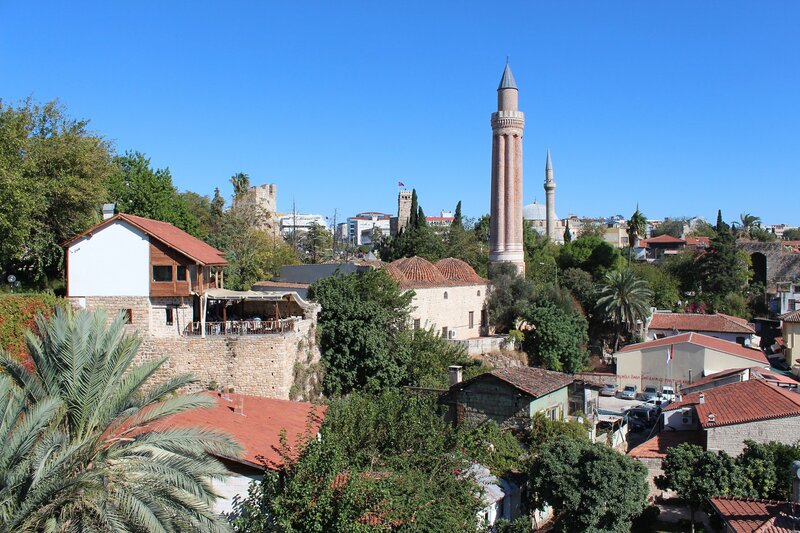 As evening fell I found a peaceful haven at Restaurant Hasanaga, located within a restored Ottoman house in the old town. The friendly waiters served up a superb meal, a sizzling Ottoman beef stew served in the pan, whilst the cats wandering around the tables were a delightful bonus. A really lovely and unexpected find. I returned to my hotel well fed and watered, ready for my homeward journey tomorrow. 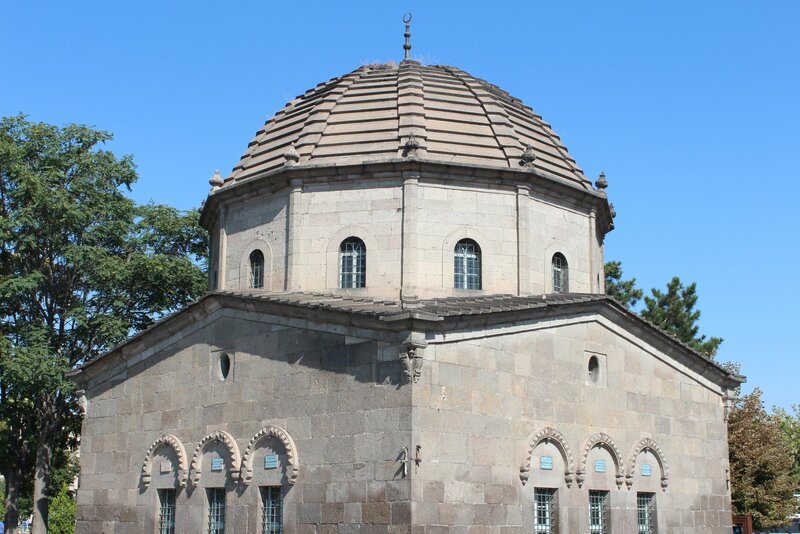 We left the all too familiar surroundings of Gümüşgün just after 1pm, bound once again for Karakuyu (our third visit during the tour). 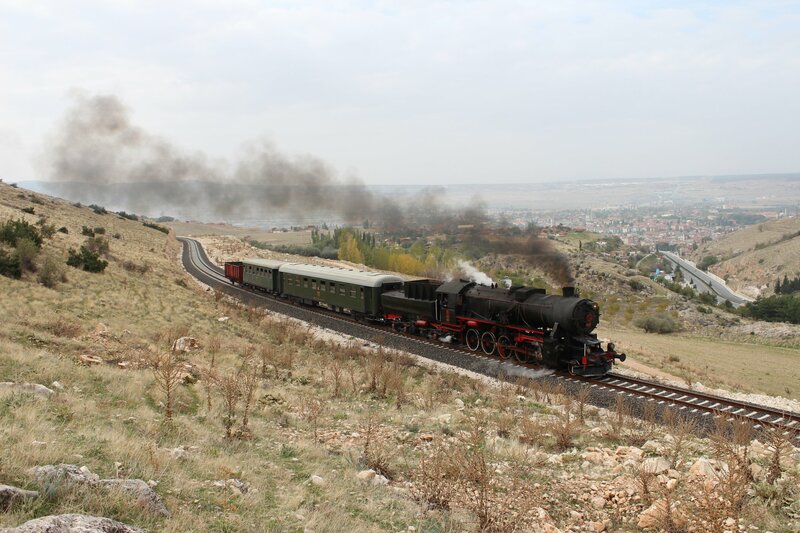 On this occasion we were following a freight train rather than delaying one. 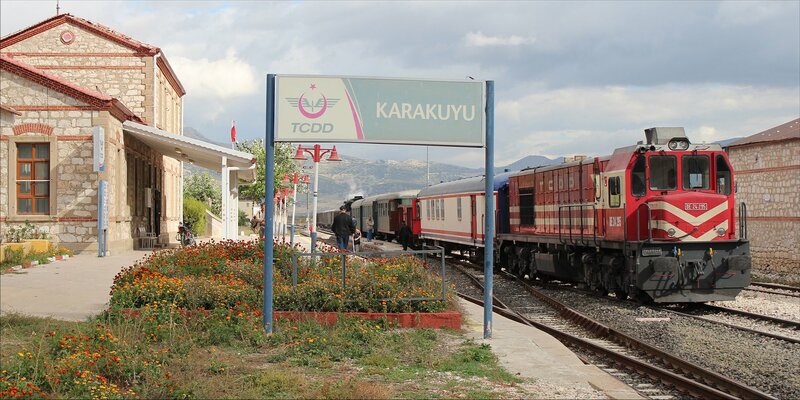 At our next stop, Keçiborlu, we had to wait twenty minutes for the freight train ahead of us to reach Karakuyu and clear the section before we could proceed. 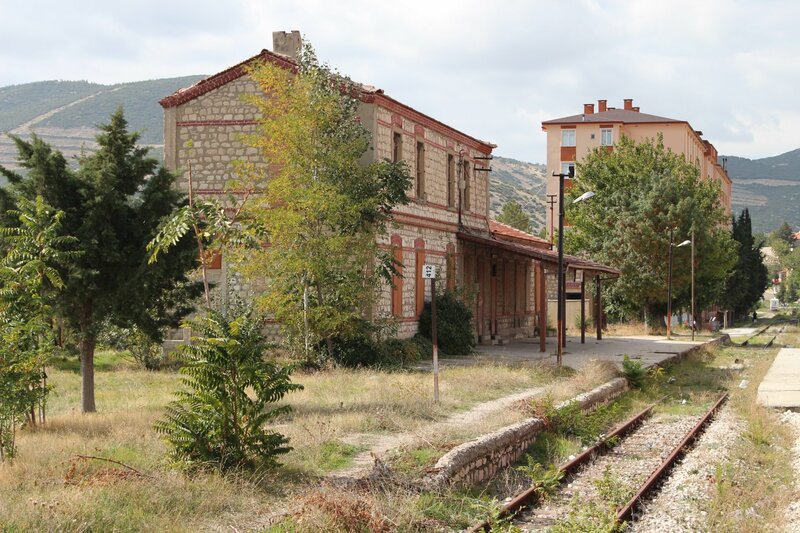 The stop provided a good opportunity to wander and explore the surroundings of the station. 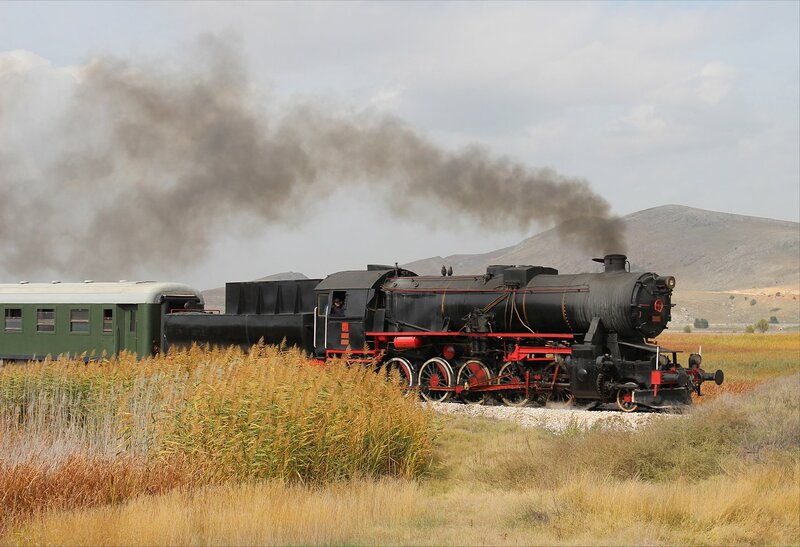 It wasn’t too long before some local lads turned up to watch our steam locomotive, albeit being dragged backwards by a diesel! On the run to Karakuyu we had the opportunity to try a few runpasts with some trees offering a wonderful display of autumnal gold, though the morning’s blue skies and guarantee of sun were now long gone. 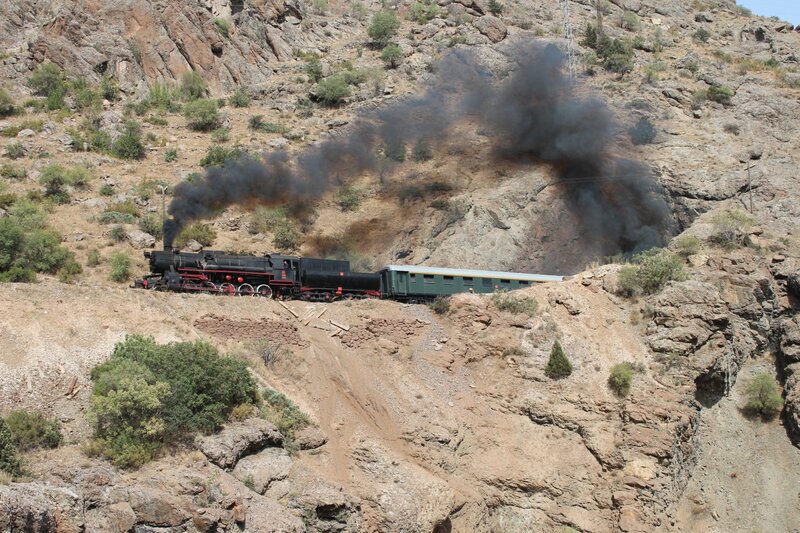 The sun co-operated just long enough to give us the shots we wanted and we re-boarded for the run through to Karakuyu, passing the wildly overgrown remains of Capali at 2.42pm, before reaching our destination ten minutes later. 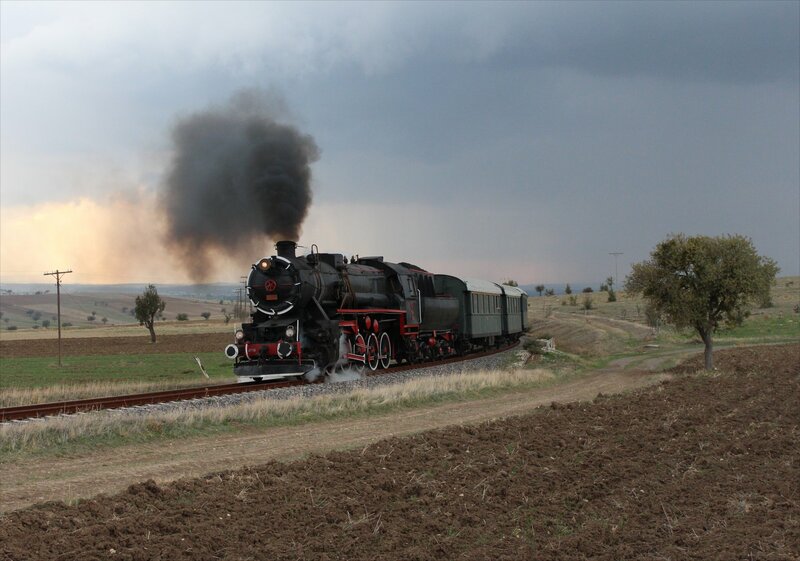 The weather was clearly on the turn now, with black clouds in the distance threatening much worse conditions. 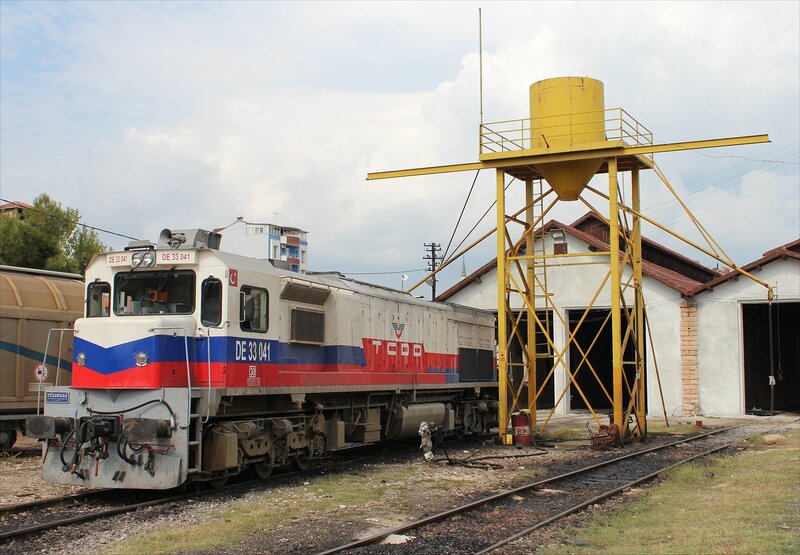 We spent barely half an hour at Karakuyu, noting the presence of DE 36 005 dropping ballast, before heading back. 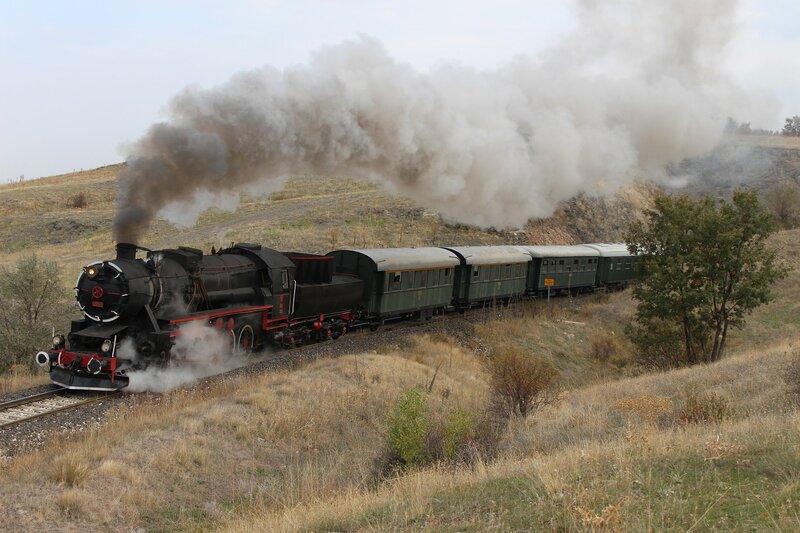 In the short time we had spent in the station our diesel had been re-positioned to the middle of the consist which must have looked rather odd to any onlooker but suited our needs. 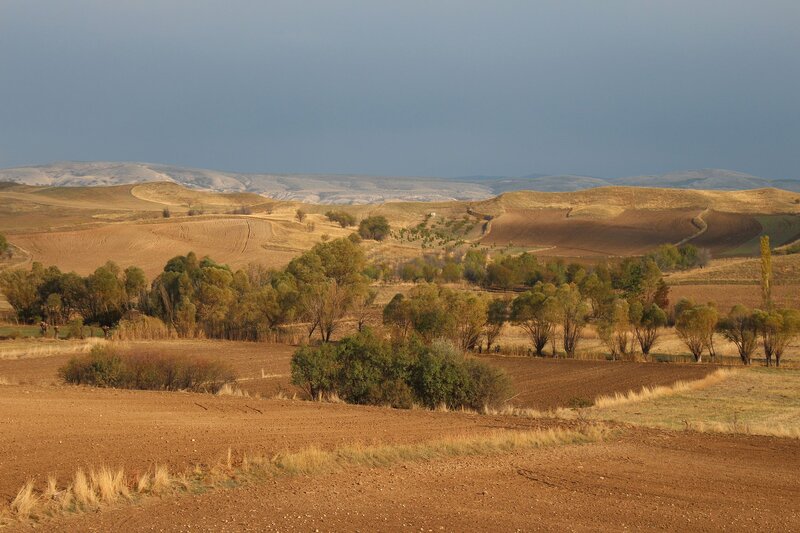 At 3.45pm we stopped at a rural location complete with concrete irrigation canals and beautifully sunlit trees against a rapidly darkening sky. The rain was almost upon us, but we just managed to squeak the runpast in with the very last of the sun’s rays after some particularly speedy work by our tour organiser. Much credit needs to go to the crew for this shot – it had been the plan to hold a barbeque at Karakuyu but they had been reluctantly persuaded to carry on a little longer whilst we still had the sun, despite their initial pleas that they were so hungry that they couldn’t work any more. Thank you all for delivering a superb photographic opportunity! We reached the notorious 401km marker (the scene of yesterday’s long picnic) at 4pm, with the rain just moments away. It turned out to be the perfect spot for another firebox barbeque and we were pleased not to be on the lineside when the rain started hammering down. 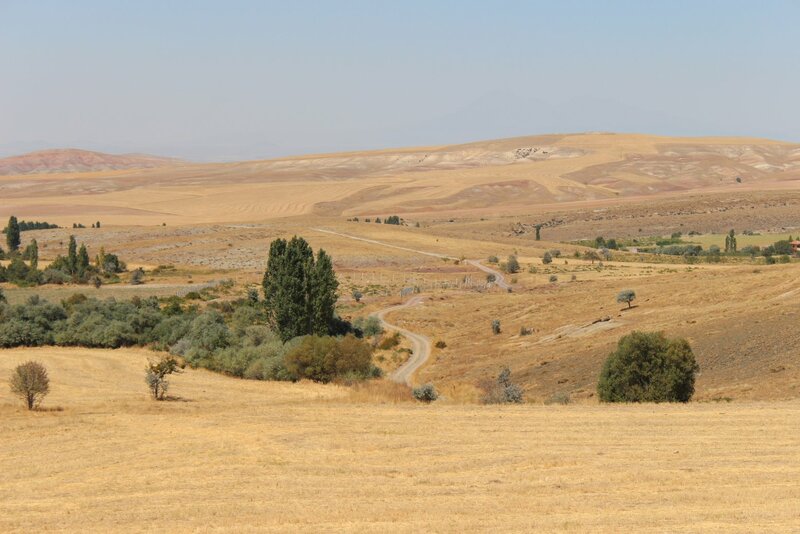 After an hour at this location we set off again on our return journey to Isparta. 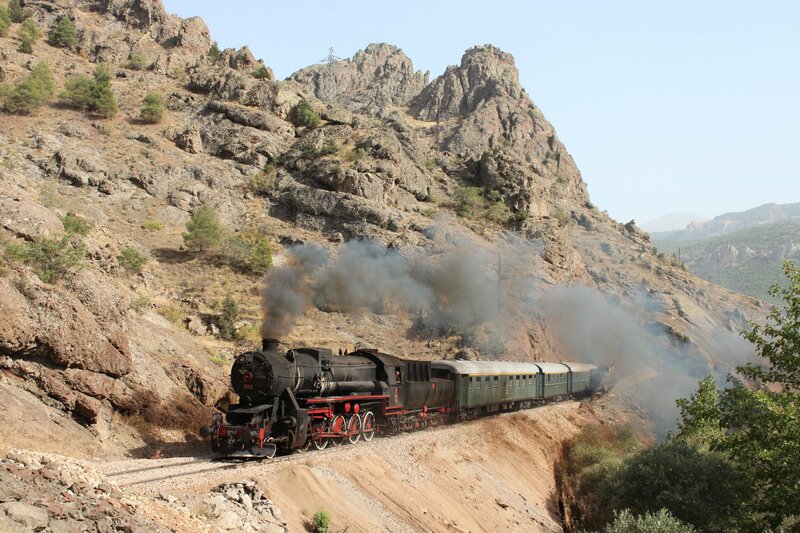 On the return journey the remaining stations were reeled off in quick succession with only brief stops at Bozanonu and the hillside just beyond to delay us. 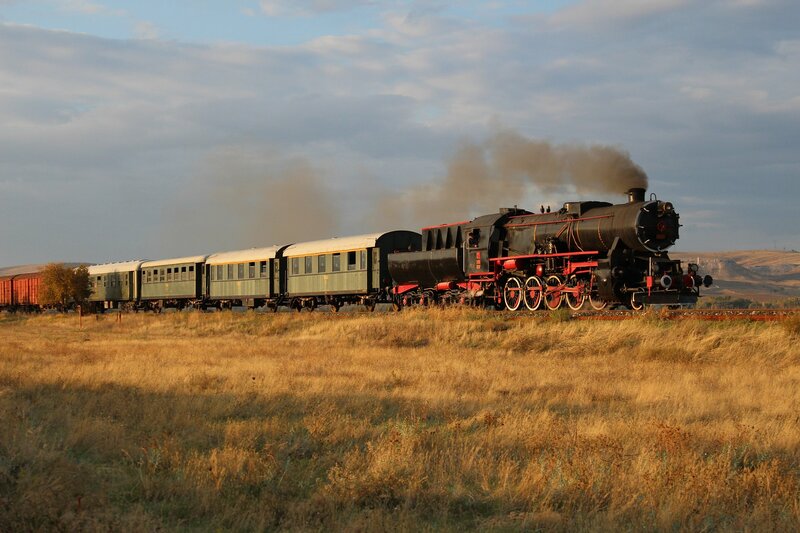 By this point the tour felt like it was on its last legs with just eight photographers left from the original party to clamber out for a last runpast (our one day trippers were sensibly settled inside the carriage and weren’t about to move for a photo in the fading light). 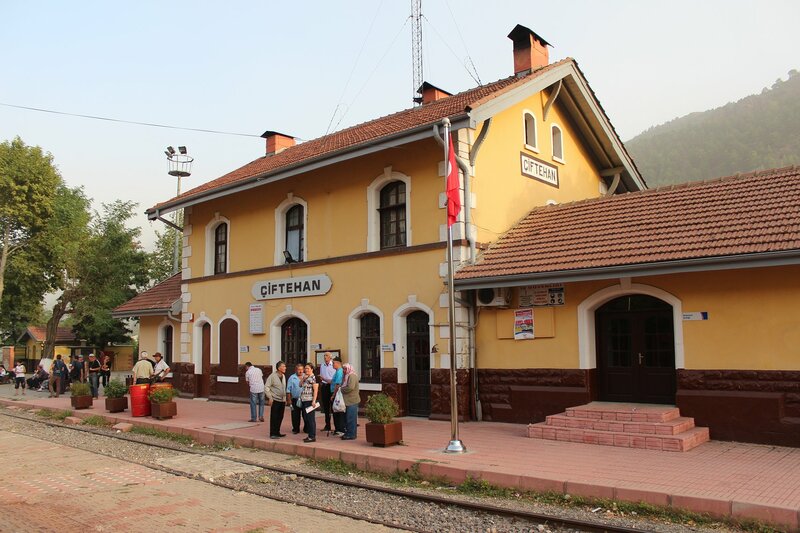 We finally made it back into Isparta at 6.48pm. 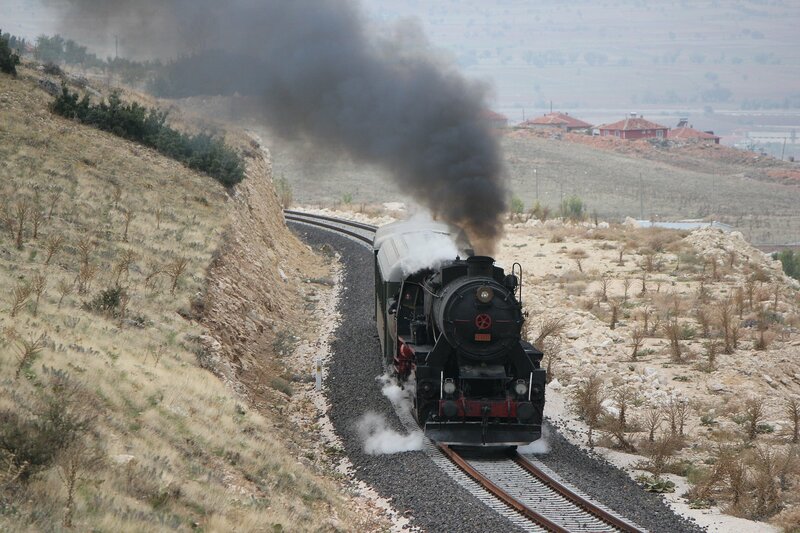 Our arrival at Isparta signalled the end of my travels by steam through Turkey. 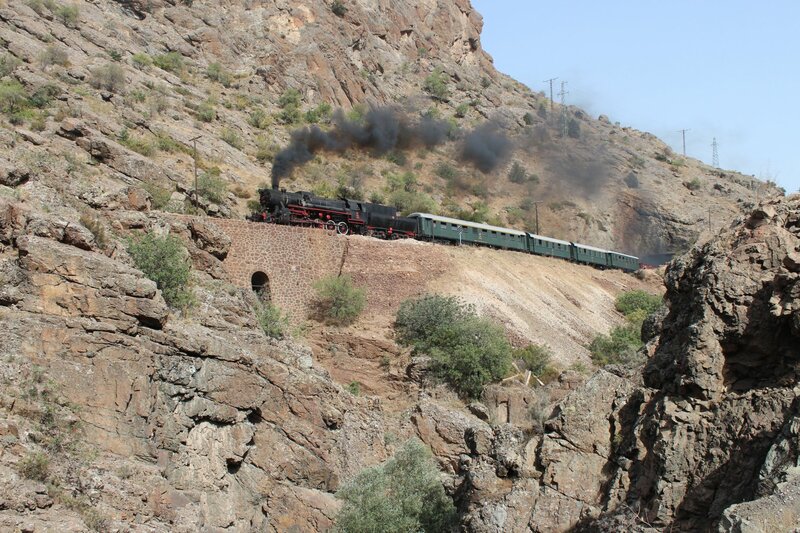 I made some hurried farewells and jumped in a taxi for the short drive across town to the Otogar (coach station). 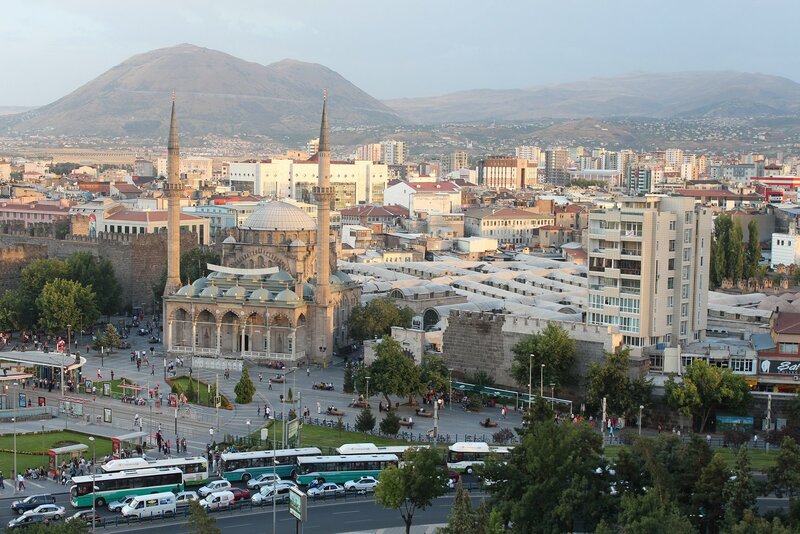 My hopes for a speedy departure to Antalya were soon dashed – the next coach was not due to leave until 8pm, giving me an hour to grab some food and kill time looking around the astonishing number of rose-product shops around the terminal. 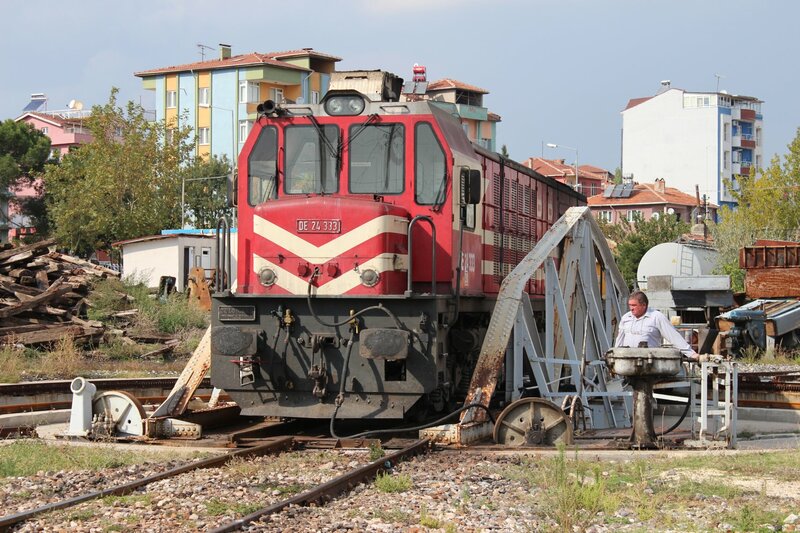 The domestic transport networks of Turkey are quite fascinating and unlike anything I have seen anywhere else – frequent connections can be made across the country by coach and plane, depending on whether speed us of the essence. 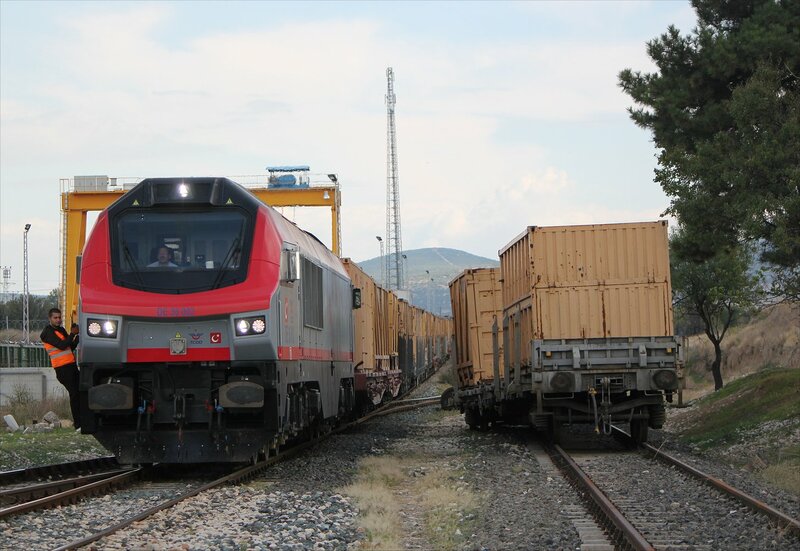 It is not difficult to see why it has been difficult for Turkish Railways to compete with their current set up, but with high speed rail there is the chance of carving out a market. 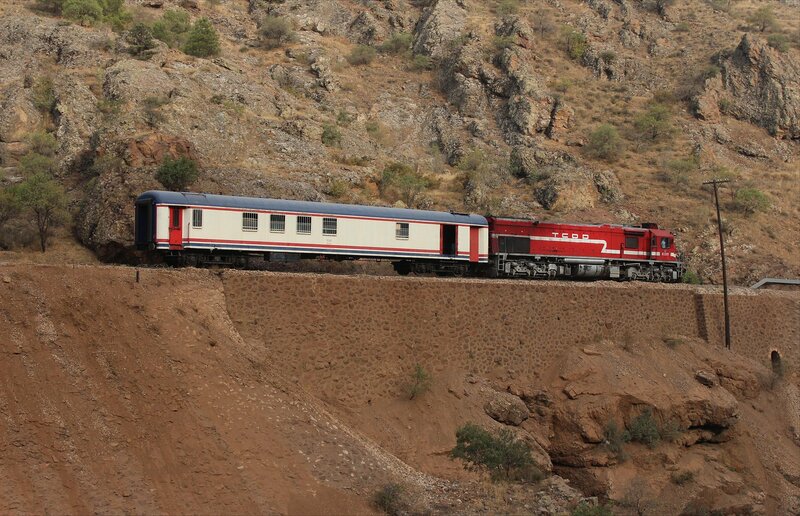 It remains to be seen what effect this will have on the rather excellent domestic transport options and the existing sleeper trains in the country, both of which make this an easy country to get around. 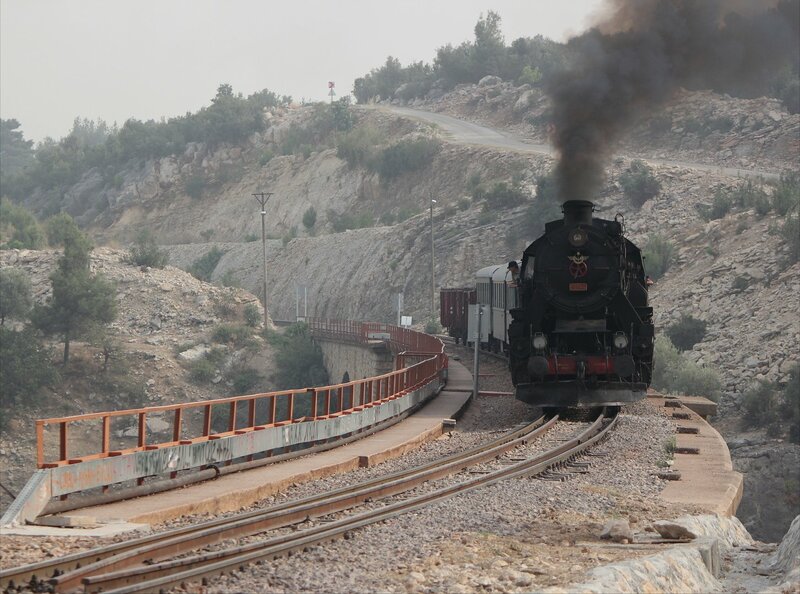 The journey south to Antalya took two hours and fifteen minutes, followed by a short tram ride from the Otogar to the old town. I checked in to my hotel at 11pm and collapsed in my ridiculously over-sized room. Time to sleep well! 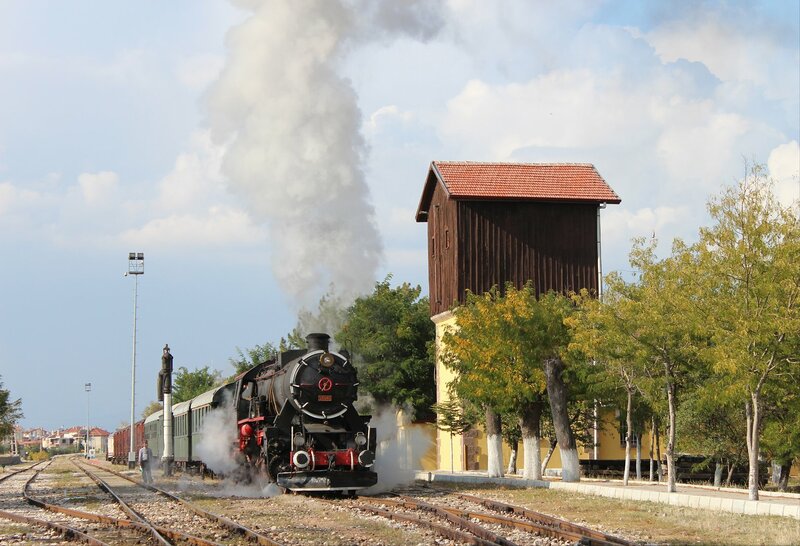 It was not without a little trepidation that I wheeled my suitcase down to the station in Isparta this morning, but I needn’t have worried – our steam locomotive was in the platform looking resplendent in the morning light. Better still, the air pump was working! A little chat before the start of the day’s adventures gave us the explanation for this impressive change. 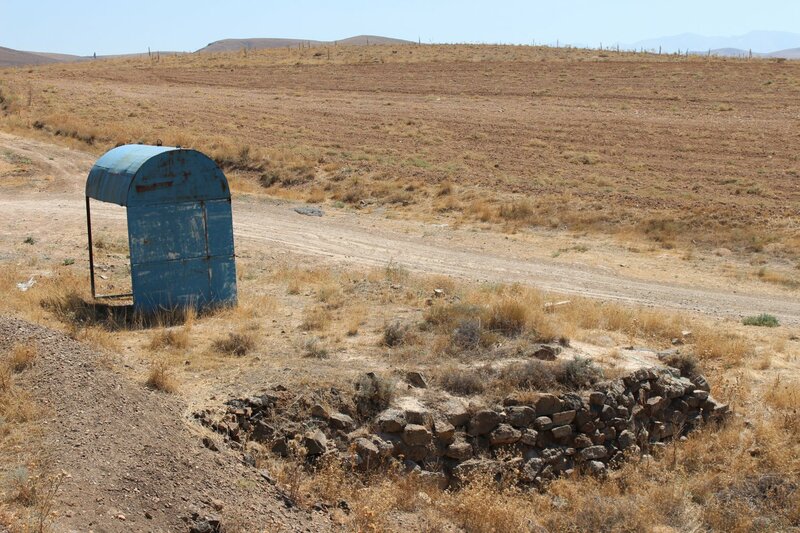 It transpired that the two air pumps were not identical, so the exchange in Dinar had not been quite as straightforward as had been expected. 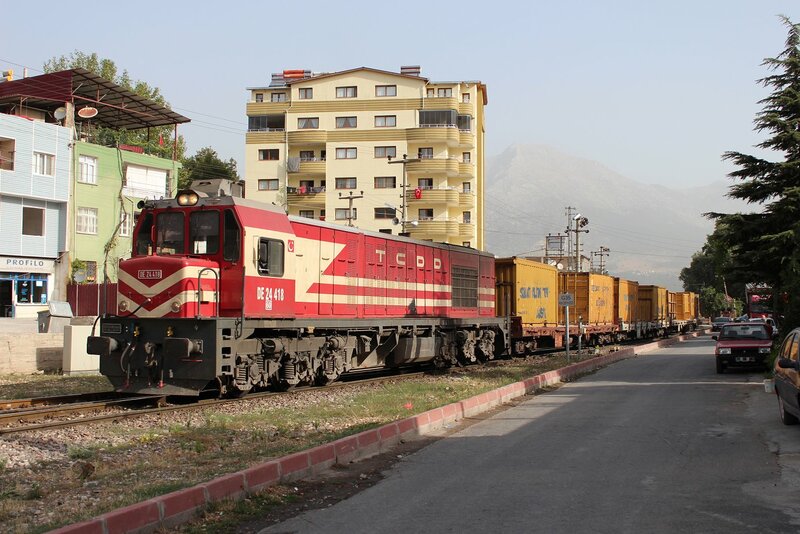 The replacement from Uşak needed some extra work when we made it to Isparta but was working properly late last night. I was comforted by this reassuring news, which I hoped would put us in good stead for the day ahead of us. As this was an extra day, after the official end of the tour, the numbers of photographers had thinned rather dramatically. 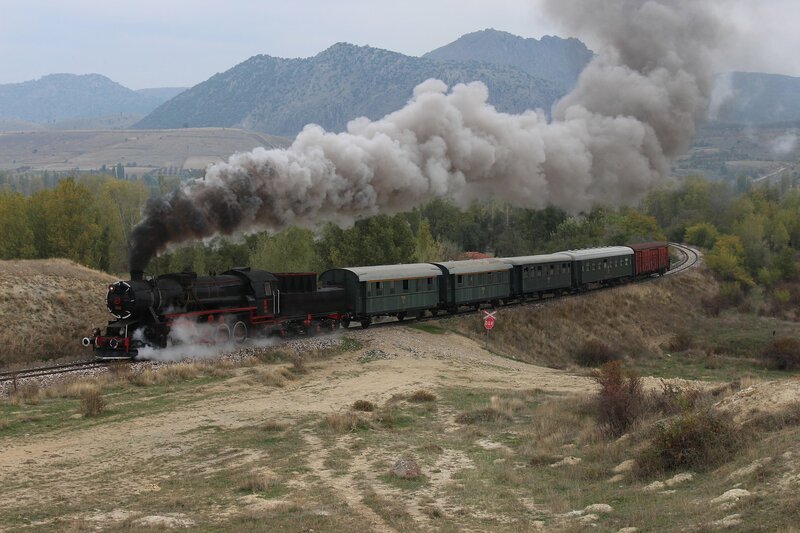 However, one of our fellow photographers had brought a coach full of friends so we didn’t find ourselves rattling around empty coaches for very long. 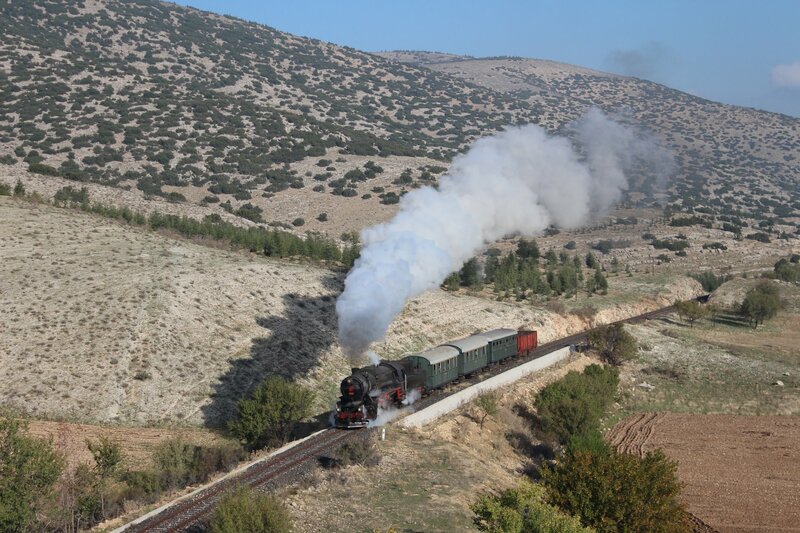 At 8.25am we set off up the branch line hauled by our trusty diesel. 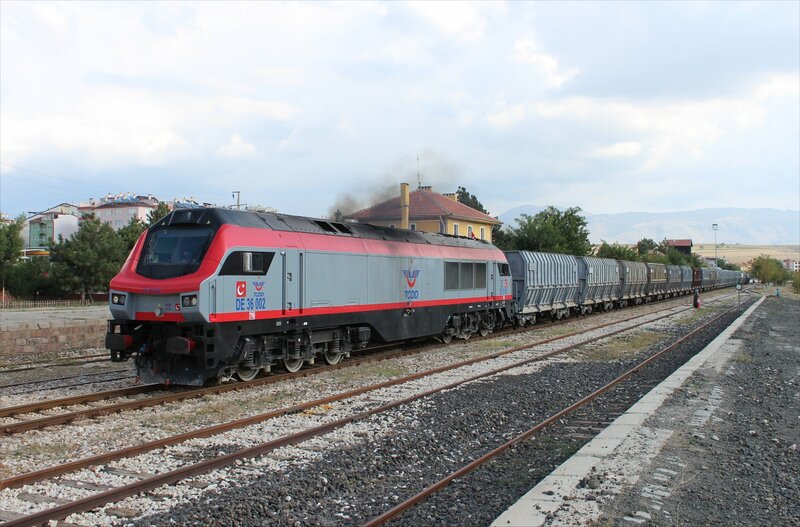 At the appropriate spots the diesel and service car were detatched for runpasts. 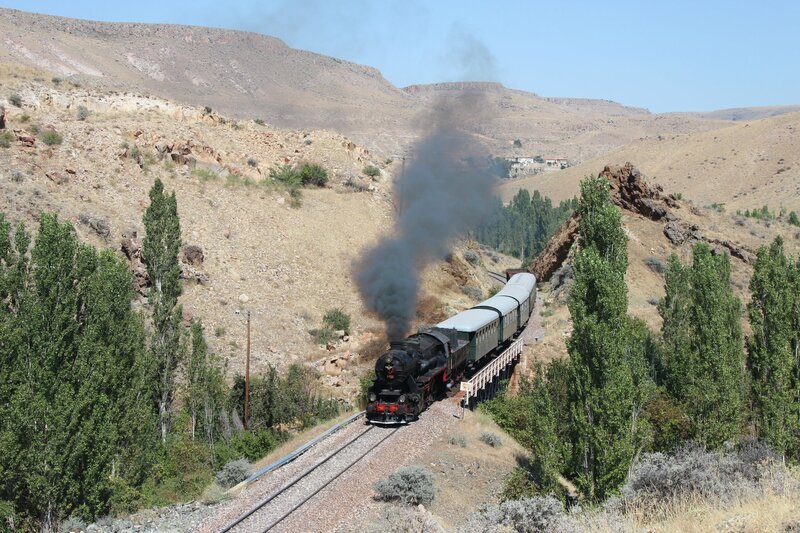 The branch may only be 13km long but it certainly packs in some wonderful scenery, which we tried to capture as best we could – from the fields, hillsides and atop rock cuttings. We were not alone in this endeavour – a photographer in a microlight could be seen buzzing above our position, before heading away with a friendly wave. 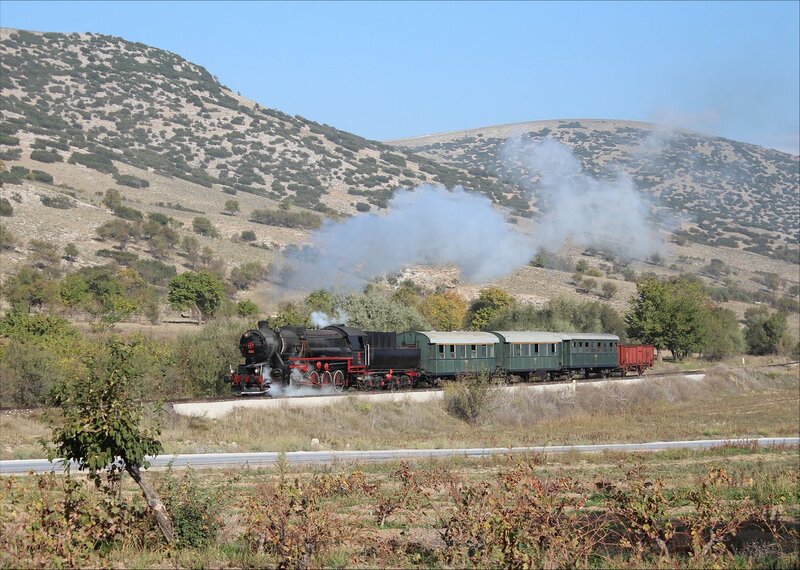 It was one of those occasions where everything came together – steam locomotive, scenery and sun! 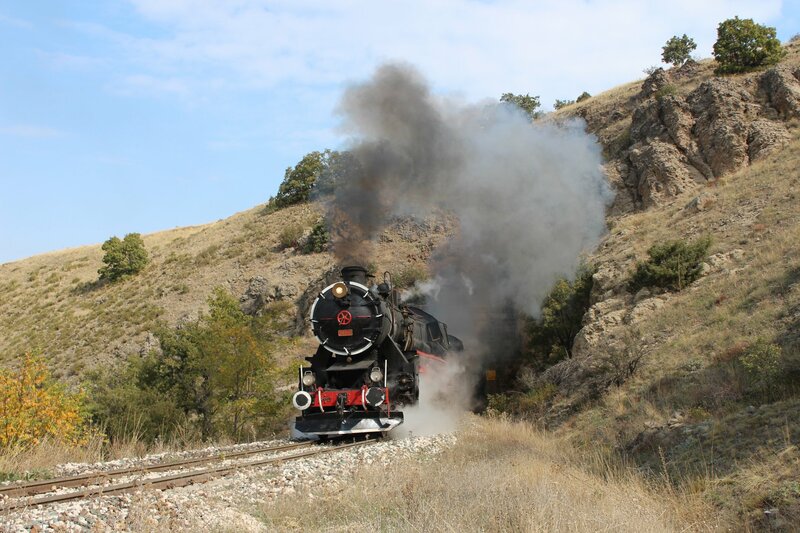 One of the guys on the tour reminded us that when a regular train passes it is nothing, but when a steam train passes it is a happening. 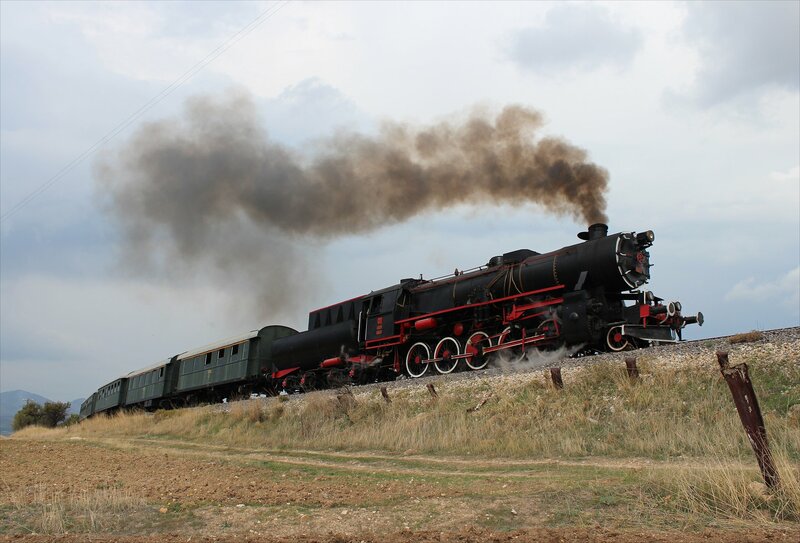 It certainly seemed true today – no one could take their eyes of this majestic locomotive, whether it be the teenagers on the platform or the fruit pickers in the fields. 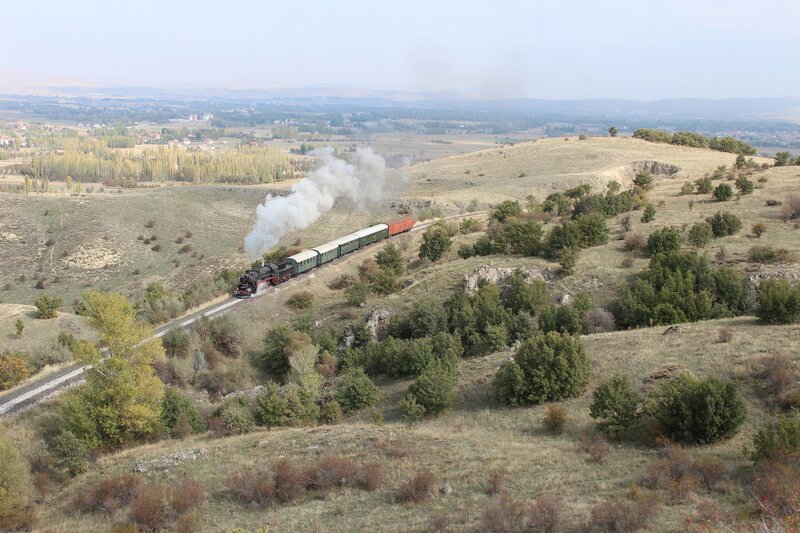 Mind you, the branch has been closed to passenger traffic for some years, so any passenger train would have been somewhat unusual! 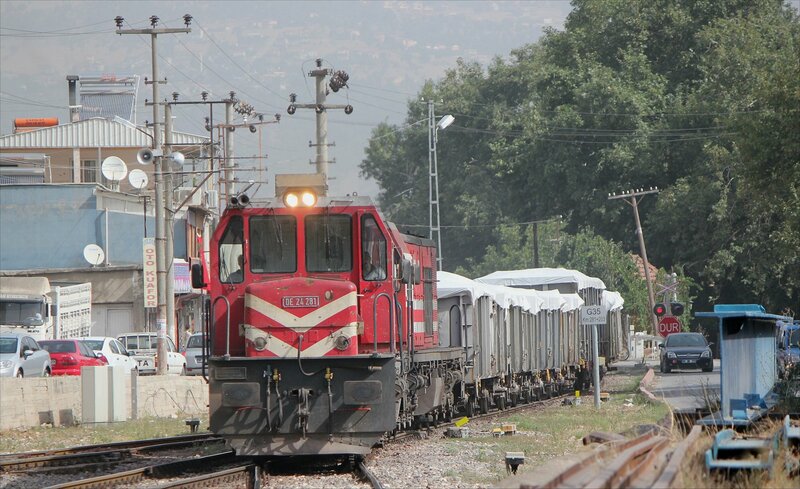 The Isparta branch was originally constructed in the mid-1930s and whilst it is closed to passenger traffic now there are plans to reconnect the city to the rail network with the contruction of a new high speed line from Afyon to Antalya. 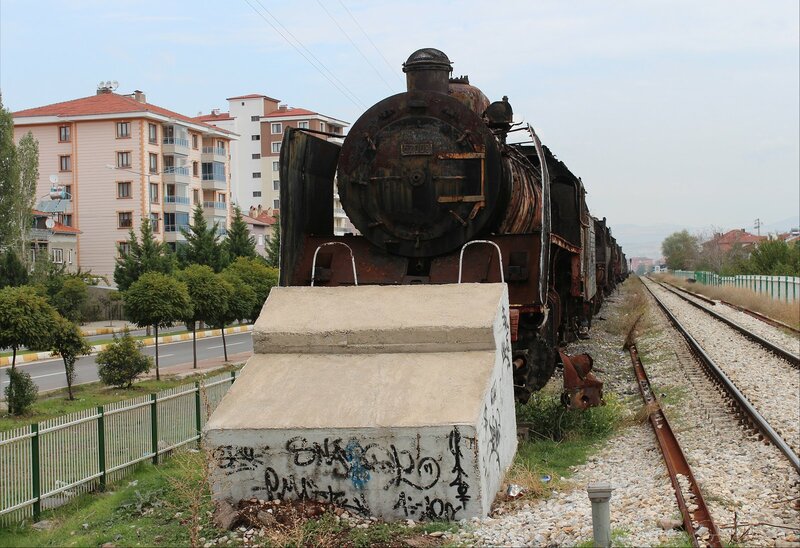 The contrast was striking, particularly as we reached the former junction station of Bozanönü and the now closed line to Egirdir (the track is still there for now, albeit grassed over). 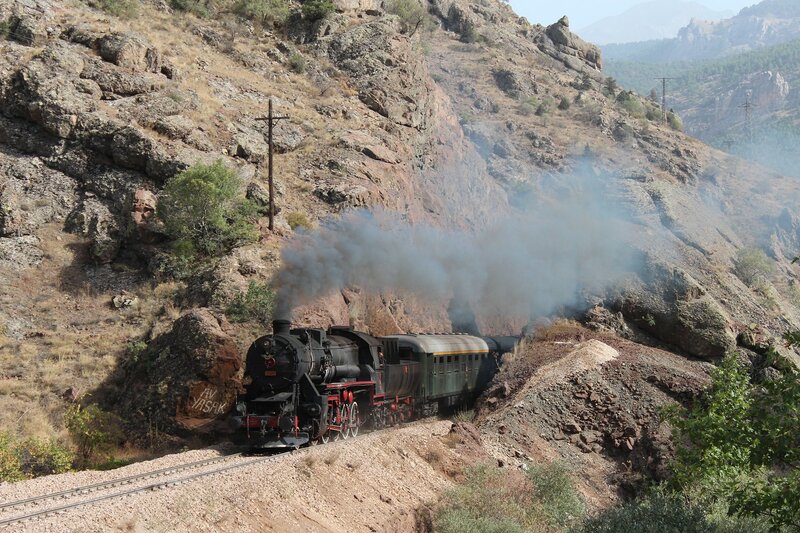 Our short run from the junction brought us back to Göltaş and on to Gumusgun, which we reached at 12.43pm. At this point six photographers hopped out, having arranged for a dolmus to pick them up here. This was probably the sensible option but I figured that as I had gotten so far that I might as well see it through to the end, hoping that this wasn’t a very foolish move! 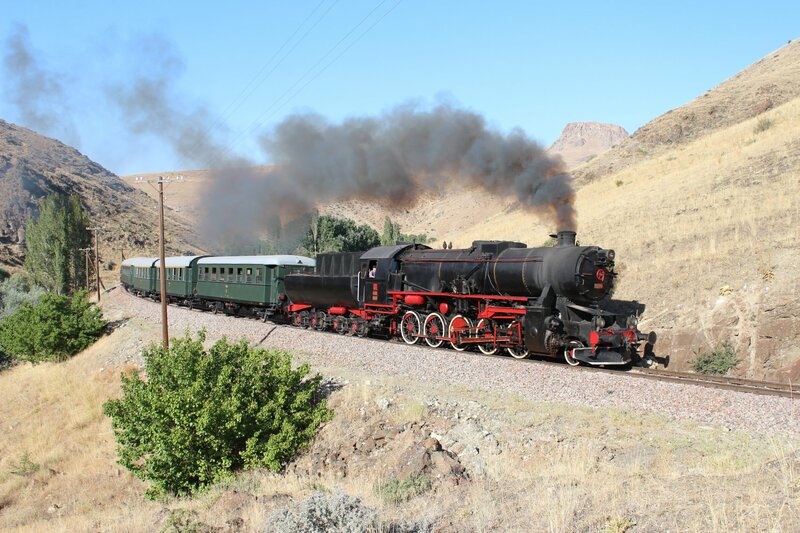 The scene that awaited us at Dinar station in the morning lifted our hearts – our kriegslok was sitting in the platform and seemed to be in much better health than when we left her. 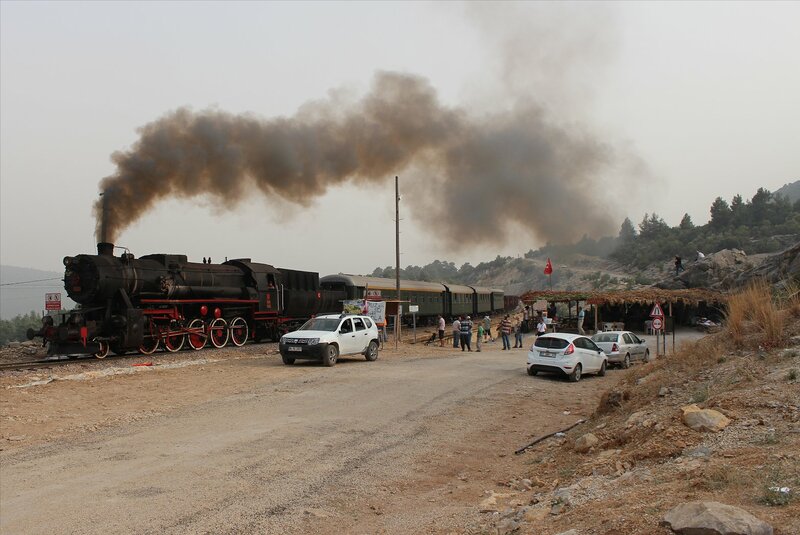 We were not alone in our appreciation for the locomotive, with quite a number of straggling schoolkids having made a detour on their way to school in order to get a selfie with the locomotive and the historic green carriages. 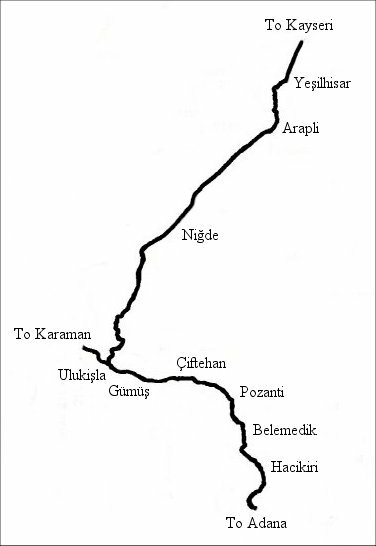 The town secured its place on the railway map of Anatolia in 1889, following the extension of the line operated by the Oriental Railway Company between Izmir and Aydin. 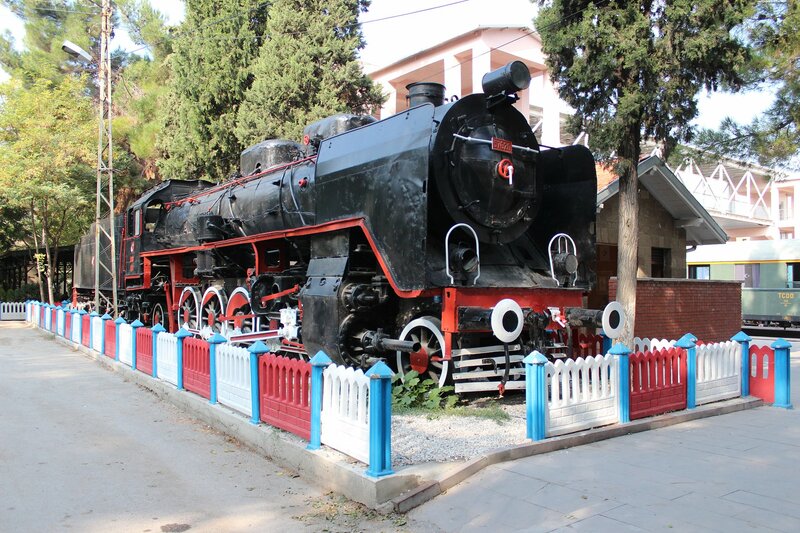 The staff at Dinar are justifiably proud of their connection to railway history (the stretch between Izmir and Seydiköy was the first to open within the footprint of present-day Turkey) with many reminders of this illustrious history on display at the station (a plinthed steam locomotive from 1928, a model of a steam locomotive, a small railway museum and some historic remnants from the ORC on the platform). 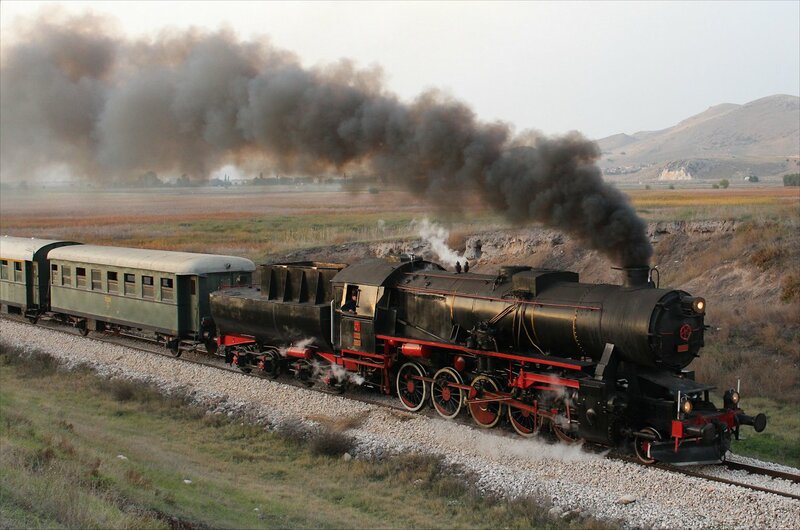 It seemed perfect to add a working steam locomotive to this picture, if only for a little while. 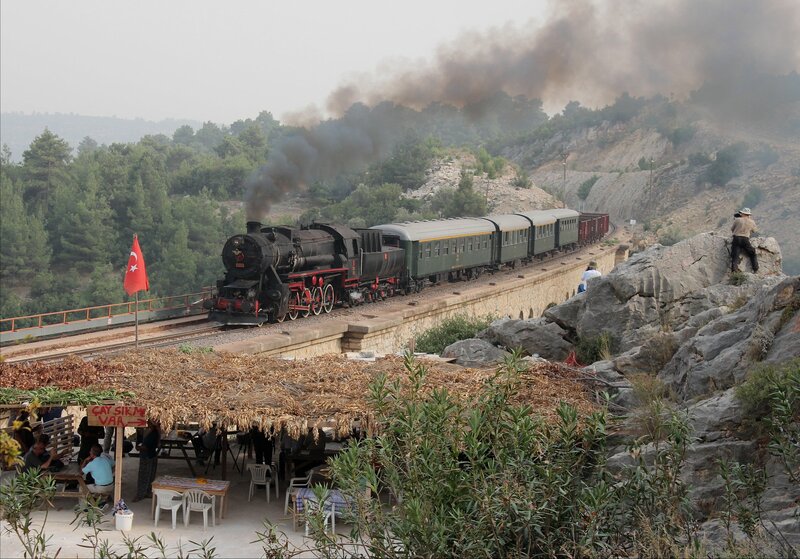 Dinar is not likely to be on any tourist itinerary, although its position on a major crossroads on the route to Antalya means that it is never short of traffic. It is sadly more likely to be remembered as the epicentre of an earthquake in October 1995 that killed 94 people and left many more injured or homeless. 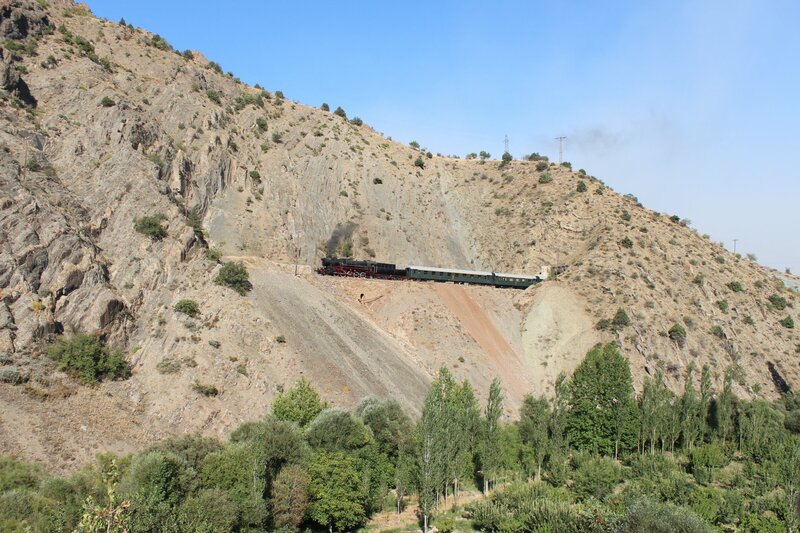 Our visit was too fleeting to appreciate the changes to the town since then, but our trip into the surrounding hills demonstrated the considerable natural beauty offered by the area. 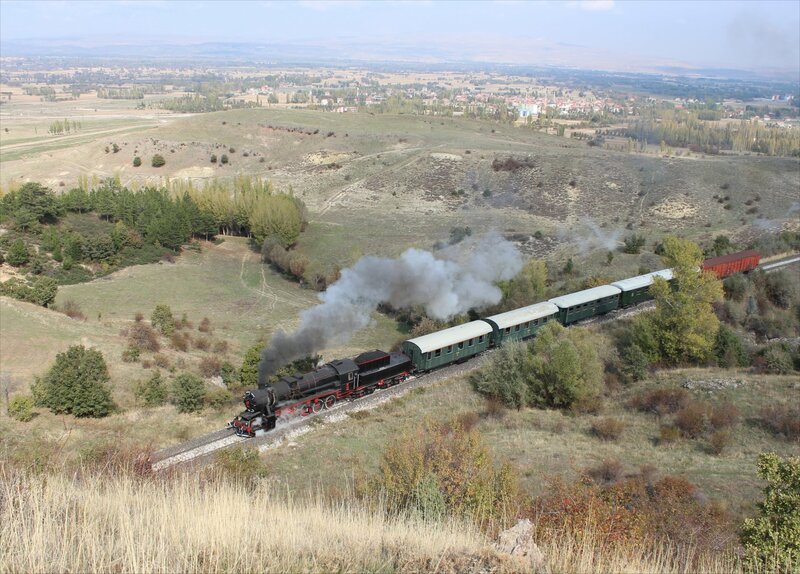 After departing Dinar at 8.55am we made our way towards Karakuyu with just two carriages and a wagon, stopping frequently for runpasts. 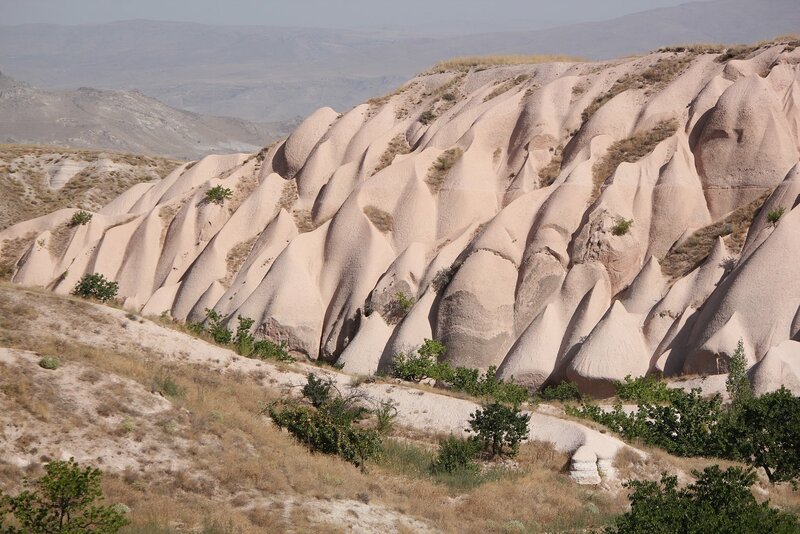 The scenery was quite superb throughout and delivered more opportunities than we could possibly take. The dilemma of which spot to choose was exacerbated by the limited time in each location, which was certainly a good thing – it seems that the more time you give some photographers, the more they doubt the position they have chosen, prompting a good impression of a headless chicken. I have been guilty of this in the past, but these days tend to stick to my spot for better or worse! 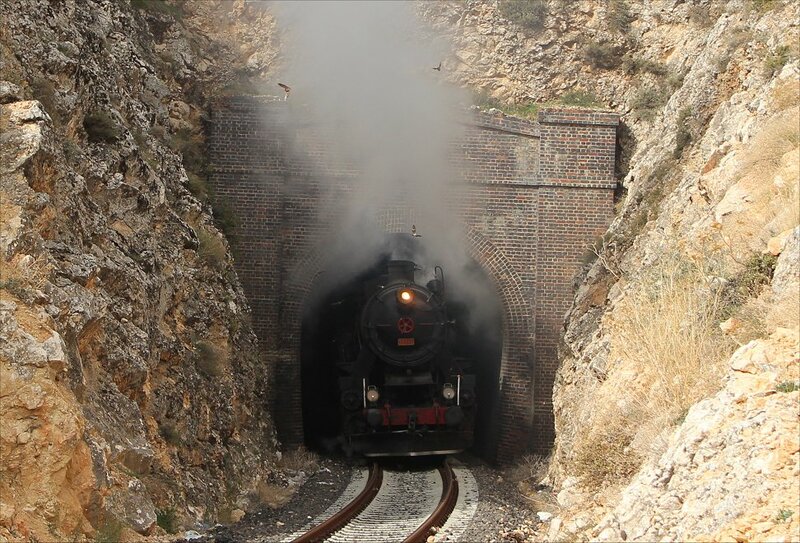 The last shots of the morning came from the tunnel mouth at the 388km mark, which included the unusual and entirely unexpected sight of a colony of bats emerging from the tunnel along with the locomotive. 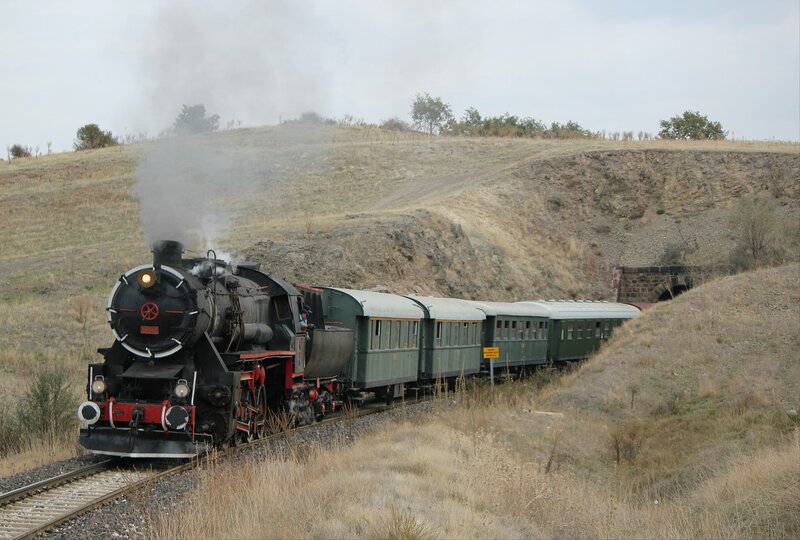 Our train arrived at Karakuyu station at 12.18pm where we found DE36 002 dropping ballast for collection. 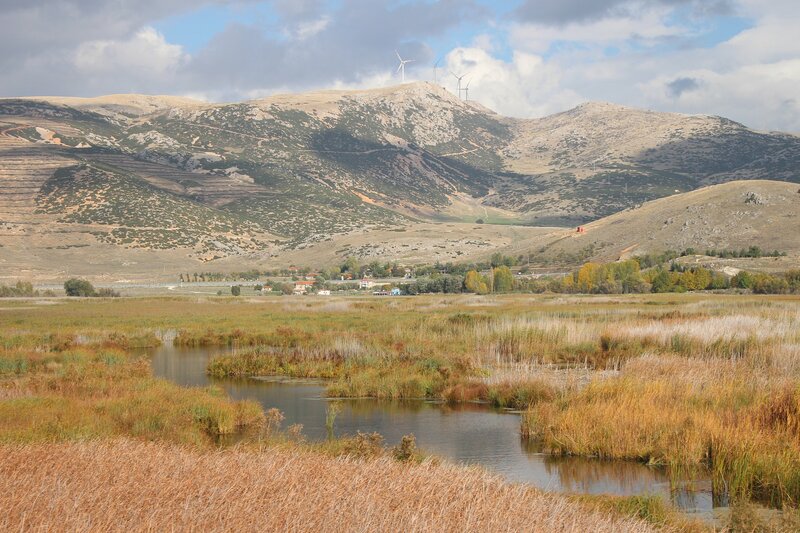 After taking a ride around the loop we headed on to Isparta, stopping not long after Karakuyu for a runpast at a particularly delightful spot of marsh. The next stop, just beyond Capali at the 401km point, was not so welcome. 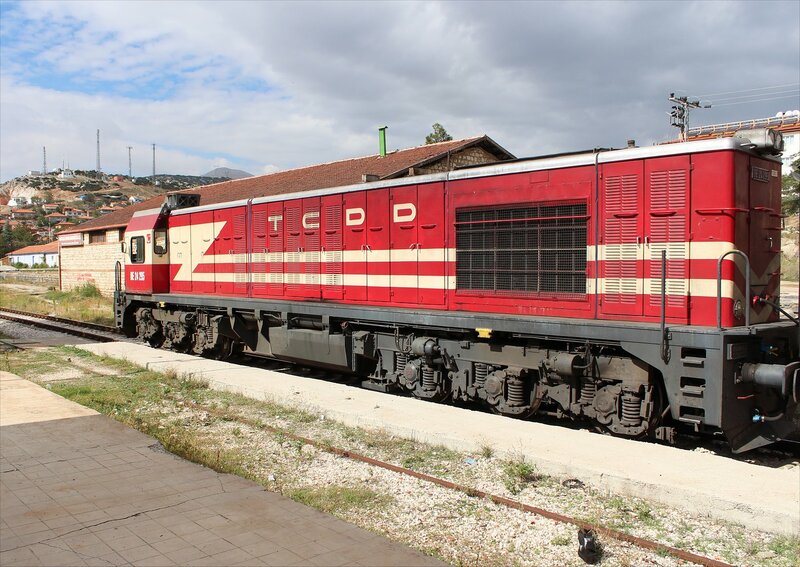 TCDD 56548 was once again beset by problems with the air pump. The diesel returned with the service car and the crew got to work, sadly to little reward from the recalcitrant pump. 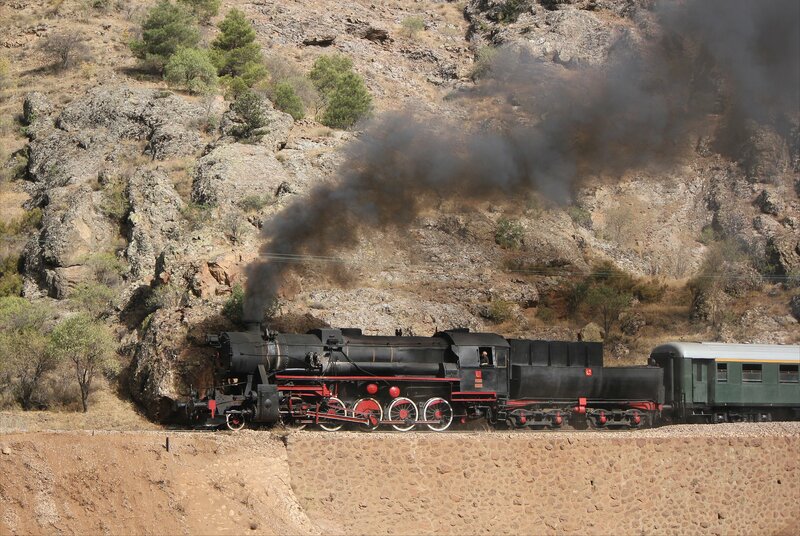 The three hour stop gave us ample opportunity for a barbeque, with the meat cooked on a shovel in the firebox. I particularly liked the confidence and finesse with which salt was sprinkled on top, as if to say that this was the way any good chef would choose to cook if they could! 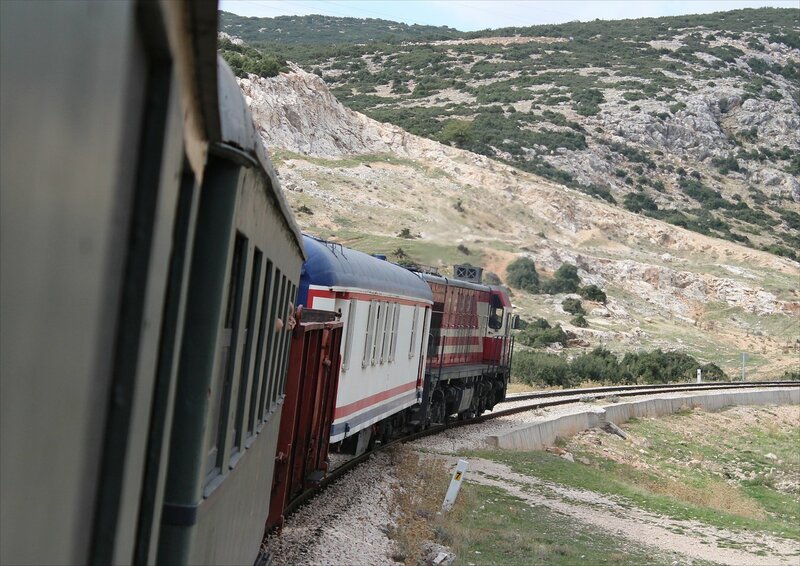 At 5.07pm we set off again, with diesel assistance, reaching Gümüşgün at 5.46pm. DE36 004 was waiting there with a freight, presumably held up by our unexpected stop. 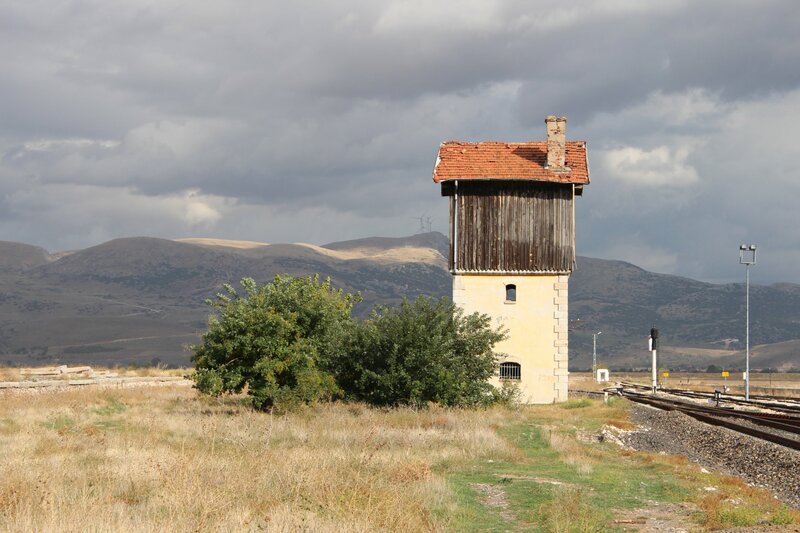 After this we contnued on to Goltas (6.12pm), with its vast cement works, the former junction station of Bozanonu (6.18pm) and finally Isparta (6.40pm). 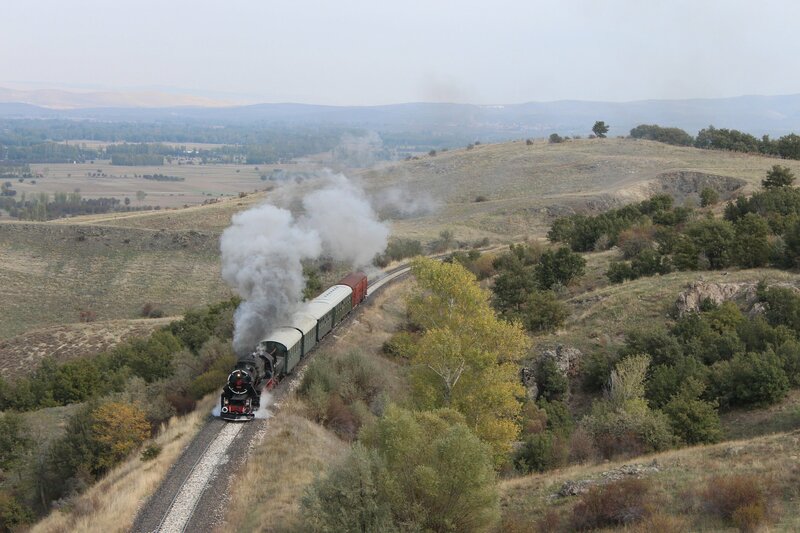 Our run in had given us a tantalising glimpse of the beauty of the branch line and left us all hoping that our loco could could deliver something special for our last day. The group assembled at 7.30am in readiness for an early departure, although some mischievous souls started running a book on when we would actually leave. Sadly, the joke was on us when even the wildest of the predictions turned out to be too early – the air pump was yet again proving to be problematic. 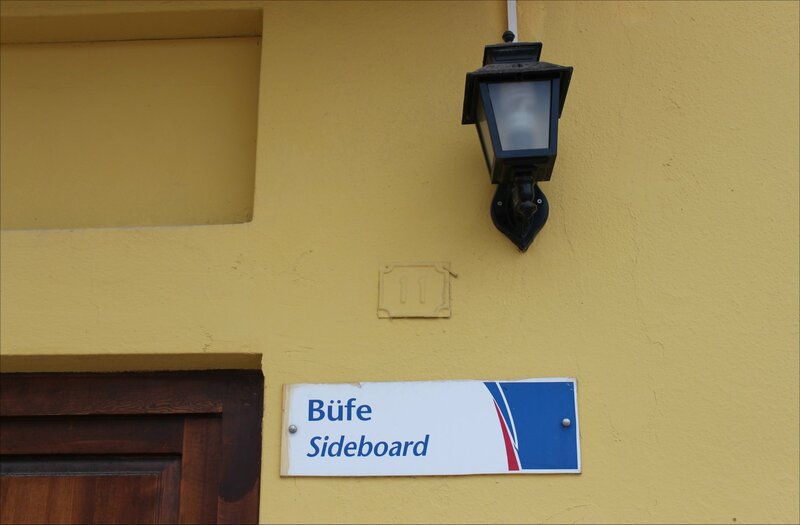 Whilst we waited for news we settled down in the station’s Büfe, rather delightfully mis-translated as ‘sideboard’ on the english language signs! 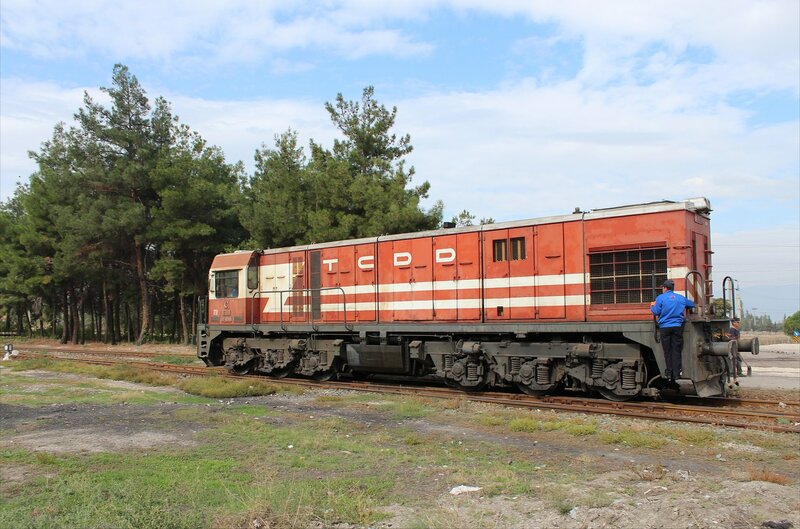 One small compensation for our extended stay in Burdur was that we got to see a mini-diesel gala as the station-pilot got to work shunting container wagons in the yard. 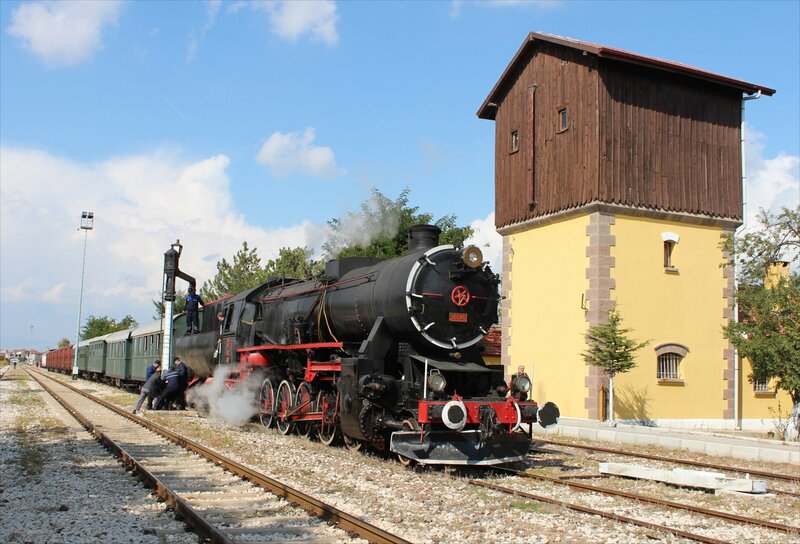 The station pilot here, 18 108, is one of a handful of survivors from a small class of 20 diesel locomotives. 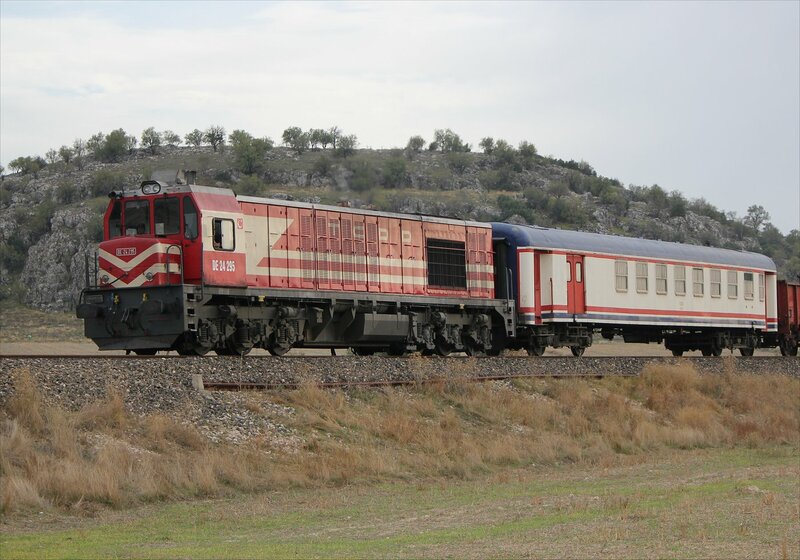 To put some context on the numbers, these light-axle load locomotives were ordered at the same time (in 1968) as the class 24 diesels, of which some 418 were eventually built. 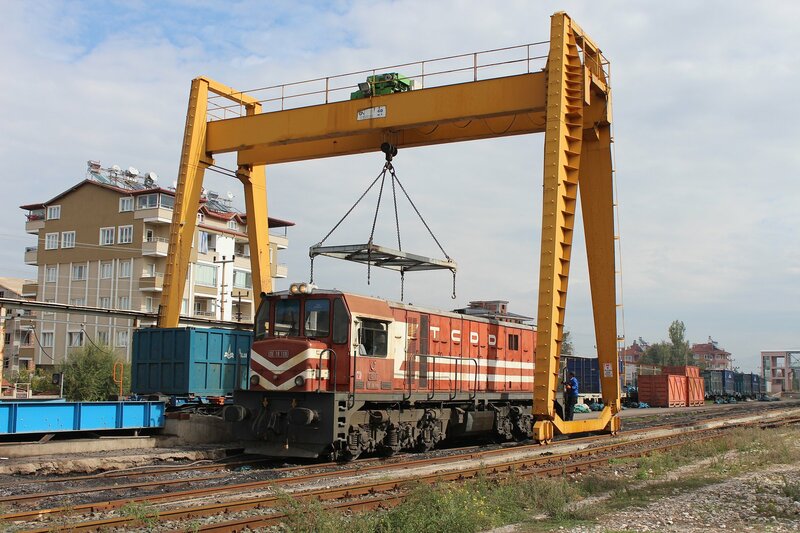 The pilot had been well hidden amongst the lines of containers yesterday, but today it was busy at work shunting around the crane and loading point. In the meantime the crew took the air pump apart, cleaned out all the gunge and re-assembled it. 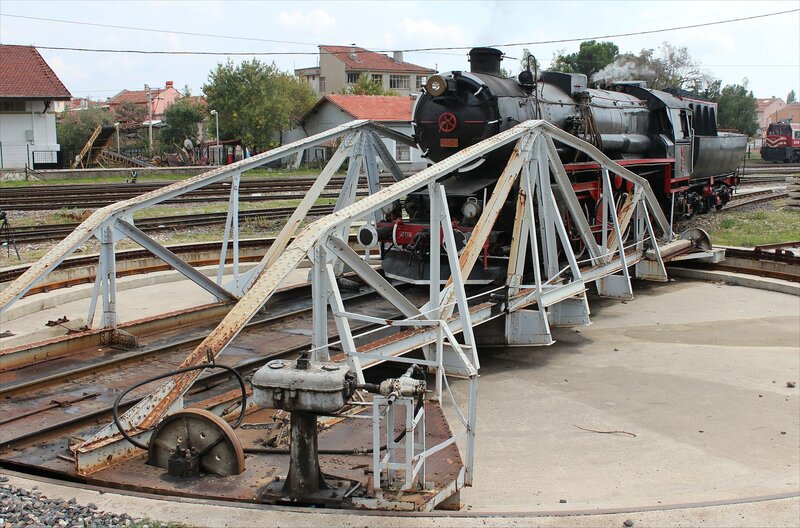 A former engineer in Izmir instructed the crew on everything they could do, but the air pump still failed to co-operate. 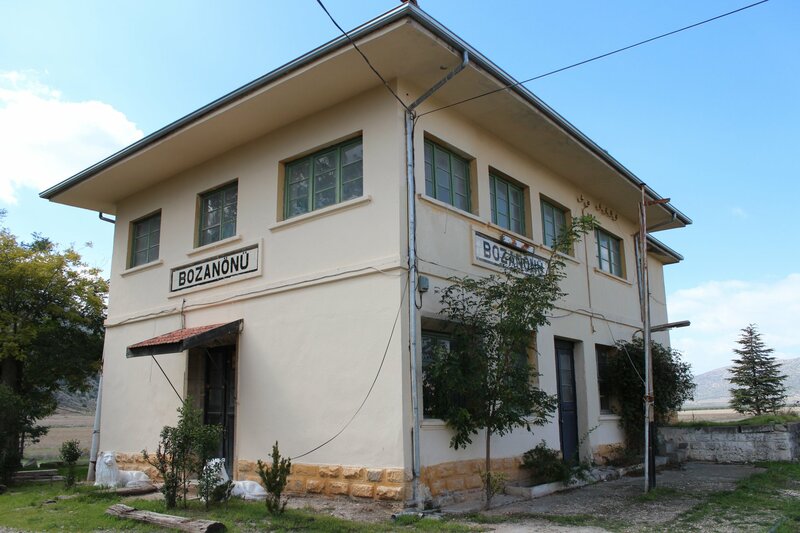 Finally, it was agreed that an expert in air pumps would have to make the journey from the Usak museum depot (some 5-6 hours away) with the necessary spare parts. The hope is that they can get it working for the run tomorrow. 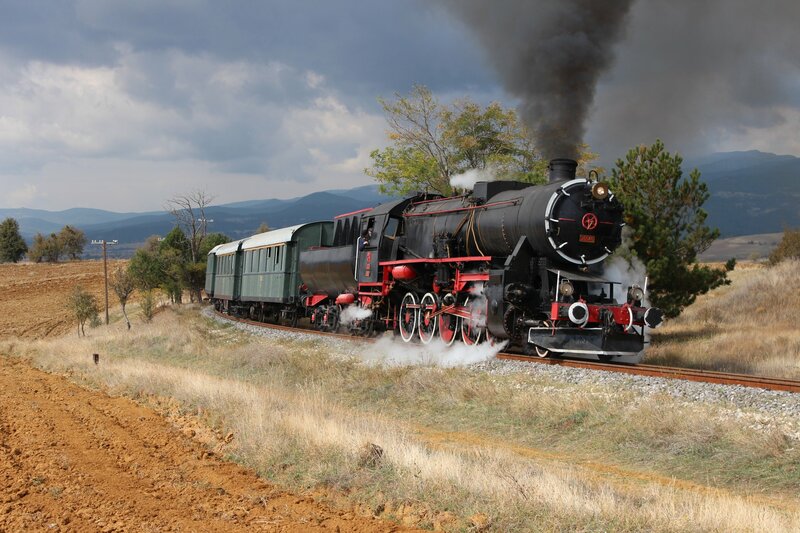 In any tour that relies on a single engine you are taking a risk, but it seemed like a good risk to take at the outset – this locomotive ought to be good for another ten years. 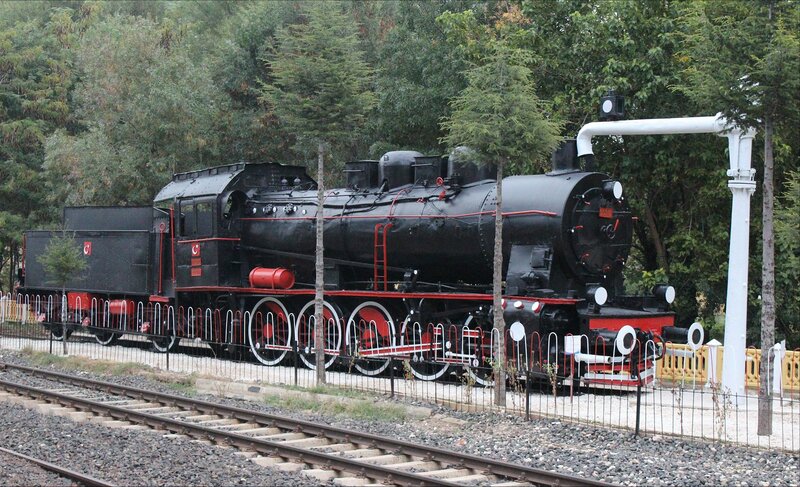 In recent years she has received new wheels, a new firebox and a new boiler (from Meiningen) so it was disappointing that after all that the air pump let us down (the first time that anything like this has happened in the tours run here over the last seven years). I had to remind myself that even a newbuild like Tornado had contended with similar problems – in April 2013 she suffered from a high profile failure of a new air pump whilst working a tour and had to be rescued by diesel (her second air pump had failed previously and was already awaiting repair). 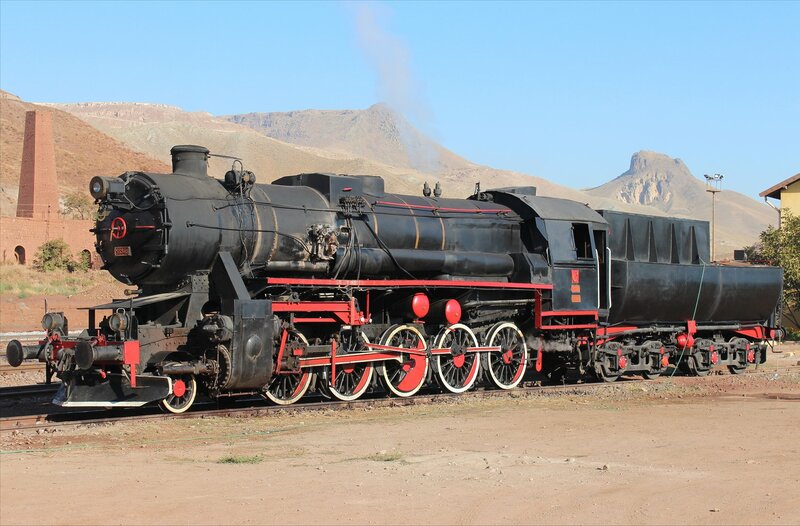 Maybe the problem on our trip will have a positive result if the museum depot acknowledges the need to overhaul a second locomotive. At 2pm we were finally ready to leave with a plan for a few runpasts (albeit with the diesel atached to provide air pressure whilst the air pump was out of action) but then DE36 002 arrived with a freight, blocking the line out! 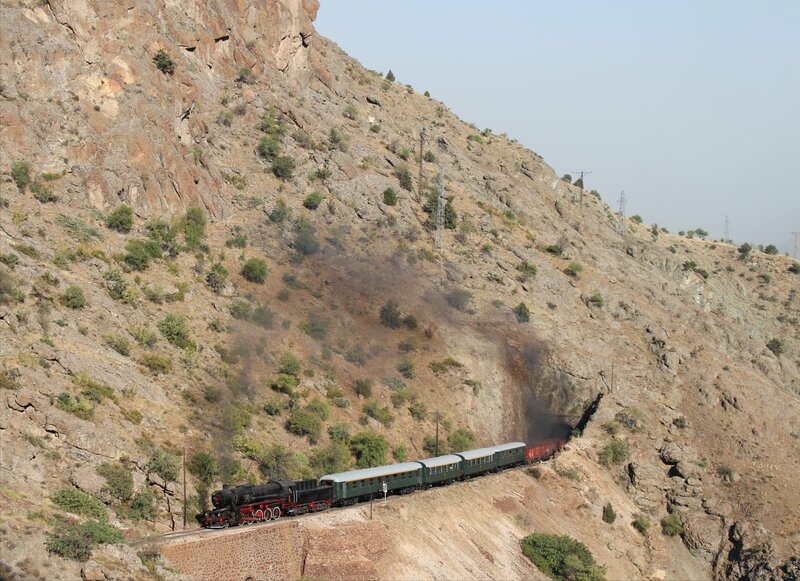 Our train finally reached Dinar at 6.40pm and we made the short transfer to our hotel by minibus. Soon after we ate at one of the oddest restaurants of the trip – it was perfectly fine but opened out onto the forecourt of a petrol station, complete with the occasional waft of petrol fumes through the unshuttered sides! 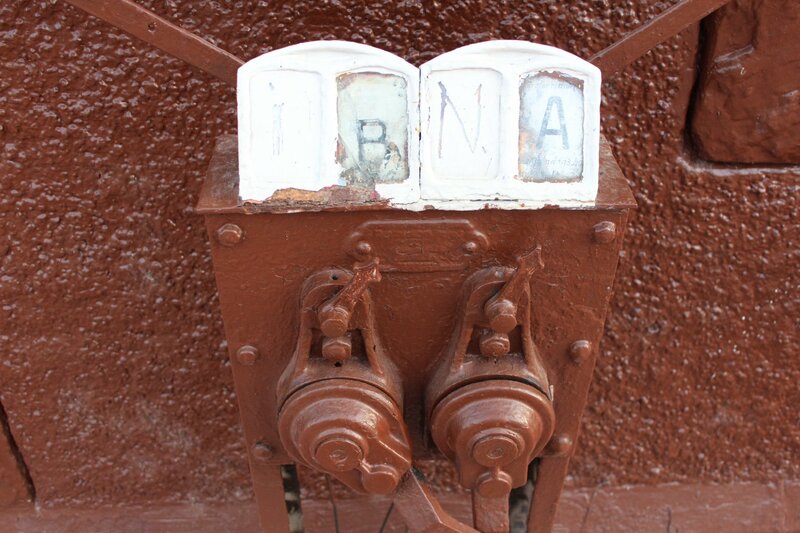 A strange end to a strange day – one that I suspect most of us are happy to say farewell to. I hope that tomorrow brings us better fortune. 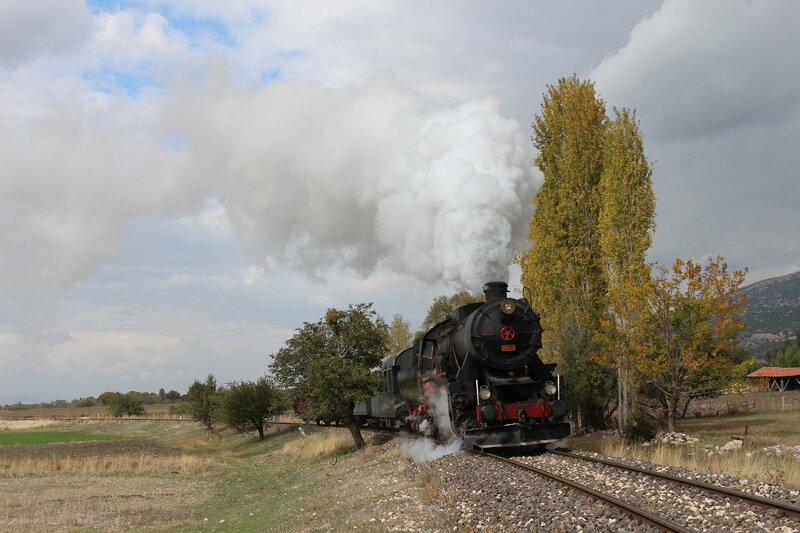 Our arrival in Burdur after dark gave us little chance to assess the opportunities of this short branch line but this was something that we intended to remedy today. The station itself was neat and tidy, despite the absence of passengers, with a plinthed loco standing on guard outside (57020). 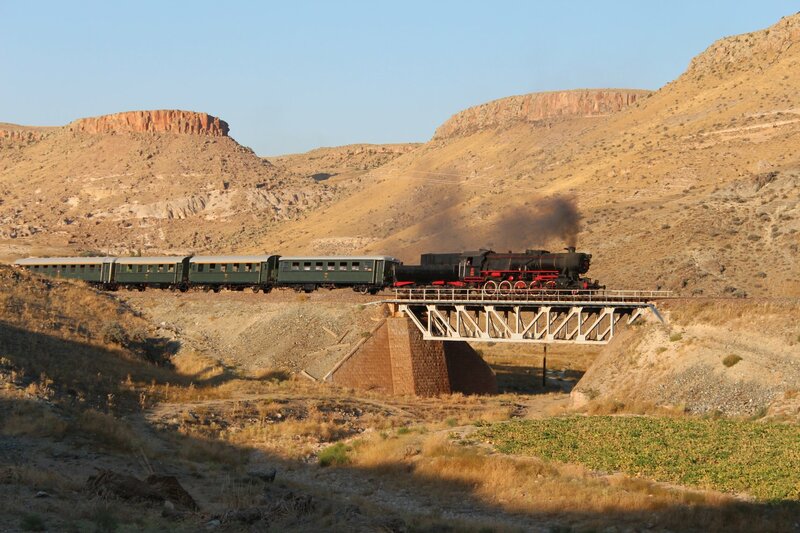 The line no longer sees passenger traffic but that doesn’t mean that it is dead. On our return to the station it was clear that the railway line plays a significant part in the industrial operations here and this must have been a factor in the survival of the line up to now. 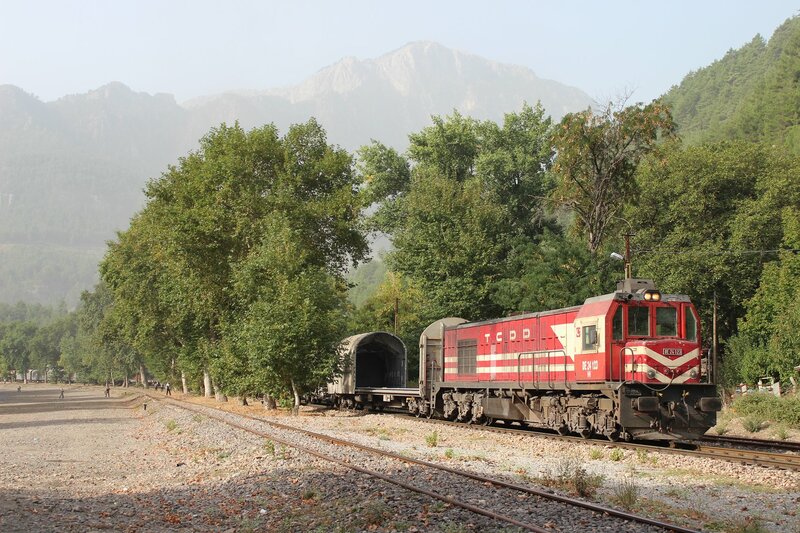 In contrast, the nearby branch line to Eğirdir has closed despite the great efforts to capitalise on its vast tourist potential. 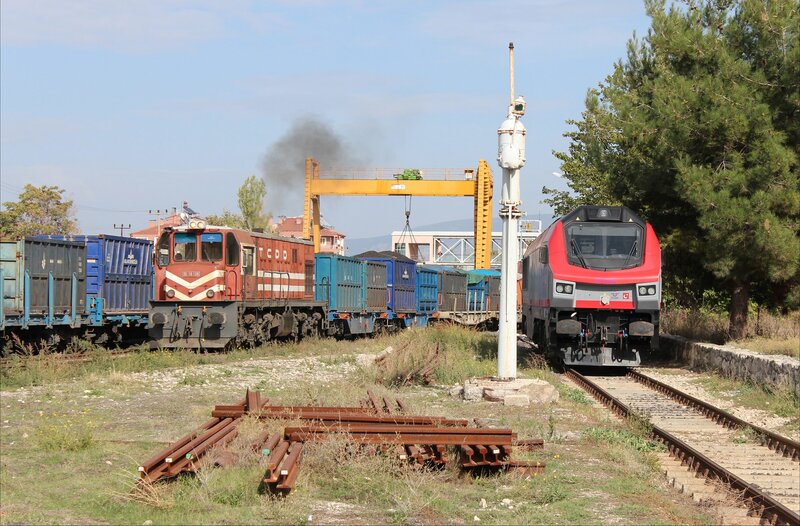 Nevertheless, the writing must be on the wall for branch lines like this as Turkey’s railway modernisation project rolls out across the country. 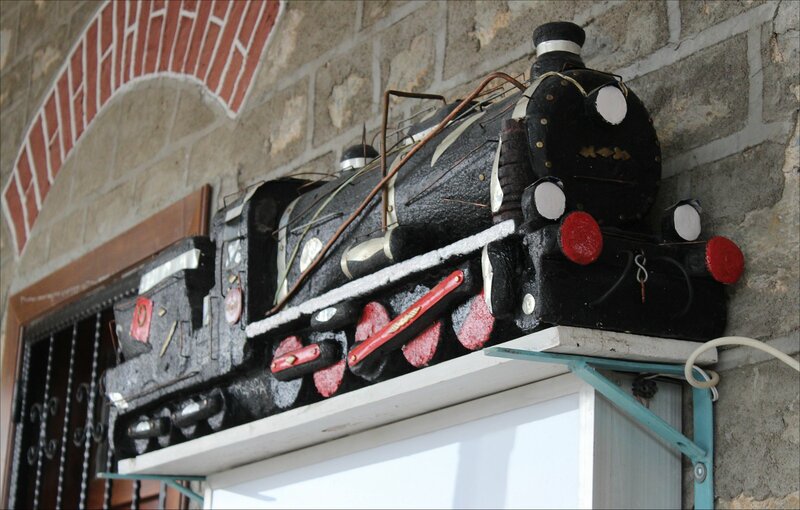 The door to the engine shed had been altered since the last time our steam locomotive had visited Burdur and when it was backed into the shed the whistle was knocked off. 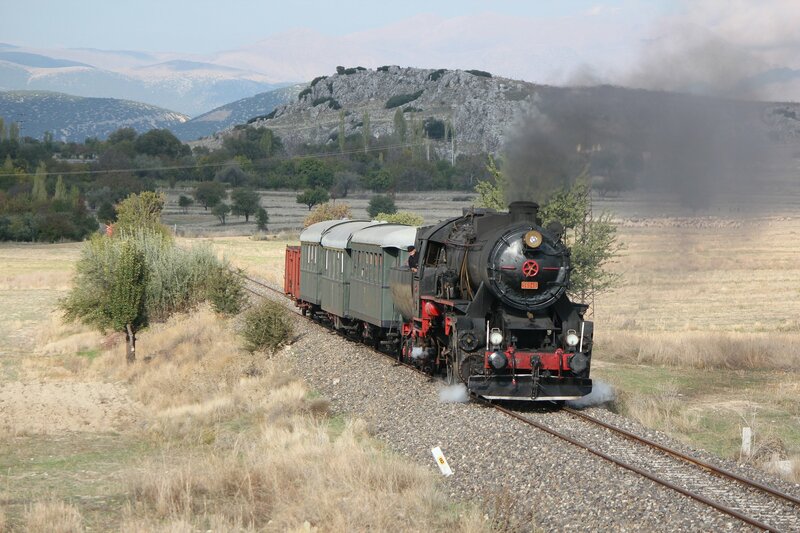 Now, none of us had any great love for the ear-splitting whistel of 56548 but we couldn’t operate without the ability to sound a warning at the numerous crossings up and down the line. The repairs and adjustments were finally completed by 11am. 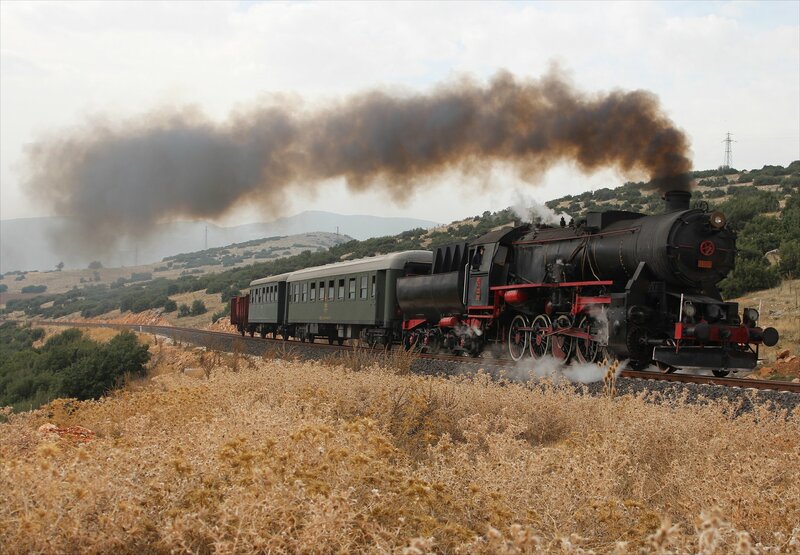 I had not appreciated just how pleased I would be to hear the ear-splitting sound of a Turkish steam whistle again, but it was a joyous and painful moment all at once! 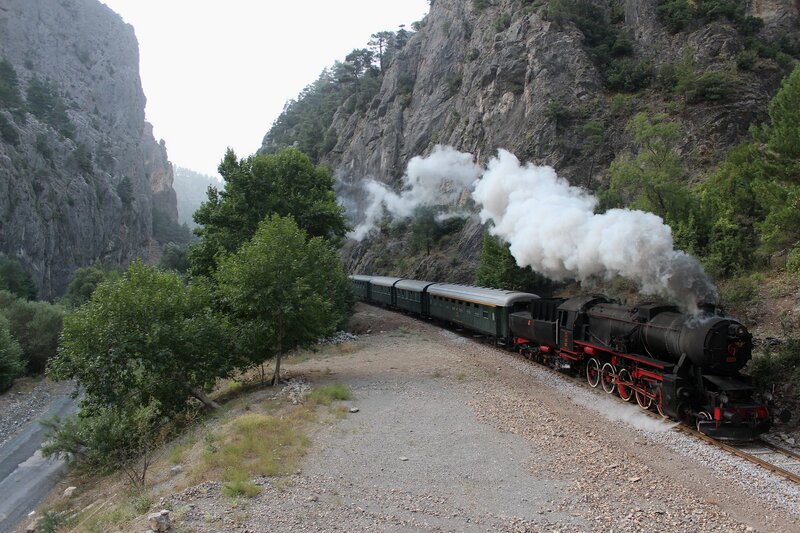 We departed Burdur at 11.06am, just two and a half hours later than planned, and began our run up the line. 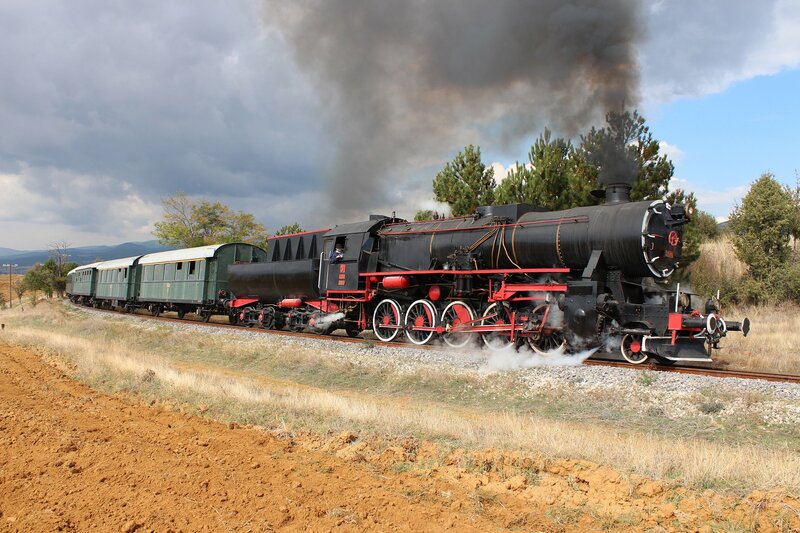 The locomotive ran tender-first, which was not untypical of the operation here in steam days. 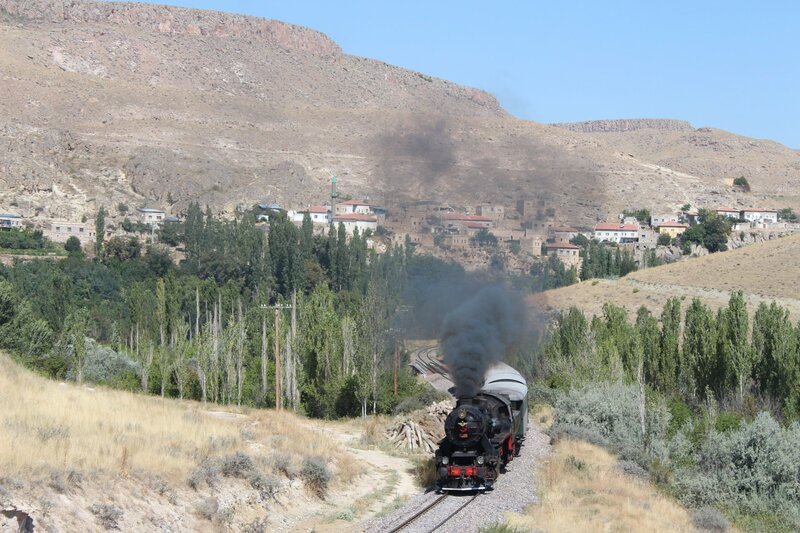 After a couple of run pasts we reached Gümüşgün at 12.18pm. 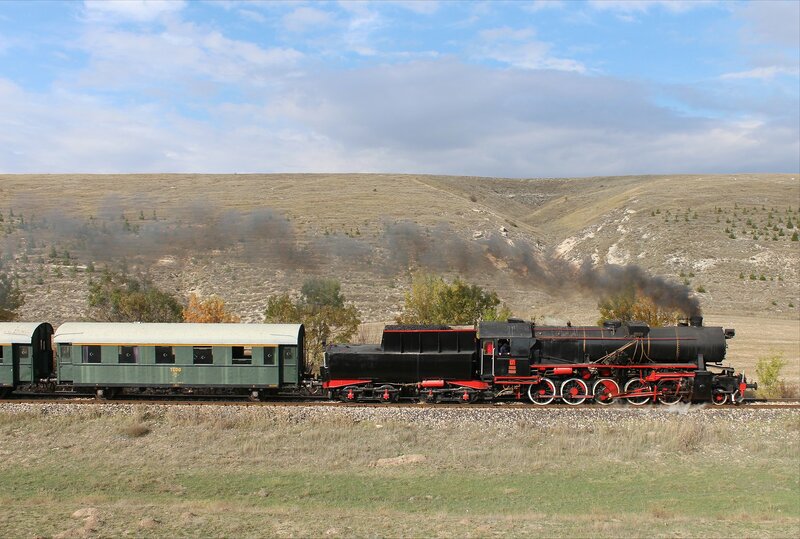 At Gümüşgün the crew quickly demonstrated that Burdur had alot to learn about shunting festivals, proceeding to shunt the wagon and carriages one by one! 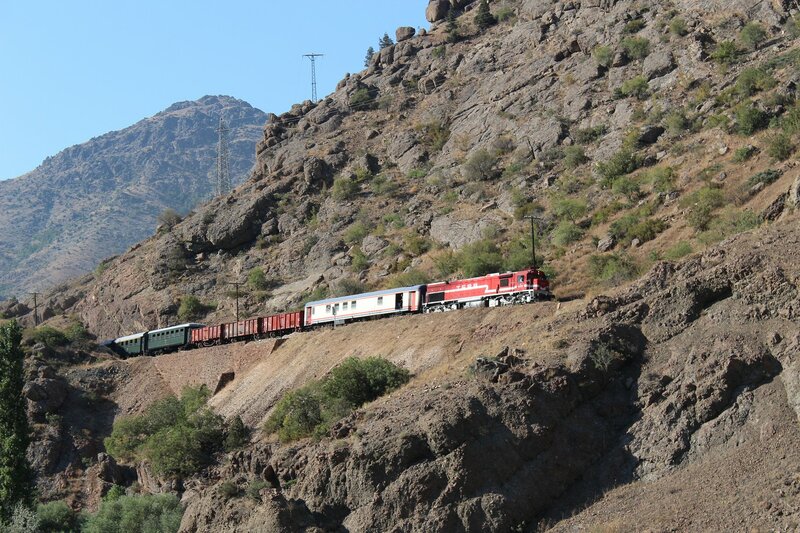 Standing on the sidelines it was hard to work out quite what was going on, but it eventually transpired that we were either waiting for a freight to pass us – or that it was waiting two stops down the line for us to pass it. Mexican stand off anyone? 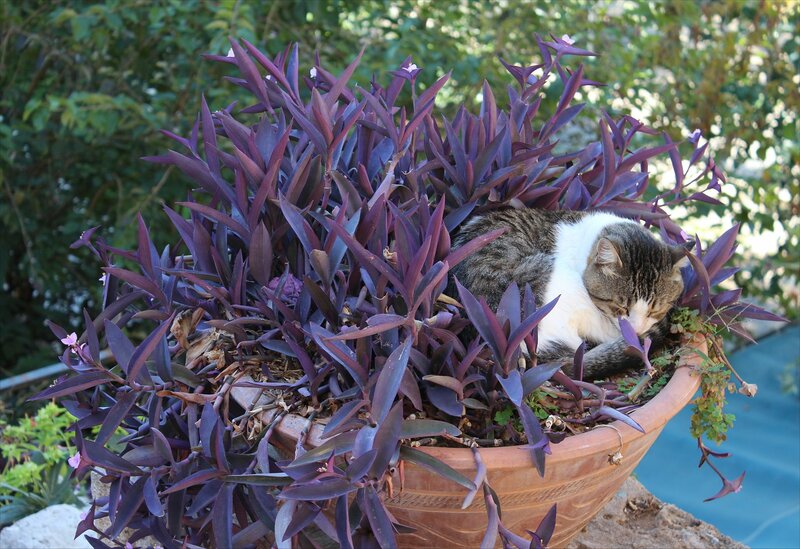 Thankfully, it was a beautiful day to laze around – albeit reluctantly! 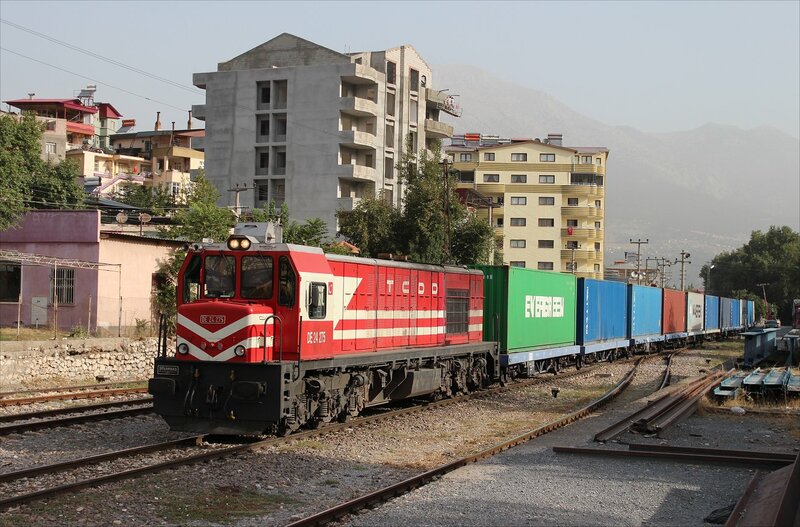 At 2pm DE36 002 arrived with a westbound freight train, passing a couple of derailed container wagons, followed half an hour later by a Burdur-bound freight in the hands of DE36 005. Yet, still we didn’t move – there was clearly more to this stop than just a case of supremely polite train pathing. It soon became apparent that the cause of our lengthy stop was an erratic air pump which the crew were trying to fix with spare parts from the service car. The work was successfully completed by 3.30pm, but in the meantime we attended a hastily re-located surprise birthday party for a 70 year old railway engineer. It was a delightful occasion that only the most flint-hearted soul could have failed to be warmed by. 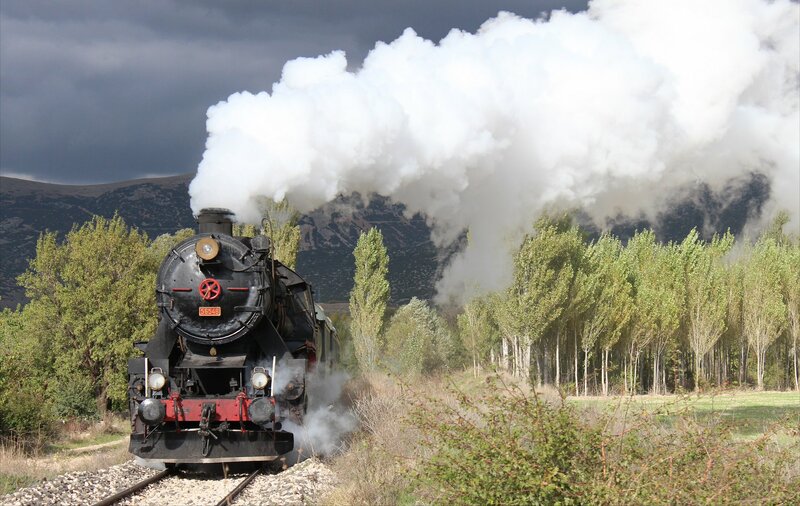 As we no longer had sufficient time to reach Isparta a new plan was hatched – we would head back to Burdur and try some run pasts on the branch line. This proved to be a good call as it delivered up some wonderful opportunities for sunset shots and allowed me to make a couple of attempts at contre-jour shots from the opposite side of the track. In spite of the frustations from earlier in the day, it was a truly glorious final hour. 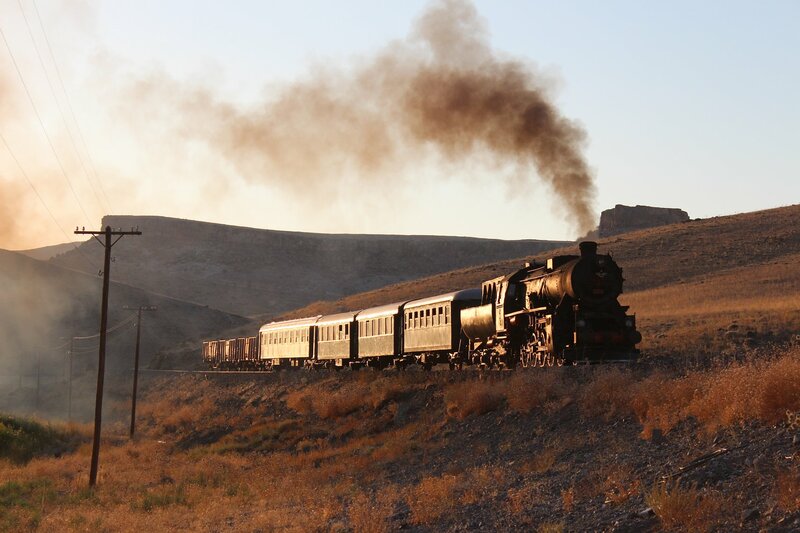 Funnily enough, we were still just about in sight of Gümüşgün when the sun finally dipped below the mountains, but as another photographer remarked, it’s not the distance you travel but the work that you deliver in that time which counts. Never has a truer word been spoken. 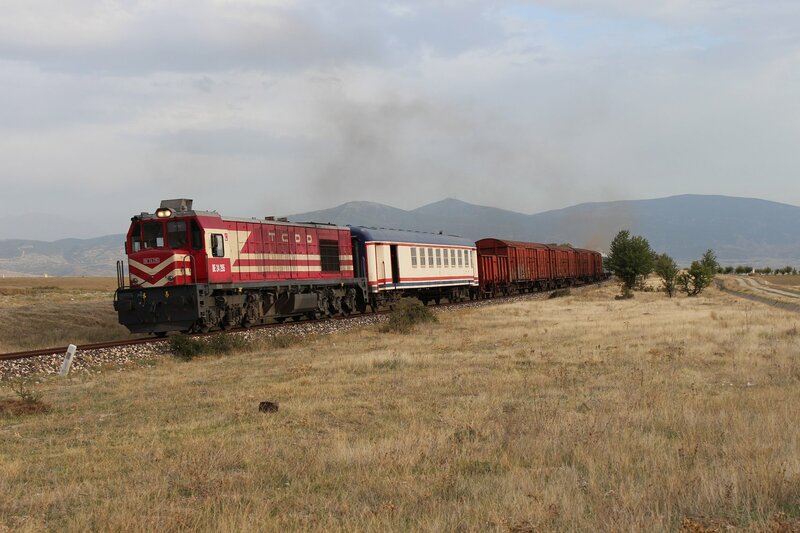 After spending a little time at Tinaztepe we set off on our journey south, passing through Kocatepe (1.18pm) and Cigiltepe (1.30pm) before making it to Sandikli (2pm) where we took a late lunch stop. 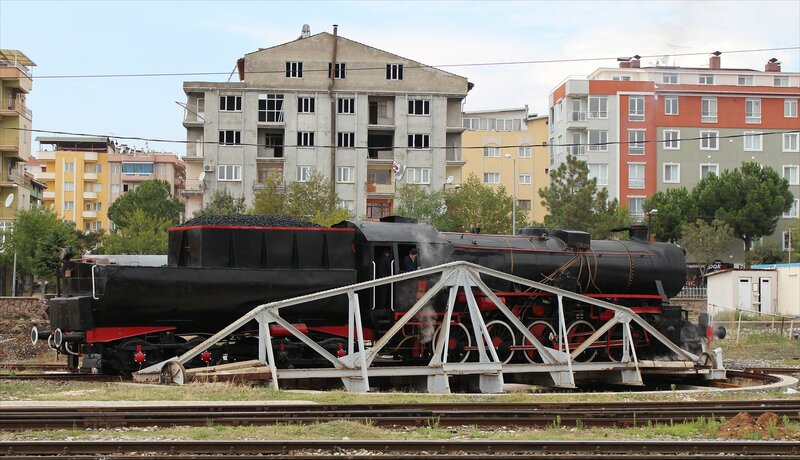 It was impressive to see a working water column here, given that in so many countries the infrastructure from steam days has rusted away or been removed long ago. 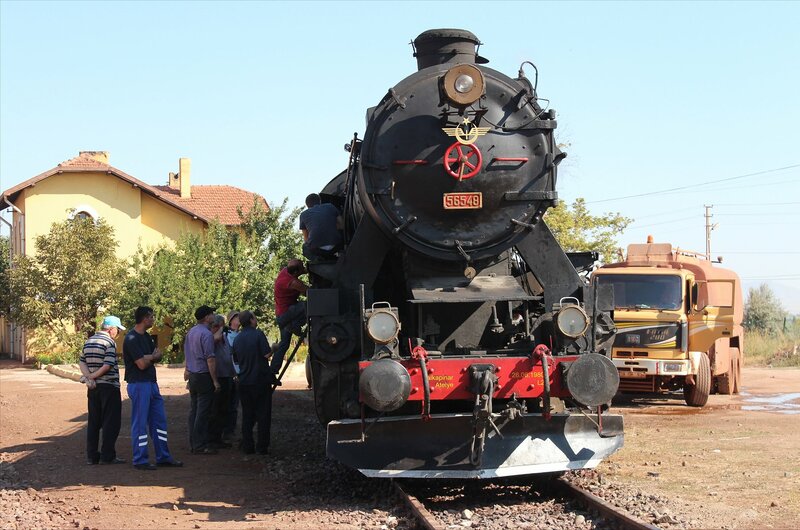 The news of the arrival of Turkey’s only working steam locomotive soon attracted the attention of the local kids and a couple of gentlemen from the media, who gathered a few reluctant photographers (including me) to pose awkwardly for a shot to be used in a story for their paper. Who could have anticipated that my 15 minutes of fame lay in the Afyon Gazette!? 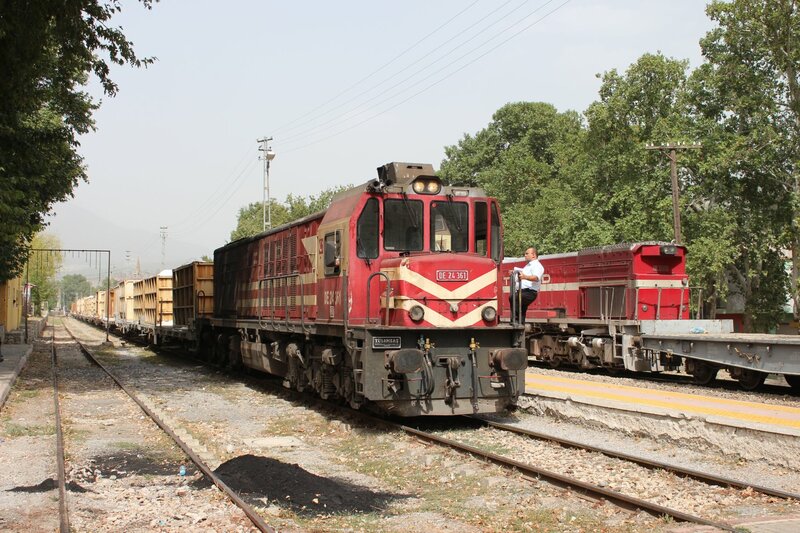 Our stop at Sandikli also cleared the line for two freight trains that passed through in the direction of Afyon (the first just after our arrival and the second at 3pm precisely). 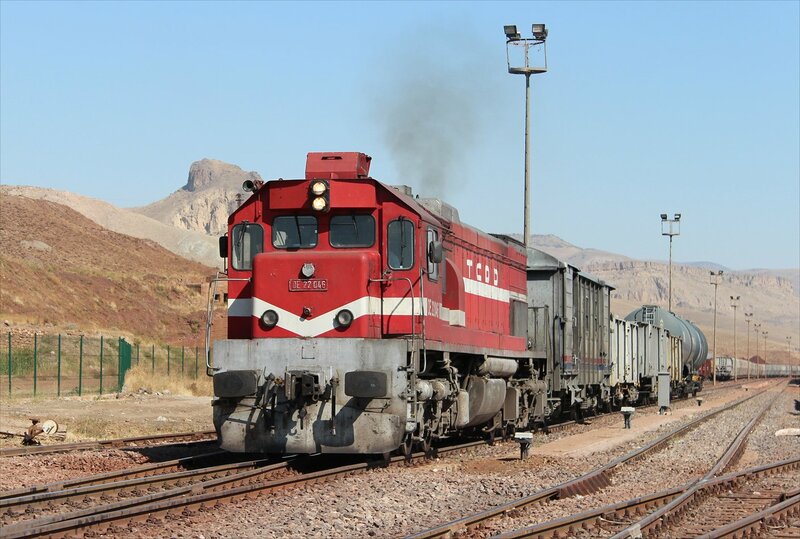 The freights were notable for their use of GE PowerHaul PH37ACai diesel locomotives, a new class of locomotive which only began to roll off the production line relatively recently. 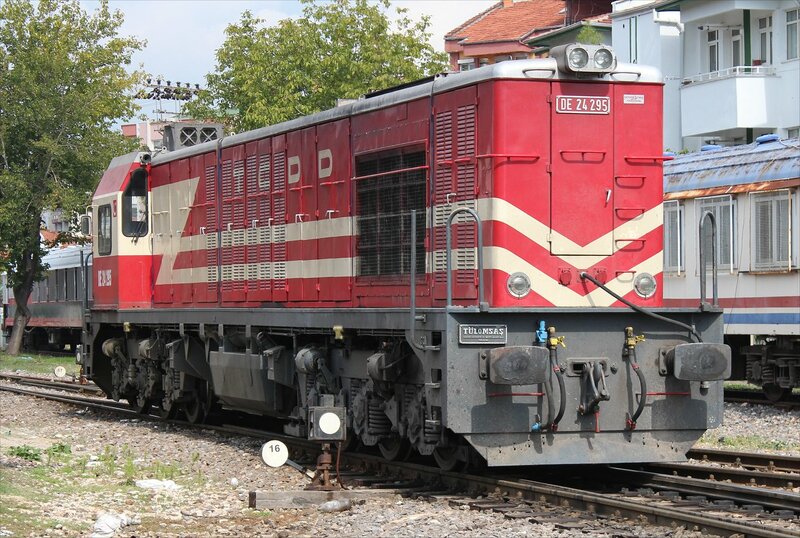 Tülomsas are building 20 locomotives of this type for Turkish Railways and another 30 for export (under a strategic partnership with General Electric). 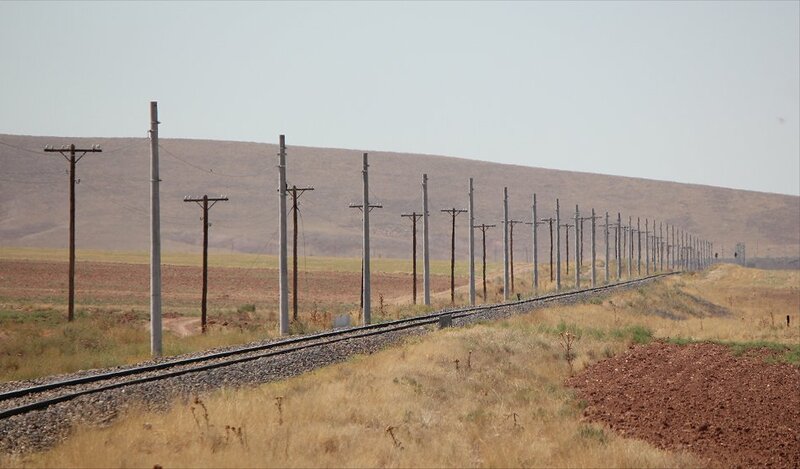 The first examples in Turkey had somewhat disappeared from view, so it was fascinating to see that they all had 70 (Afyon) allocations and are being used on this stretch of line. It makes much sense from a testing perspective as any failures here would have a low impact, given the light traffic we have seen. 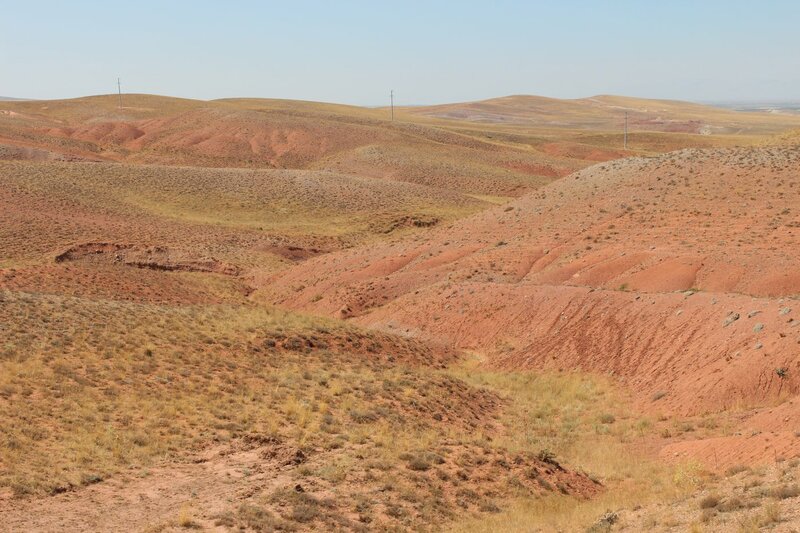 After departing from Sandikli (3.47pm) we continued our journey south, passing through some stunning and quite deserted landscapes before reaching Ekinova (4.15pm) and the Karakuyu loop (5.05pm). 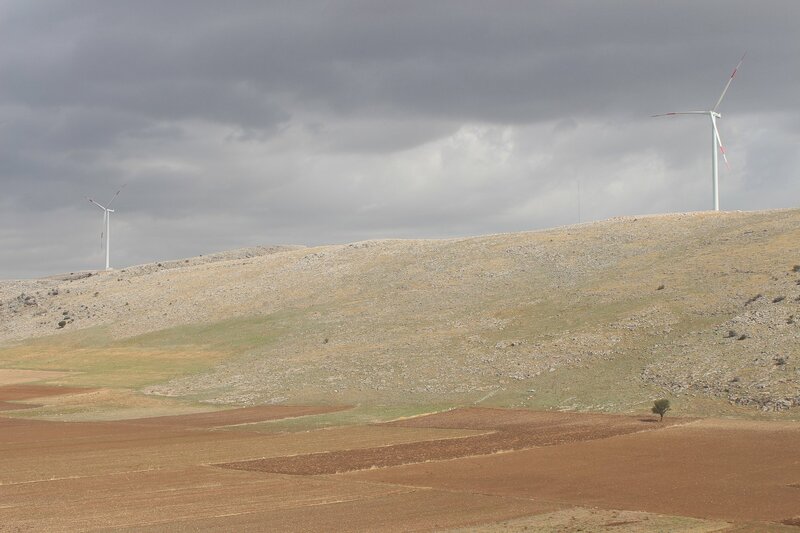 The sun was about to drop below the hillside so the time for photography was rapidly running out. 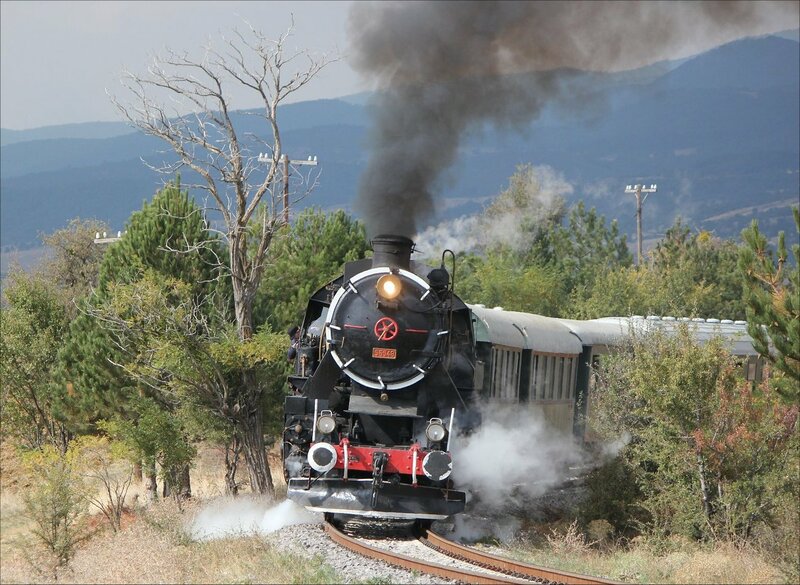 Nevertheless, we managed four runpasts on the loop before the light finally disappeared. The spot for our runpasts, a rock cutting next to a quarry on the loop, looked stunning bathed in golden light but the location was not without its challenges, notably a strong wind which blew the smoke in all sorts of undesirable directions. 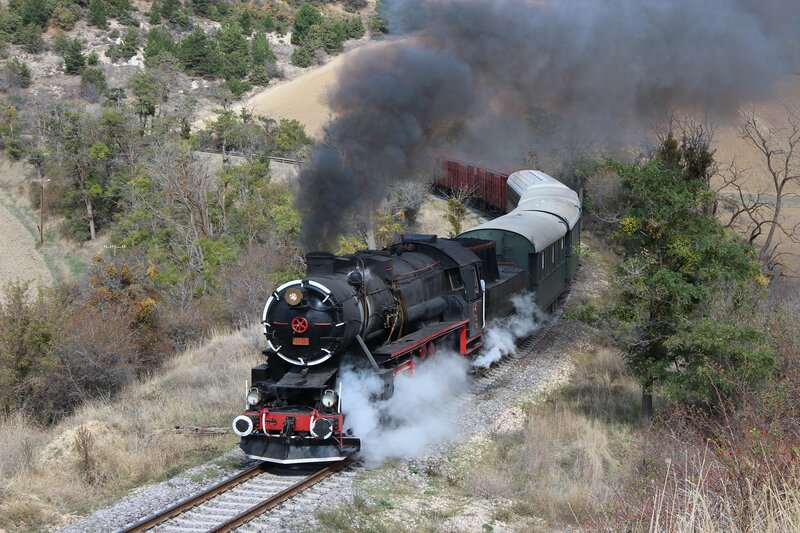 On one of the runpasts the smoke even managed to mask the locomotive entirely to the grumbles of the assembled photographers! Nevertheless, I think we all managed to get something out of the location. From the loop we made the short run into Karakuyu station at 5.40pm, where another DE36 hauled freight was waiting for us to clear the line (DE36004 this time). 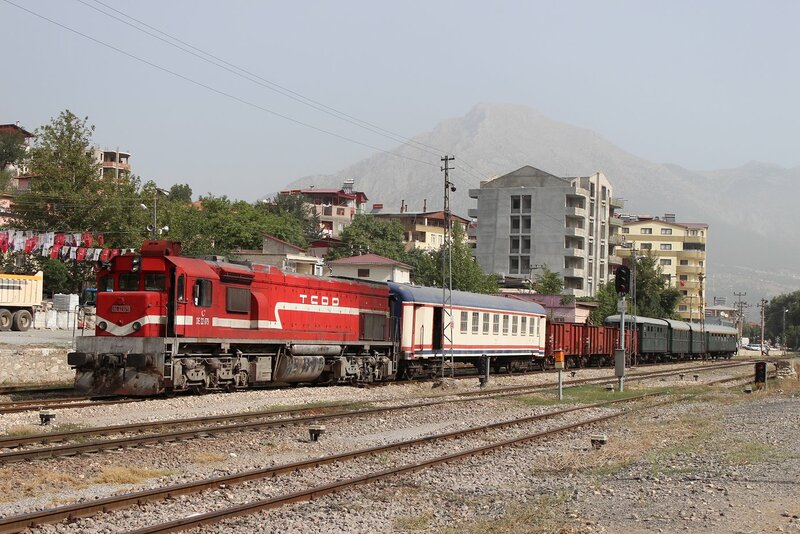 After a brief stop we began the final leg of our journey to Burdur at 6pm, passing through Capali (6.11pm), Keciborlu (6.32pm) and Gümüşgün (6.50pm) before reaching Burdur at 7.30pm. 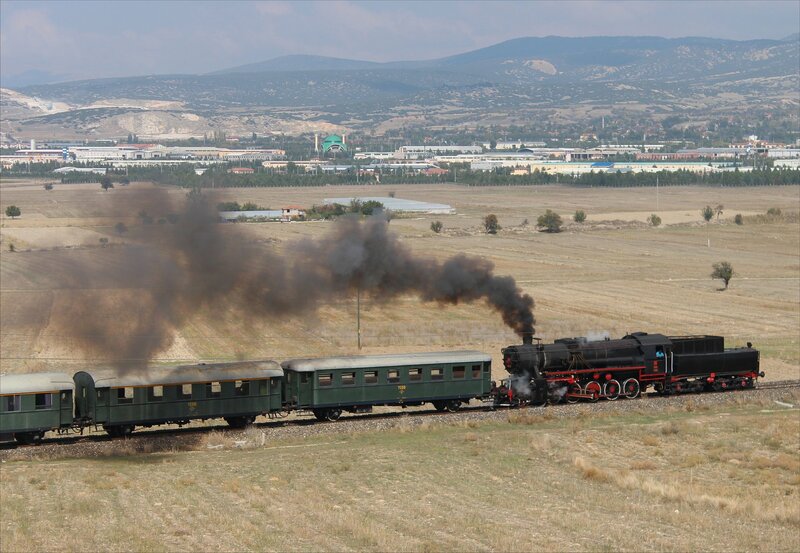 The train departed from Afyon at 9.09am precisely, retracing the steps we had taken last night as far as the junction to the west of the city. 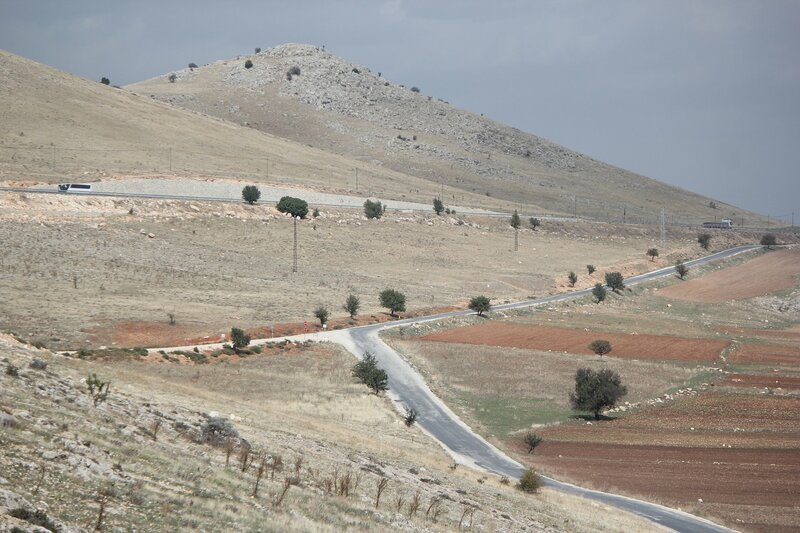 From this point, we took the line south and crossed over the top of a motorway. 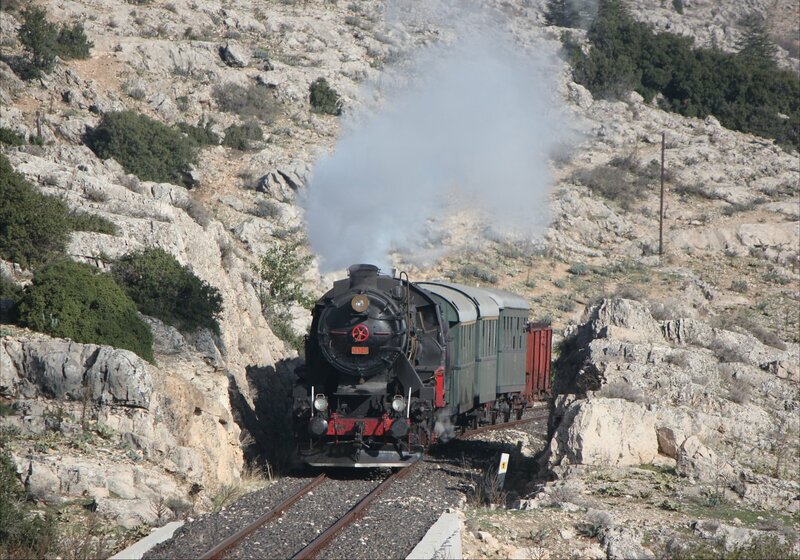 The whistles of our locomotive were soon matched by honking from lorries on the road below us, demonstrating once again the extraordinary reactions that a steam locomotive elicits here. 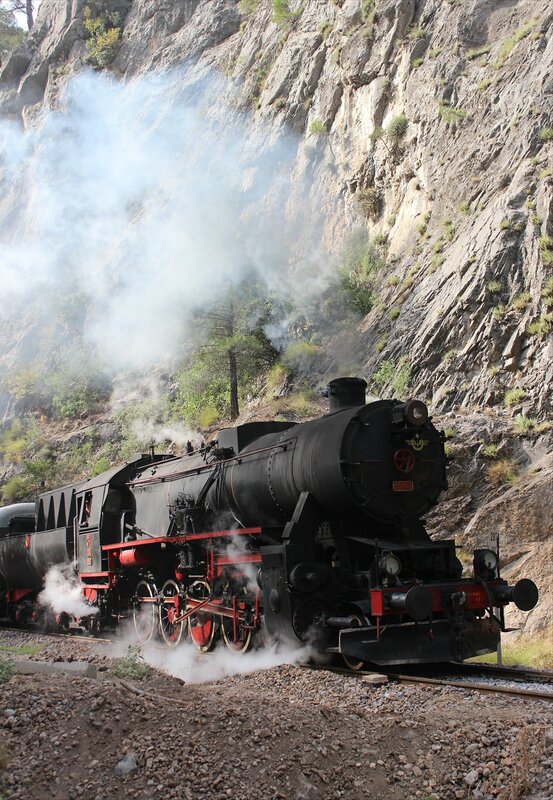 We reached the first station on the line, Tinaztepe, at 9.50am. 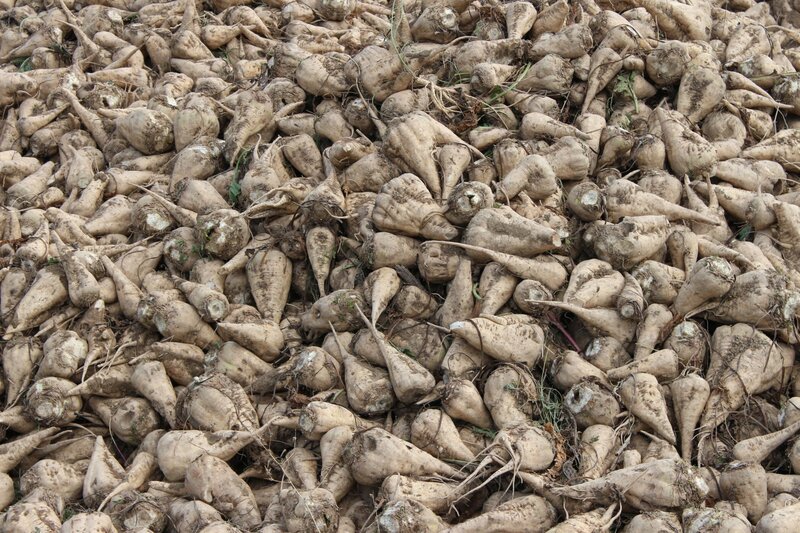 In front of us we could see a small, but beautifully maintained station with a huge pile of sugar beet in the yard. 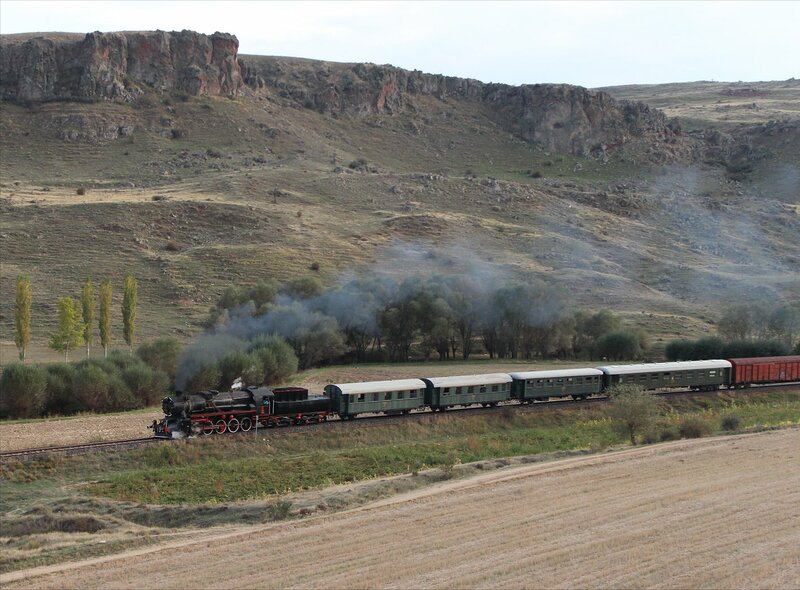 At one time the steam hauled sugar beet trains drew railway enthusiasts and photographers out here in the autumn, but that is a scene long consigned to history. 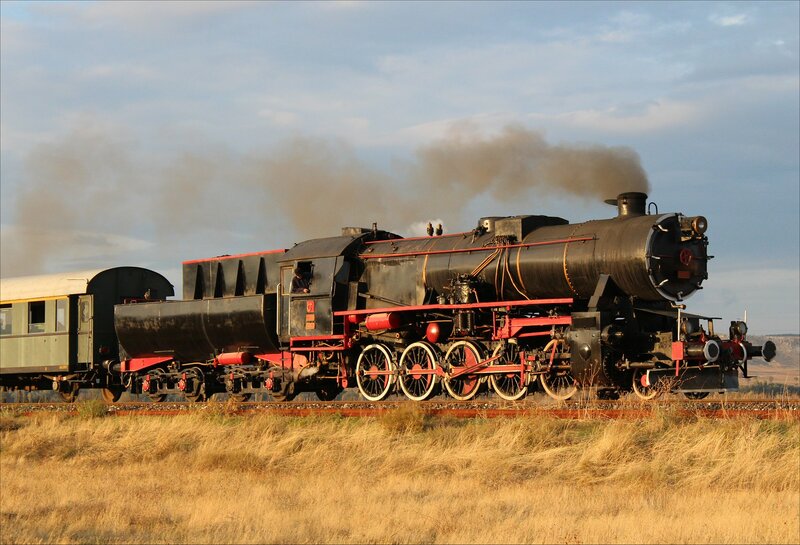 One of the crew took a few of the sugar beet back to the train, clambered up onto the locomotive and placed them in the steam dome – the largest pressure cooker you will ever see! Needless to say, those of us looking up at the spectacle were simply astonished at this demonstration. 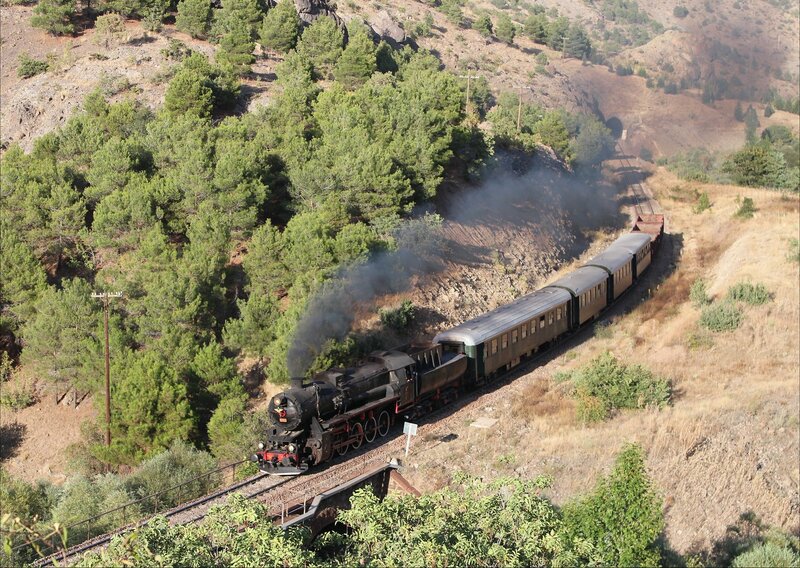 It is a long way from the art of a fry up on the shovel, but quite fascinating to witness. 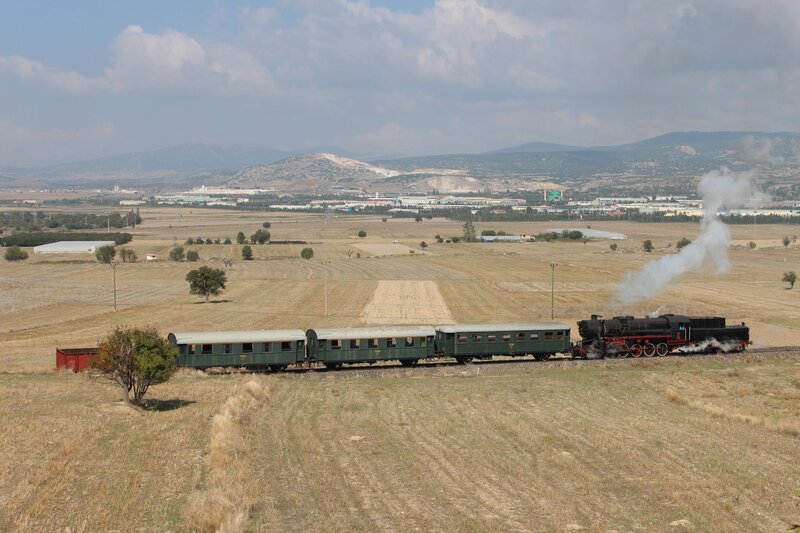 We left Tinaztepe behind just after 10am and spent the rest of the morning enjoying a series of runpasts on the line to Kocatepe, without ever getting as far as the next station. The conditions were decent enough, but improved in late morning with the re-appearance of the sun. 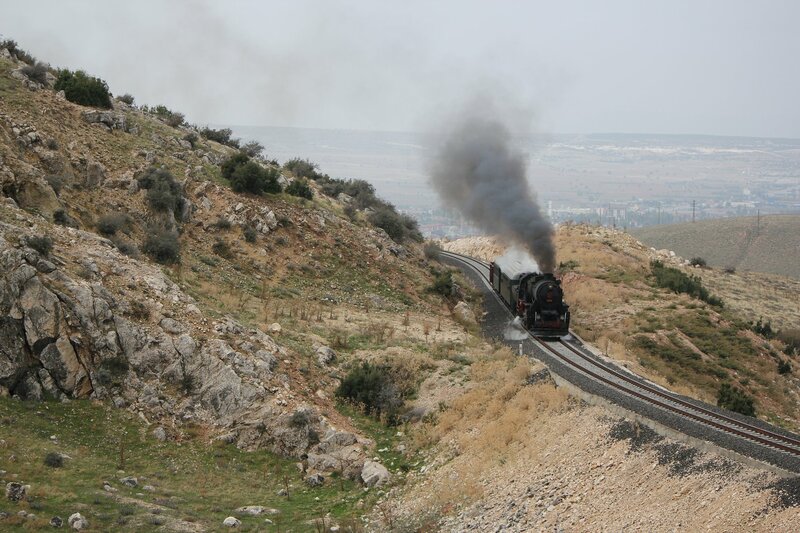 It was certainly an interesting stretch of line with some great vantage points from the hillside. 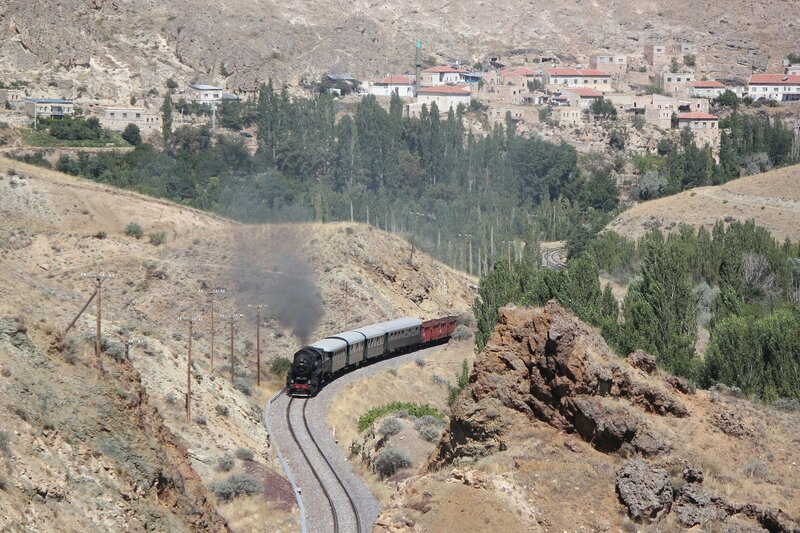 Once our morning’s work was done we rolled back down to Tinaztepe, arriving at 12.25pm. 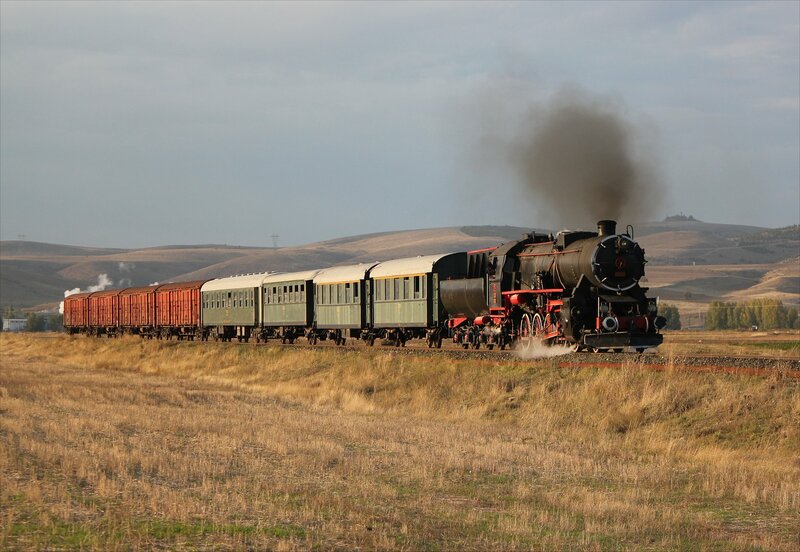 In the time we had been gone the farmer had sensibly collected his harvest, saving it from any more ravenous railwaymen roaming the area! 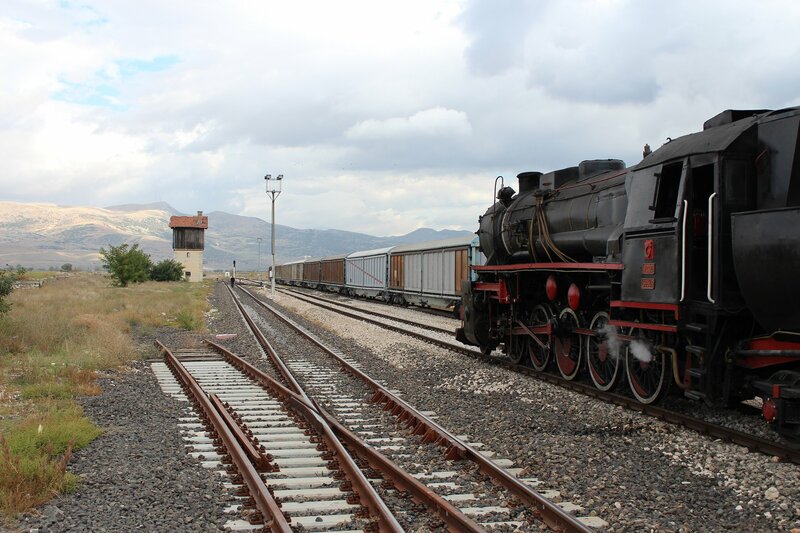 It was hard to avoid noticing how little rail traffic we had seen since arriving yesterday, despite this being a significant railway junction. 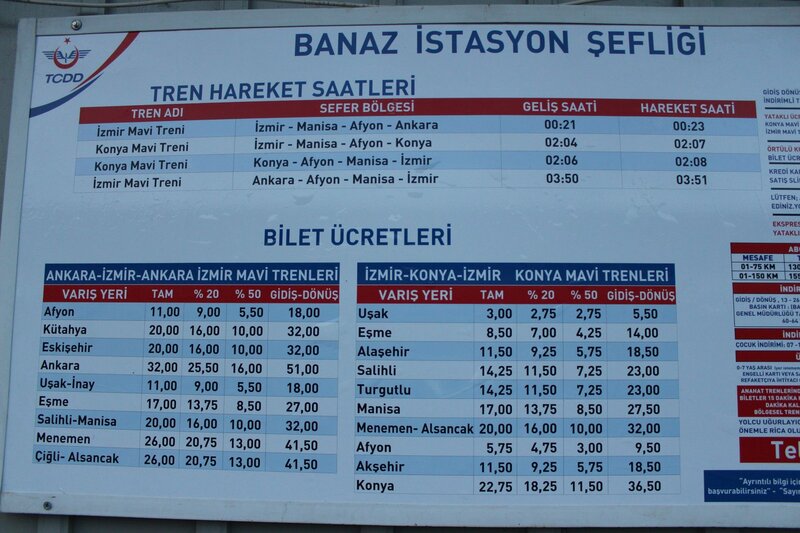 Passenger traffic in the area seemed incredibly light, with just one railbus leaving Afyon in the hour or two we spent milling around before departing (a service to Eskişehir). 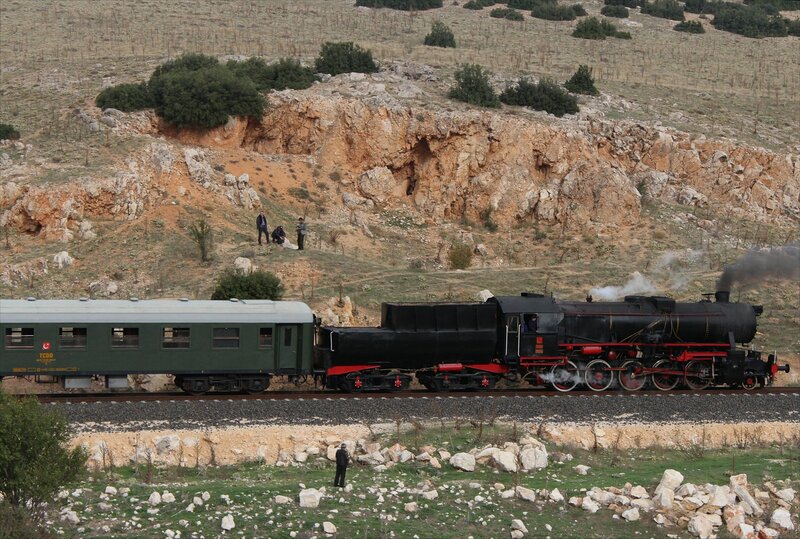 Aside from this, the only other movement we saw was a double-headed diesel freight bound for the Syrian border. 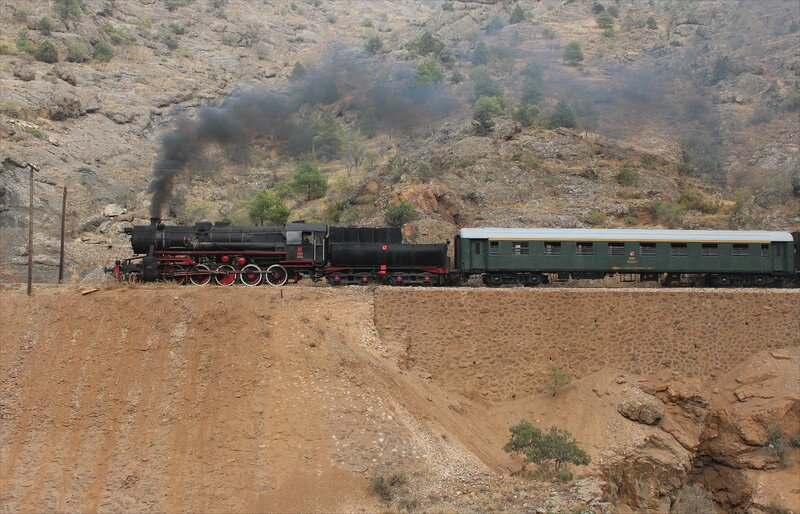 An old gentleman wandered down the platform at Banaz, shaking the hand of everyone he came across, a broad grin on his face. 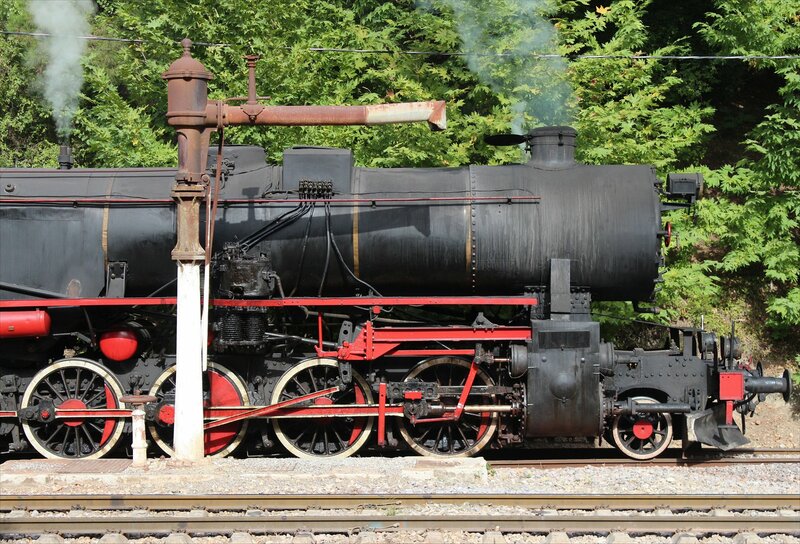 This might seem odd under any other circumstance, but faced with a steam locomotive stirring into life, particularly the last one left working in the country, who is to say that isn’t the most natural response!? I, for one, never cease to tire of the sight. 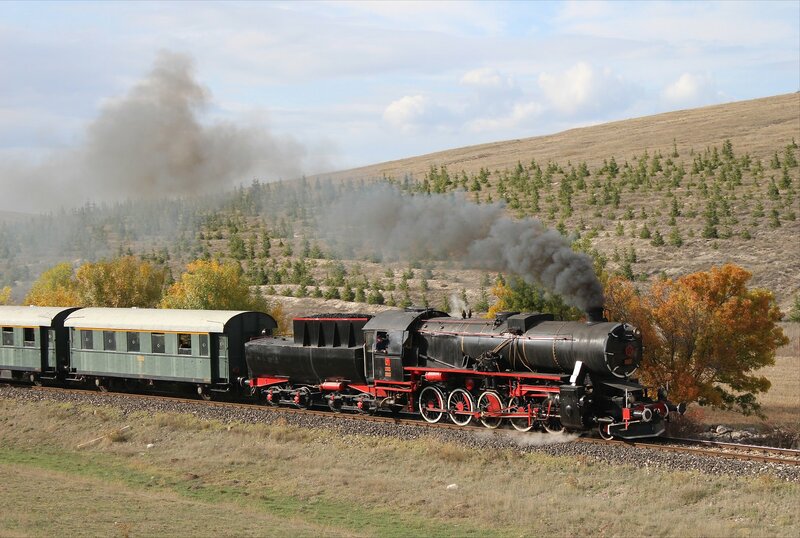 After spending a little while hanging around the station, we began our day’s travel at 9.54am and reached our first stop, Oturak, at 10.24. 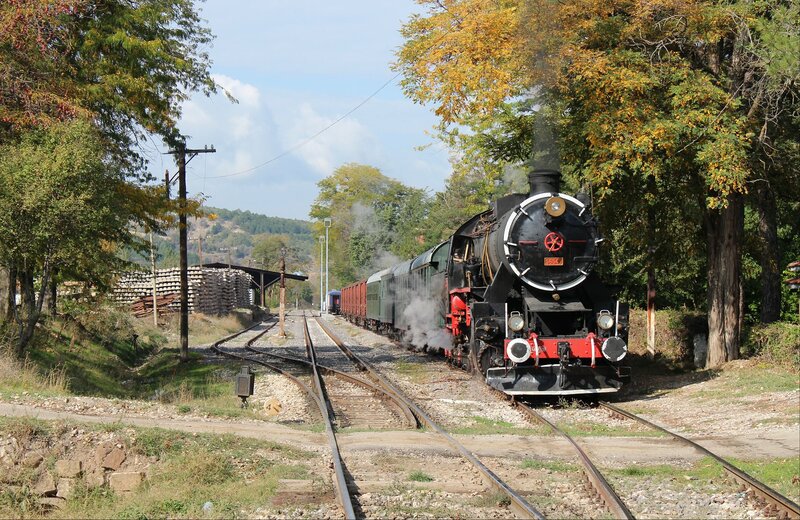 The sun had broken through by this point and was beginning to deliver a beautiful morning, illuminating our locomotive and the autumnal backdrop wonderfully. It was one of those locations with so many delightful possibilities that our merry band of photographers were soon scrabbling around to get the very best out of the moment. I hope I did it some justice! 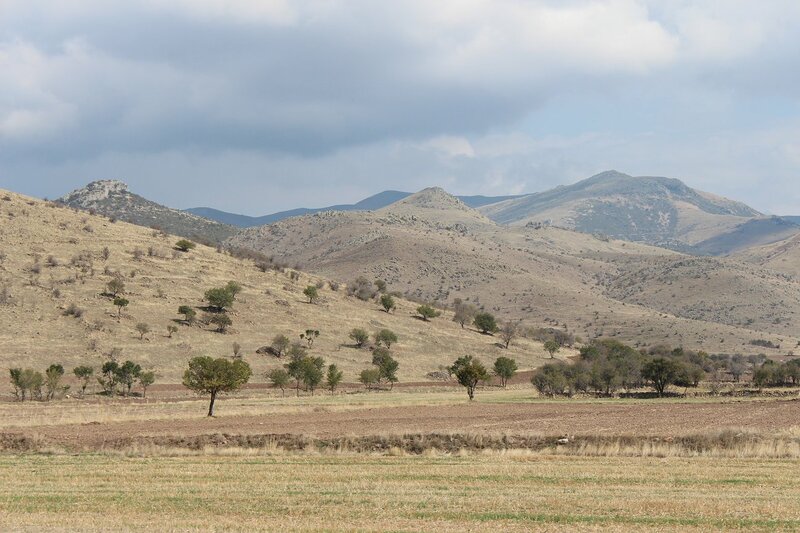 The next leg of our journey took us into the countryside around Dumlupinar, a place which holds special significance in Turkish history as it was here that the last, decisive, battle in the Greco-Turkish War (1919–1922) was fought. 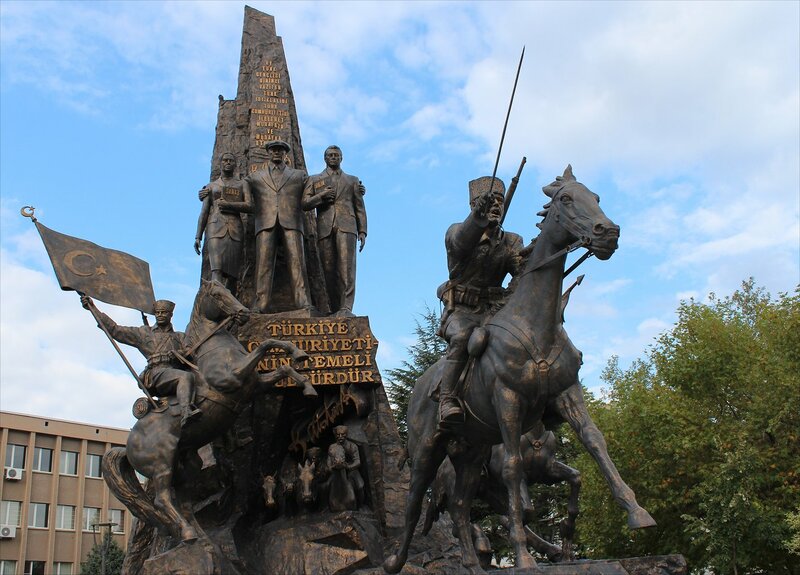 That victory, on August 30th 1922, is still celebrated as a national holiday to this day. 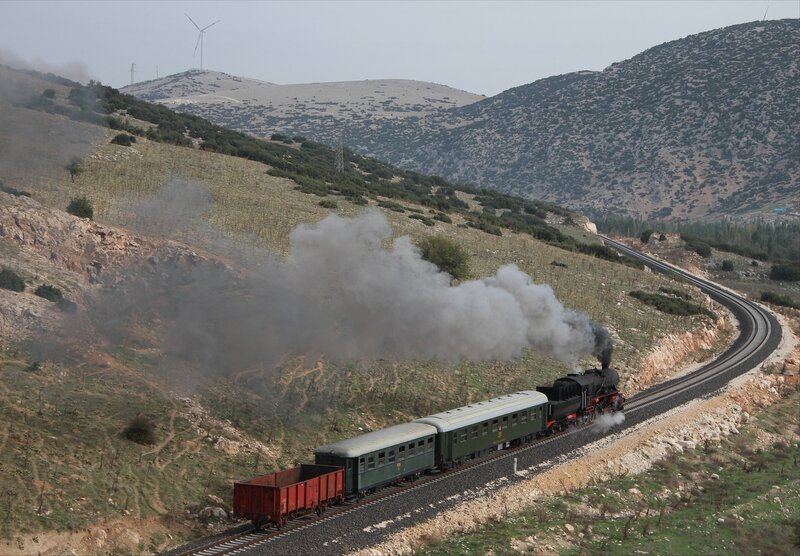 The railway line was the main supply route of the Greek forces and one of the first actions of the Turkish cavalry was to cut this channel of communication. 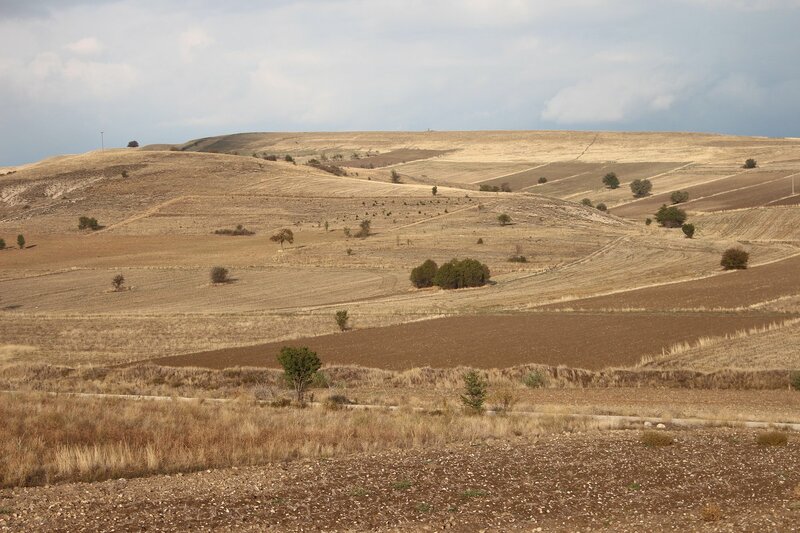 Today, the countryside is so peaceful that it is hard to imagine that so much blood was shed here. 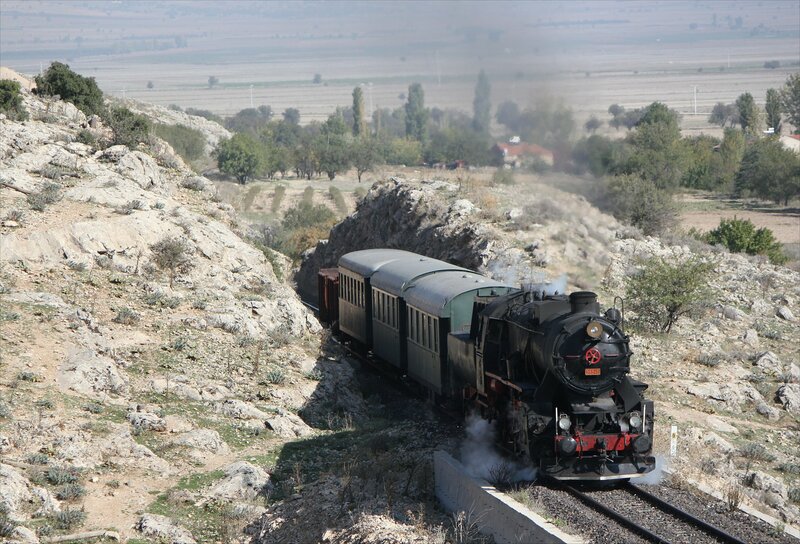 We took our time here, with runpasts around the tunnel and at the summit, before making it to Dumlupinar station itself at 12.04pm. 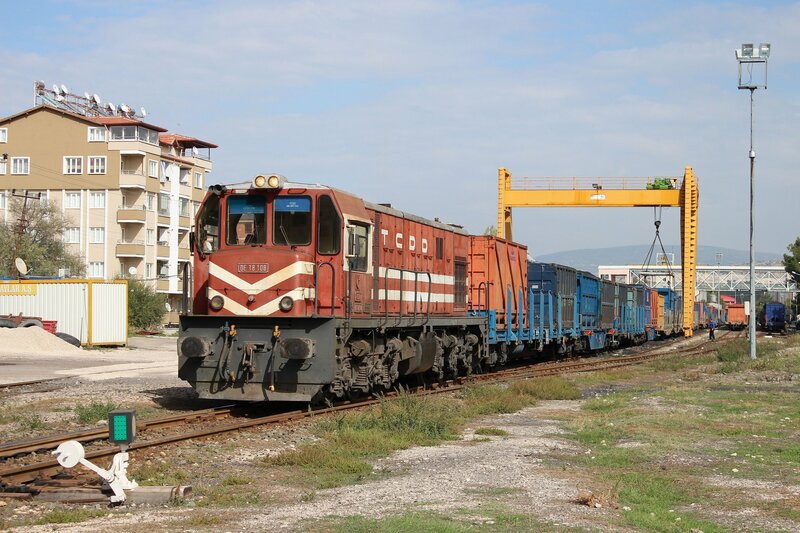 Although it feels like a relatively sleepy line, there are signs of substantial investment in the railways here with huge piles of sleepers and ballast. After getting permission to proceed, we departed at 12.27pm. 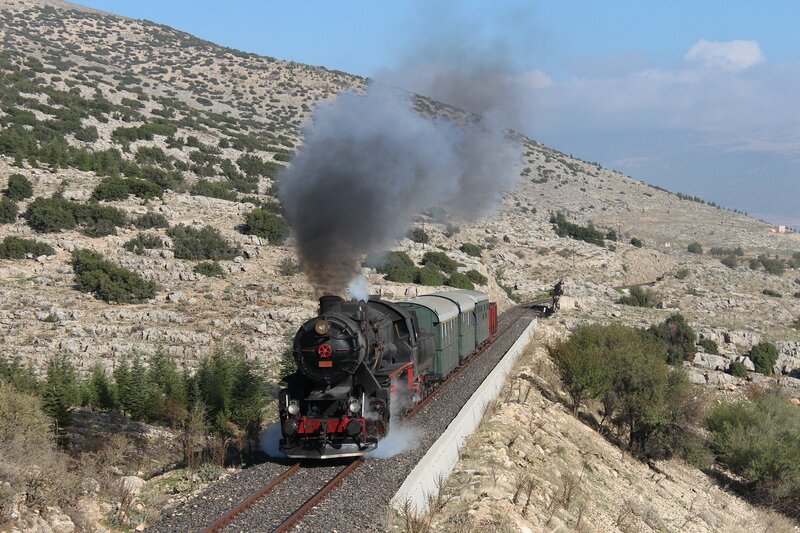 Our kriegslok might have be the last operative steam locomotive in Turkey, but it was certainly delivering everything we could have hoped for photographically with a storming run over the summit and a terrific impression of a volcano. 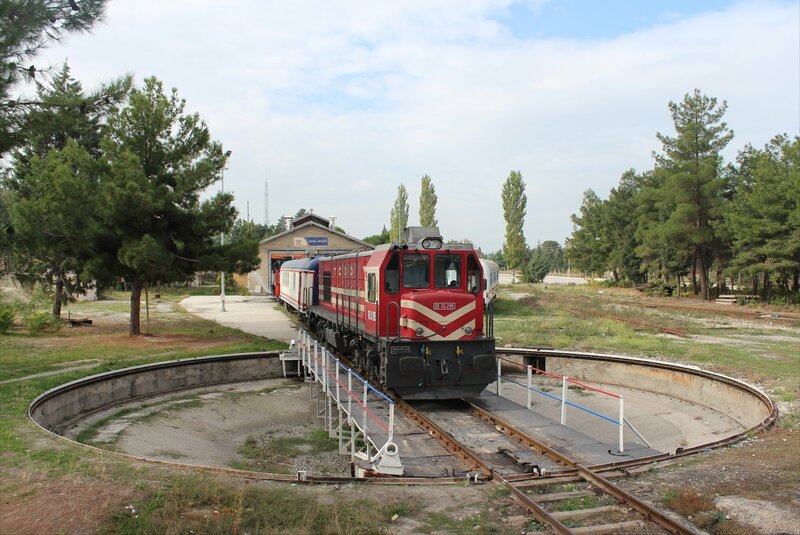 Our onward journey took us through Kizilcakoy (12.35pm) and on to Yildirim Kemal (12.47pm) where we had an extended stop and a series of four runpasts utilising the scenic station and water column. This must have made a bewildering sight for a couple of locals, who sat watching the madness of all this unfold from their viewpoint on the sidelines. 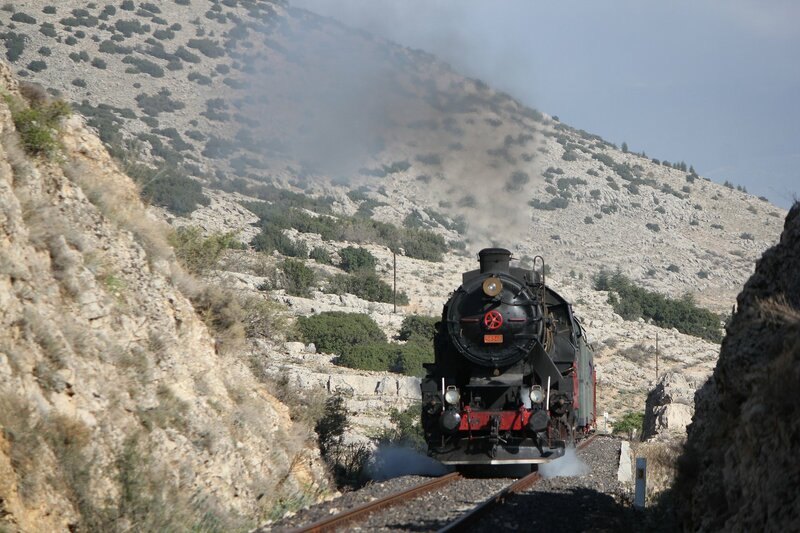 After leaving Yildirim Kemal at 1.50pm we were treated to a series of runpasts on a rather scenic stretch of track leading up to a grand curve. The last stop in the sequence offered the tempting combination of a flock of sheep in the foreground, but the sheepdogs had other ideas, shepherding the flock away from any viable shot. 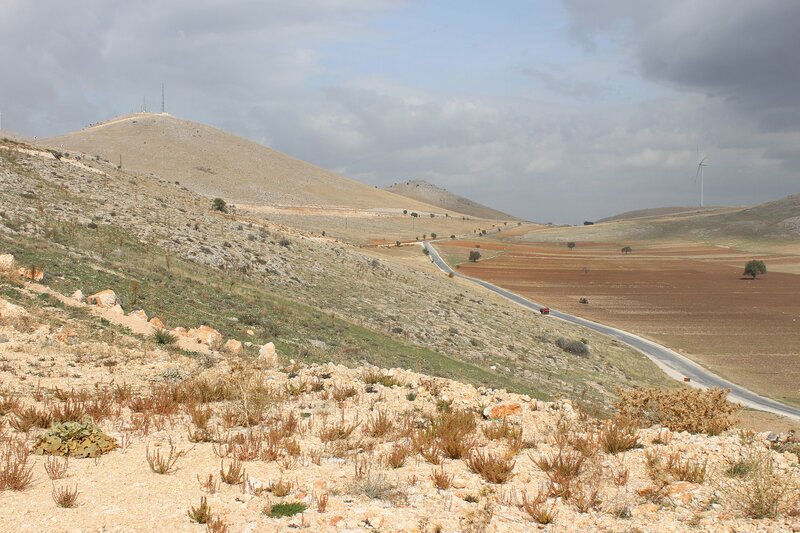 Nevertheless, the shepherd offered an irresistible alternative for some members of the group. 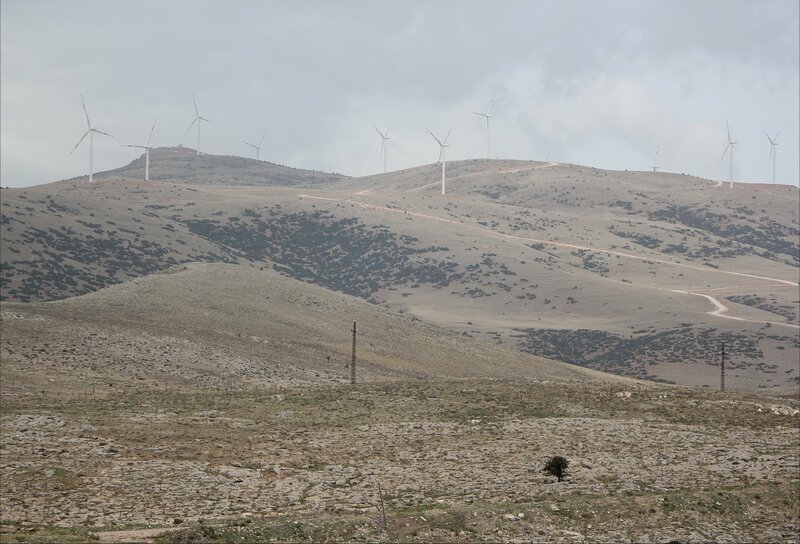 It was one of those locations with an incredible array of possibilities and only one runpast to use them on. How to choose!? The afternoon continued to offer some wonderful photographic opportunities, especially when the sun re-appeared to illuminate the autumn foliage. 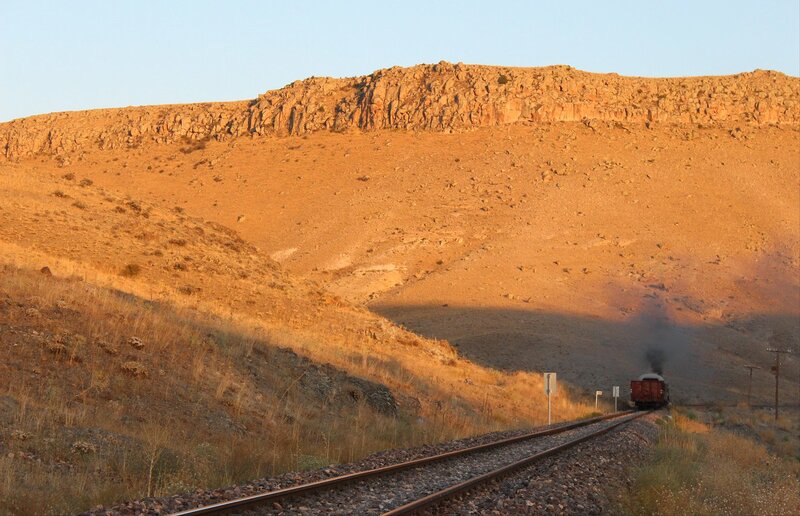 Our onward journey took us through Bal-Mahmoud (4.30pm) and then on to the outskirts of Afyon, where we made the most of the setting sun to capture the glint. 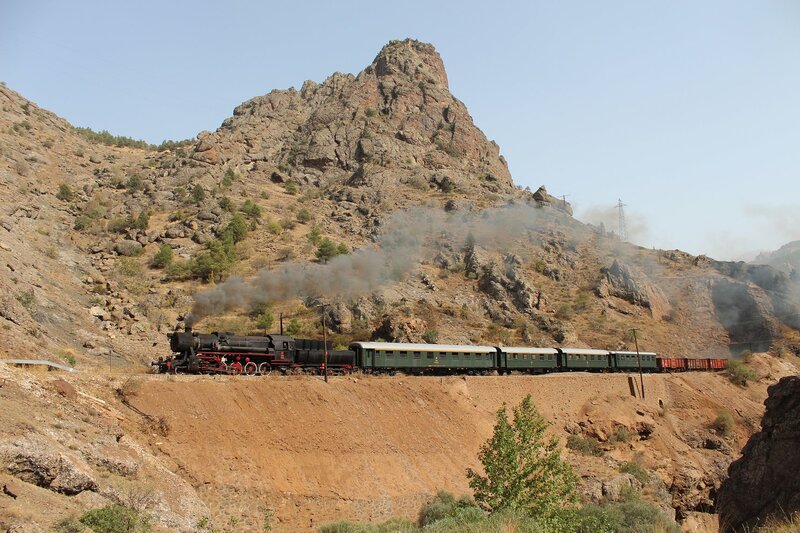 About twenty minutes after leaving this spot we reached Afyon station (6.12pm), having been treated to a distant view of the fortress rock on the way in. 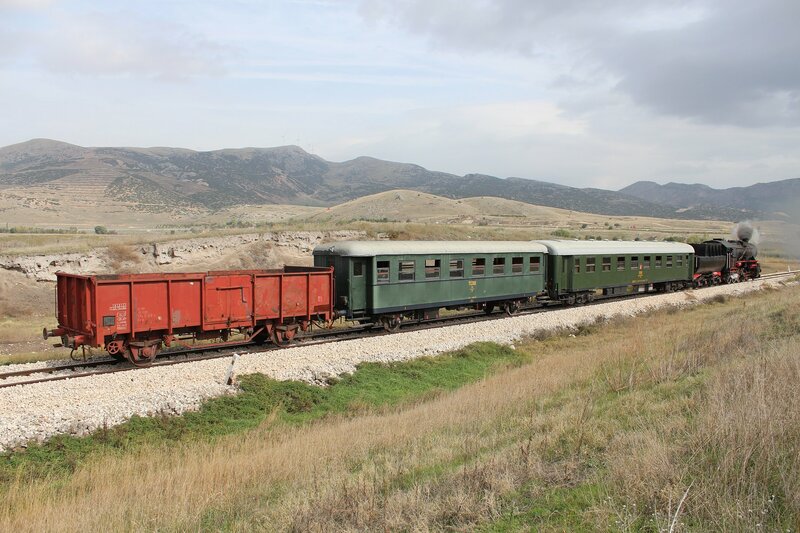 Our merry band of photographers clambered out of the vintage carriages and formed a suitcase wheeling convoy to a nearby hotel, ready for a welcome spot of rest and relaxation. It had been a good day’s work and very satisfying with it! 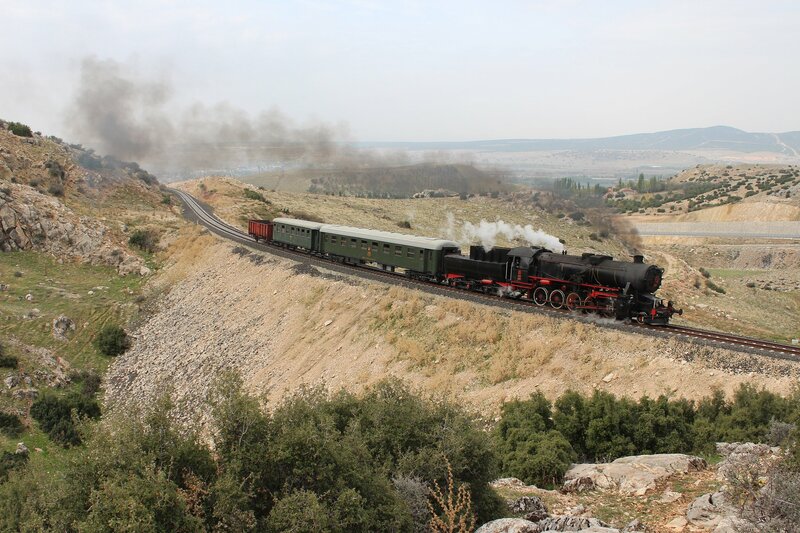 Our tour departed from Usak in late afternoon (around 3.30pm) after the final members of the party had arrived on the express from Izmir. 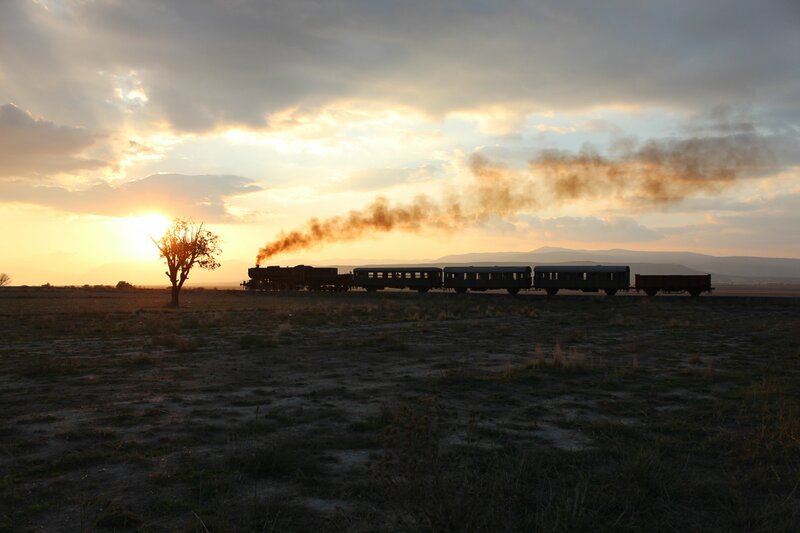 The first leg of our tour was to take us a relatively short distance, from Usak to Banaz, in the hope of getting some good sunset shots. It all started well enough with a couple of good stops in full sun, before the black clouds rolled in – bringing with them thunder and lightning. It would have been possible, with a bit of luck, to get lightning in the background of a shot though I certainly didn’t manage this. Nevertheless, we still managed four or five runpasts before the rain really kicked in at 5.15pm. Needless to say, there was no glorious sunset to be photographed. If the resulting shots were far from stunning, it was nevertheless a good taster for the tour and got me in the right frame of mind for the photography that lay ahead. I have a habit of taking some really rubbish shots at the start of any tour, so I was relieved to have gotten my rusty moments out of the way! 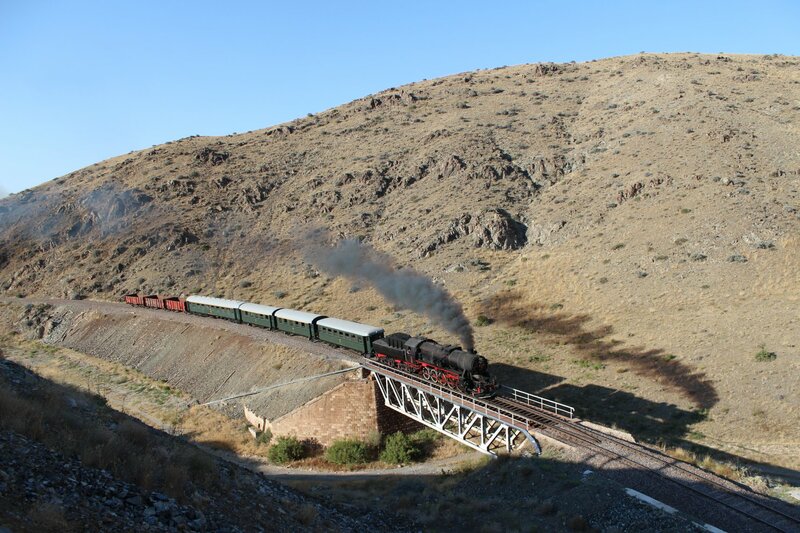 Banaz station is not exactly a busy place during daylight – it sees just four passenger trains a day and all of these arrive between midnight and 4am! This left us plenty of time to play with for a night shoot, but first we sought out some food. 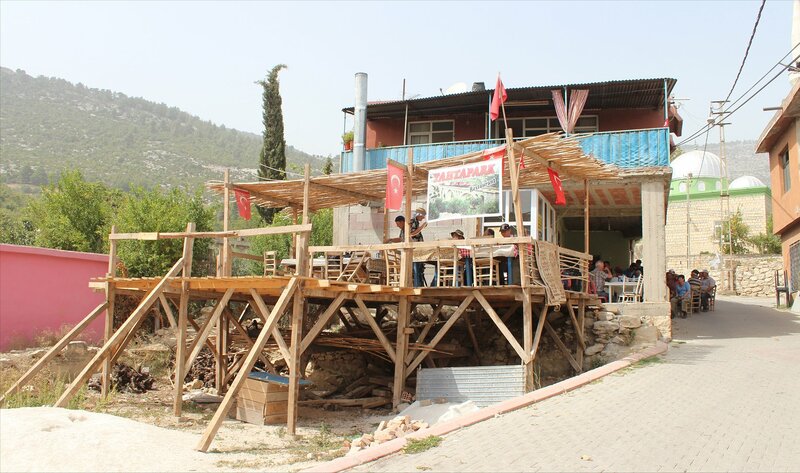 A restaurant in town somehow managed to cope with an invasion of photographers and served up some pretty tasty lamb/cheese pide with a soft drink (a bargain at 15 Turkish lira apiece) before we returned. I wasn’t feeling particularly inspired, so opted to sit this night shoot out and enjoyed the spectacle from a distance. 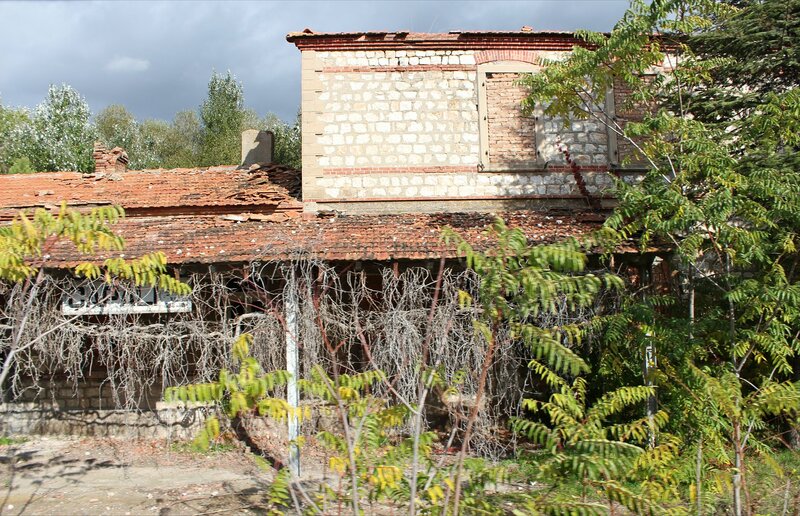 Once the last shots had been fired we boarded a couple of buses for the short run back to Uşak, reaching our hotel at 10pm. 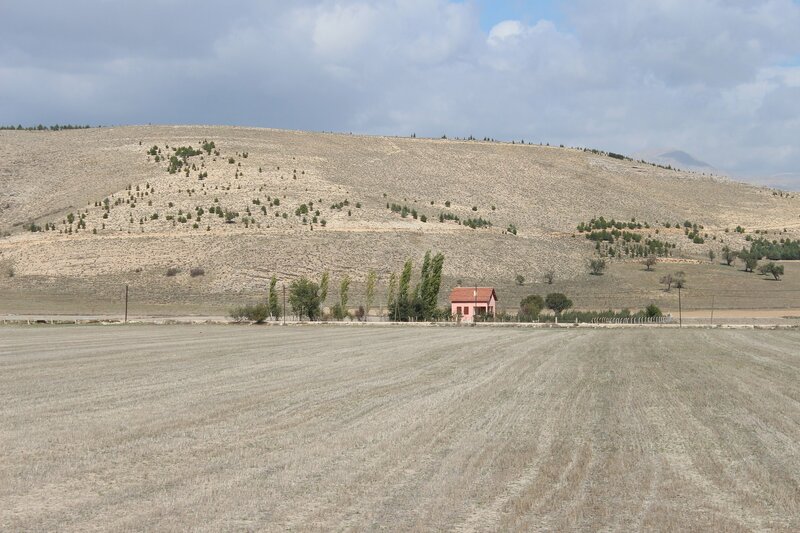 Our tour through the autumnal landscapes of Western Turkey is due to begin in earnest today with a relatively short run from Uşak to Banaz. 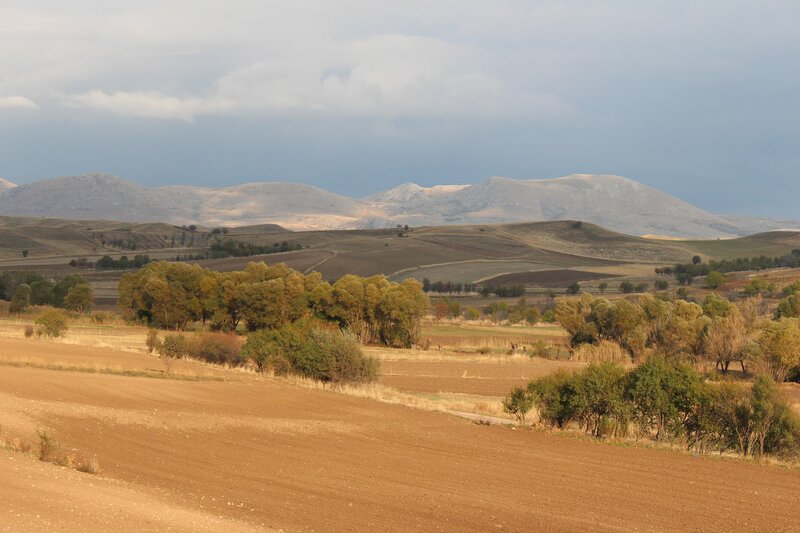 The tour will eventually take us on to Afyon, Dinar, Burdur and Isparta. 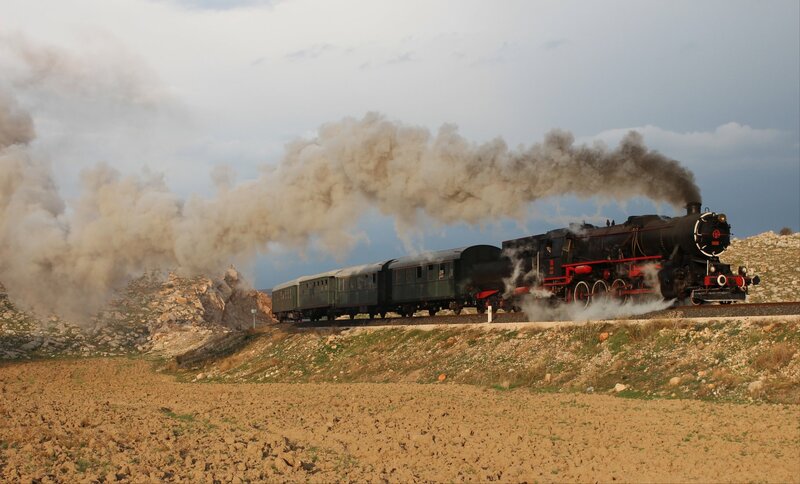 The motive power for the steam hauled elements of the trip will come from one of the thousands of class 52 kriegsloks, or war locomotives, that ended up across Europe during the second world war. 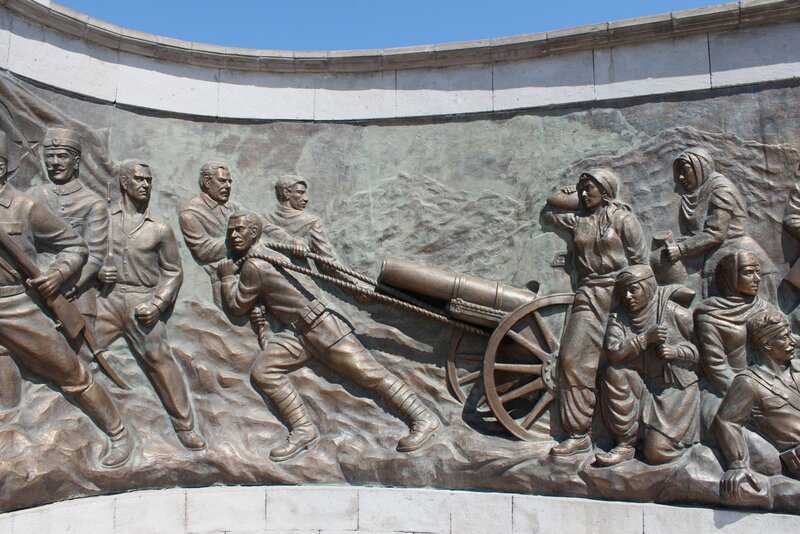 Survivors can be found in many countries today, particularly in the East. 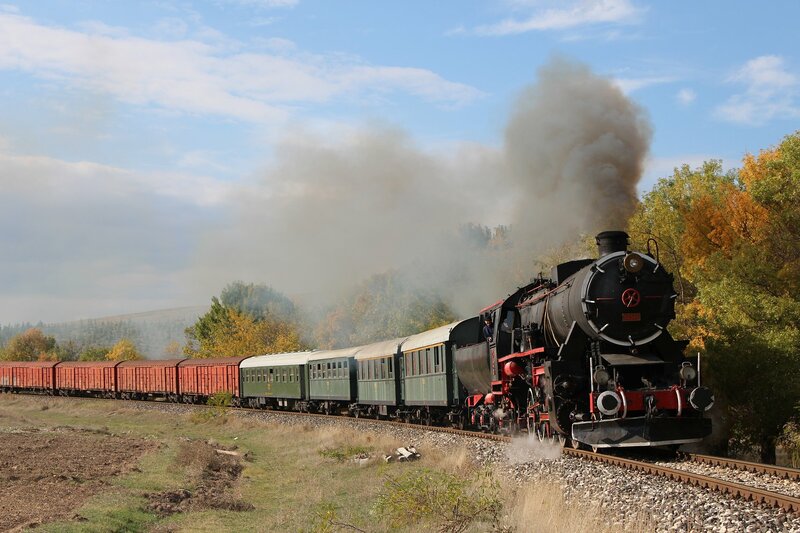 I have already encountered members of the class in Bosnia, Serbia, Poland and Russia. 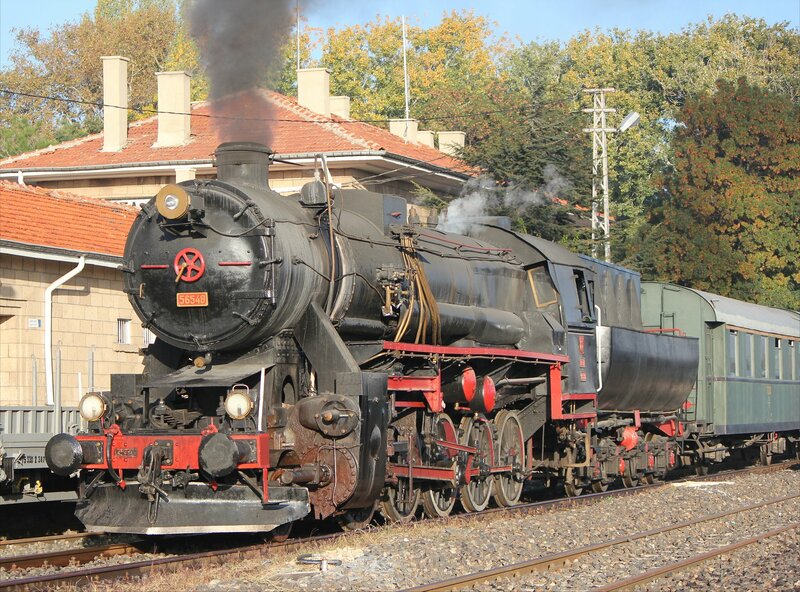 Our kriegslok, TCDD 56 548, was manufactured at Wiener Lokomotivfabrik Floridsdorf, near Vienna, in 1943. 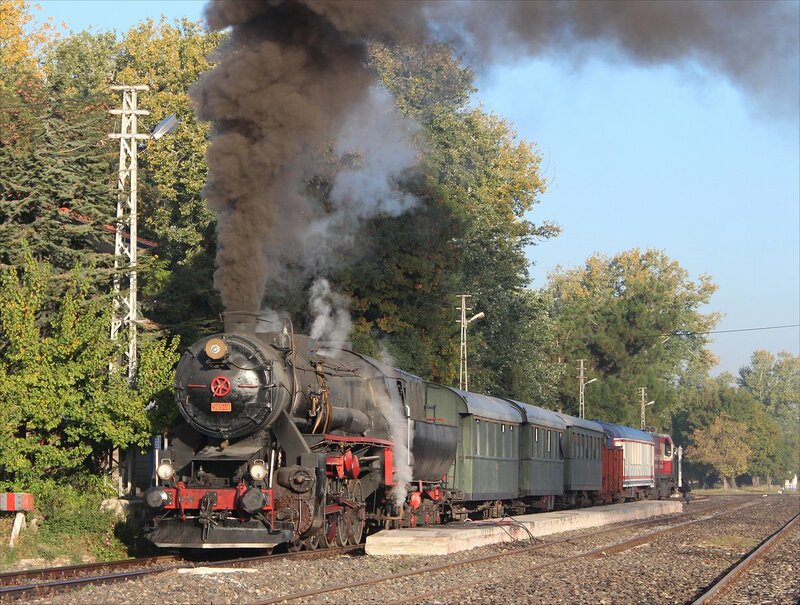 It was one of 43 classmates built for the Deutsche Reichsbahn which were initially loaned to Turkish Railways but later purchased outright. 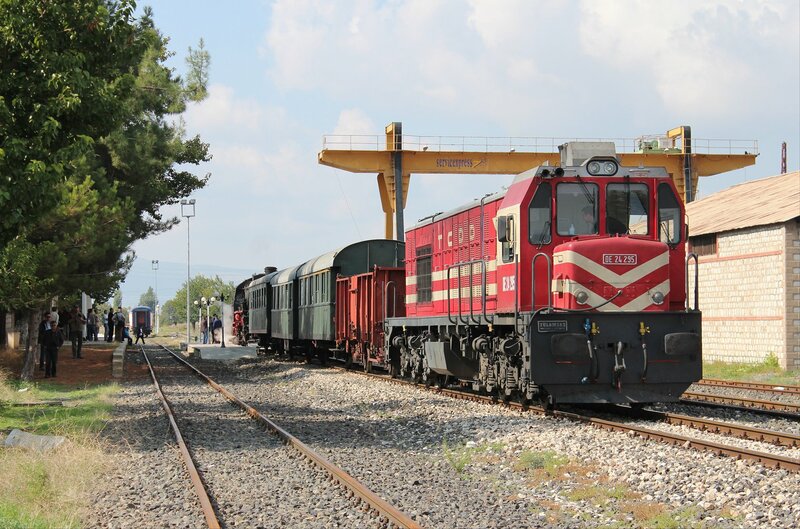 During the tour 56 548 will haul an authentic passenger train formed of four refurbished green coaches (from the Usak Museum Depot) and a series of freight cars/wagons – it is a combination that wouldn’t have looked out of place in the 1970s or 80s. 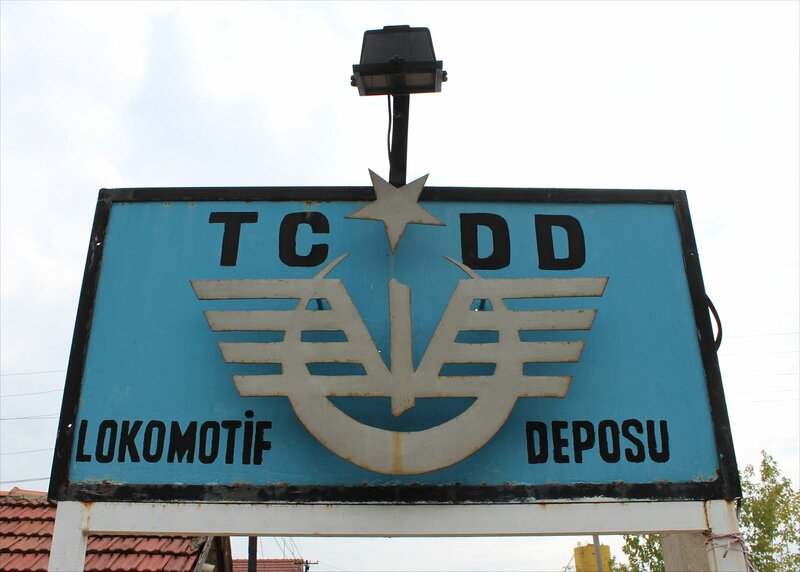 Indeed, TCDD 56 548 was active on the branch lines we will visit until 1989. 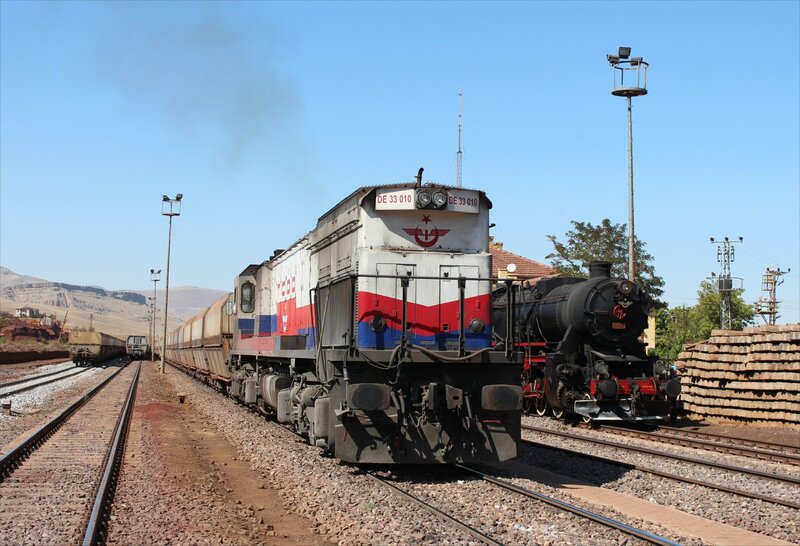 At the rear of the consist we will have a diesel locomotive which will be used to haul us through the longer distance stretches that we will need to cover during the tour. 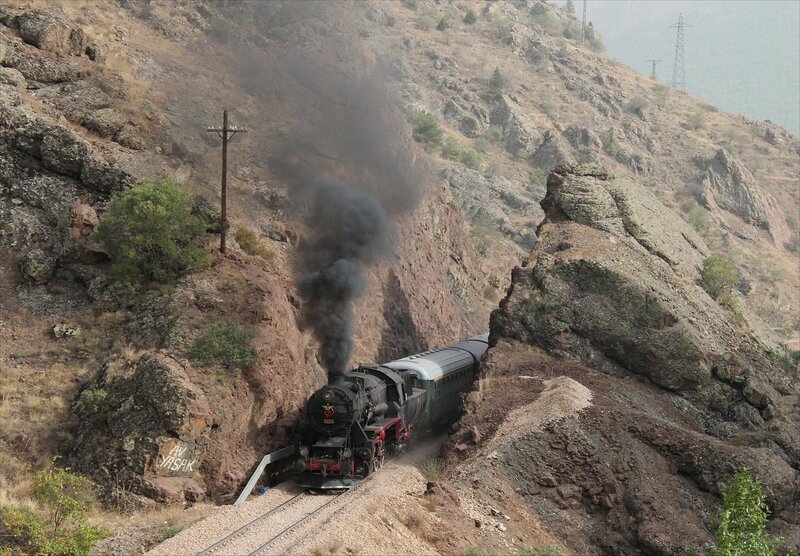 It is a sensible precaution, sparing us from the need to re-coal the steam locomotive en route. 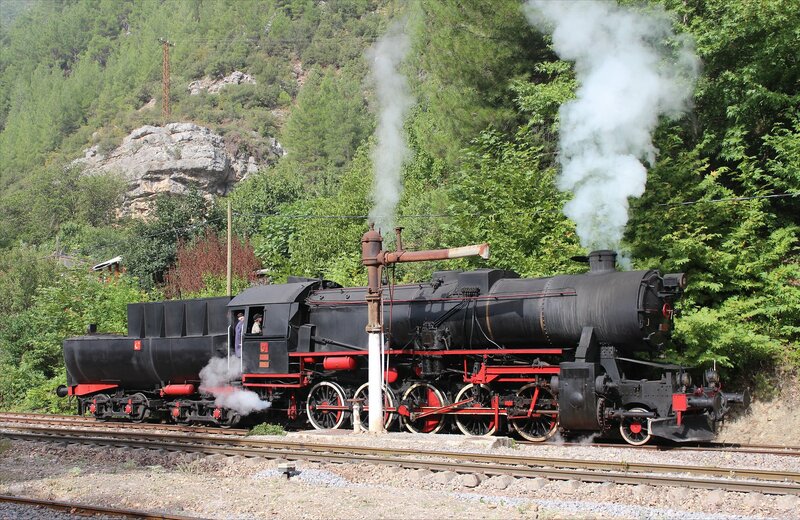 The diesel tasked with this job is DE 24 295, one of the 418 strong class that effectively replaced steam. 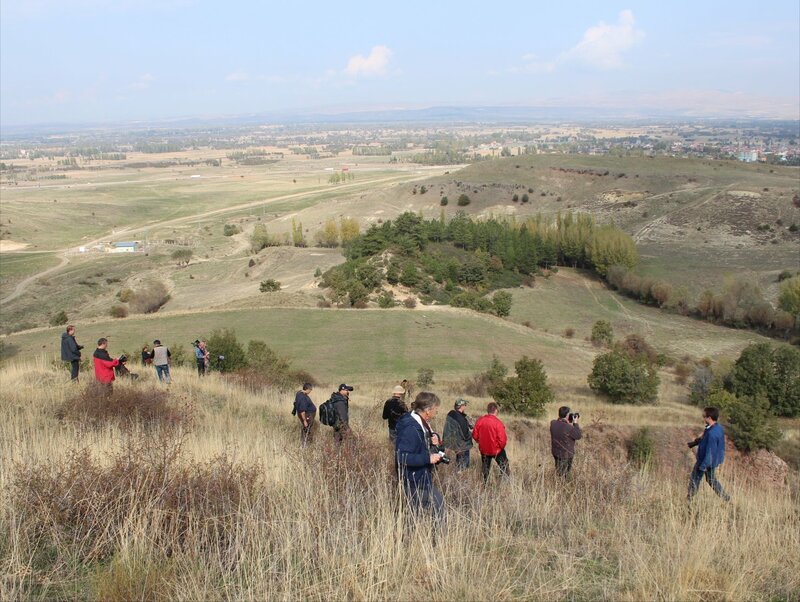 After a surprisingly good night’s sleep I headed out for a stroll, having seen almost nothing of Uşak on our arrival. 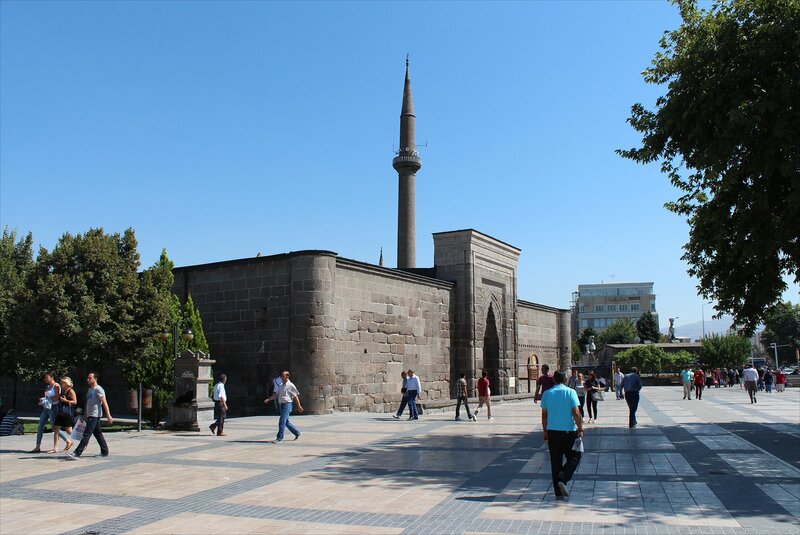 The city is some way off the normal tourist path with a largely agricultural/industrial base, but my short walk soon revealed a couple of sights worthy of attention – a monument to Atatürk and a sixteenth century mosque, whilst also noting other historic buildings undergoing renovation nearby. 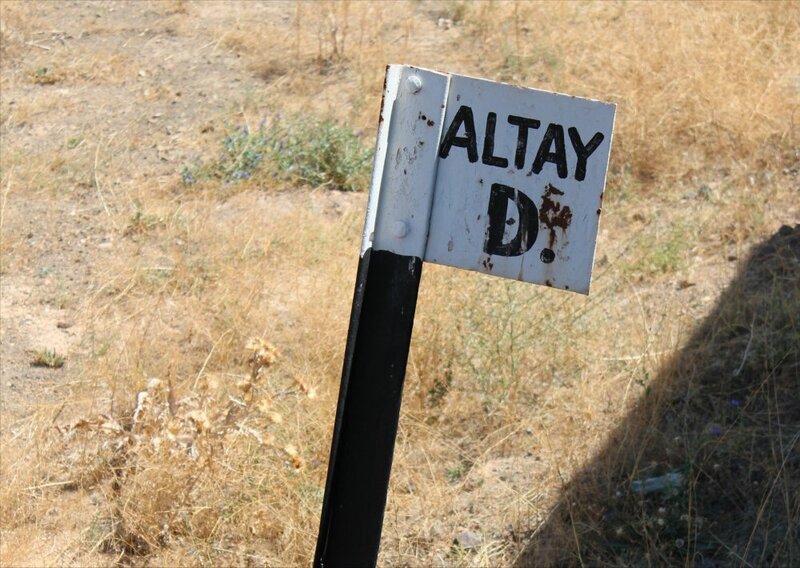 It sometimes feels as though every village, town or city has a monument to Atatürk, so it was not altogether surprising to find one here. 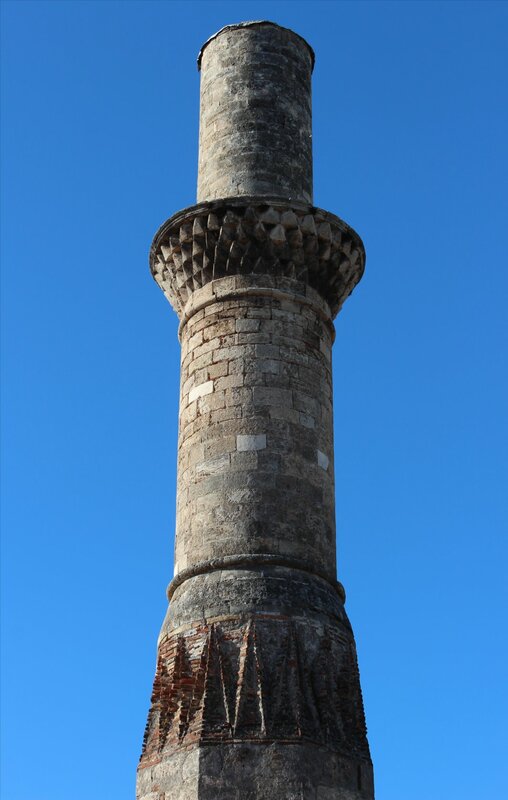 An article in Hürriyet Daily News in 2011 revealed that there are over a thousand such monuments in the country and that their construction has become an industry in itself. 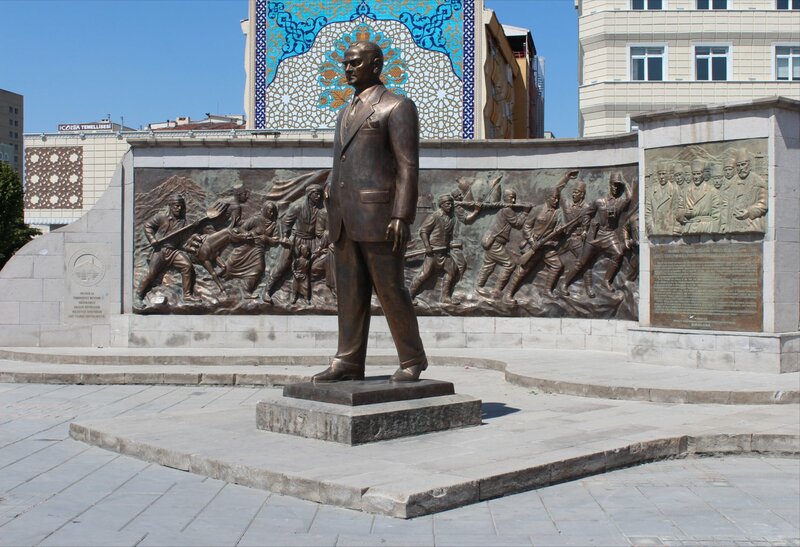 However, the monumental sculpture to Atatürk in Uşak is a truly impressive sight and is clearly of quite a different order to most. 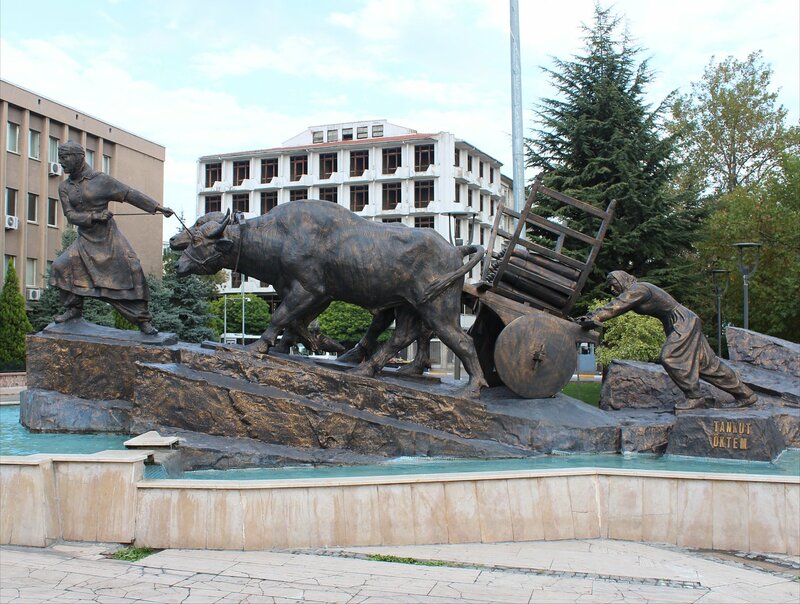 The work, by Tankut Öktem, features a horseback charge and oxen pulling a wagon full of shells. 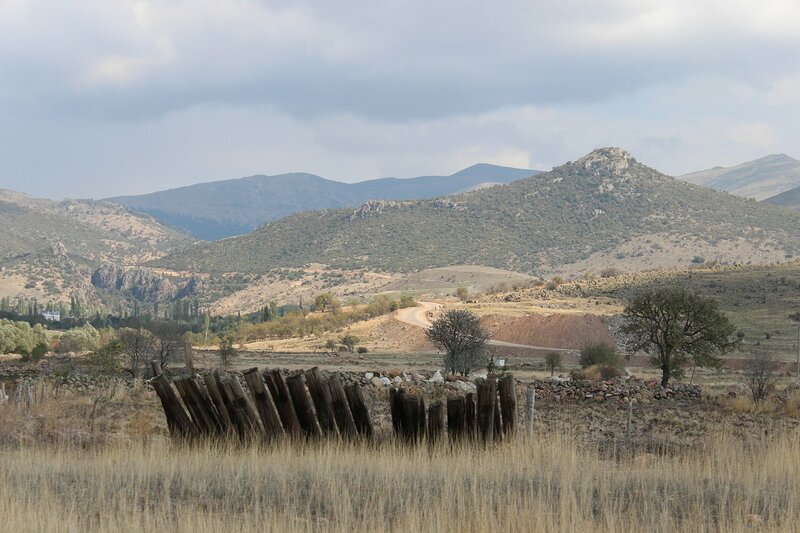 One of the most significant battles in the Turkish War of Independence (1919-22) took place not so very far from here at Dumlupınar, giving this additional resonance (the city itself was occupied by Greek forces between 1920 and 1922). 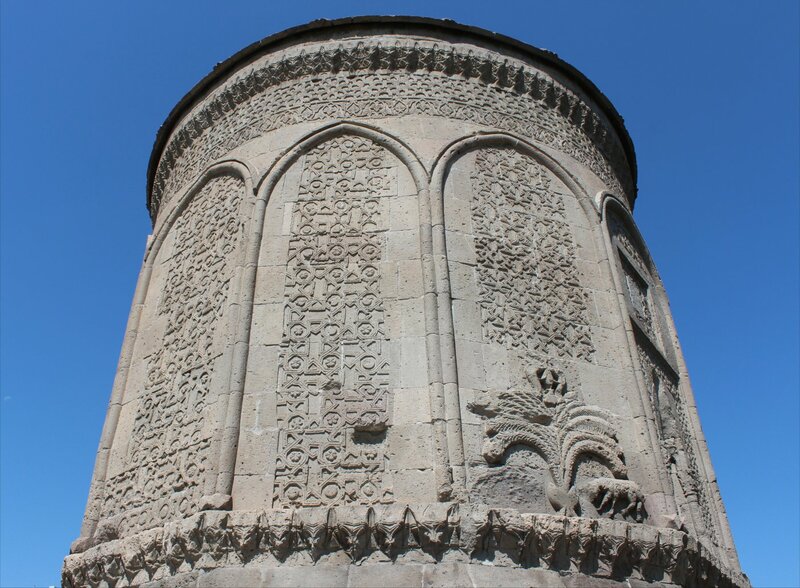 The Burmali Camii (mosque) dates to 1570, although its impressive spiralling minaret looks like a much later addition. 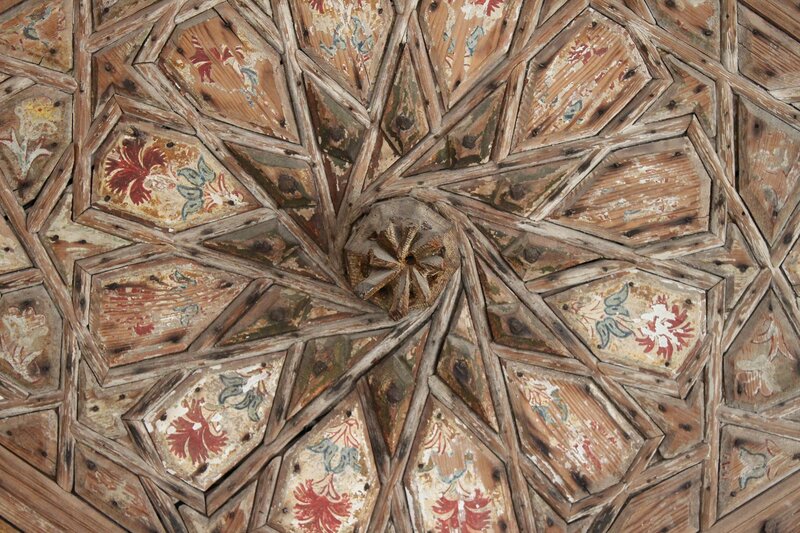 It appears to have undergone quite a bit of restoration over the years, with substantial repairs following a fire in 1922. 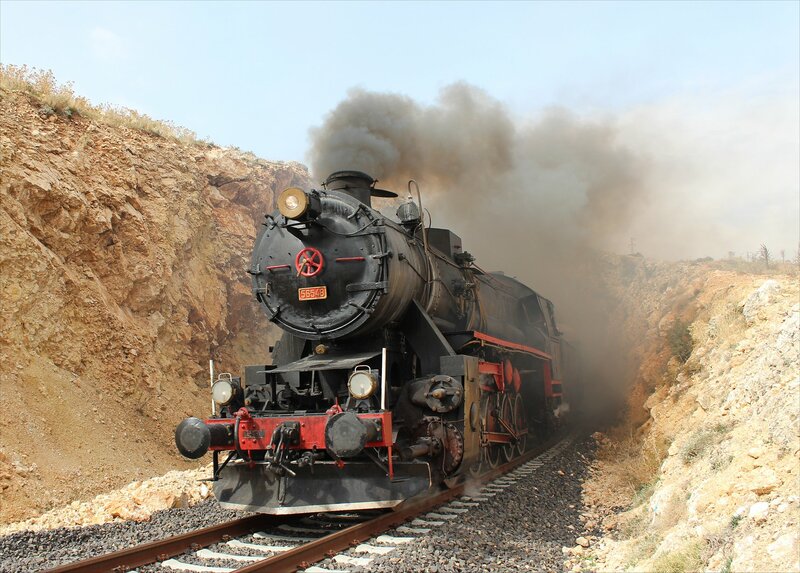 After noting these sights I headed up the road to a spot beyond the railway depot where a sadder sight awaited – a line of abandoned locomotives that seem to be destined for the scrapyard. 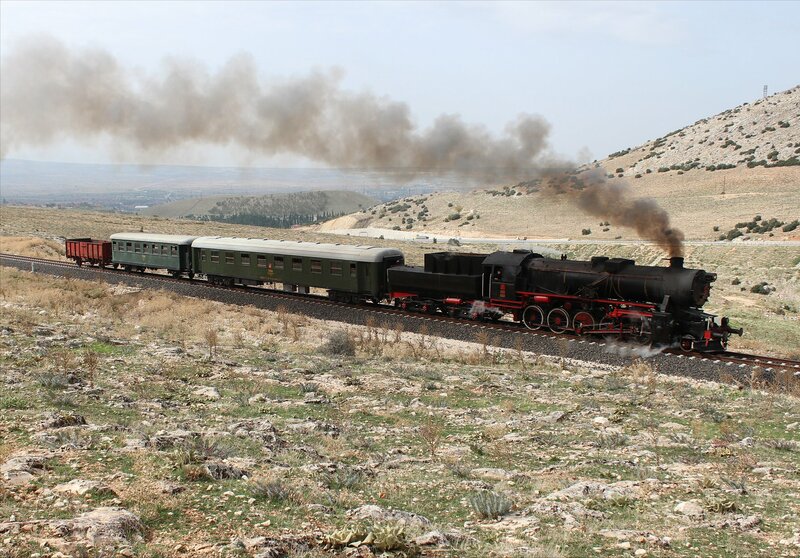 As things stand today, the steam locomotive for our tour is the last operative steam loco in the country. 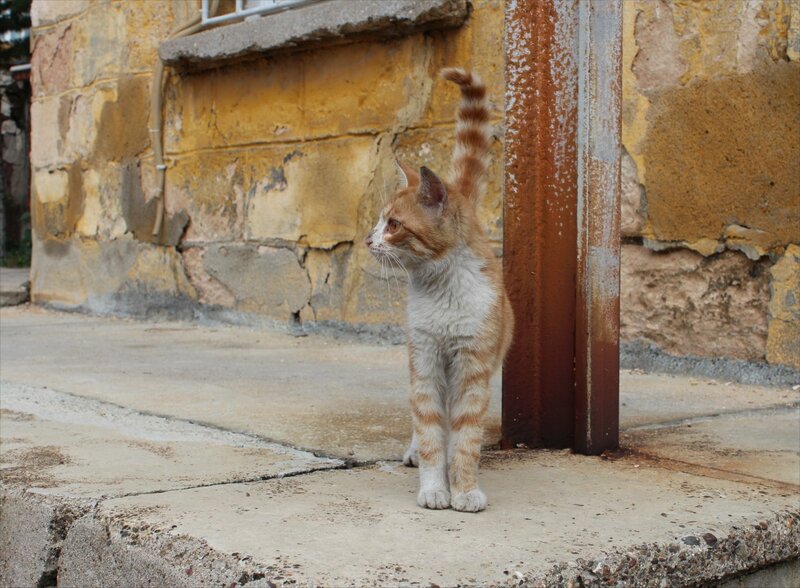 As there didn’t seem much else to do nearby, I found a spot on the wall overlooking the railway and ate my lunch in the company of the rather talkative depot watch-cat! 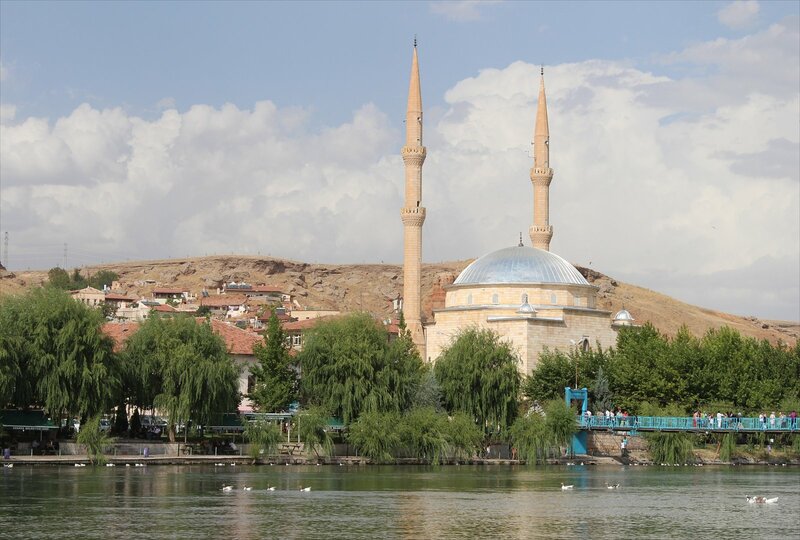 The end to my cultural visit to Istanbul heralded the beginning of the week long photo charter, but first I had to get to Uşak in the Aegean. 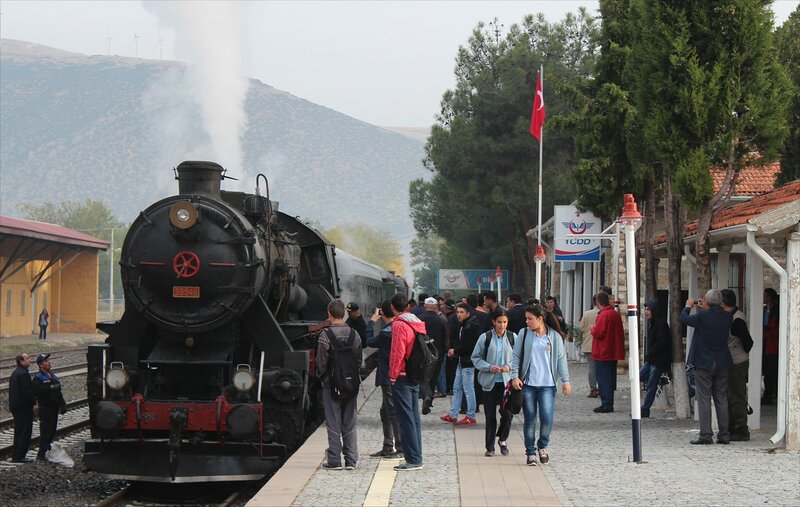 I met up with a few of the participants outside Sirkeci station, from where we took a couple of taksi to the airport for a flight to Izmir. The frequency of flights between the two cities is rather impressive, demonstrating that air not rail holds the upper hand here. I was a little surprised at the ease with which I could purchase a walk-on ticket and equally impressed by the short flight that followed. On landing our small party took a taxi to the Otogar (coach station) which was located on the outskirts of town, arriving just before 4pm. Most coaches here run on the hour, or sometimes half hour, so this was good timing. We wandered down the line of departing buses, hoping that we could grab some last minute tickets for our destination. 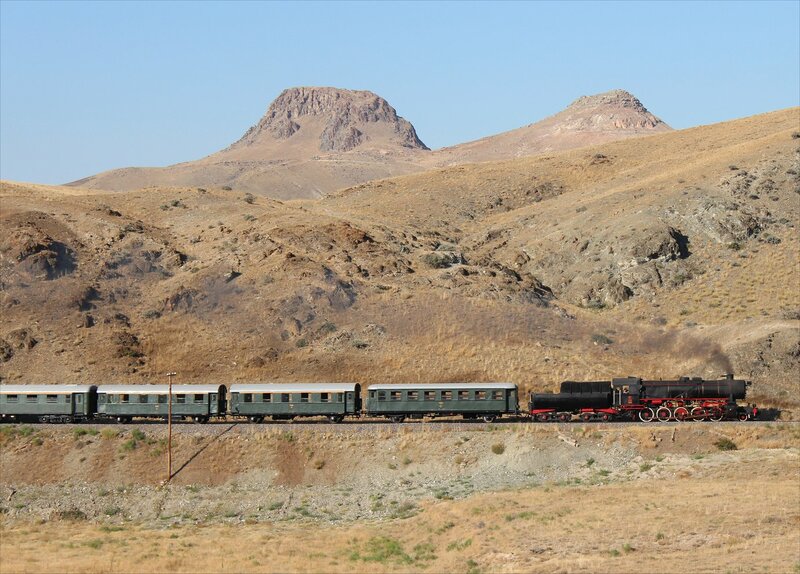 As luck would have it, one of the buses for Ankara was willing to stop at Uşak and had four seats remaining – the exact number that we needed! 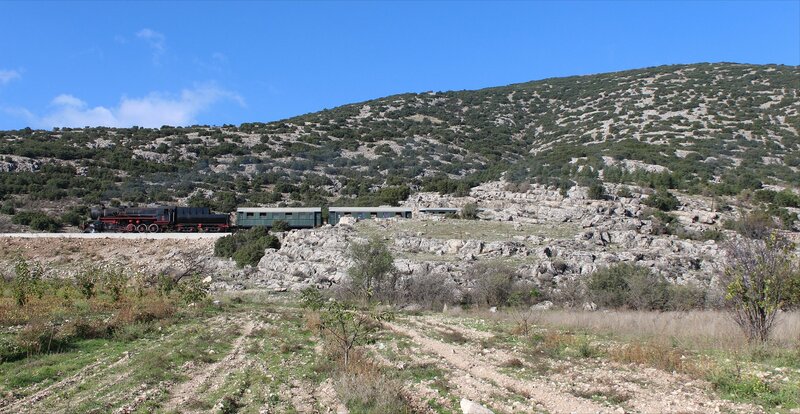 Thirty seconds after we boarded, the coach joined the queue of departing services and we headed out into the impressive hilly landscapes of the Aegean. The journey took around 3 hours, including a twenty minute stop at a service station and cafe. A beautiful sunset was followed by a terrific storm as night fell – fork lightning illuminating the rich landscape every now and again. And then came the rain, utterly torrential and hammering down wildly. 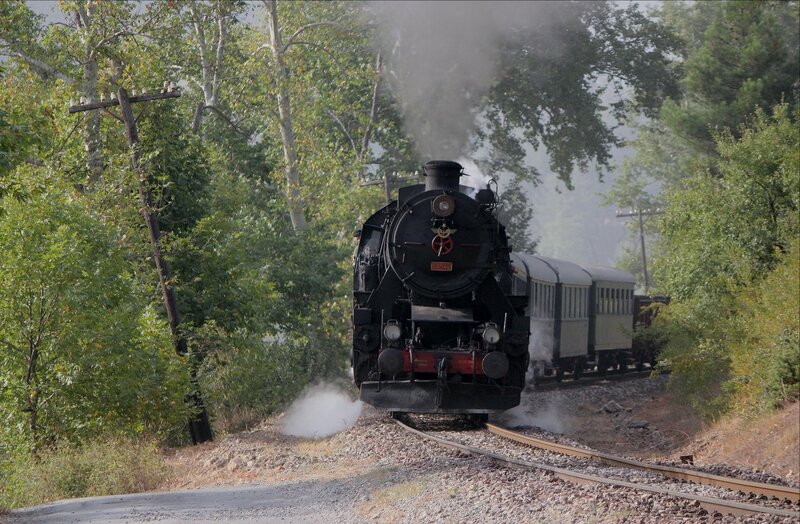 Naturally, this was the moment we arrived in Uşak!